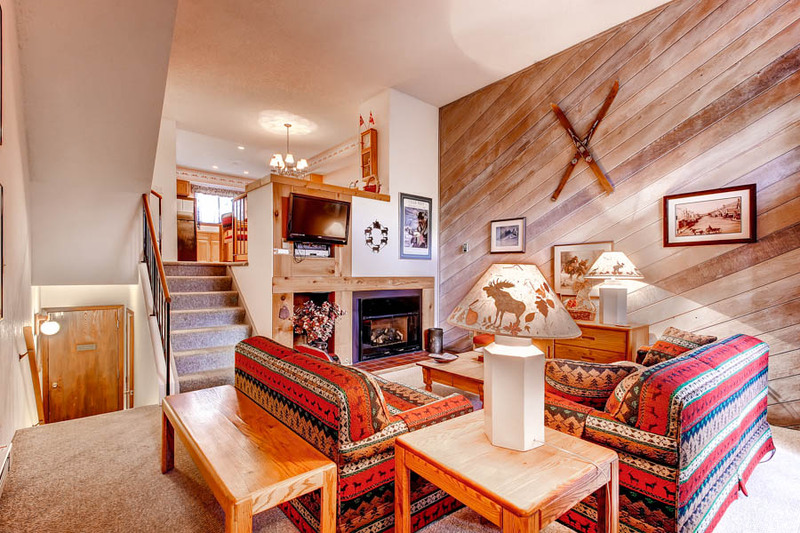 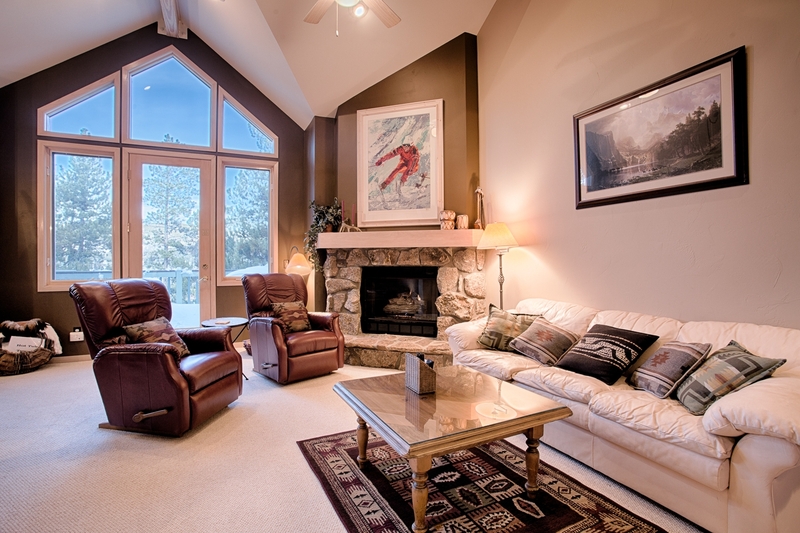 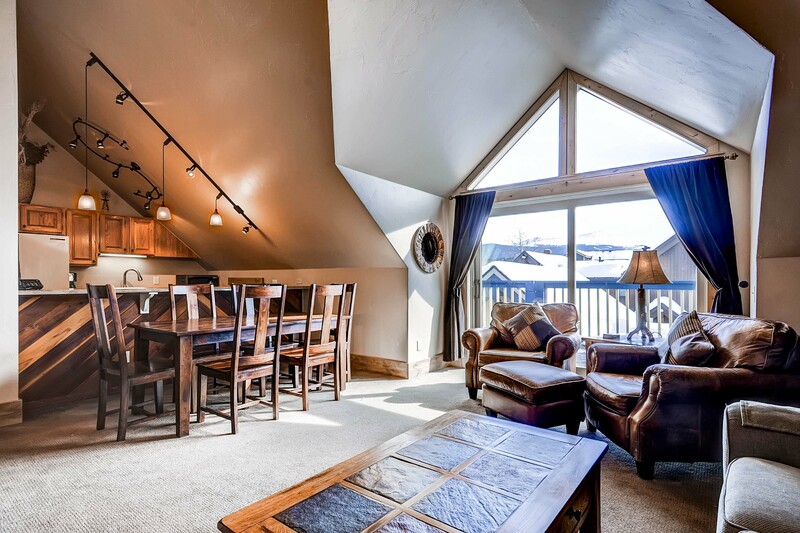 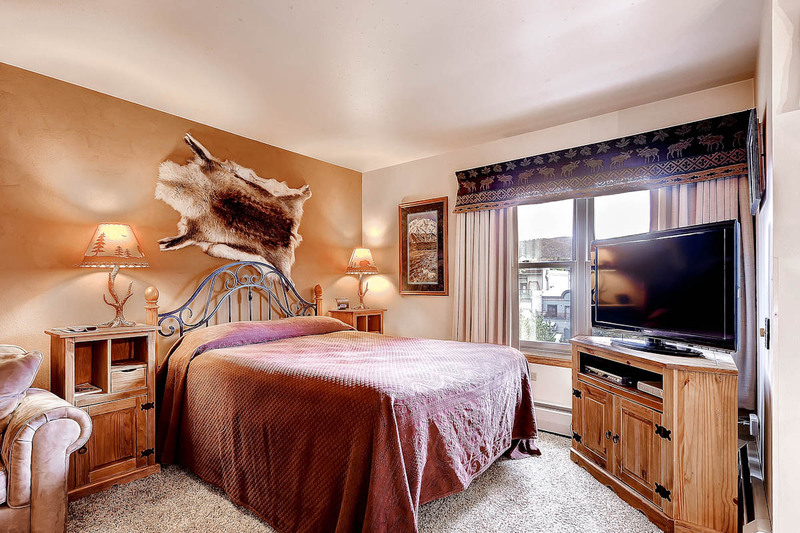 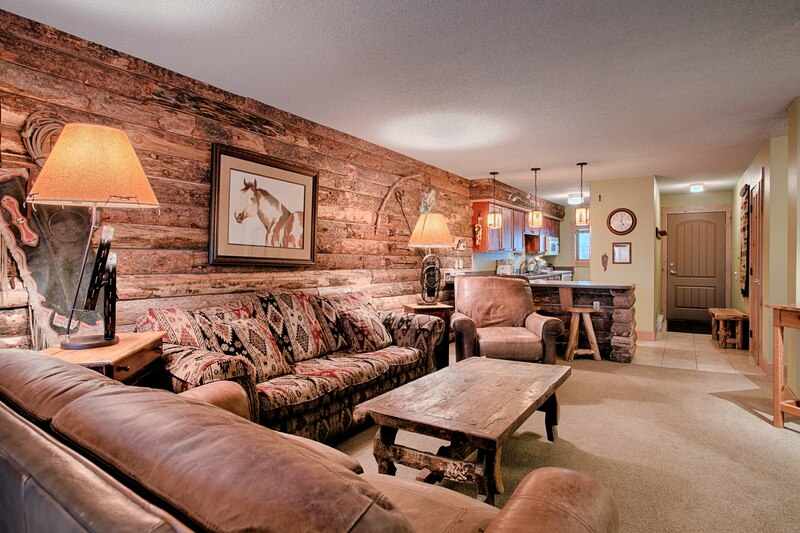 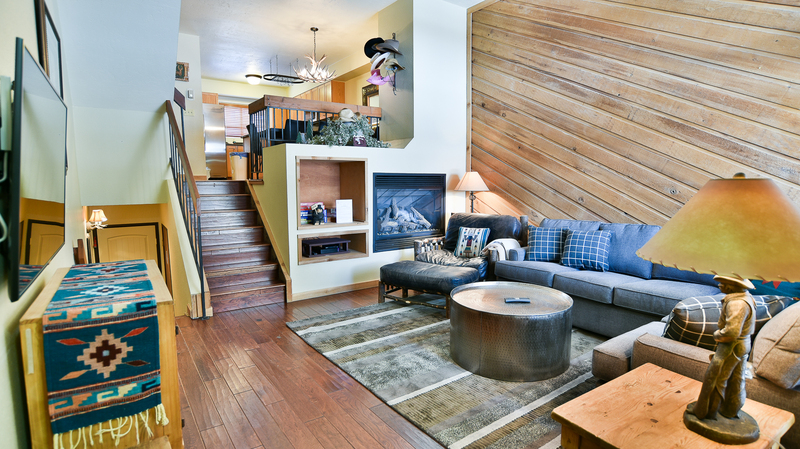 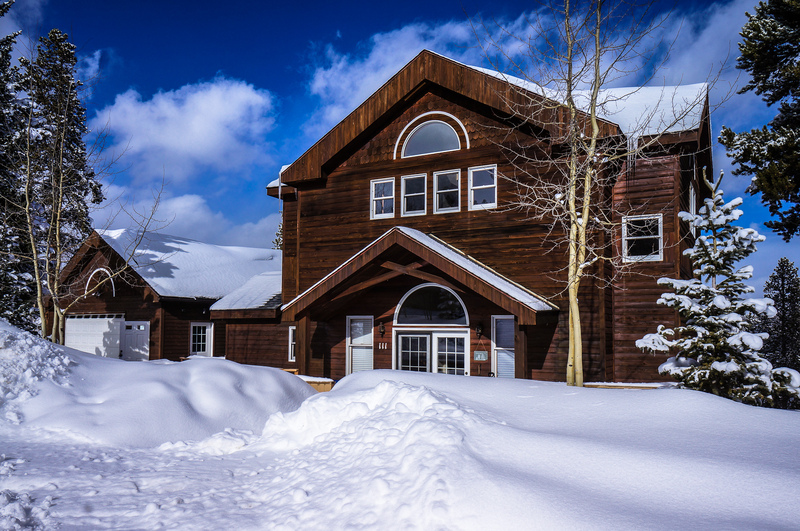 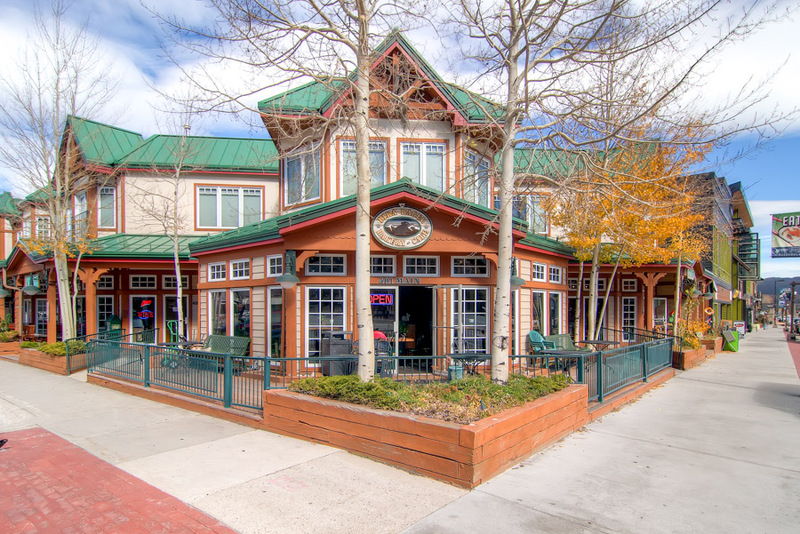 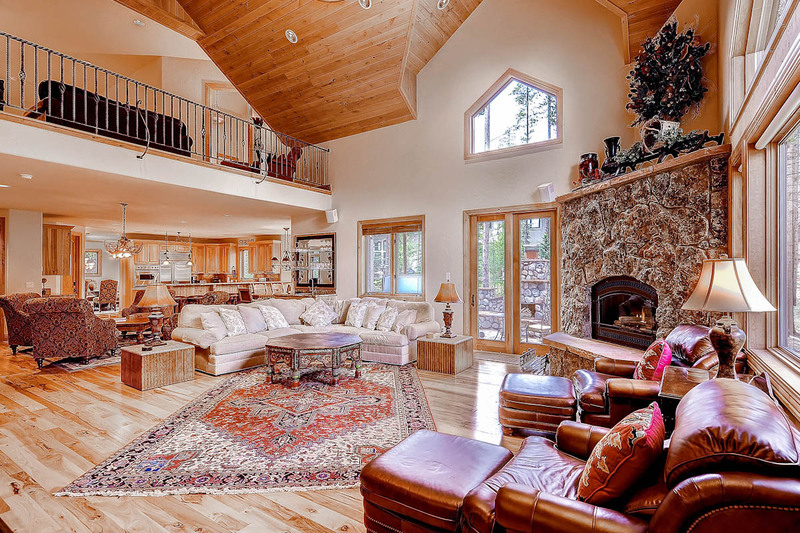 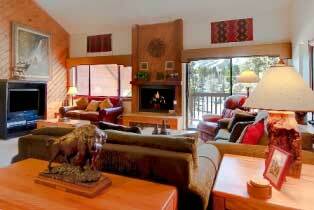 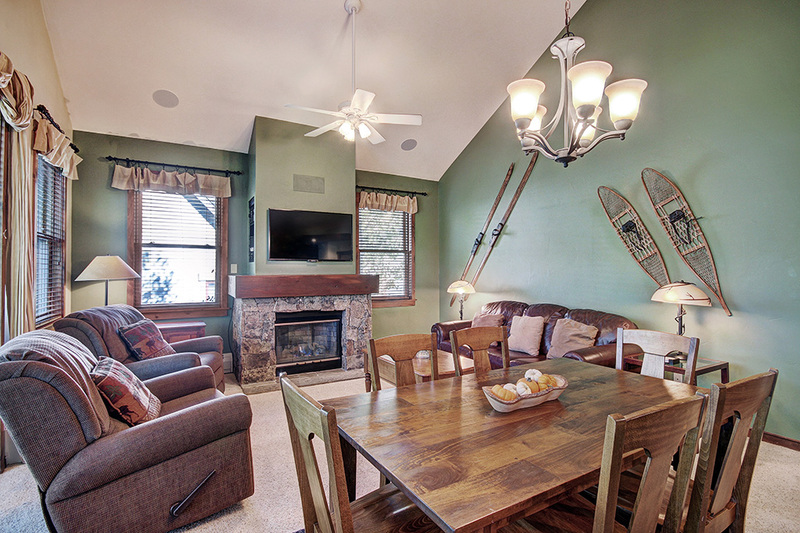 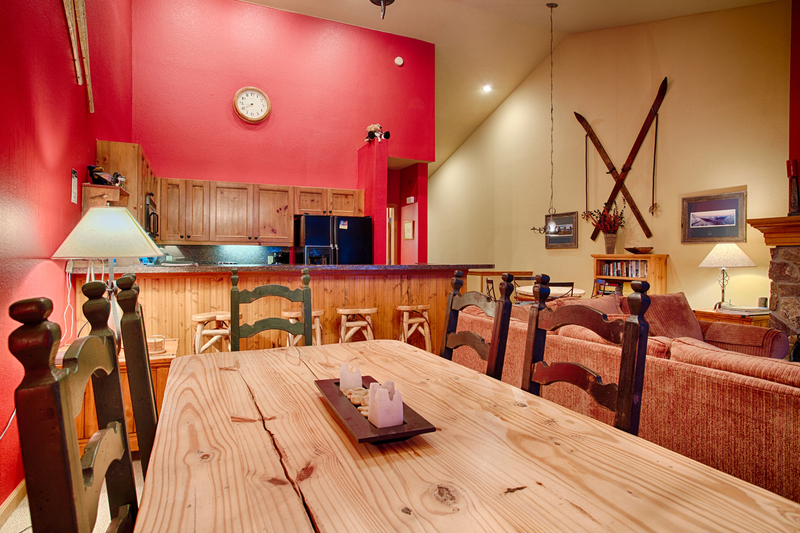 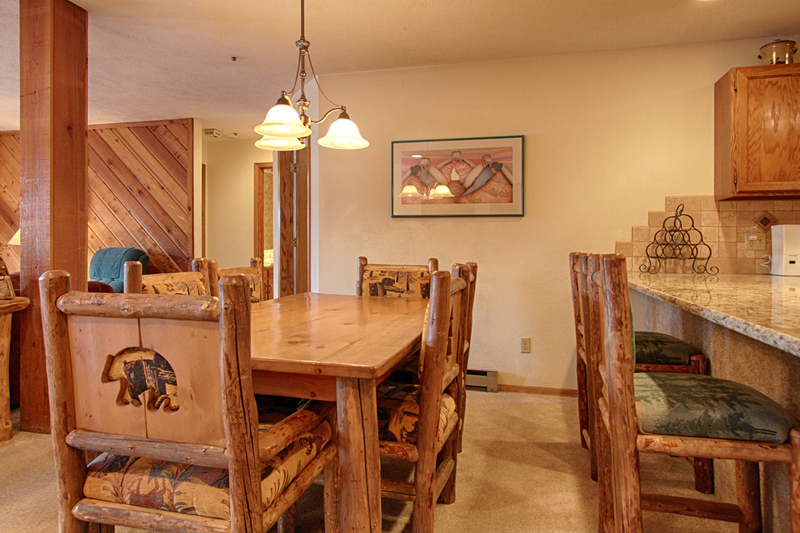 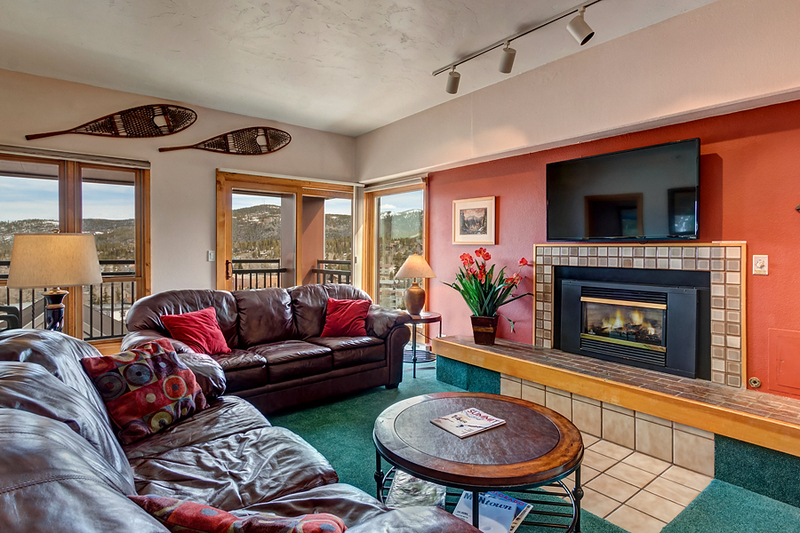 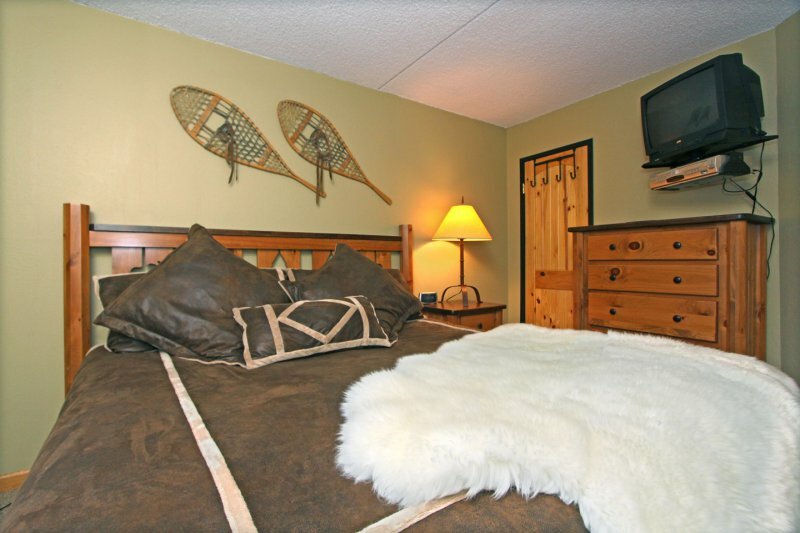 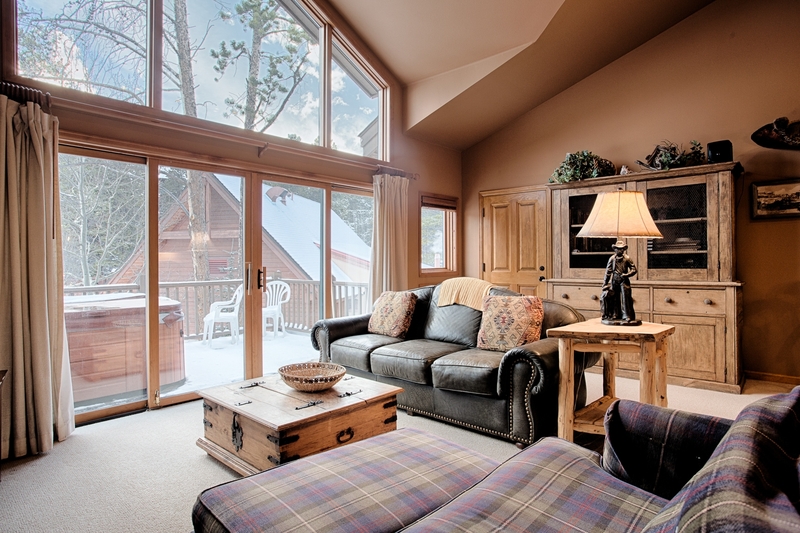 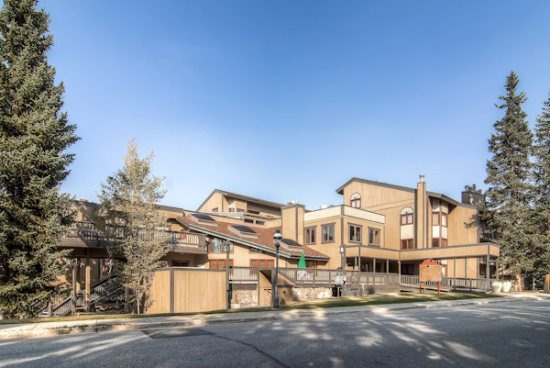 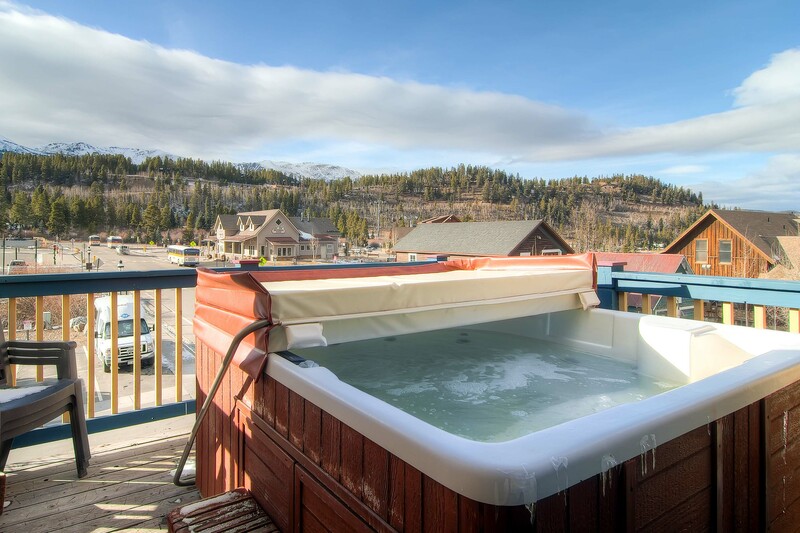 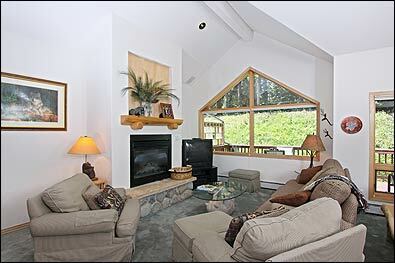 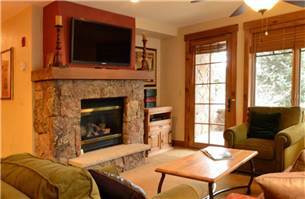 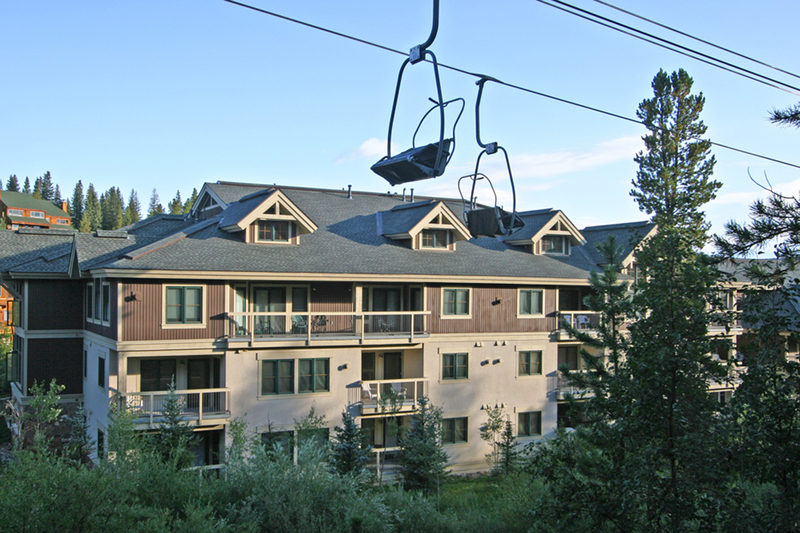 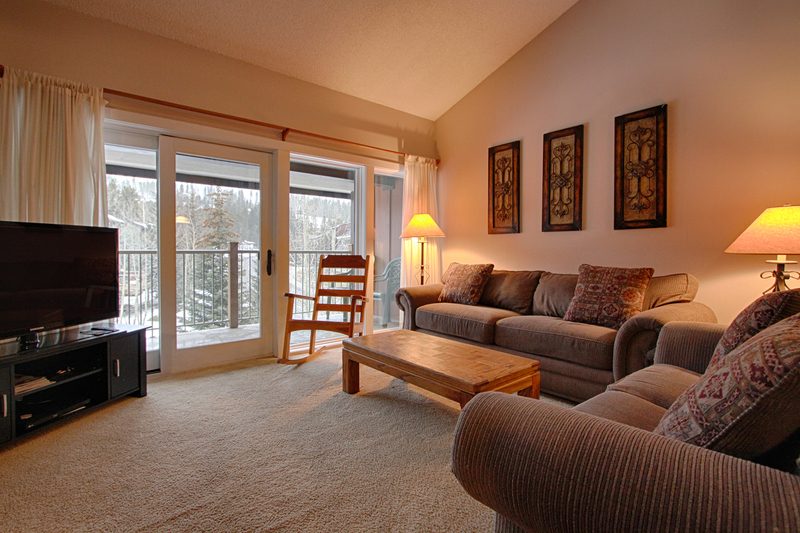 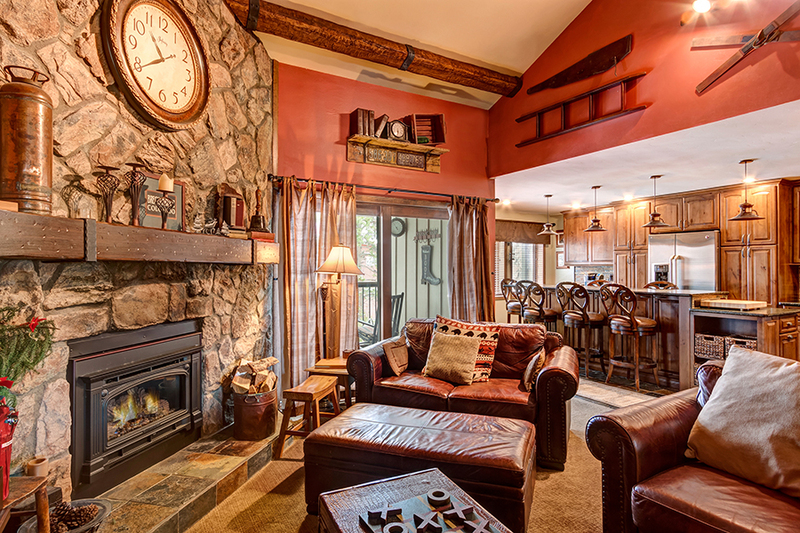 If you’re looking for a true secluded mountain getaway, the Lazy Dog Lodge is the place for you! 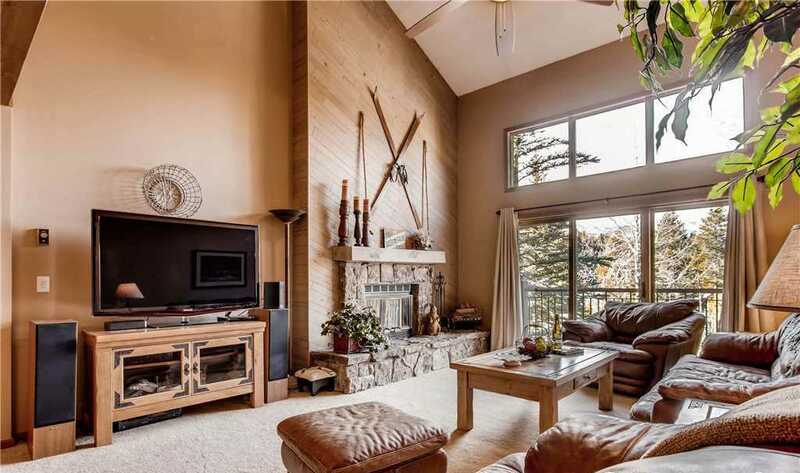 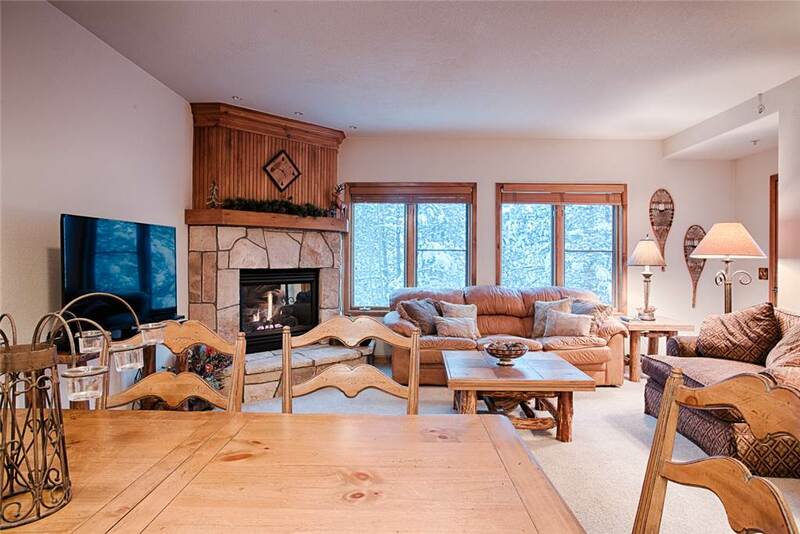 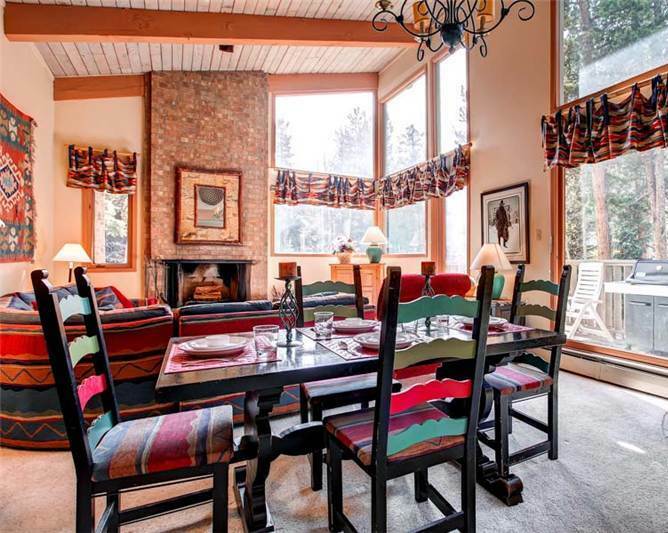 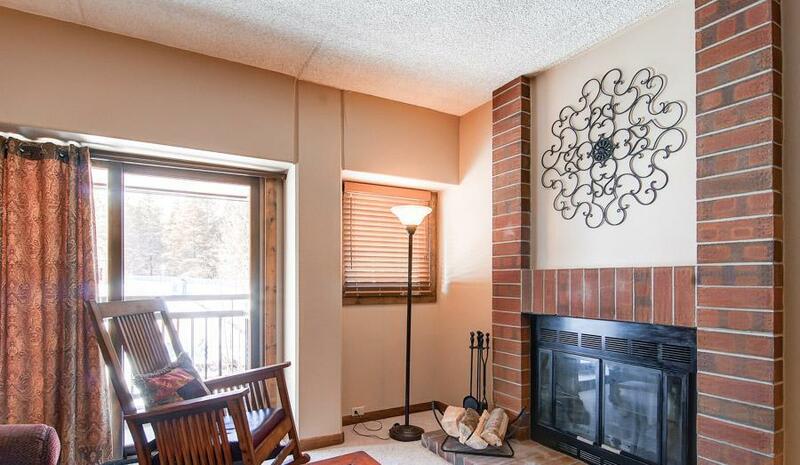 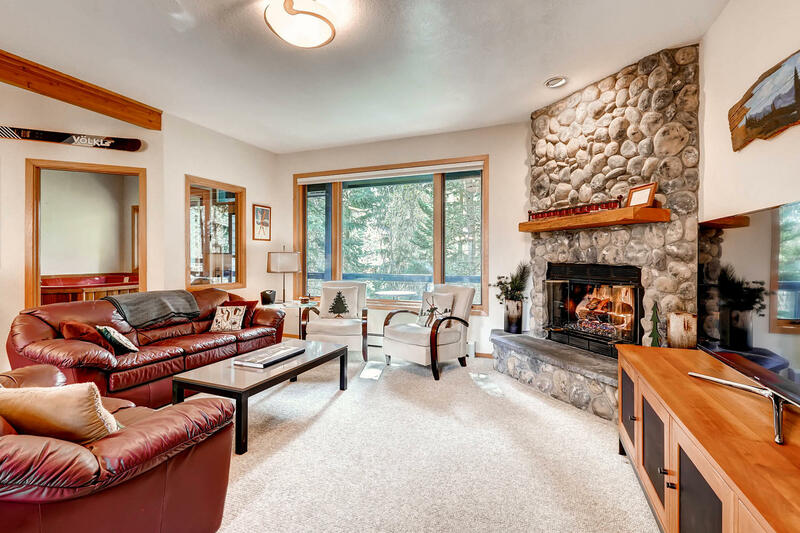 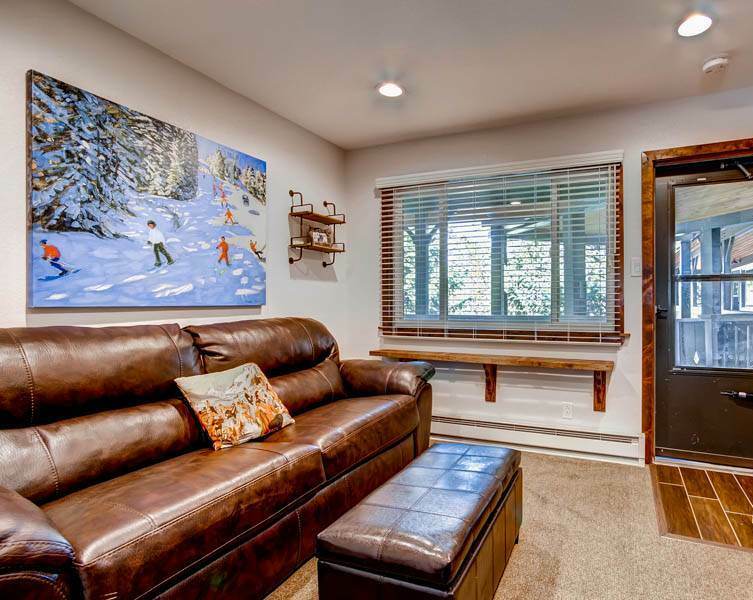 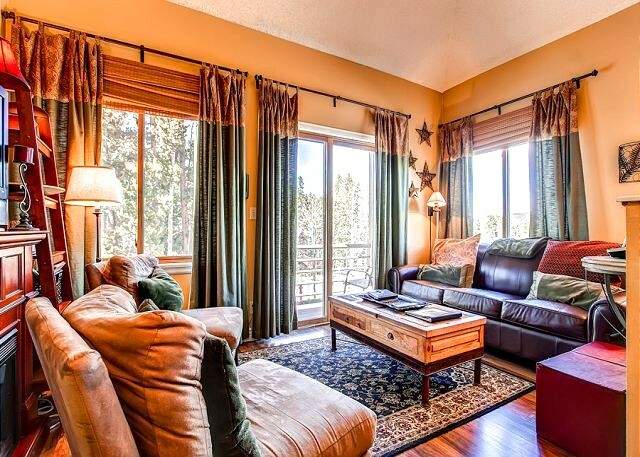 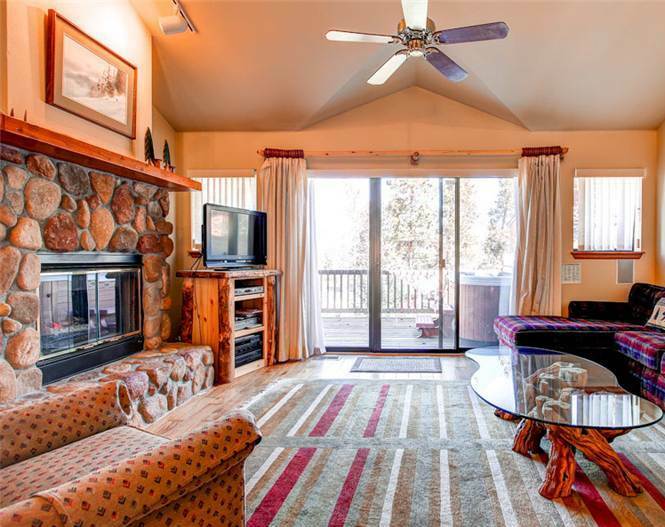 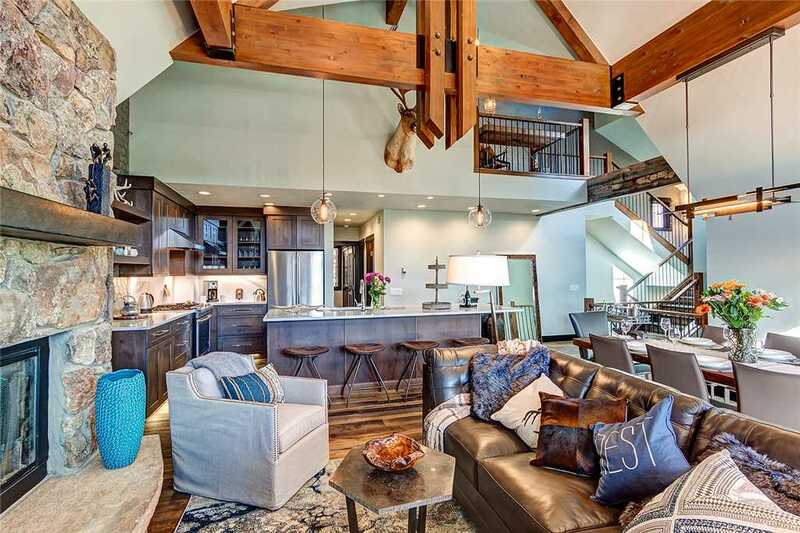 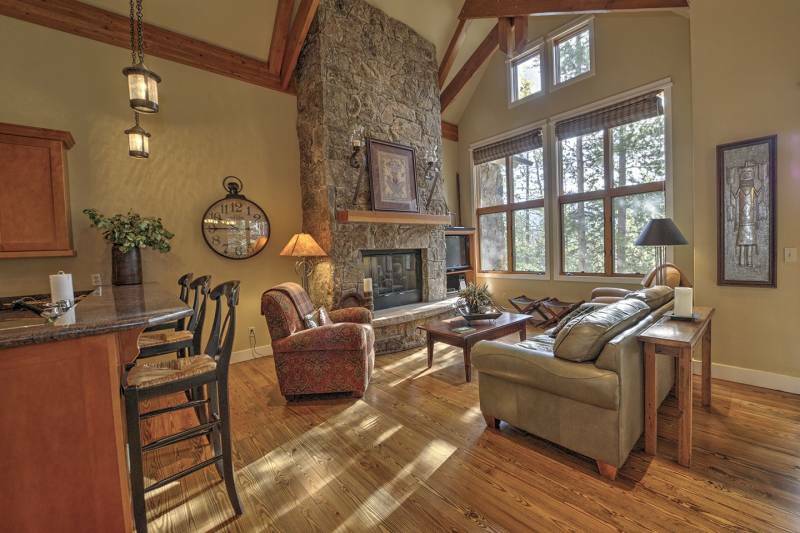 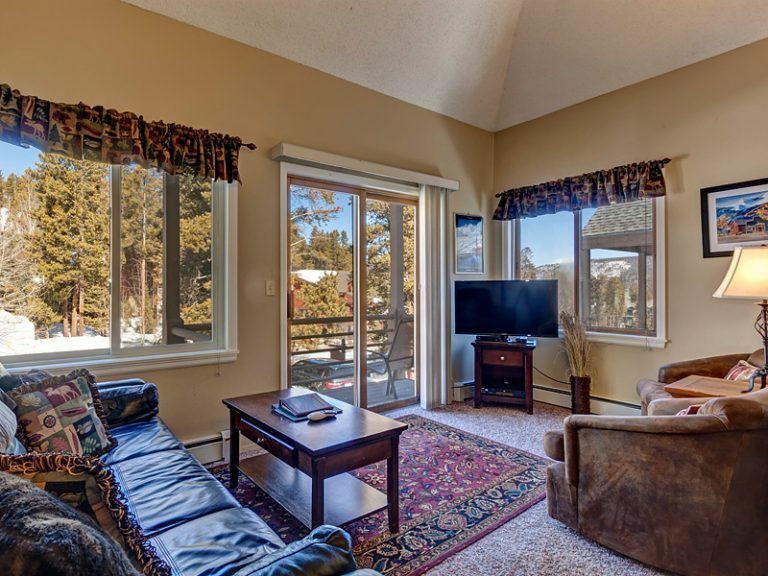 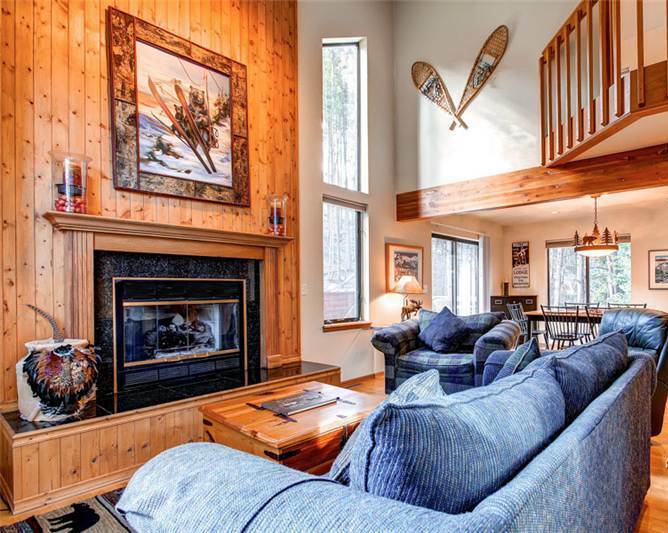 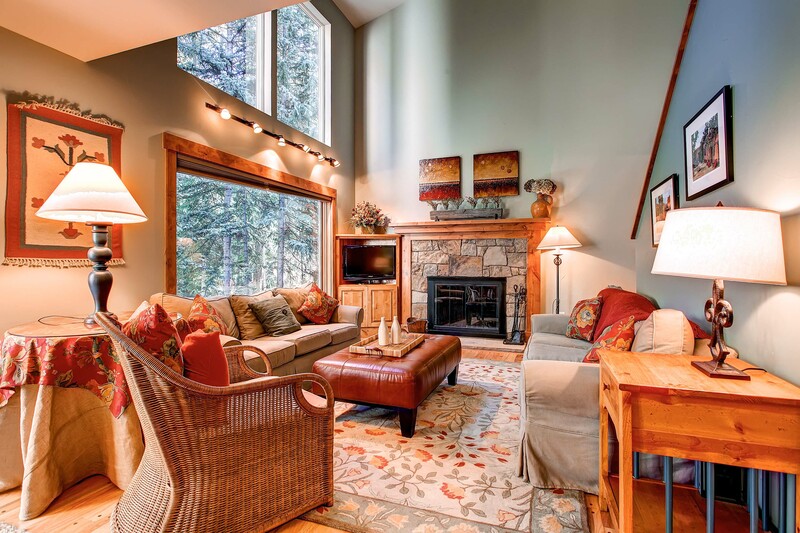 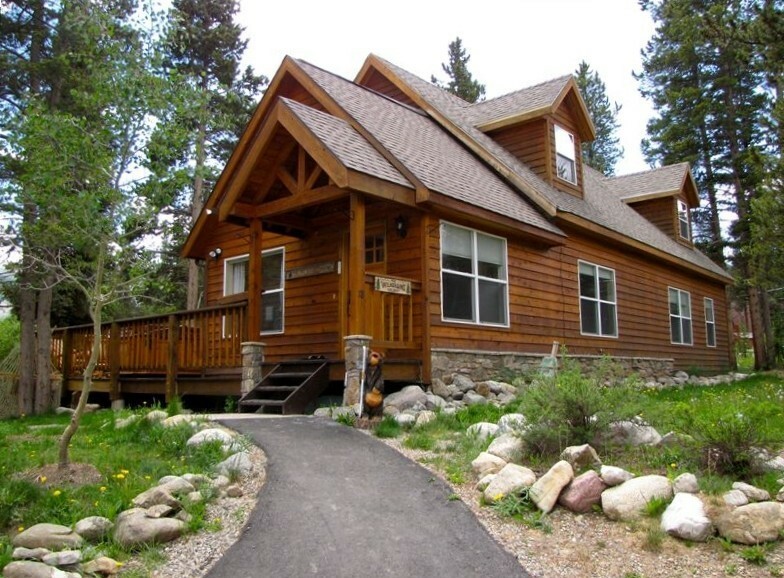 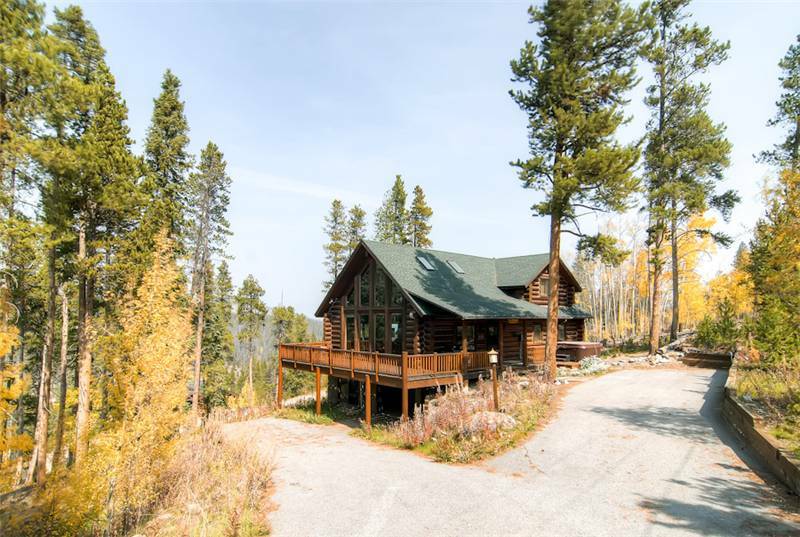 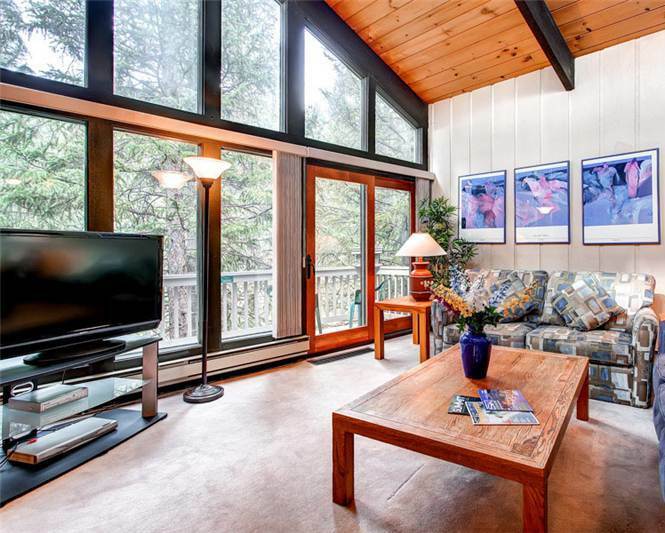 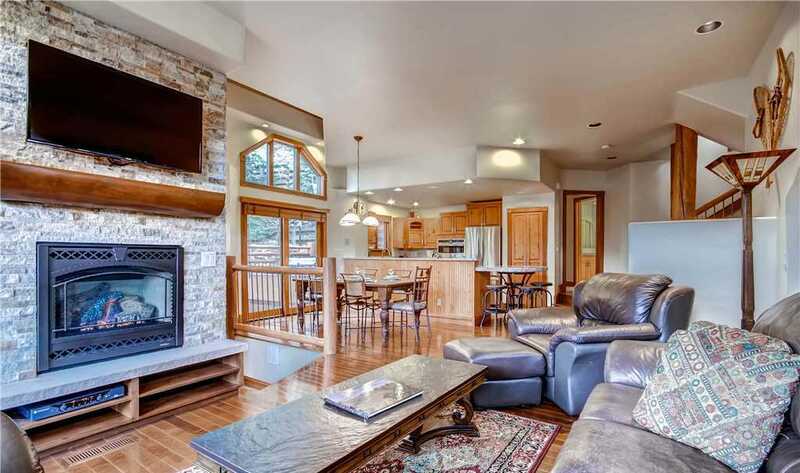 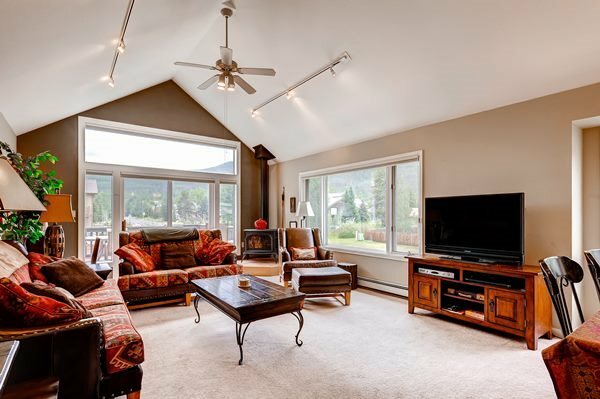 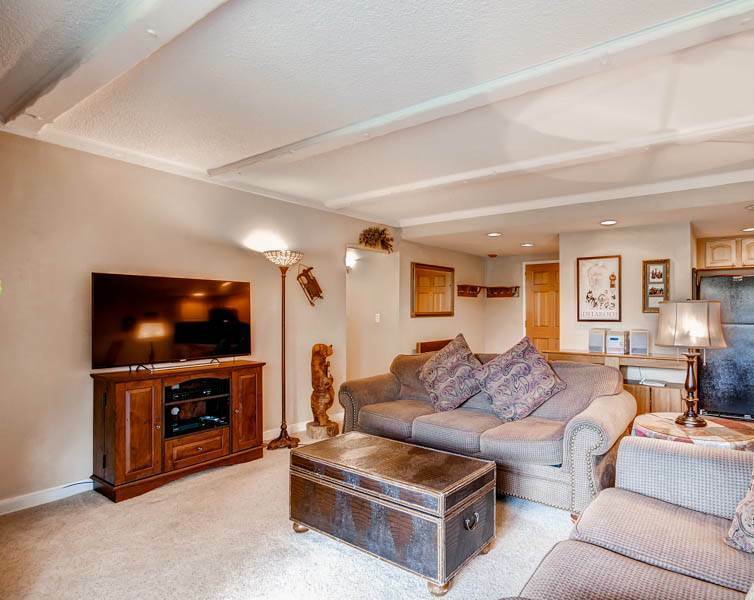 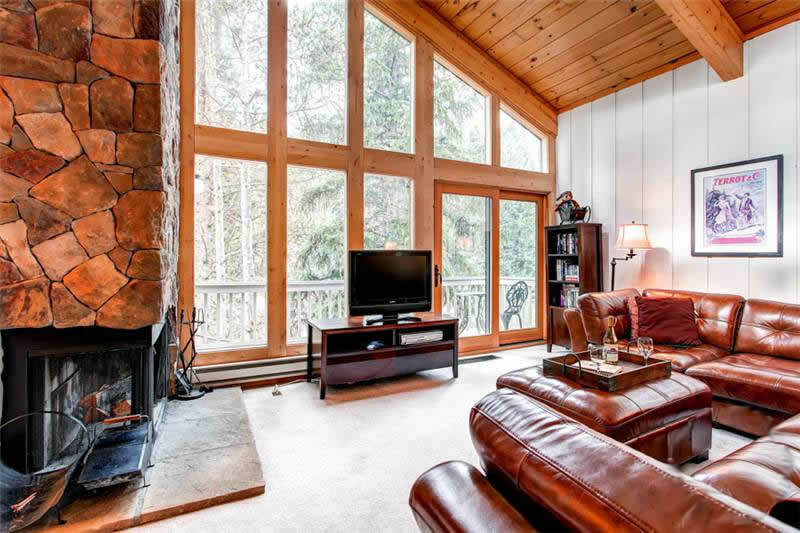 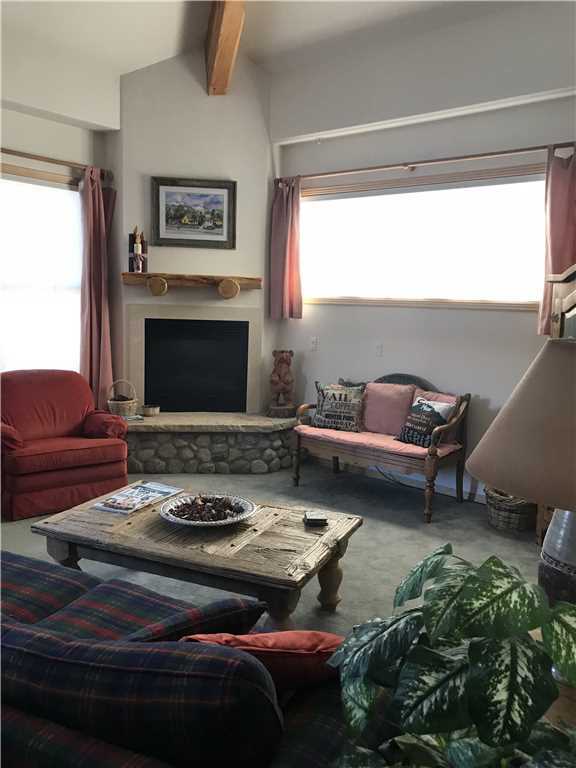 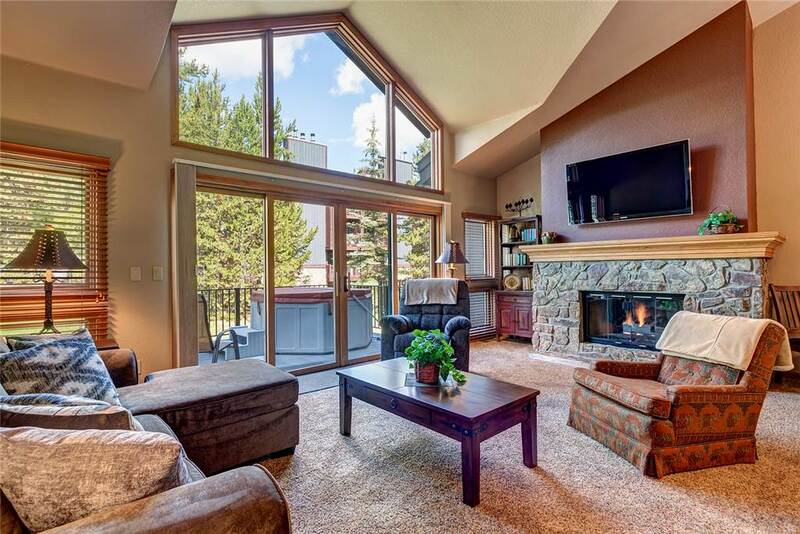 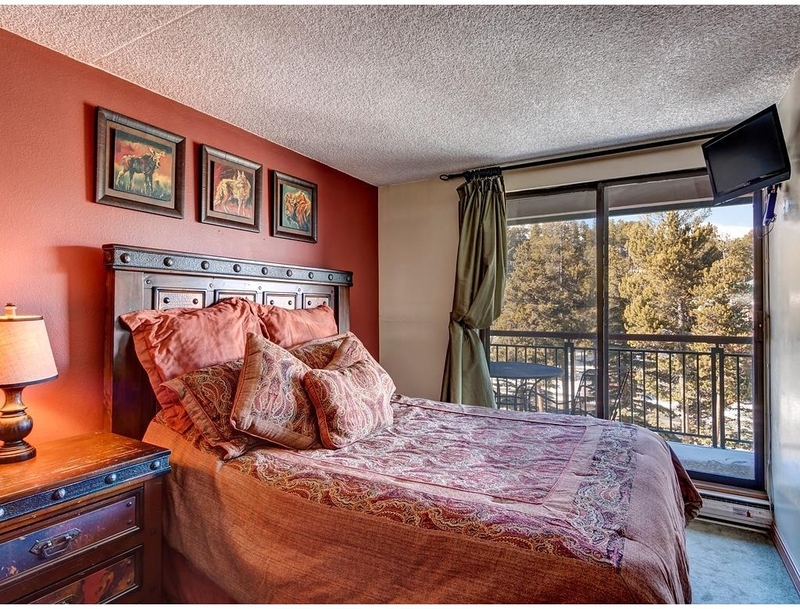 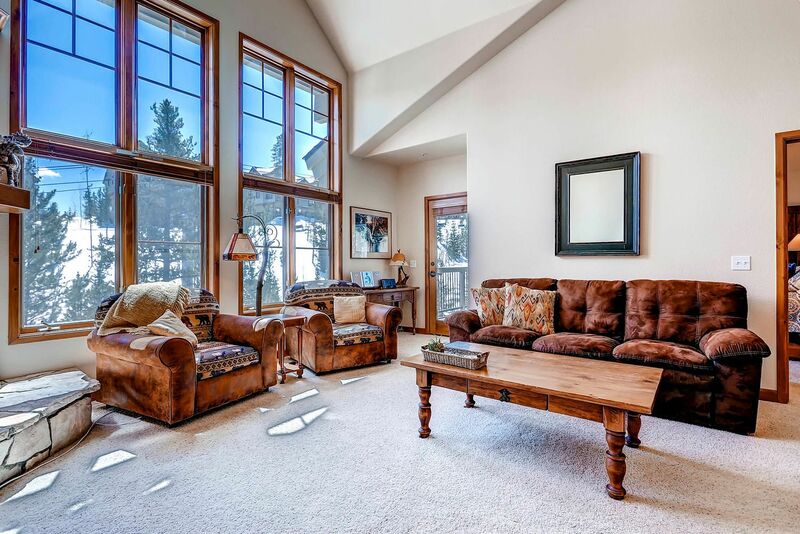 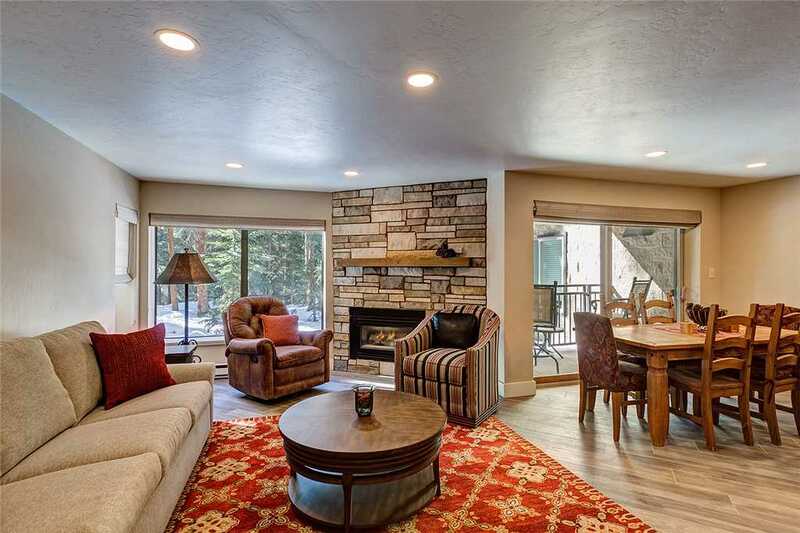 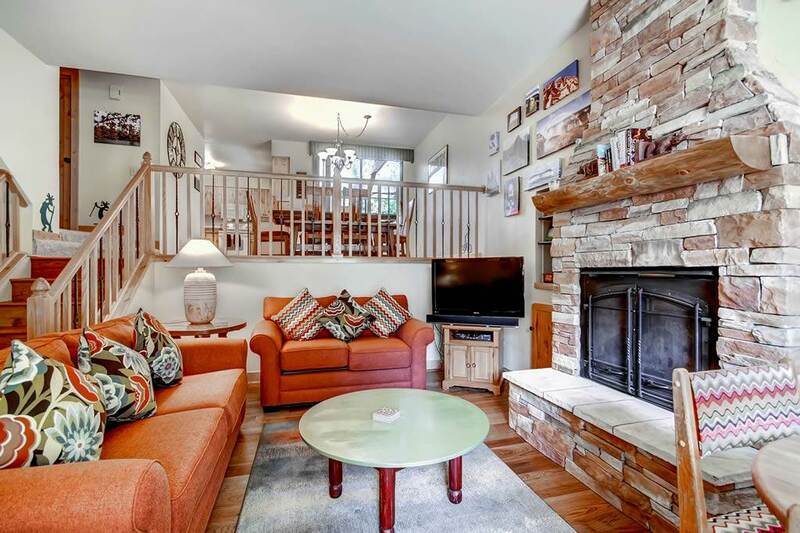 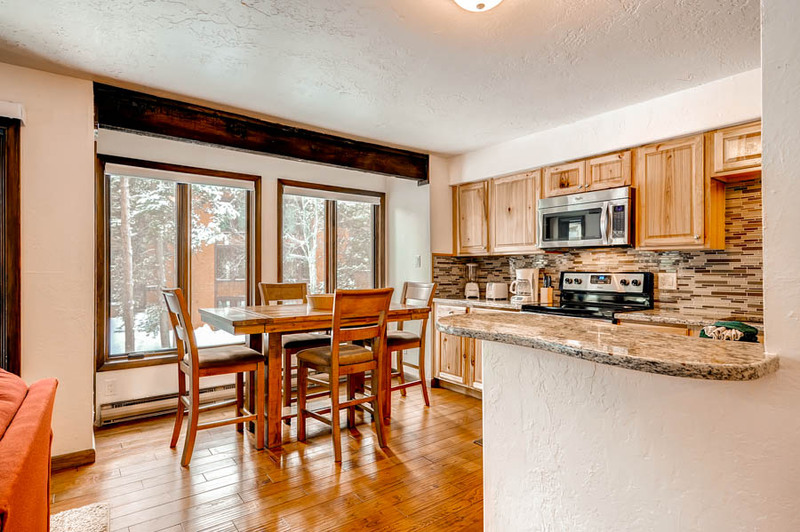 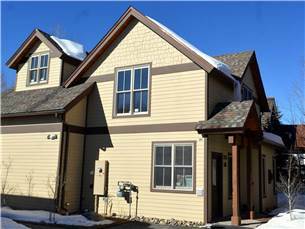 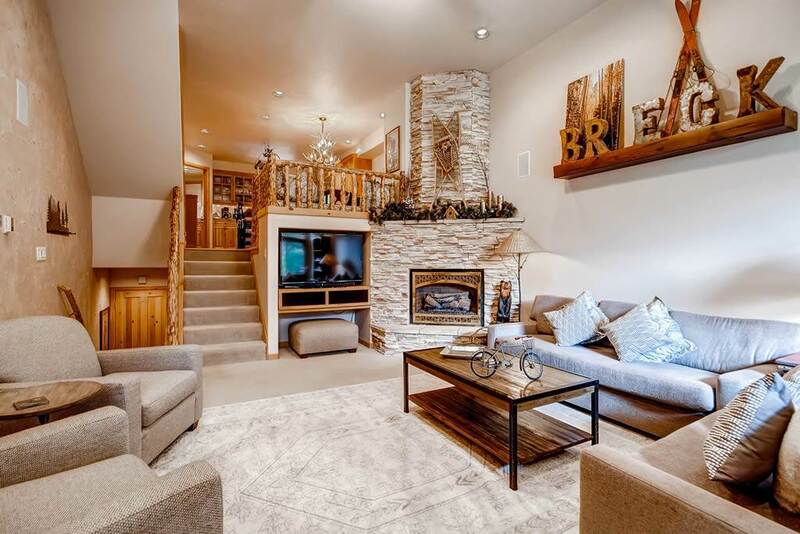 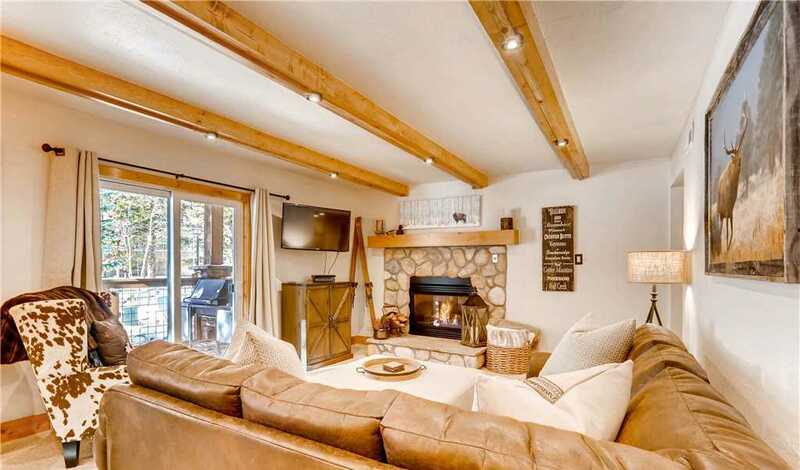 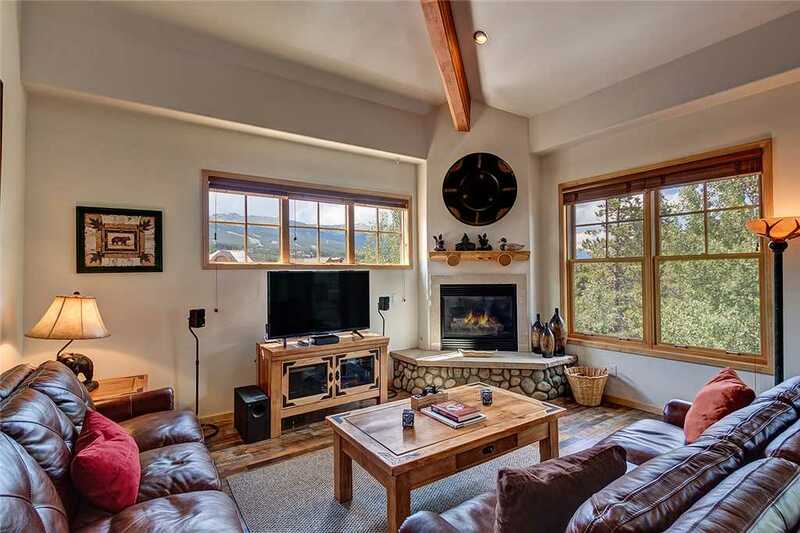 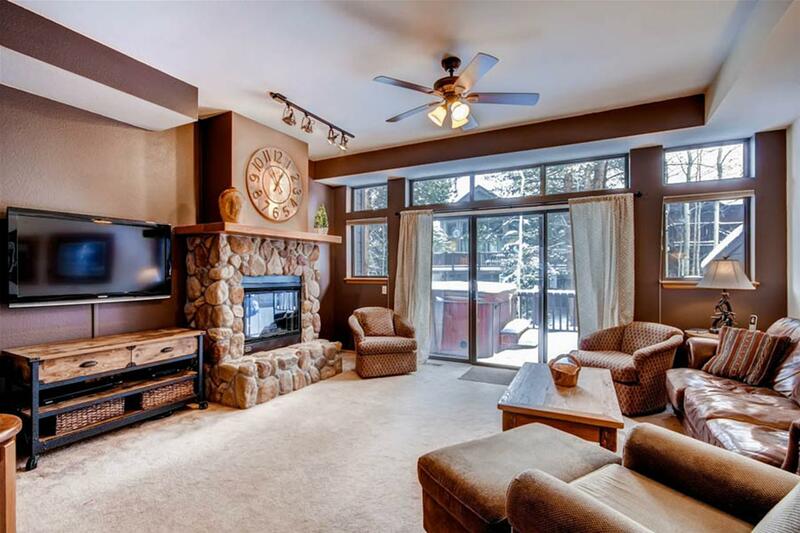 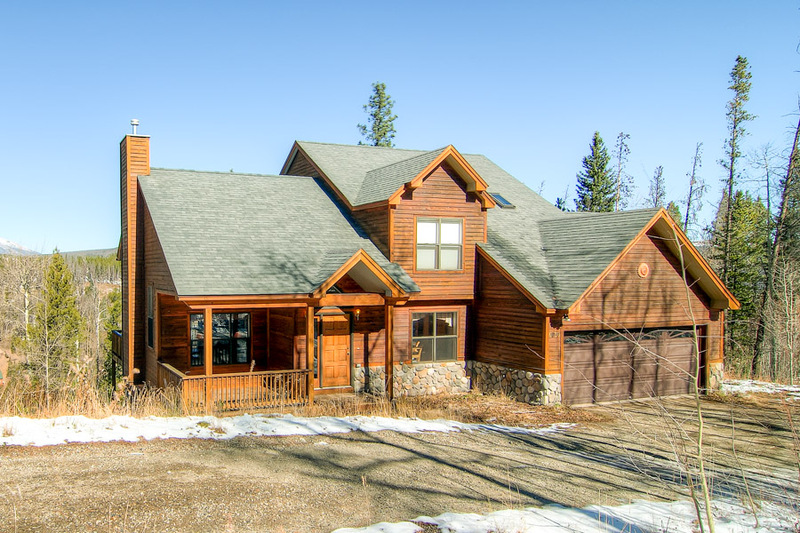 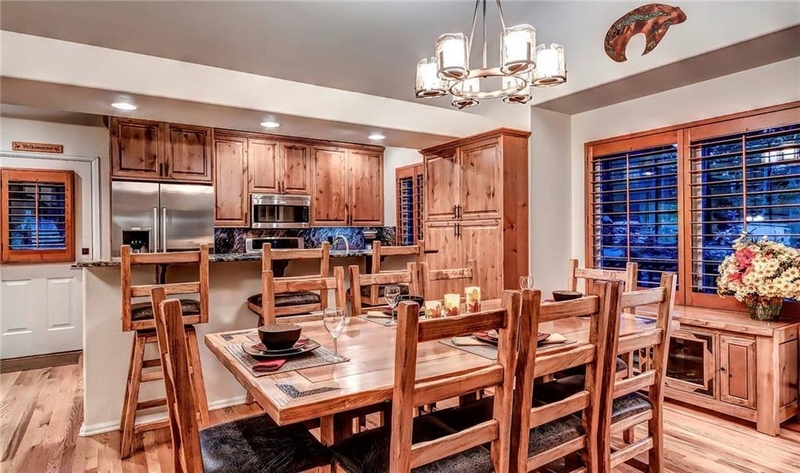 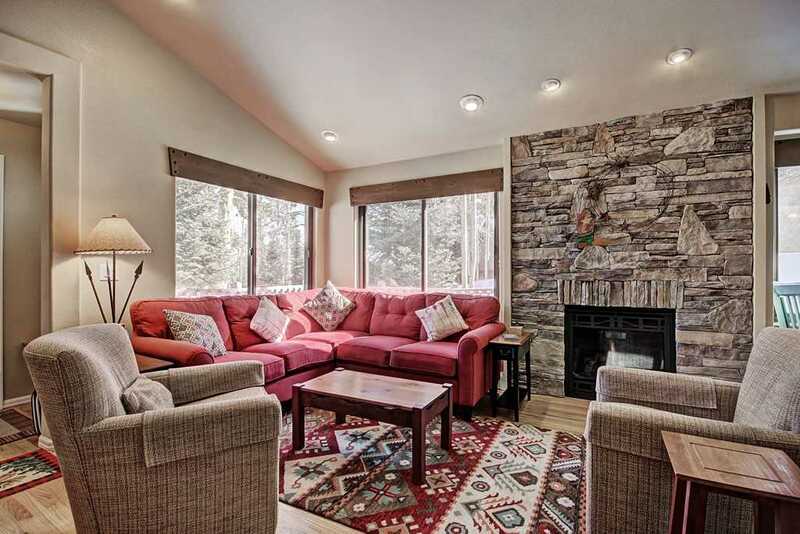 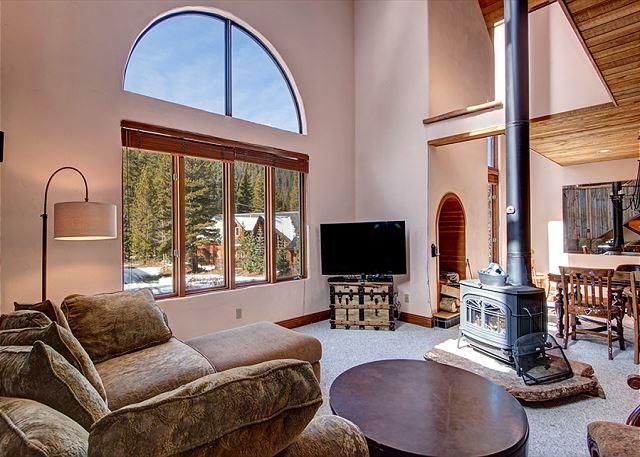 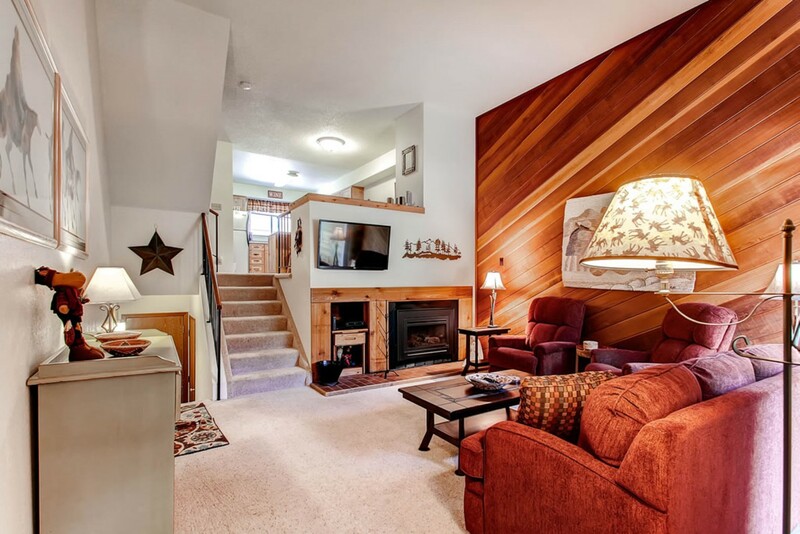 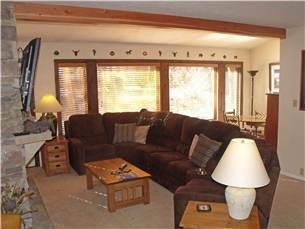 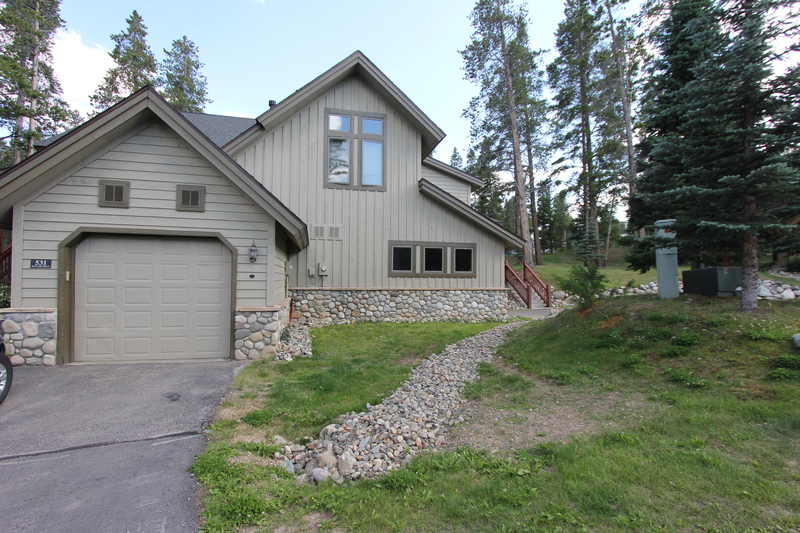 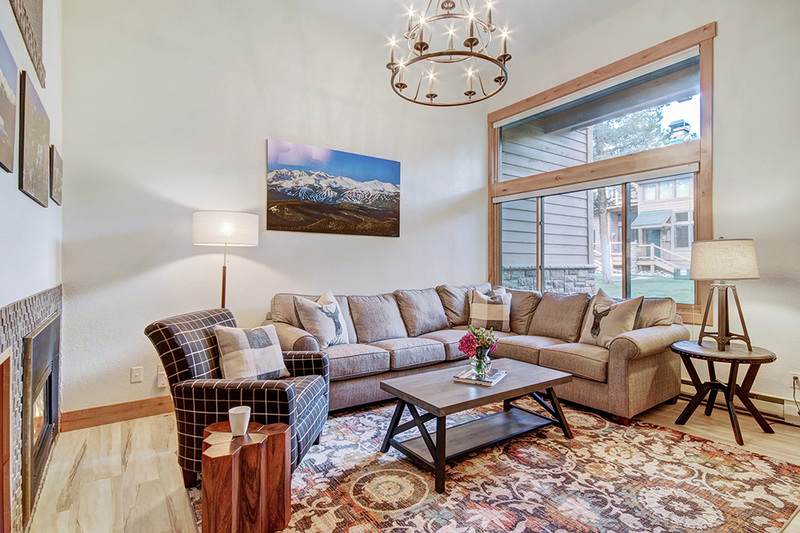 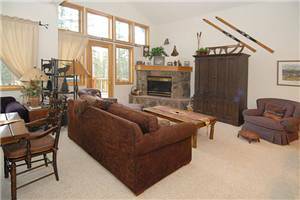 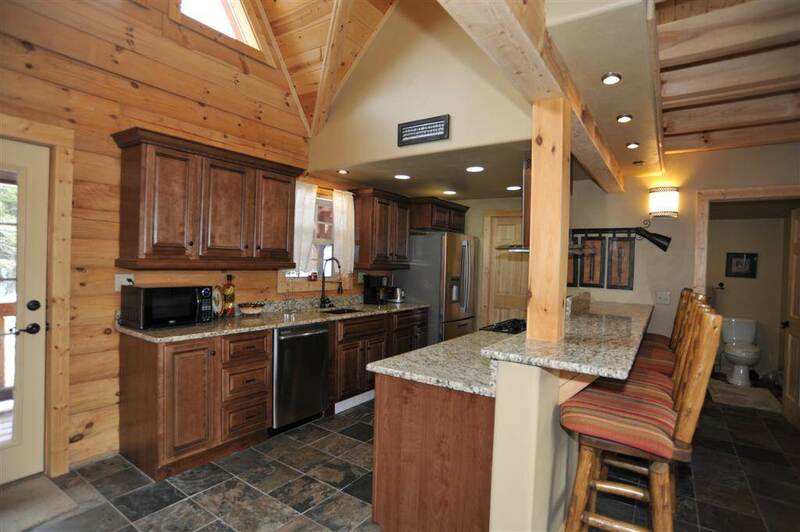 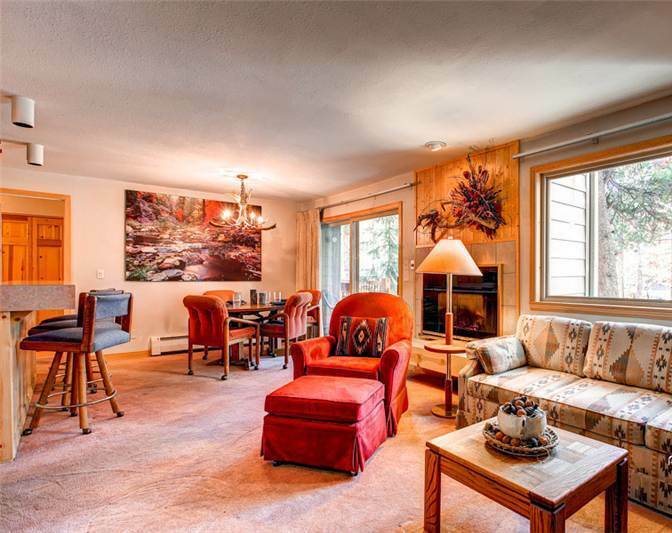 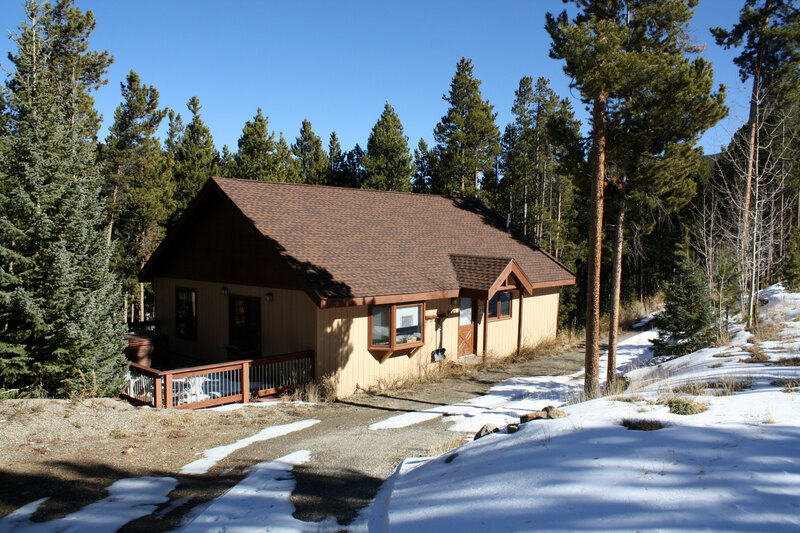 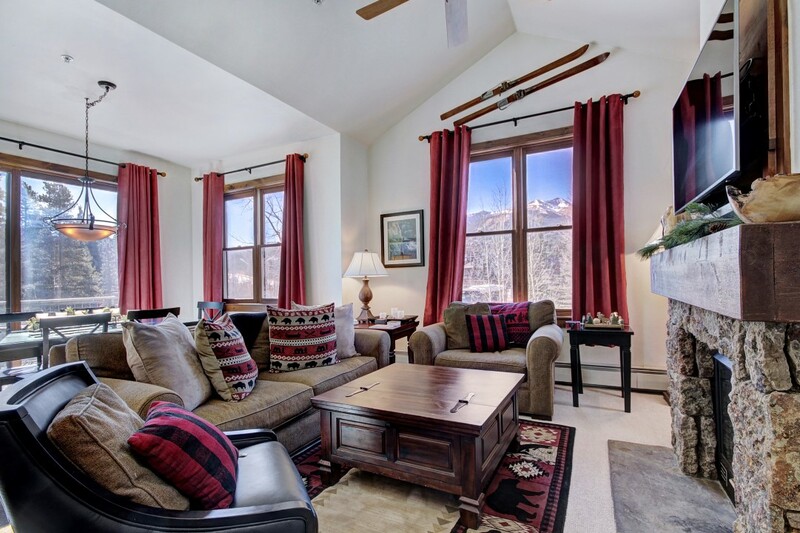 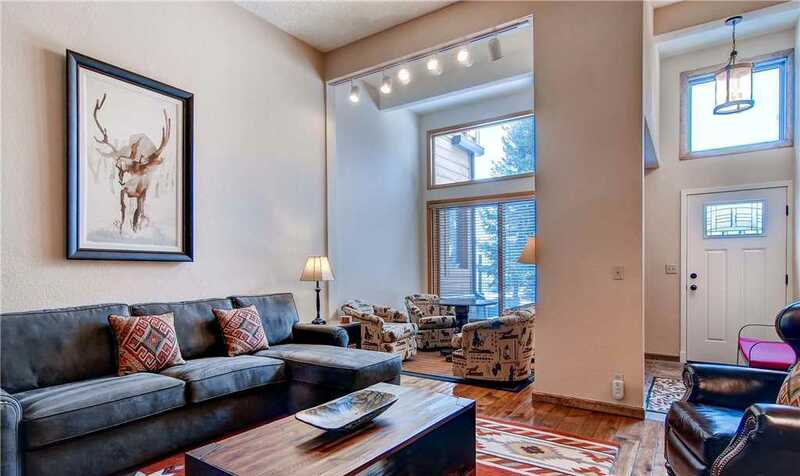 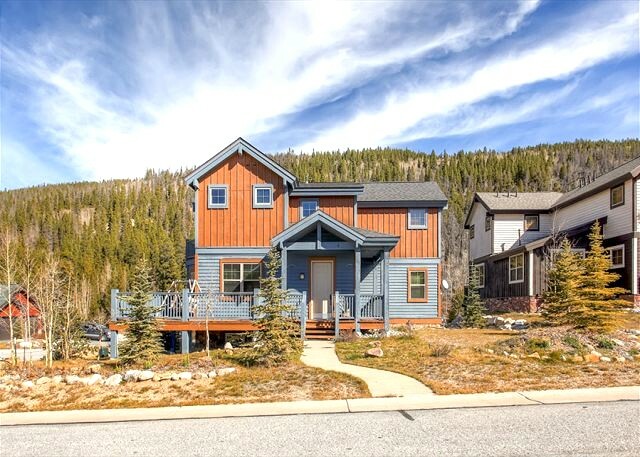 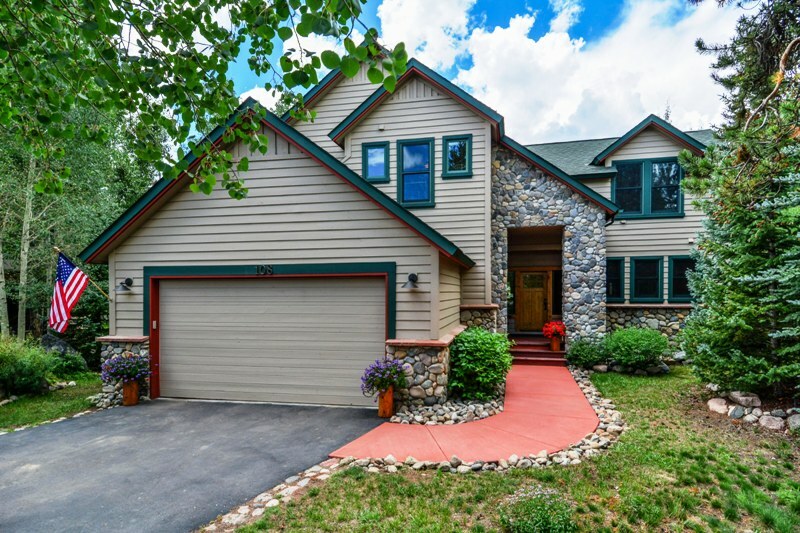 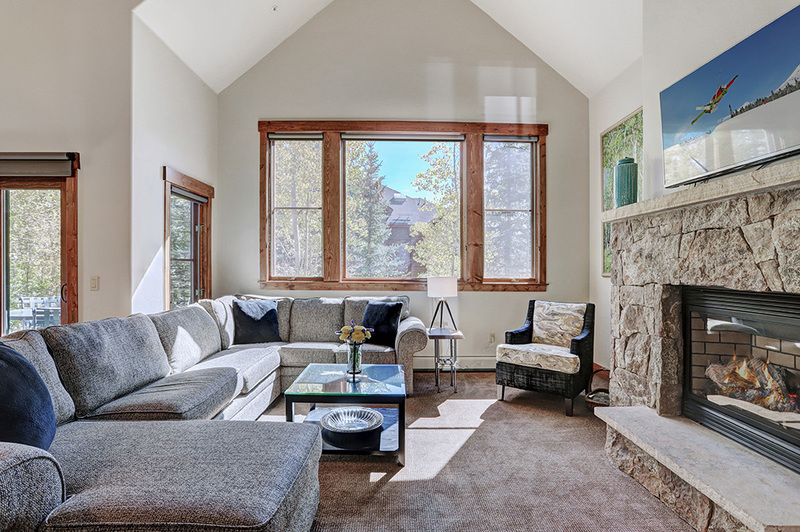 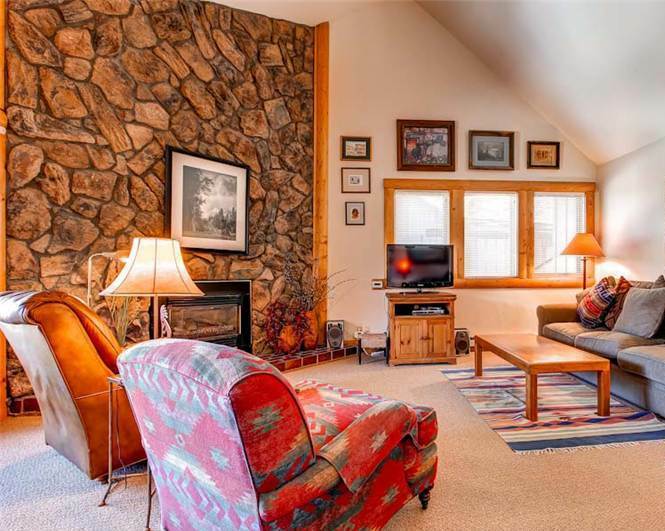 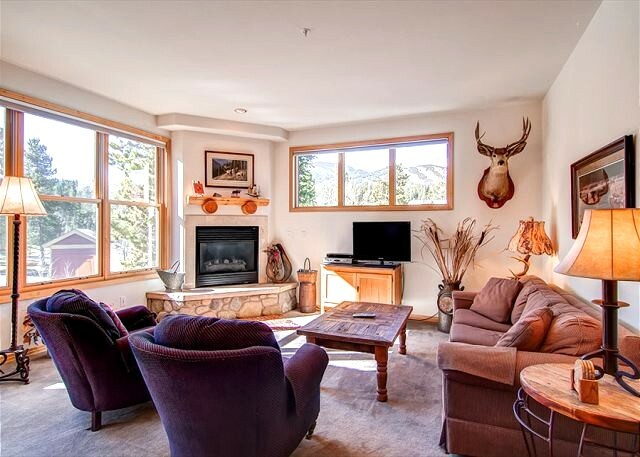 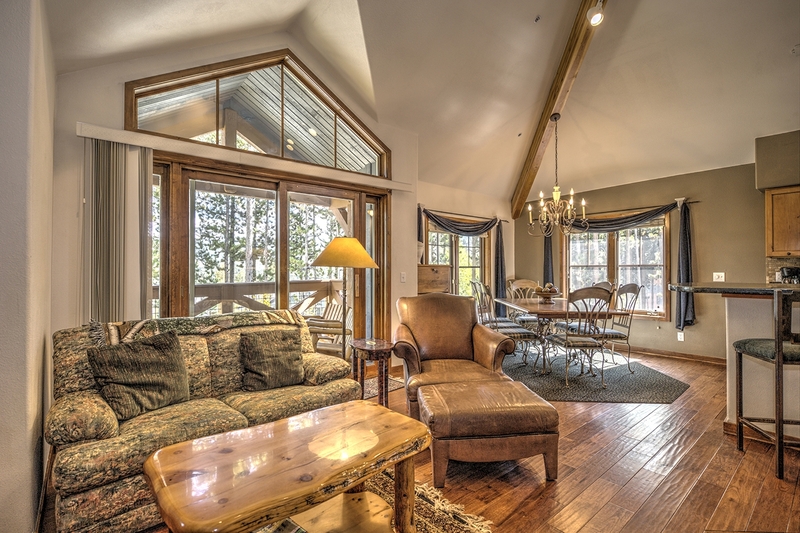 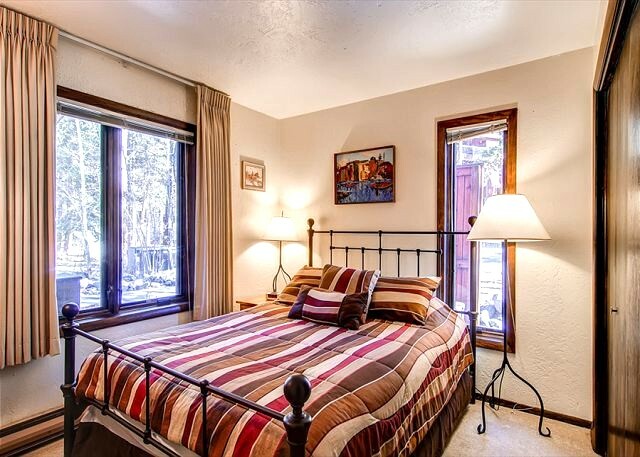 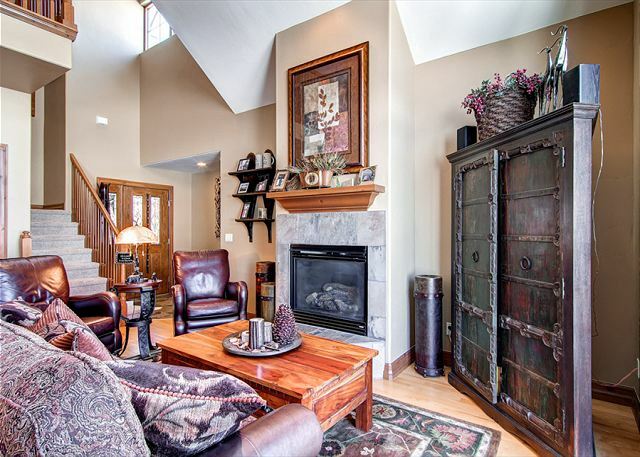 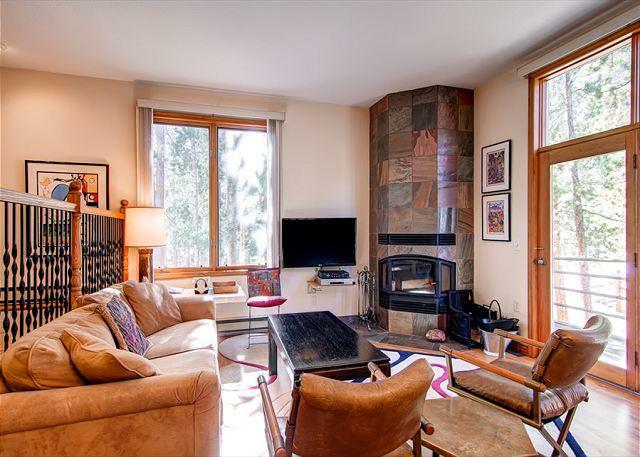 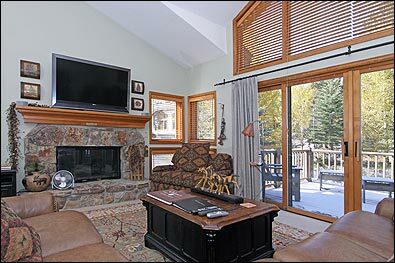 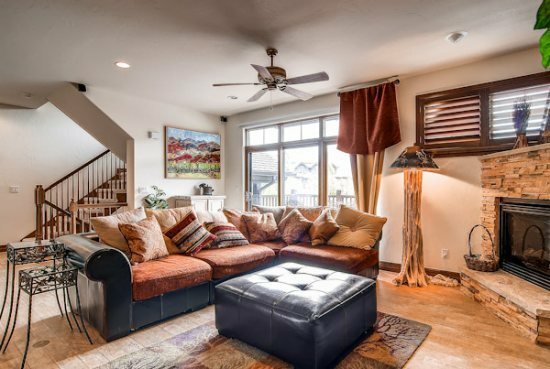 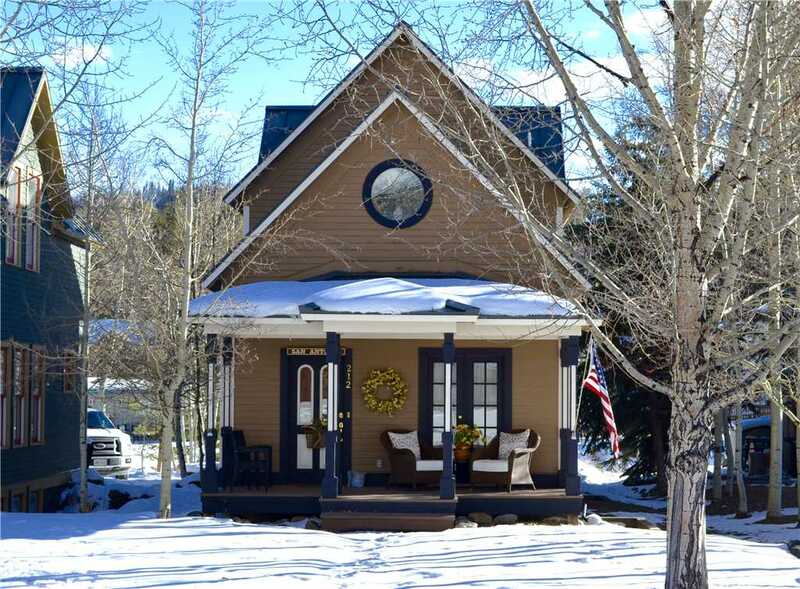 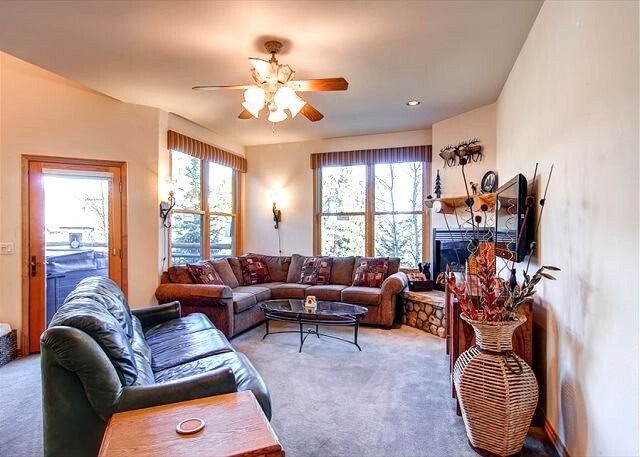 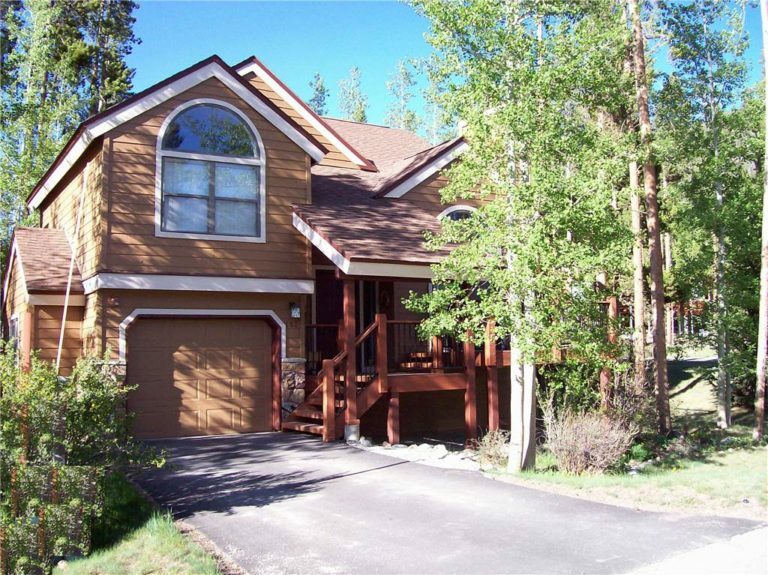 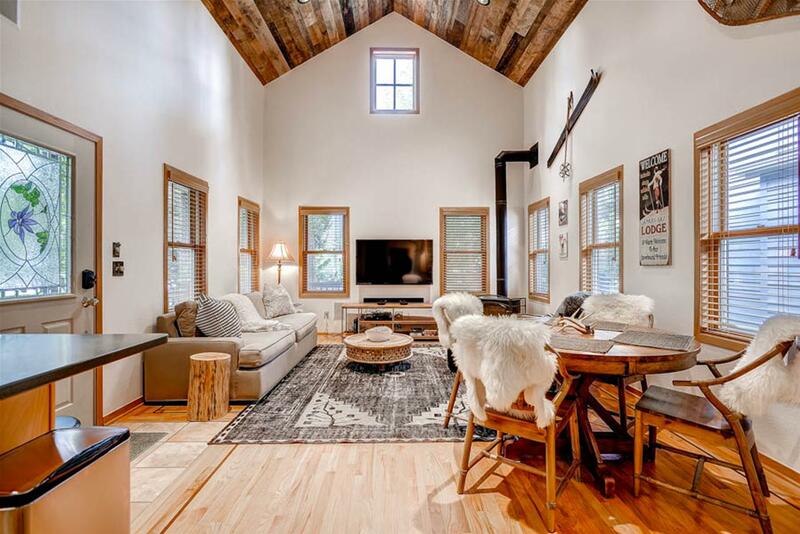 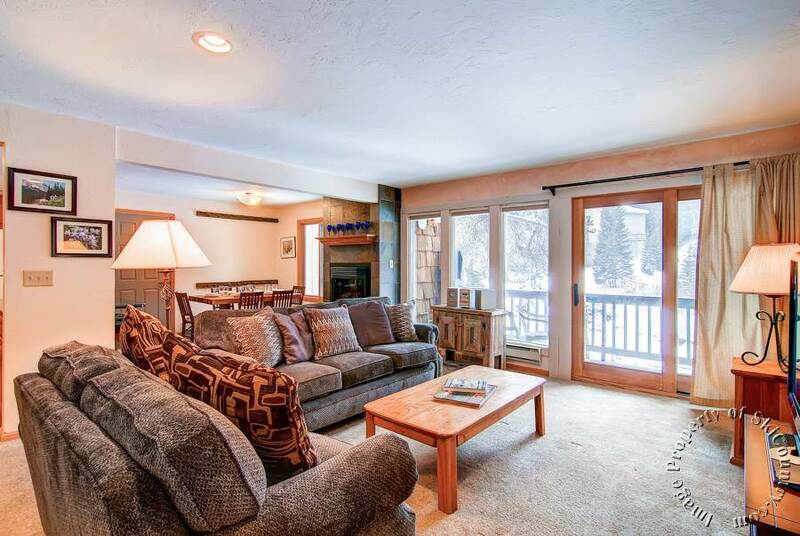 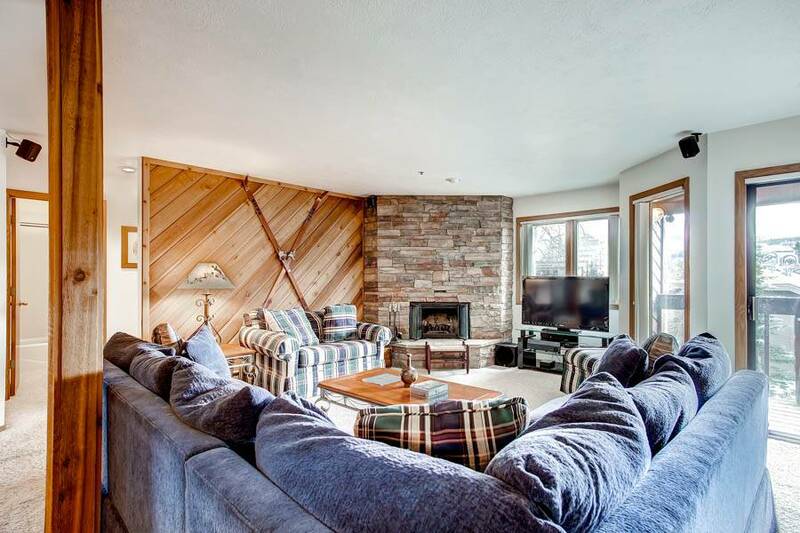 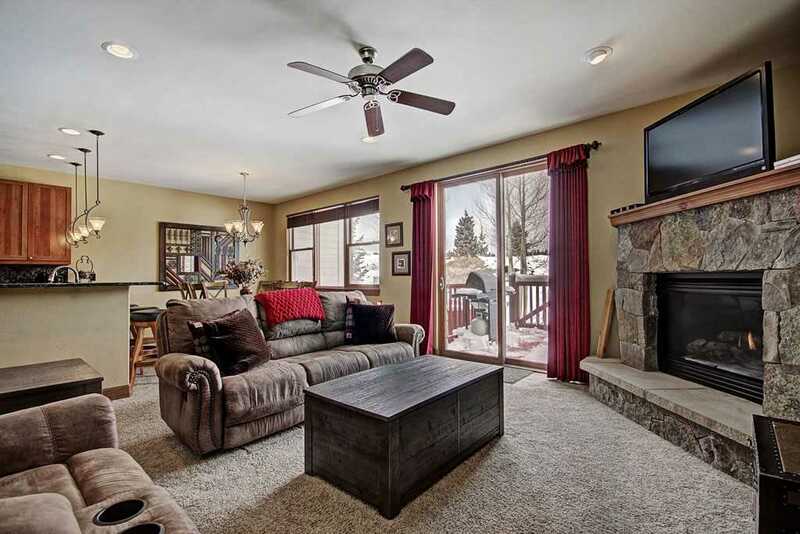 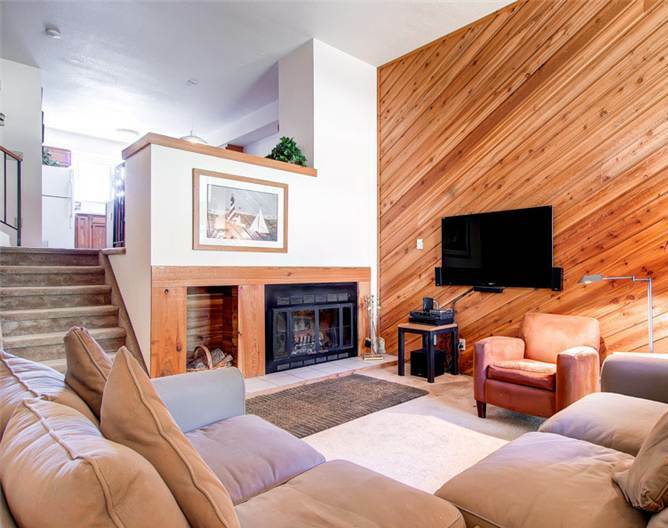 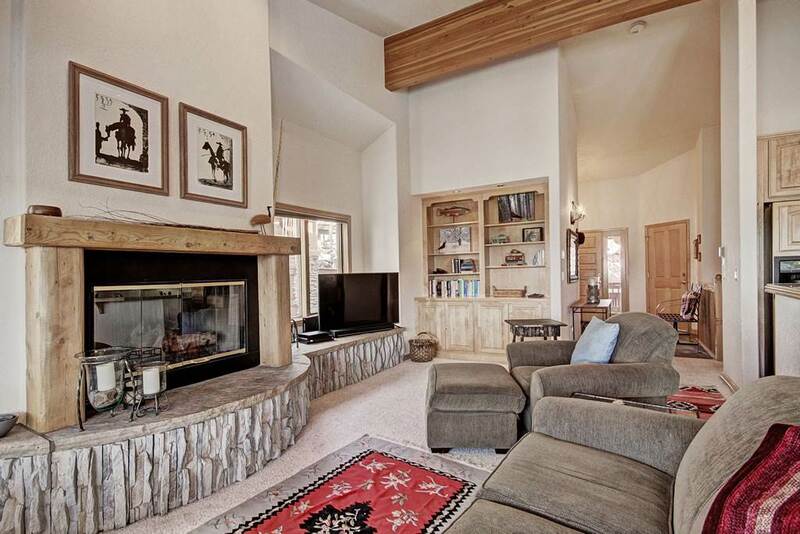 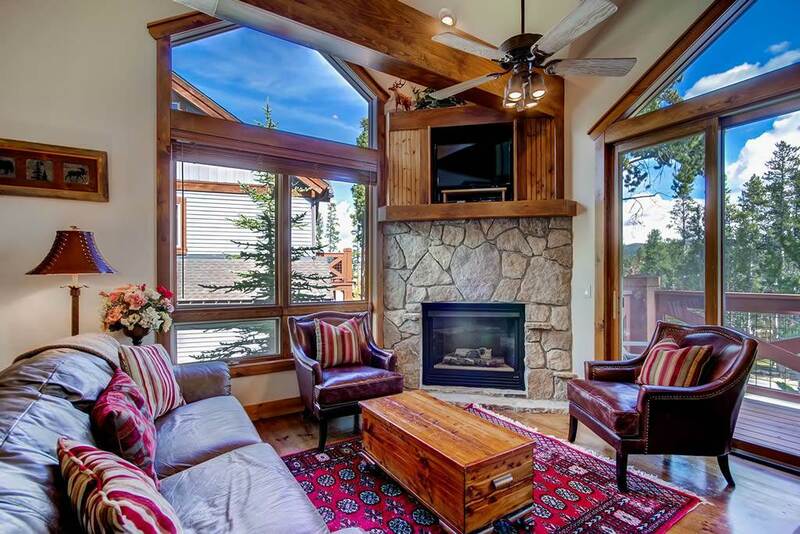 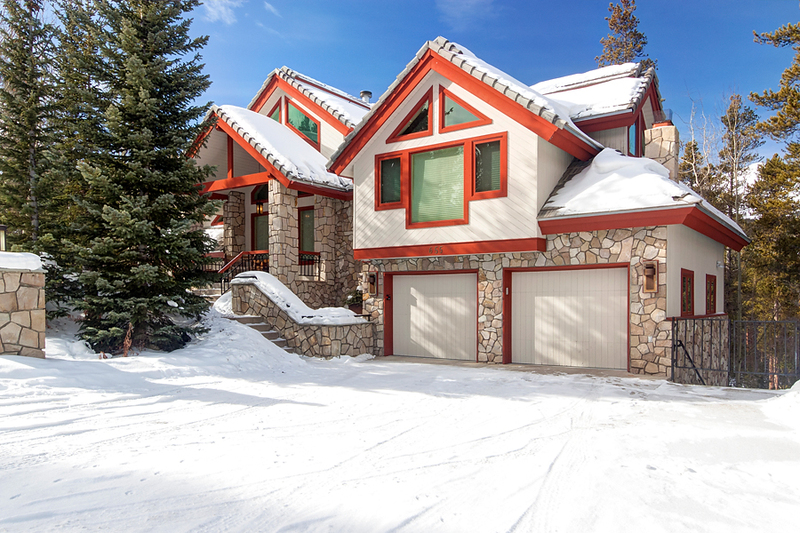 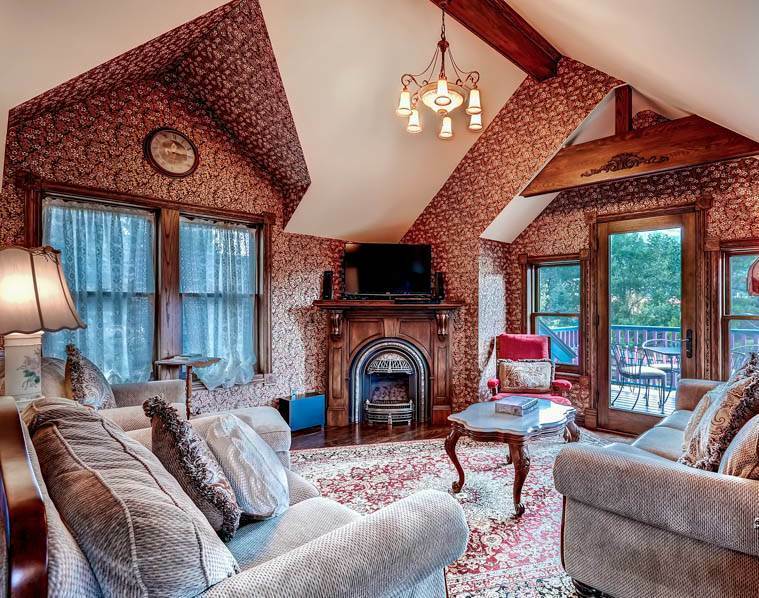 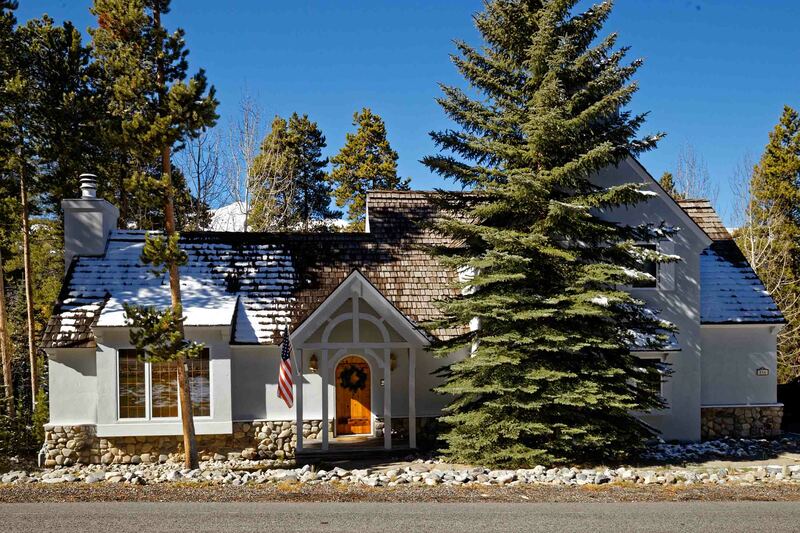 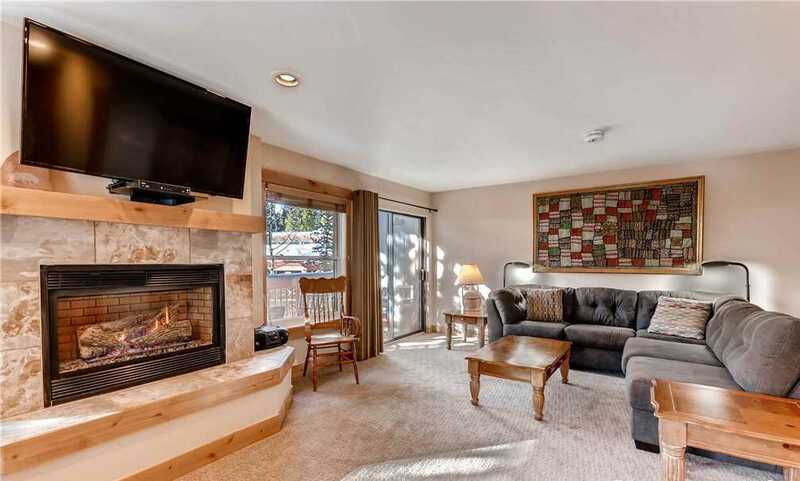 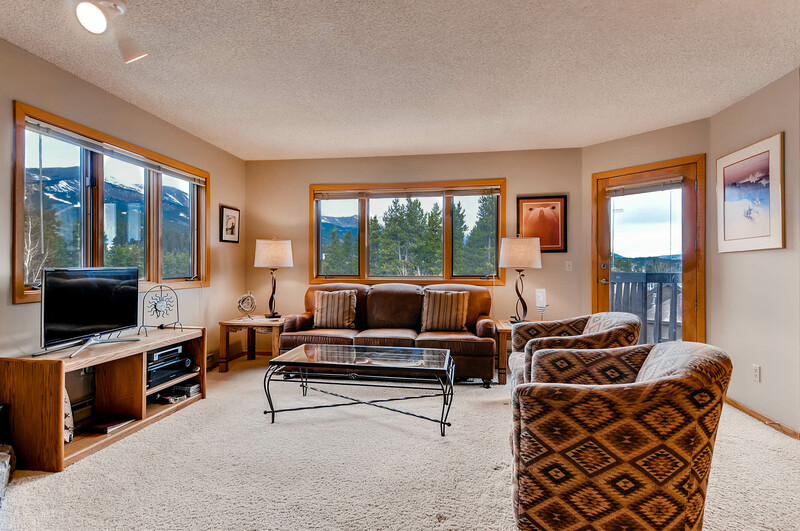 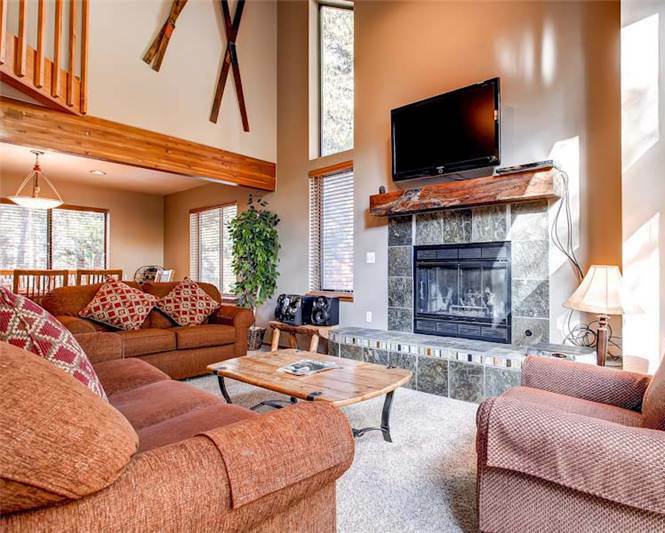 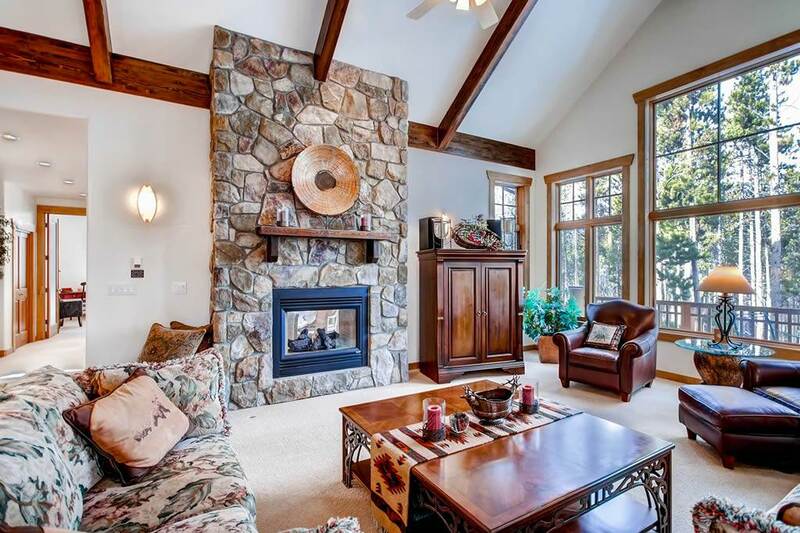 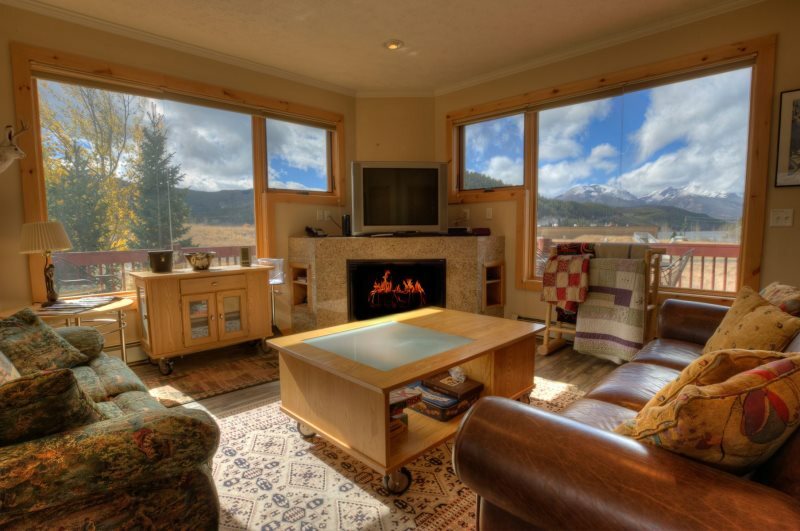 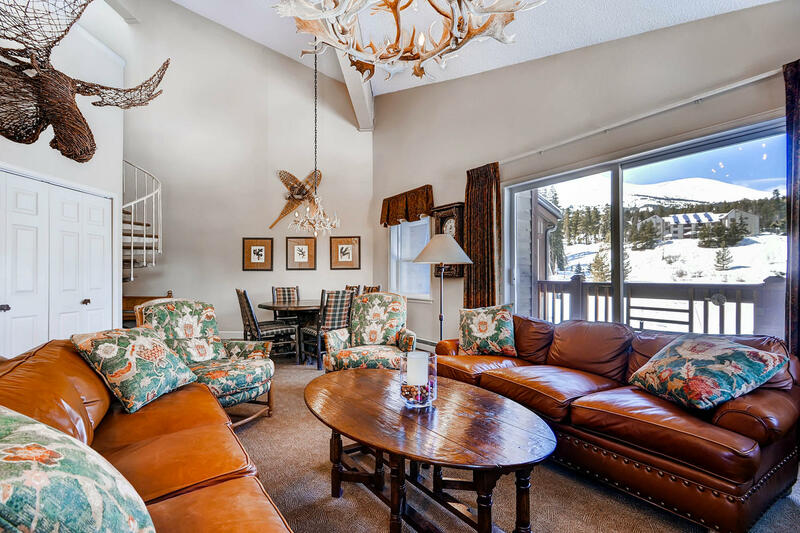 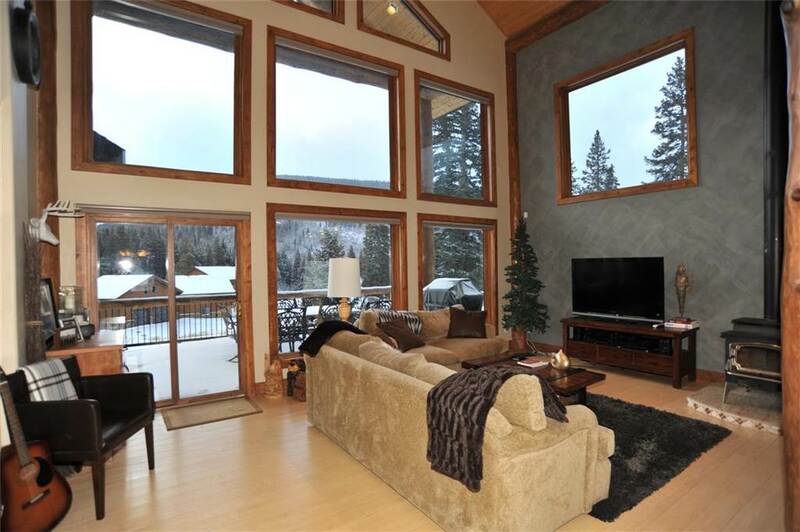 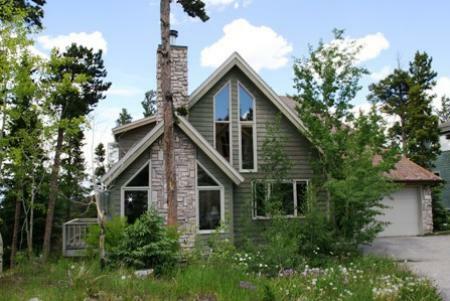 Located just a short ten minute drive from Downtown Breckenridge in the Blue River neighborhood, this home combines value and comfort and is surrounded by lodge pole pines and mountain views. 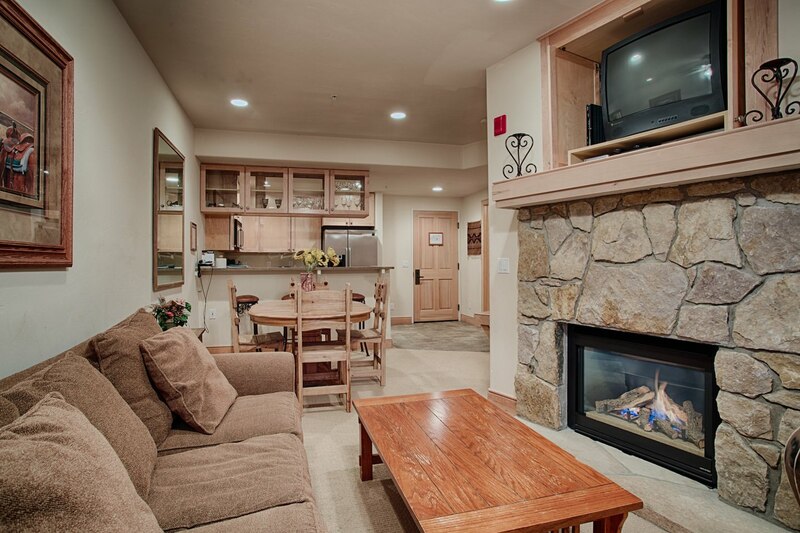 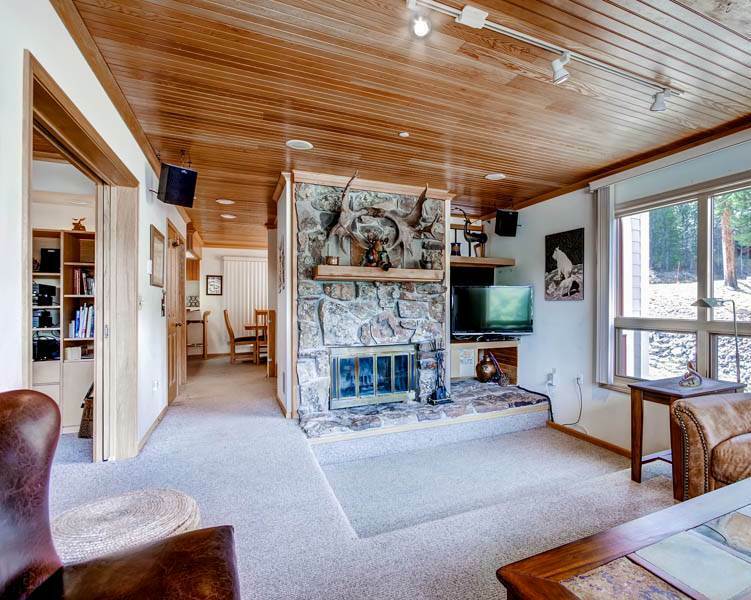 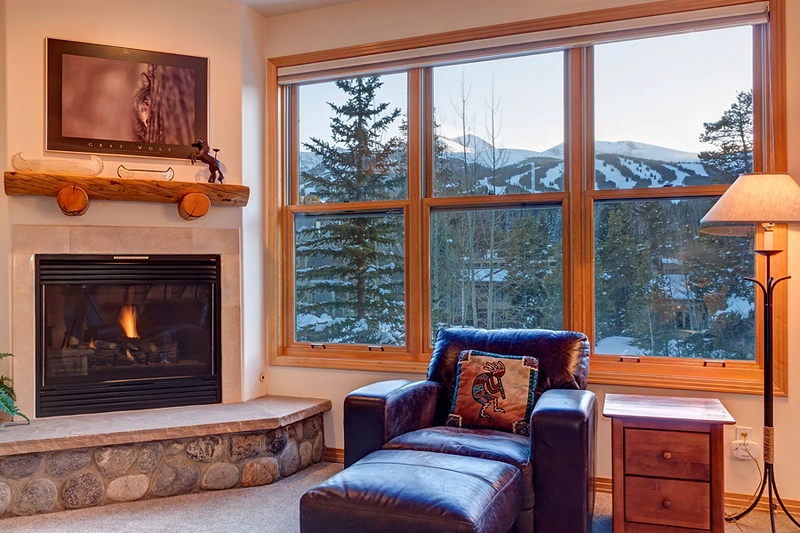 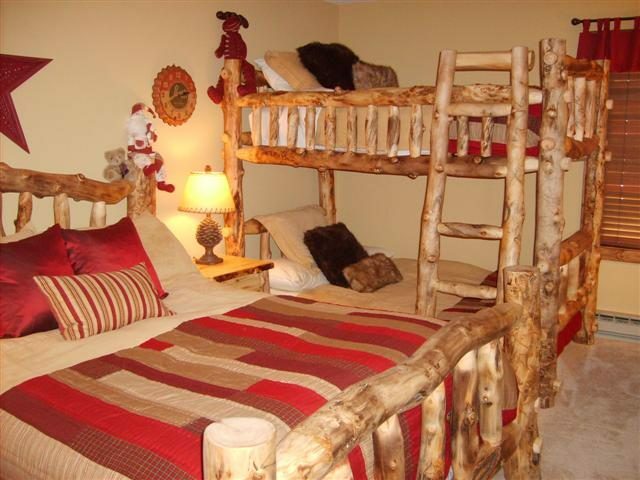 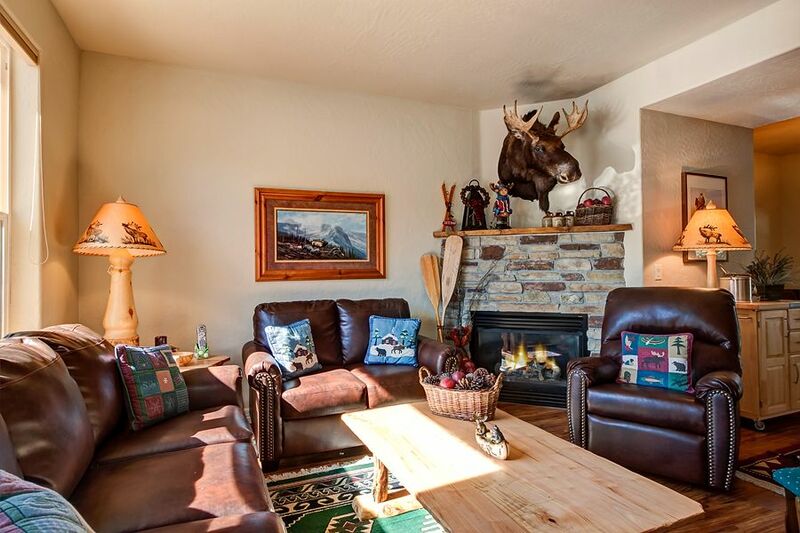 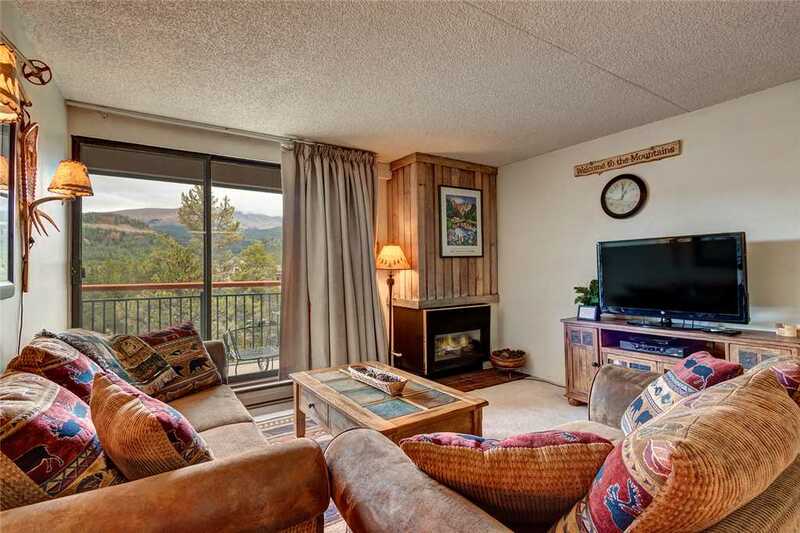 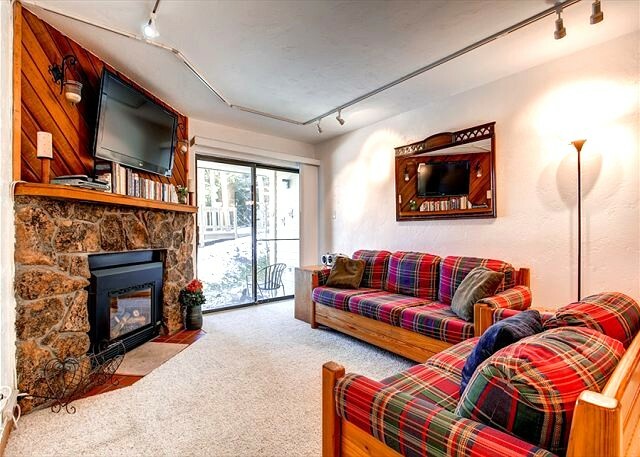 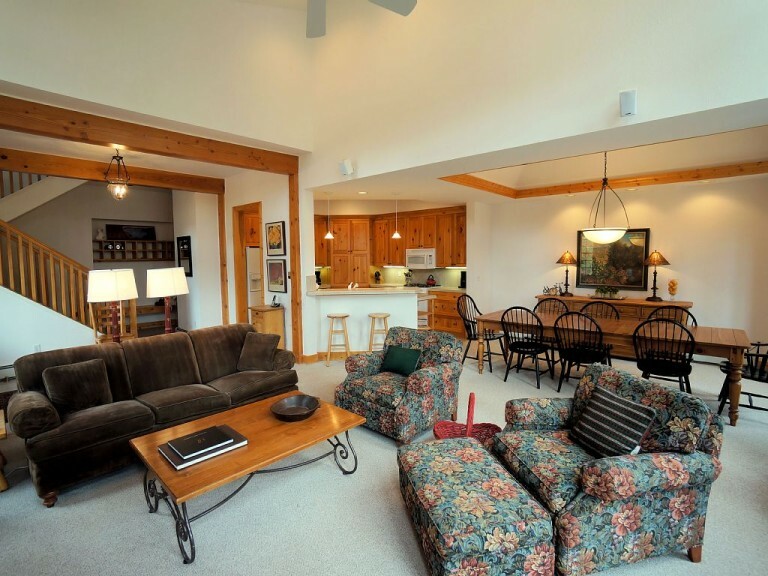 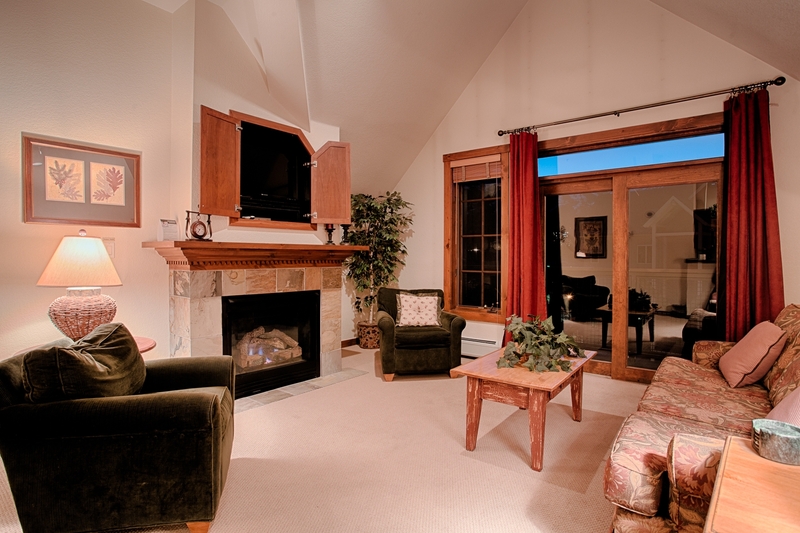 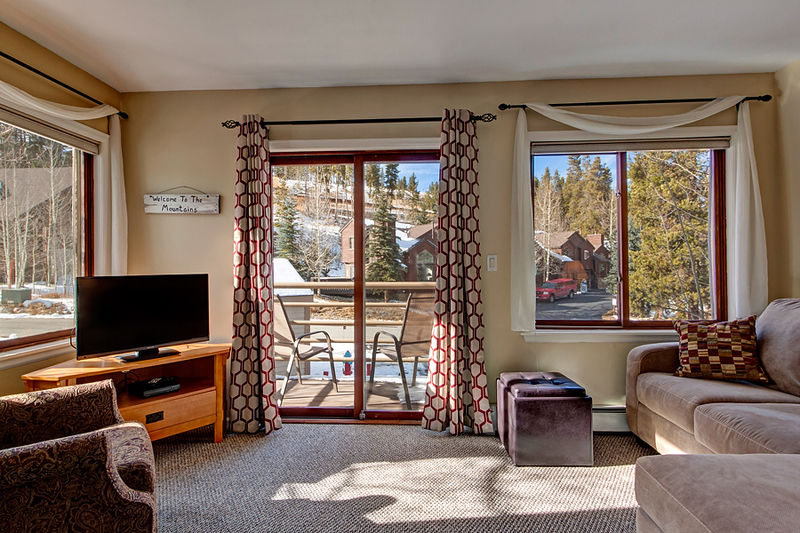 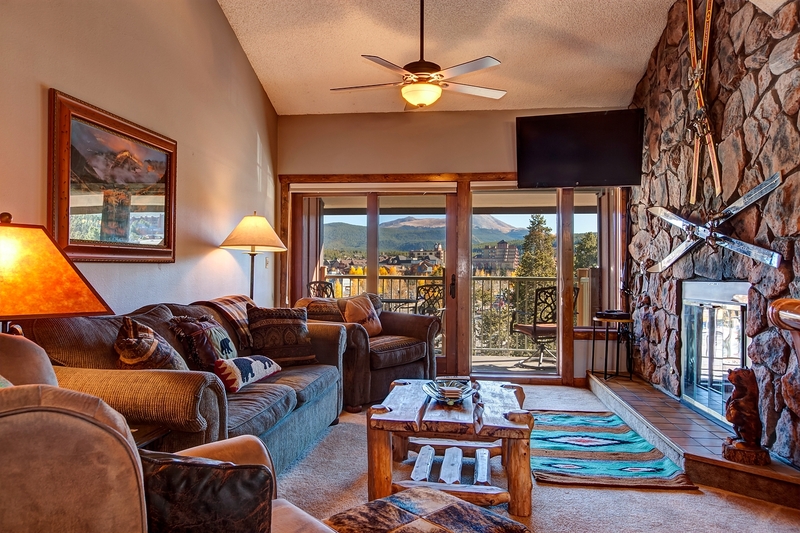 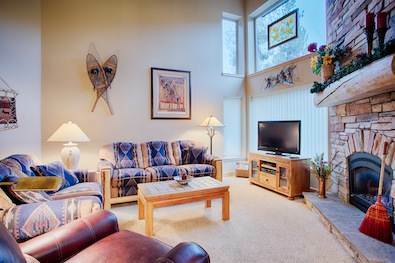 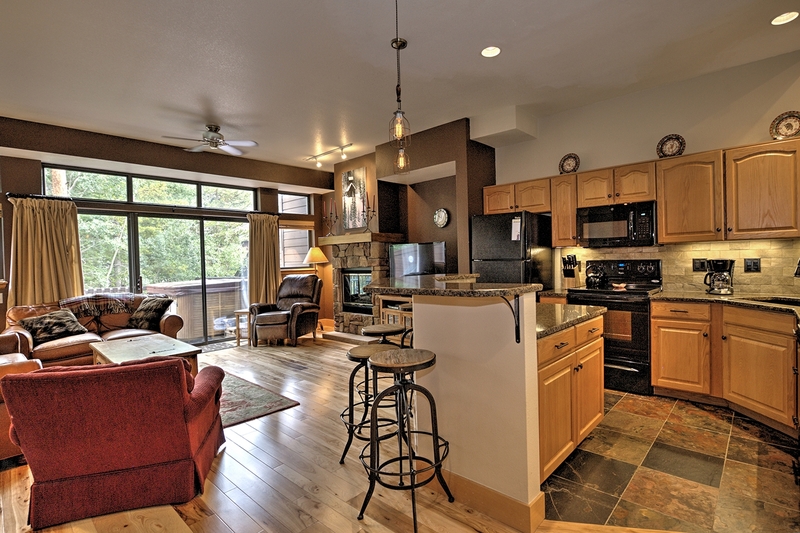 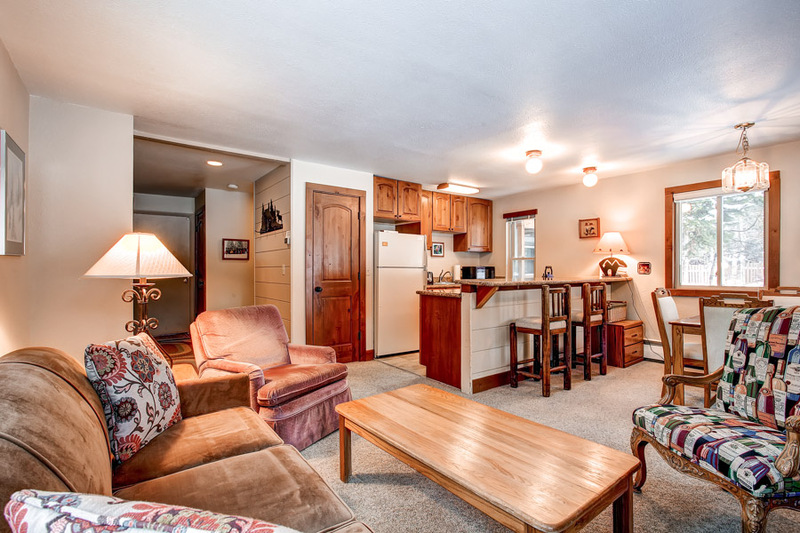 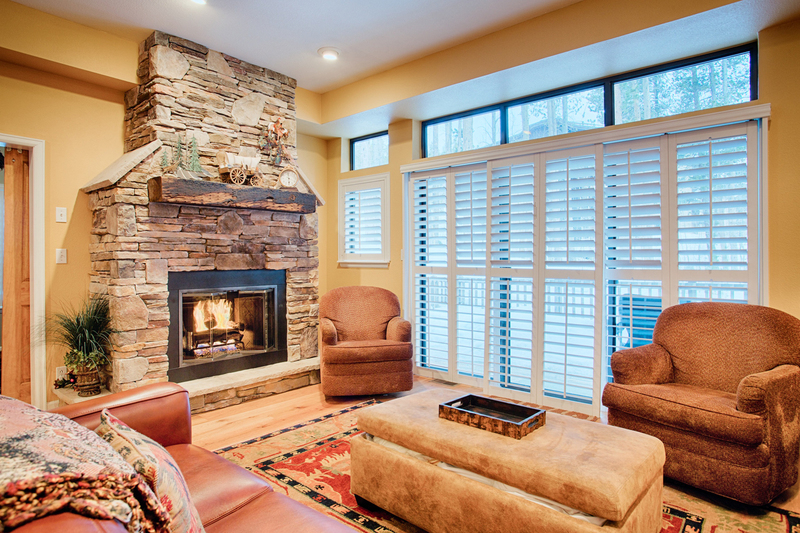 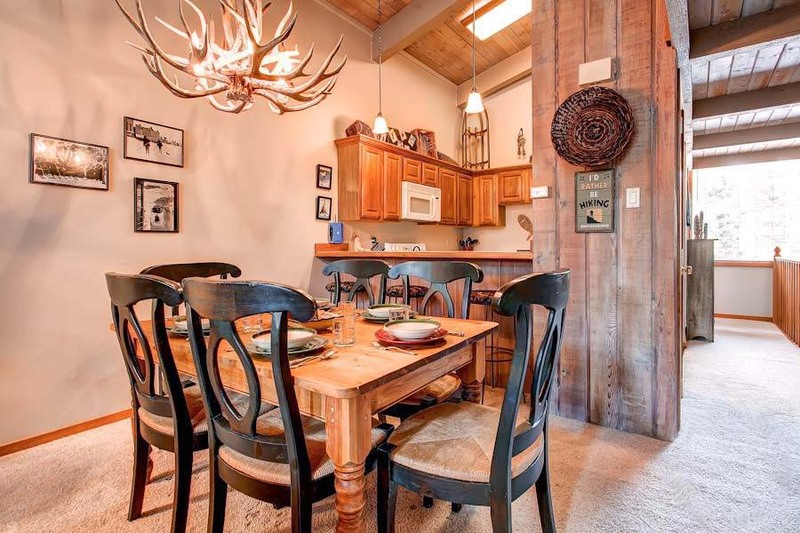 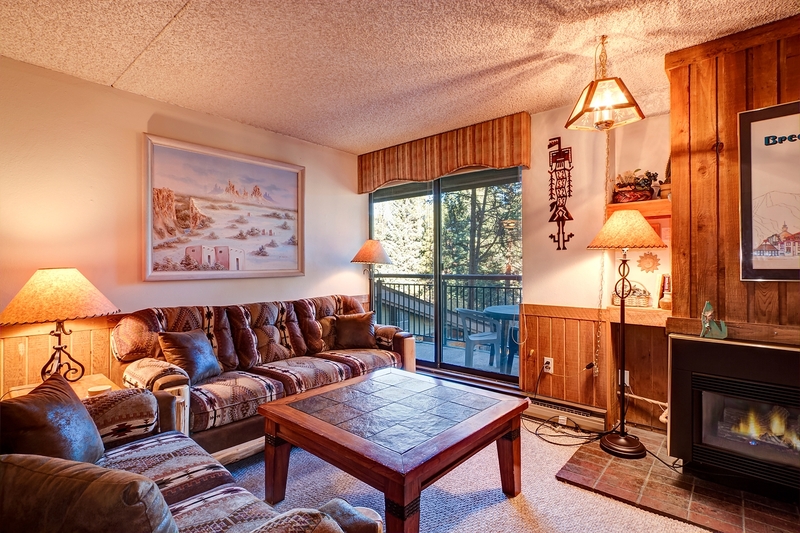 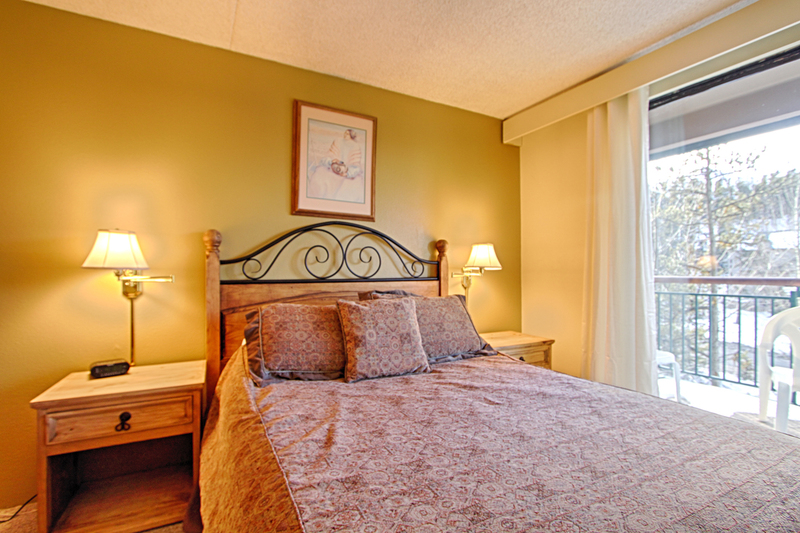 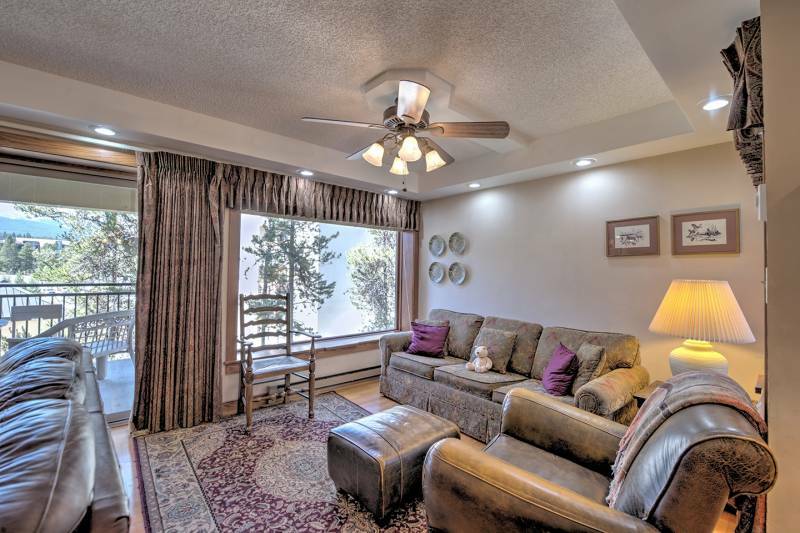 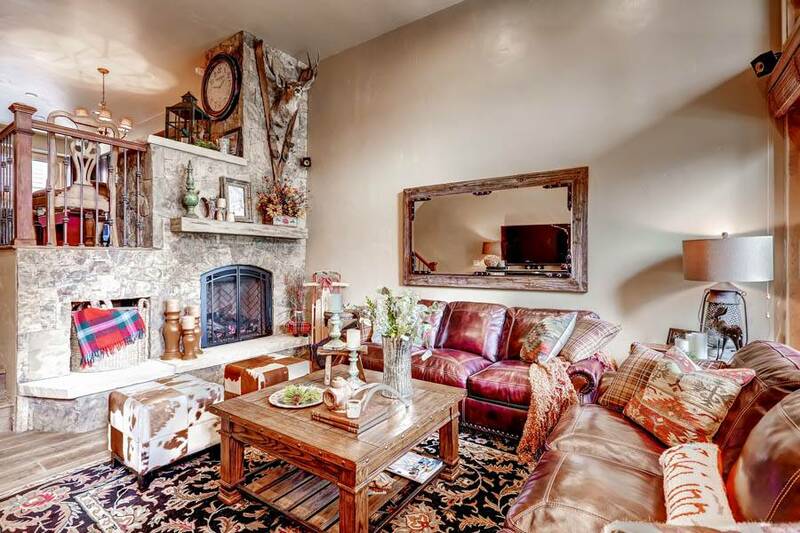 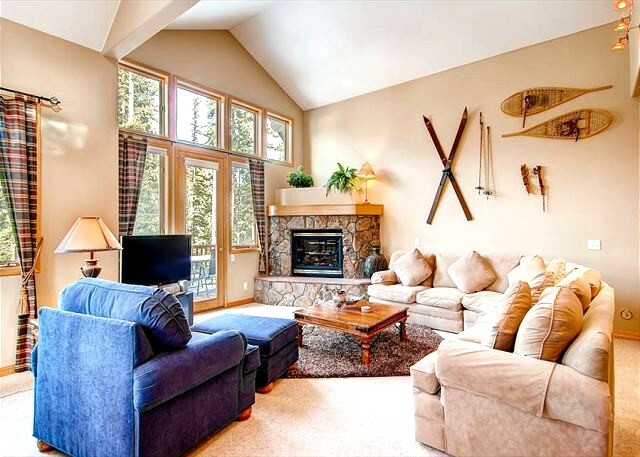 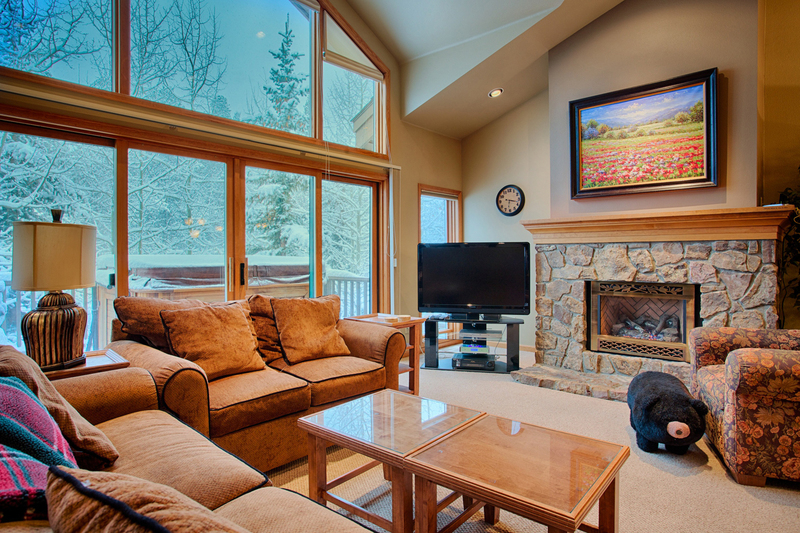 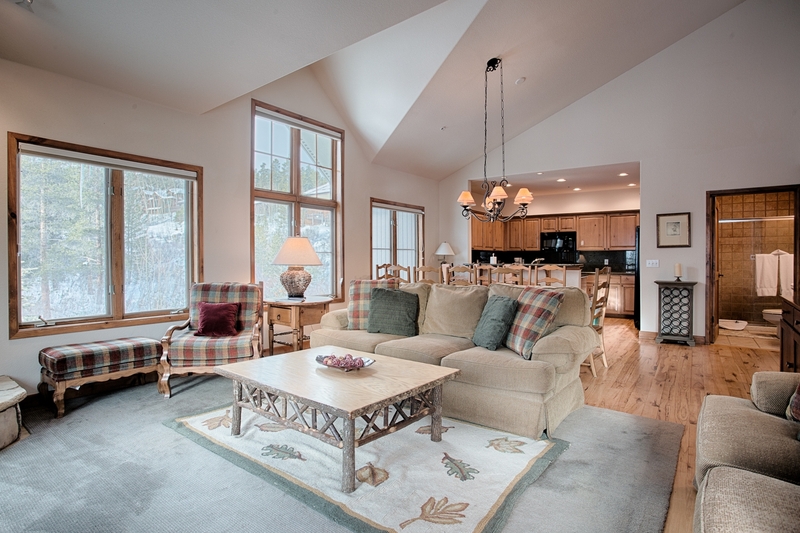 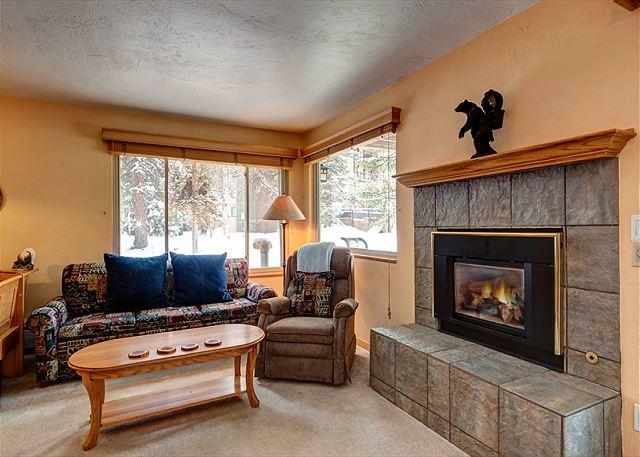 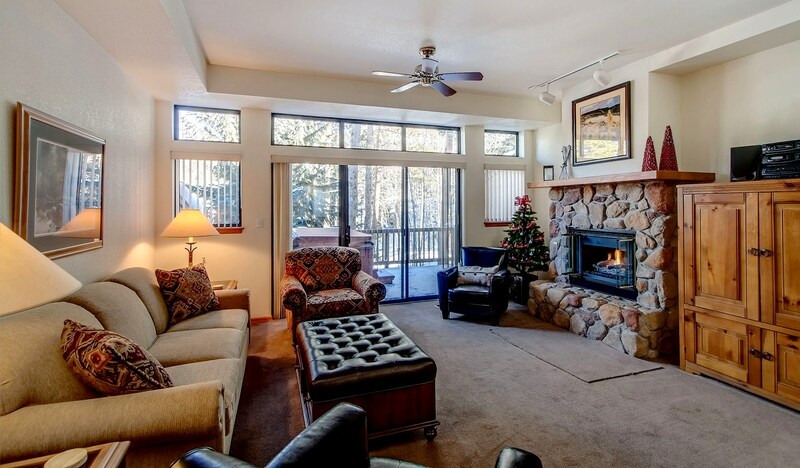 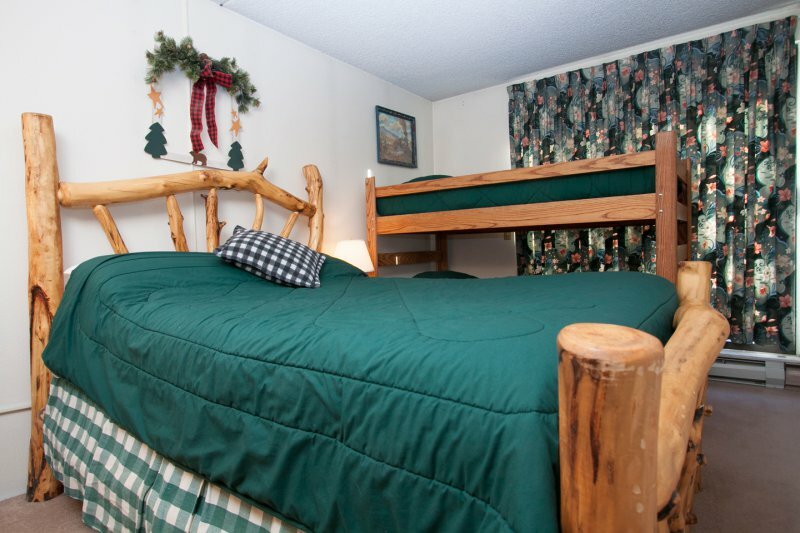 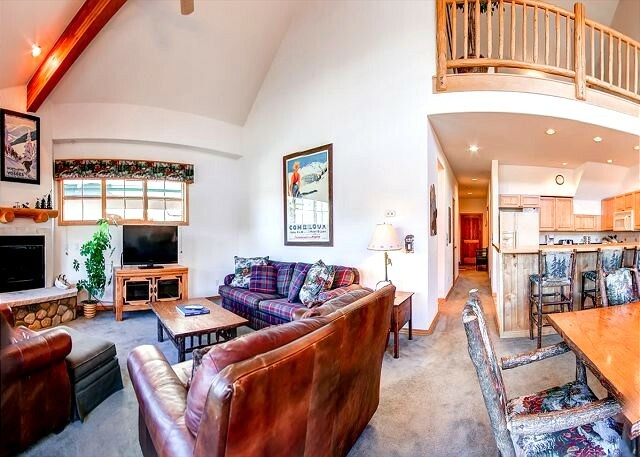 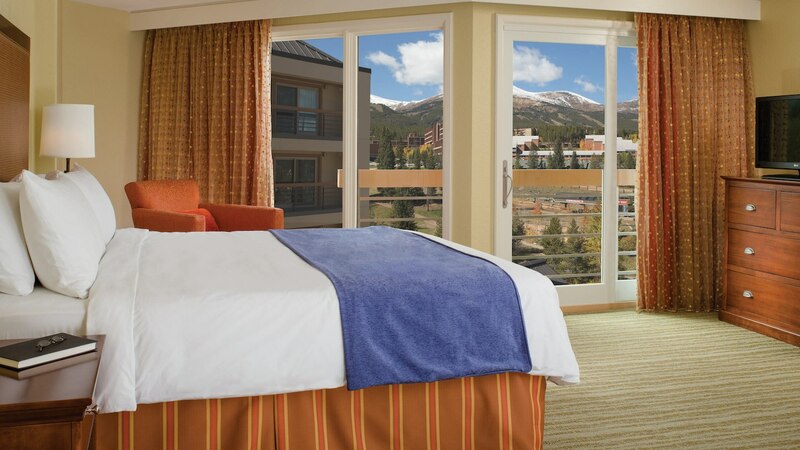 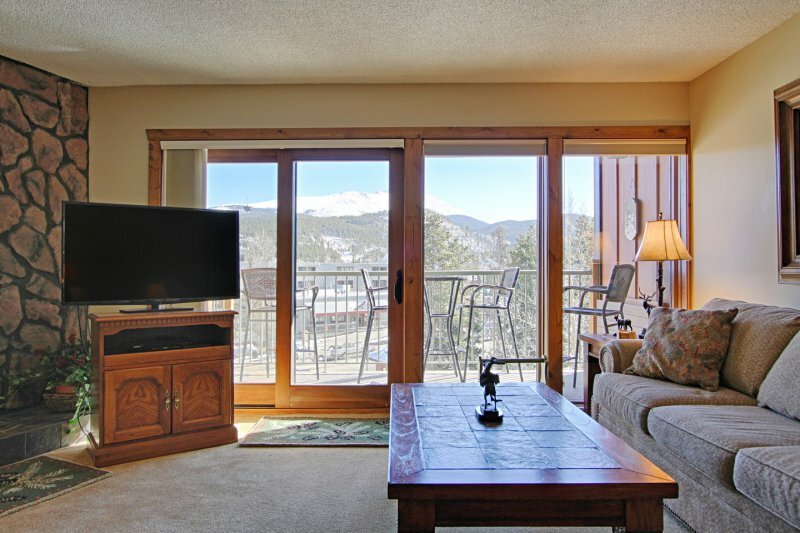 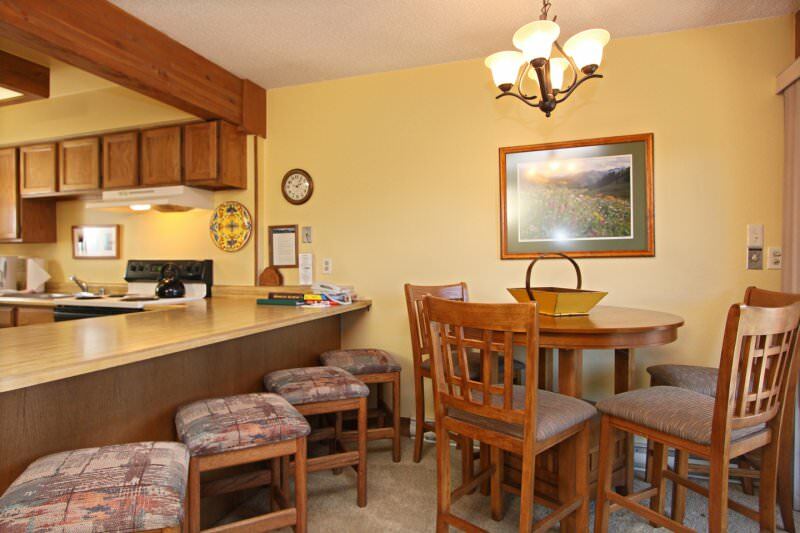 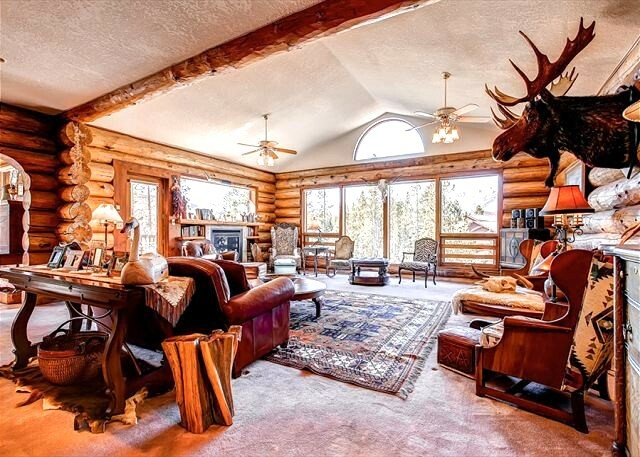 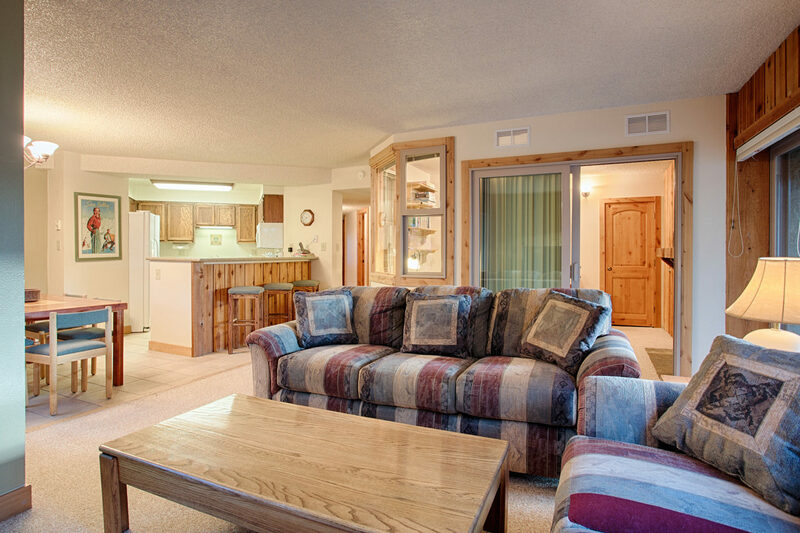 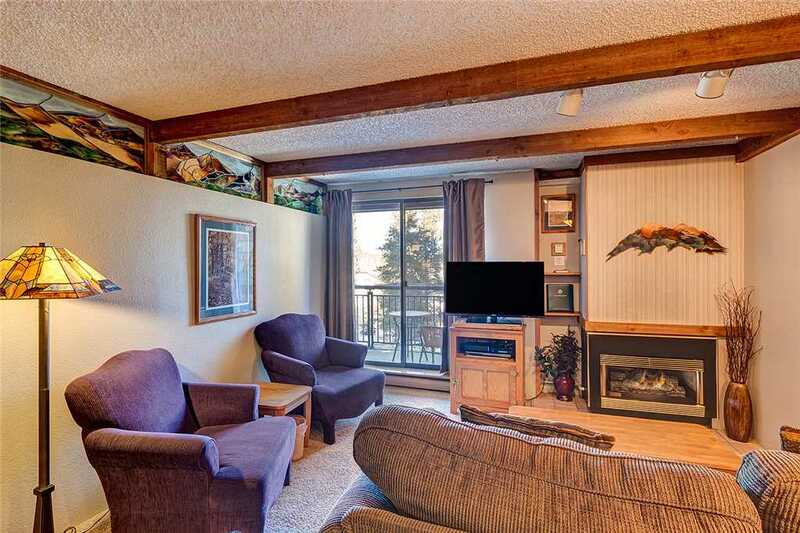 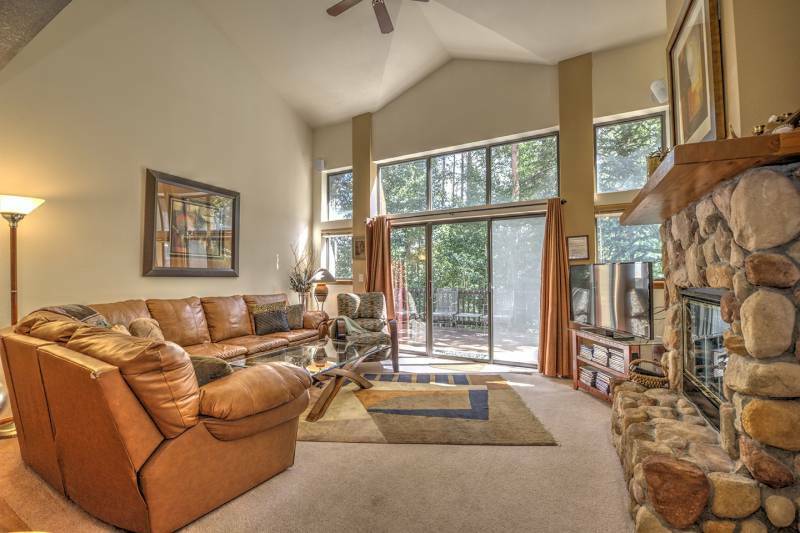 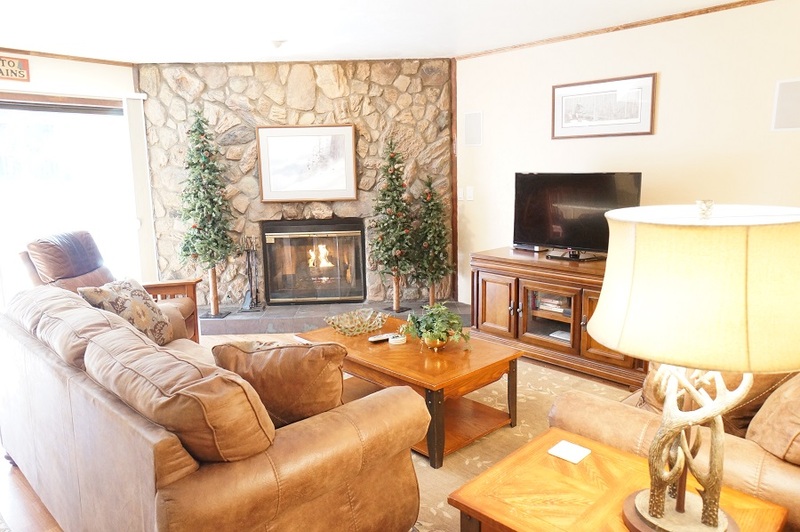 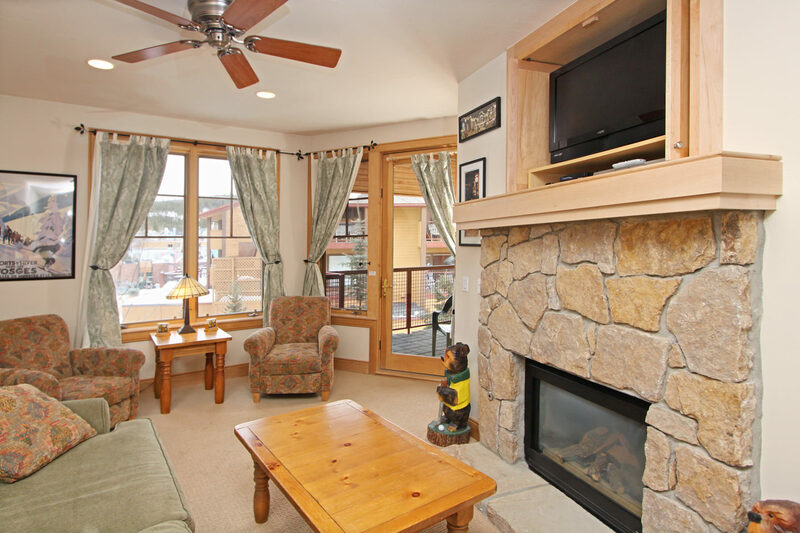 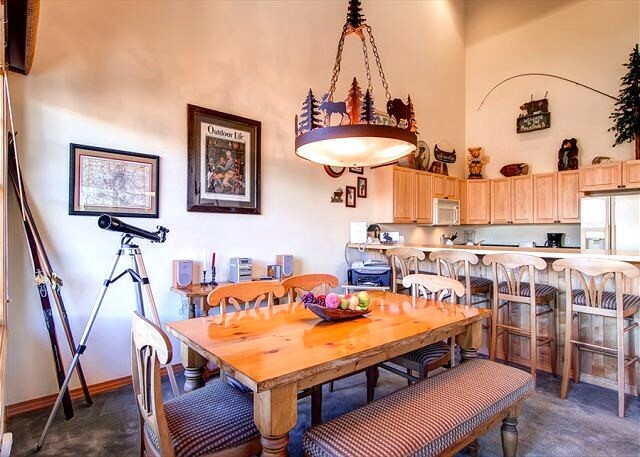 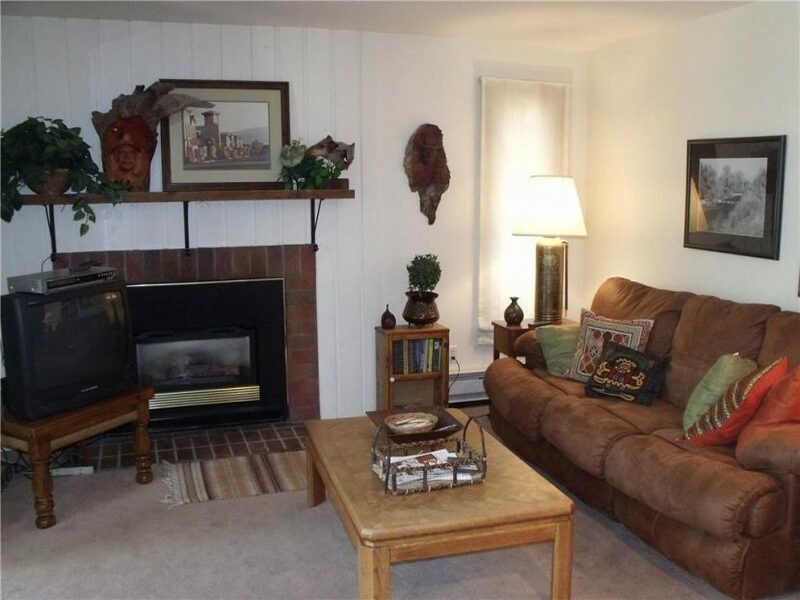 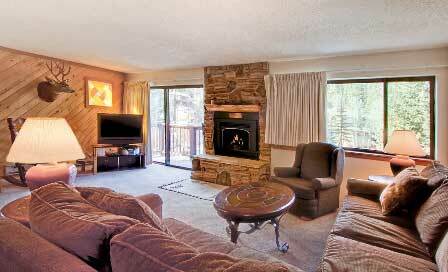 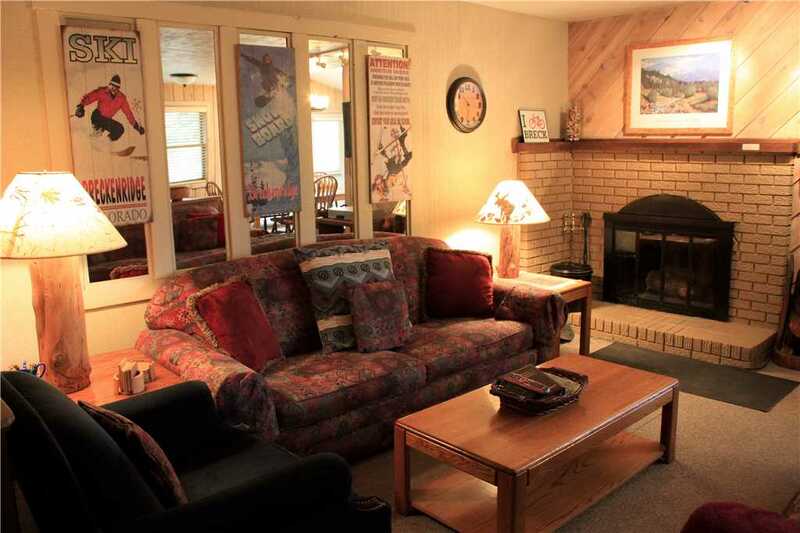 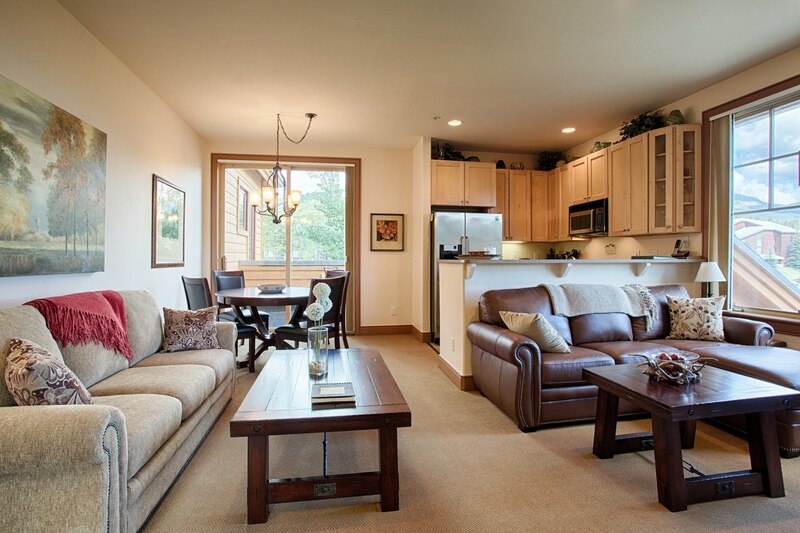 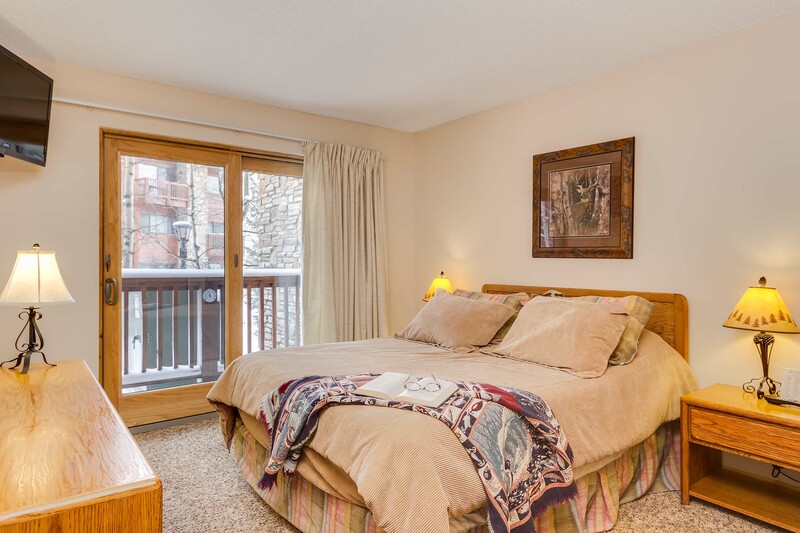 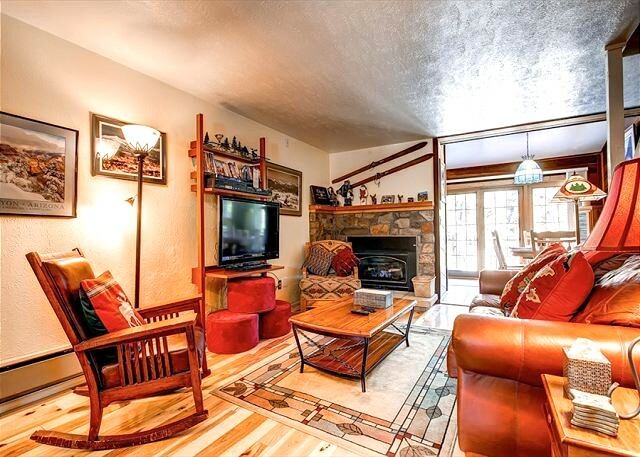 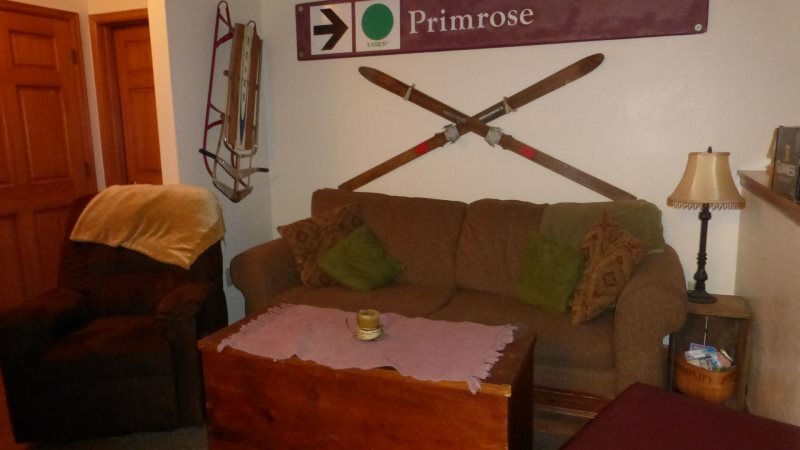 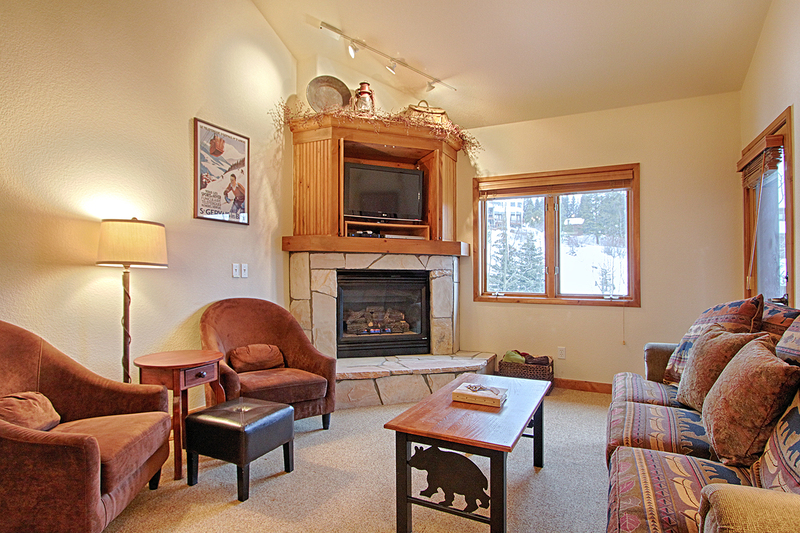 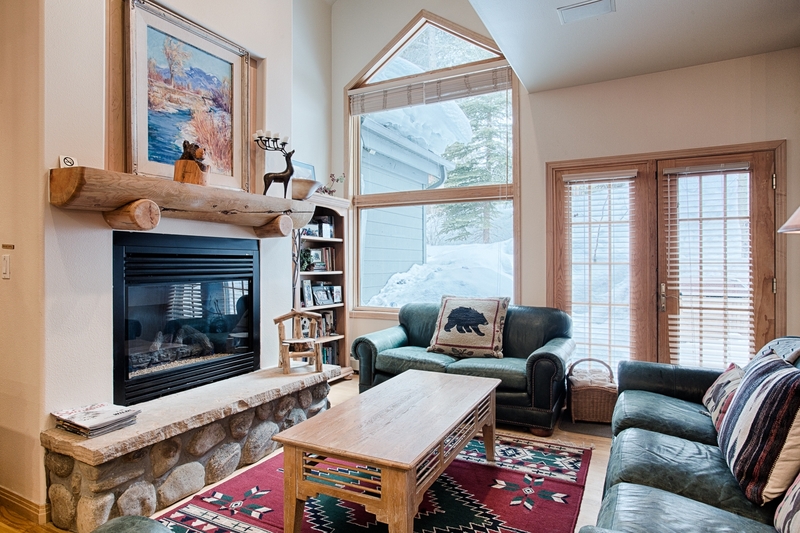 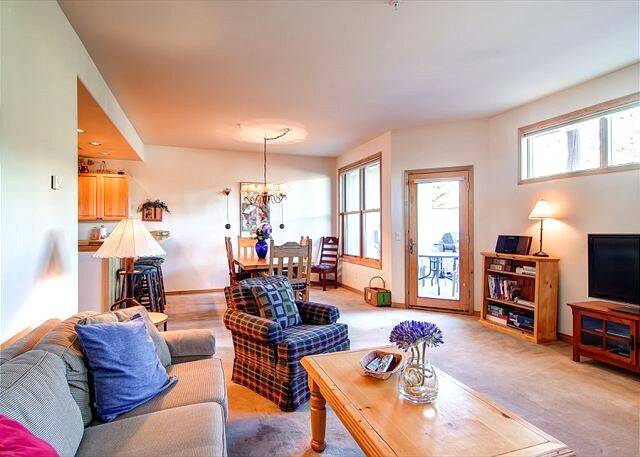 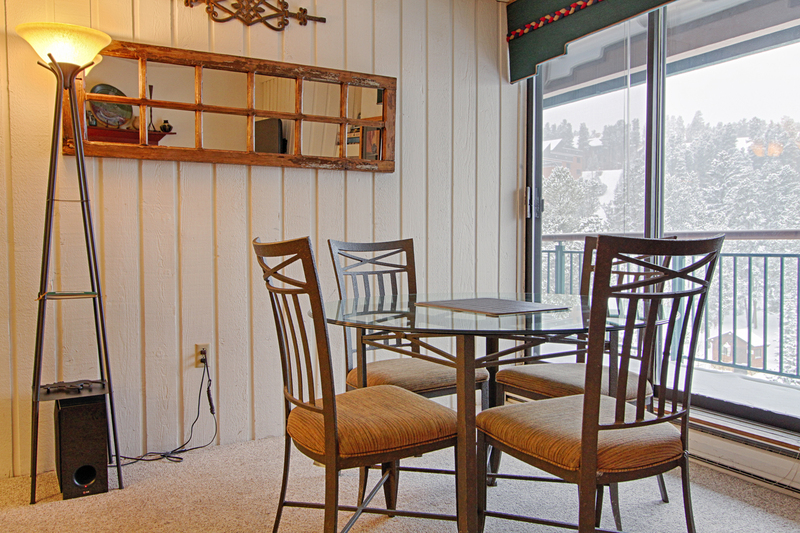 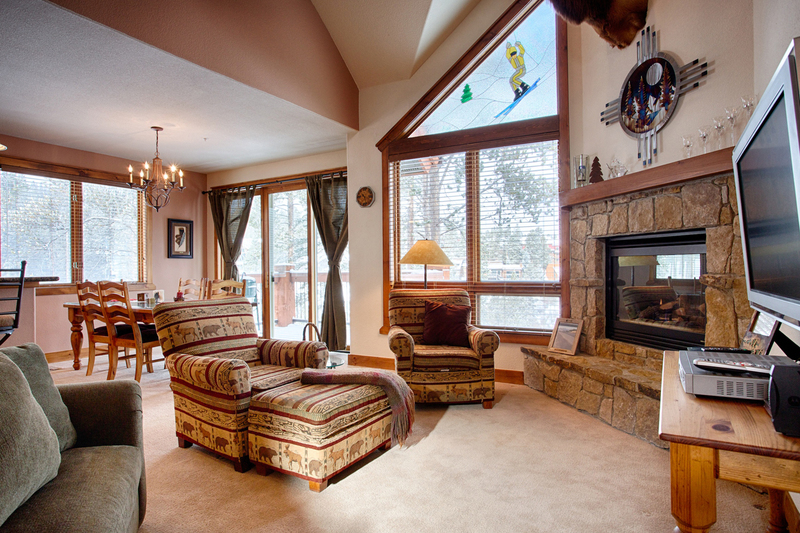 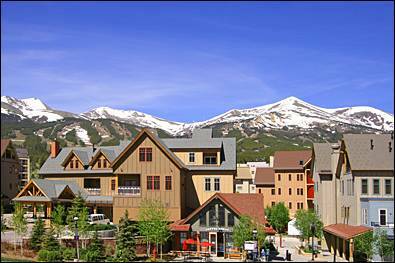 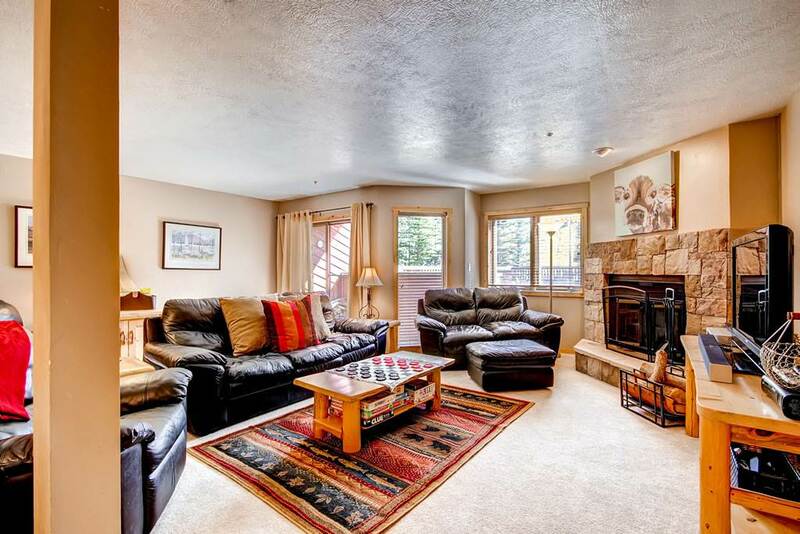 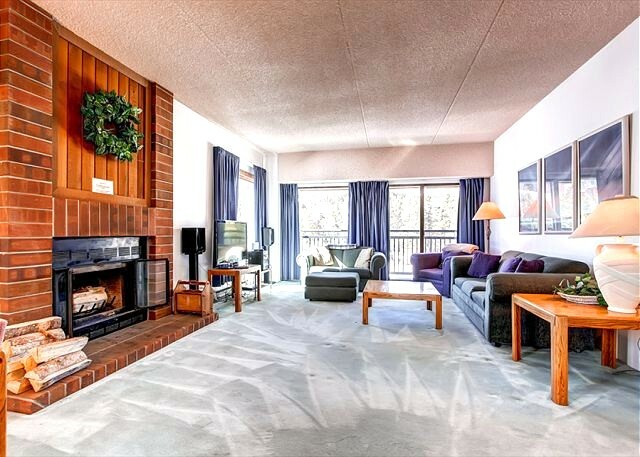 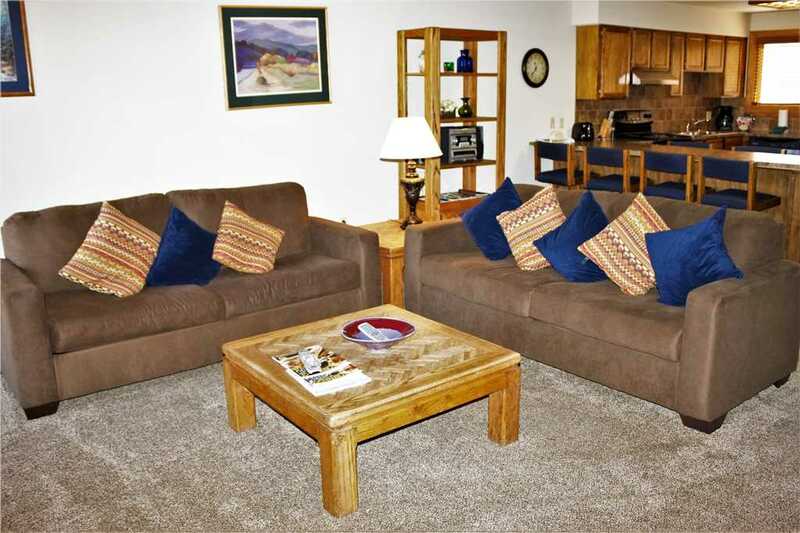 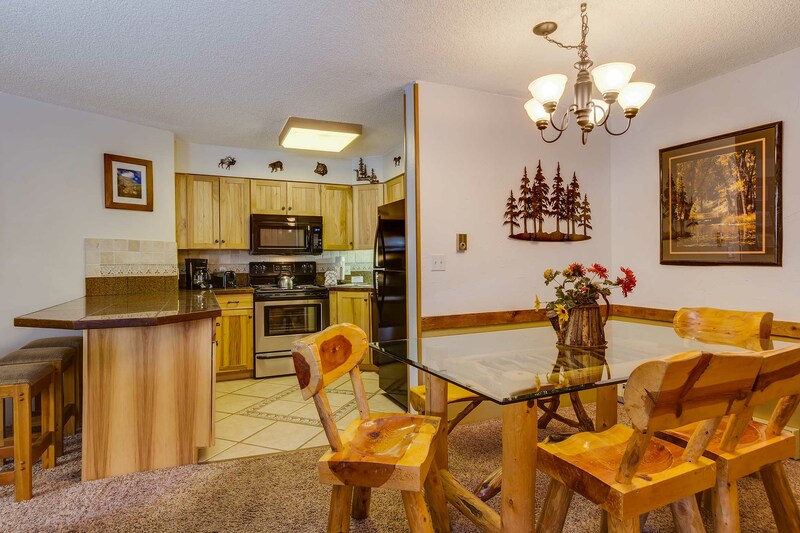 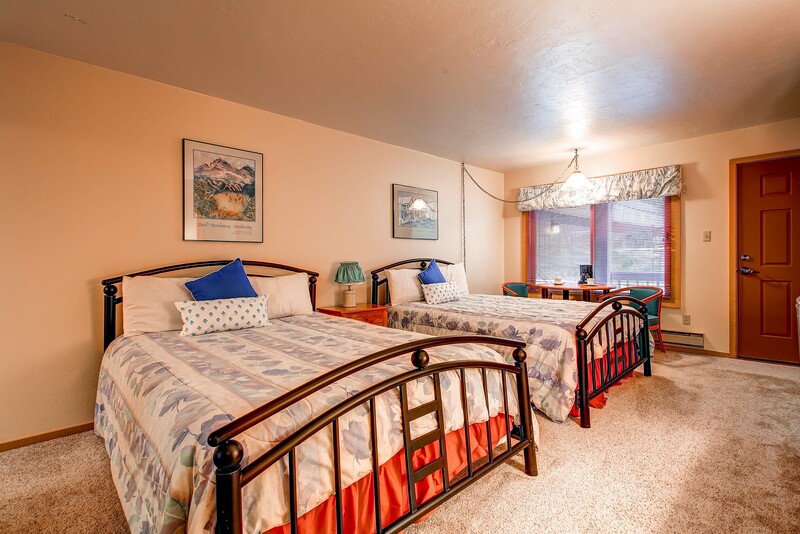 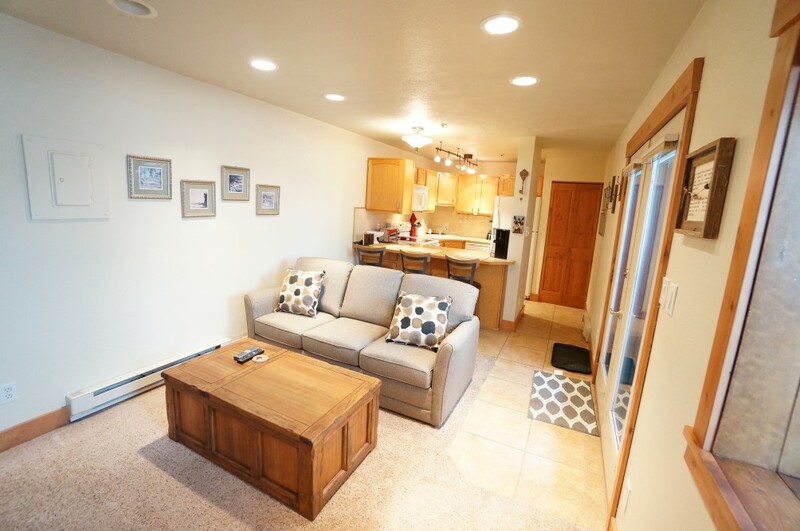 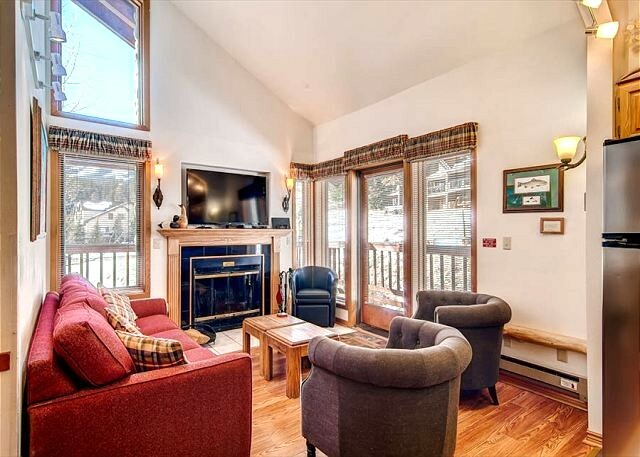 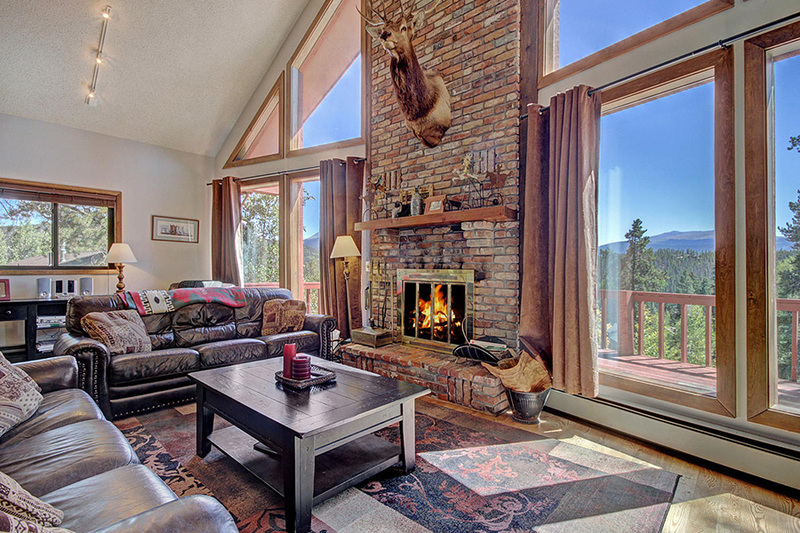 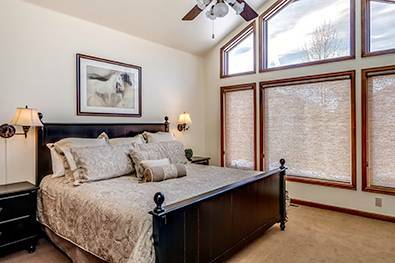 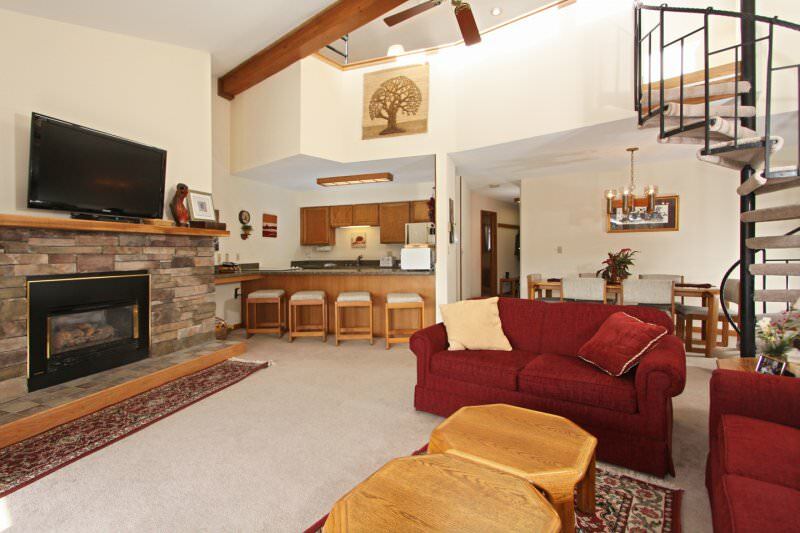 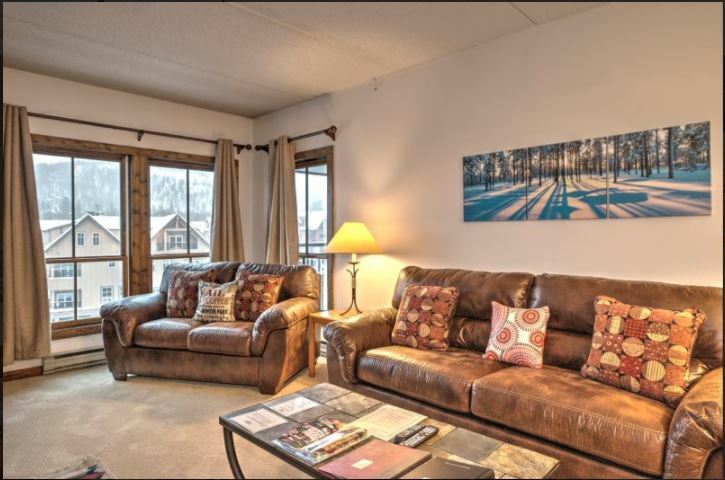 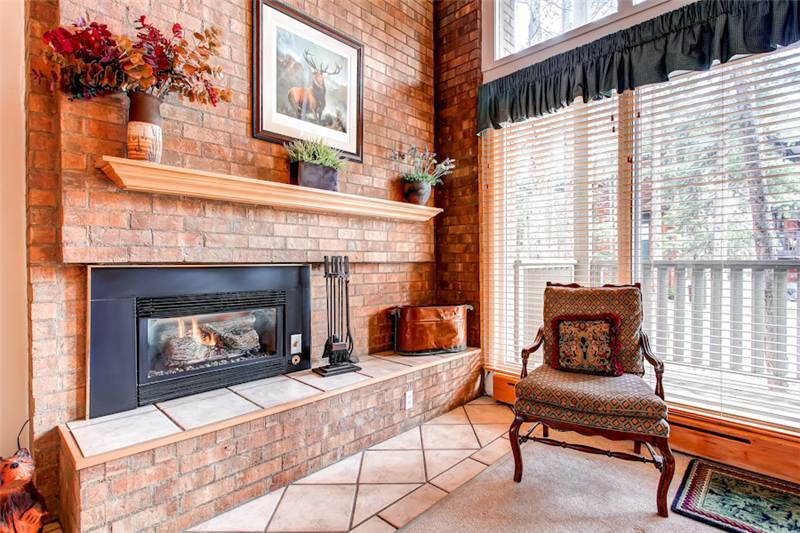 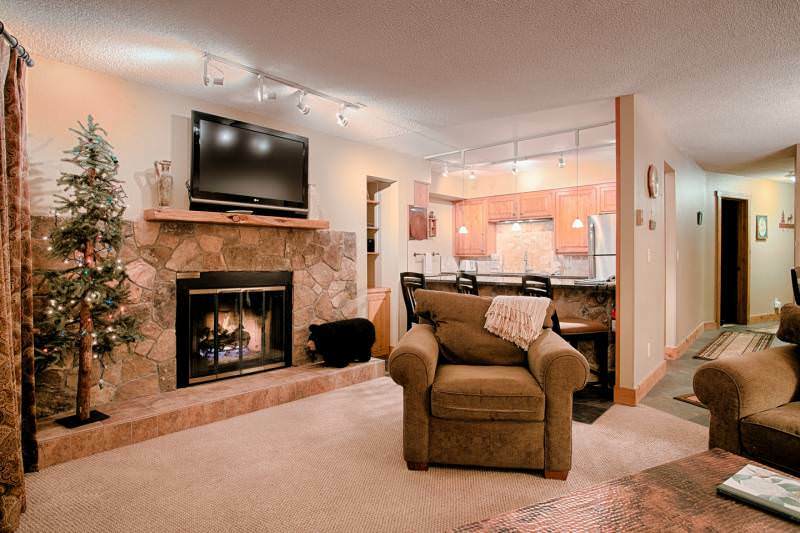 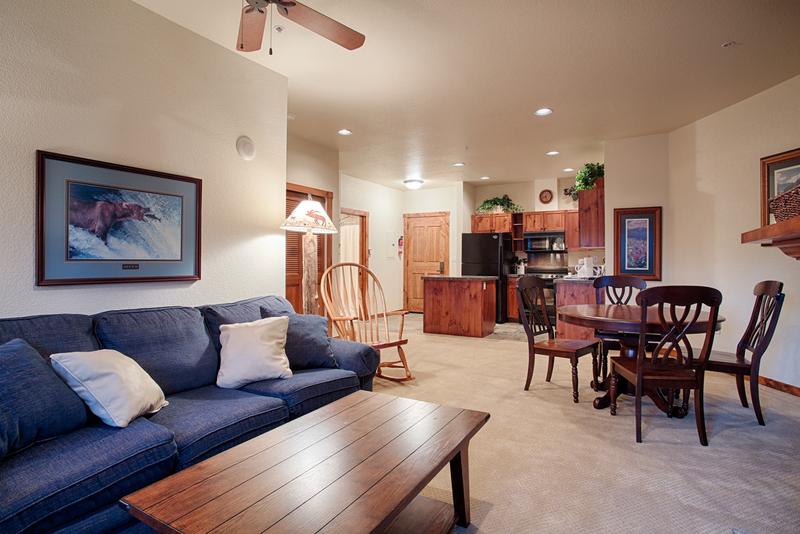 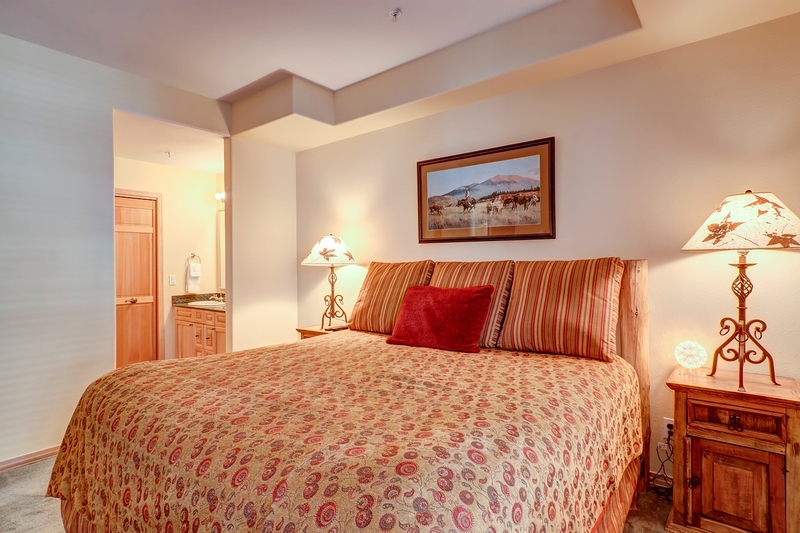 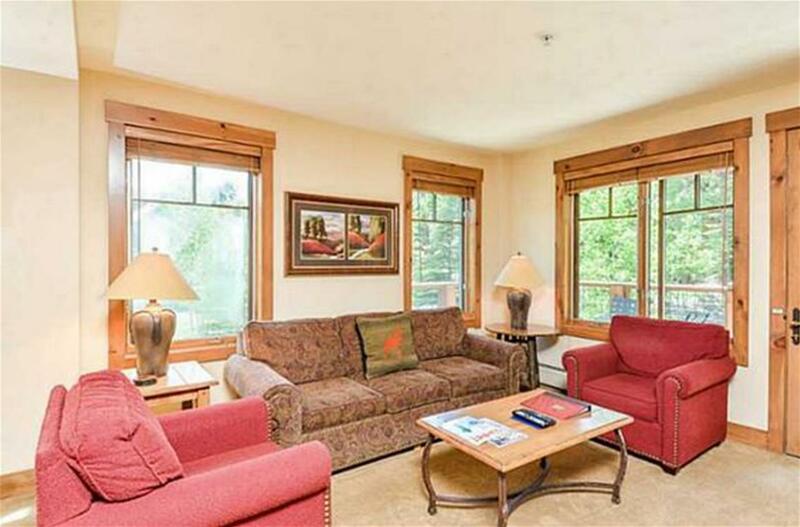 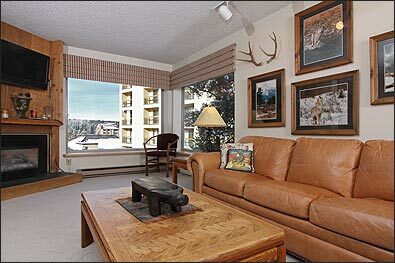 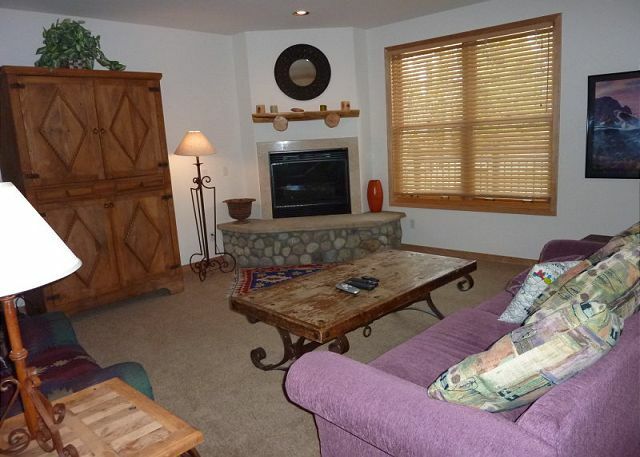 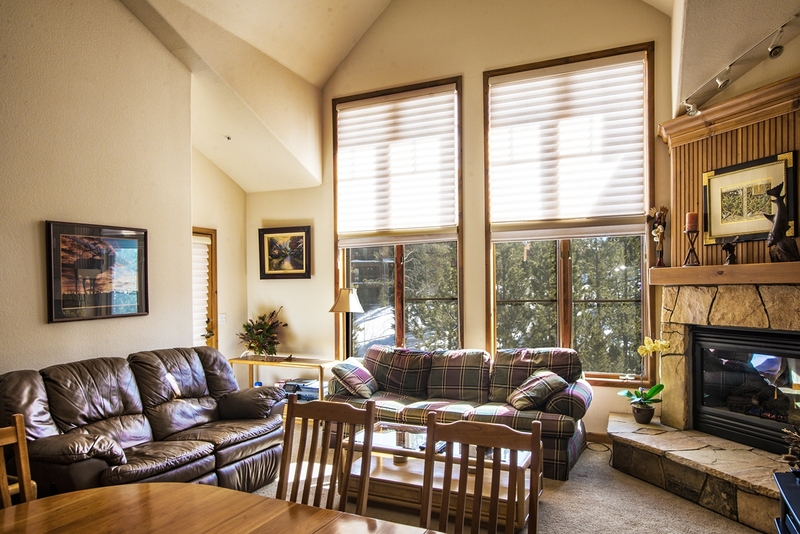 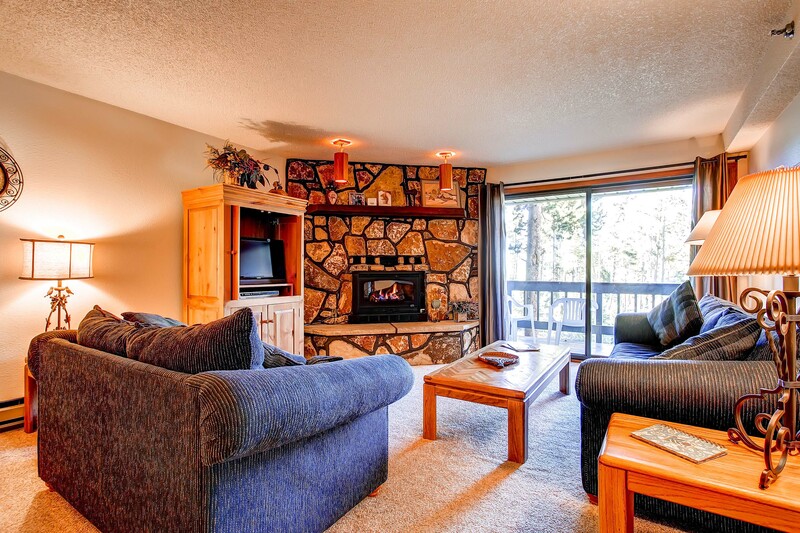 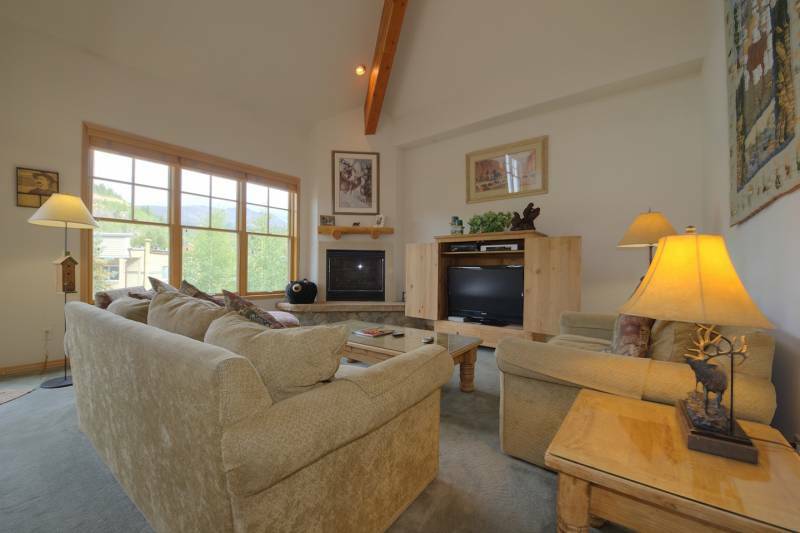 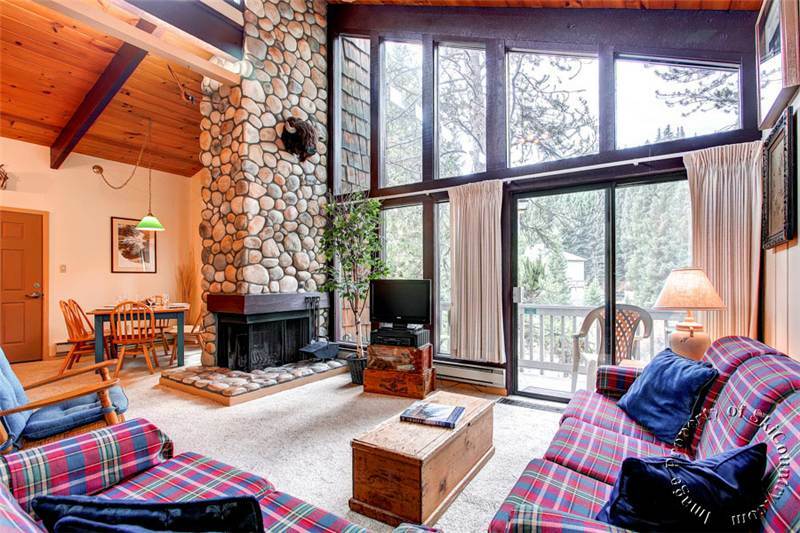 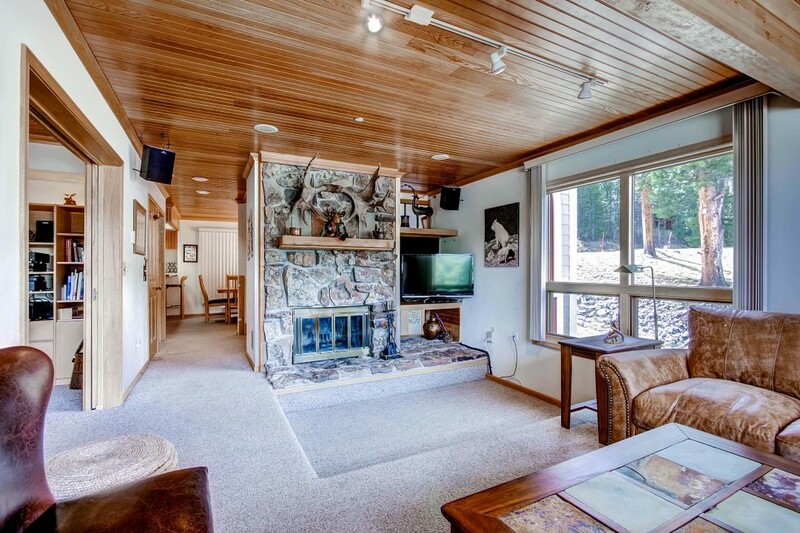 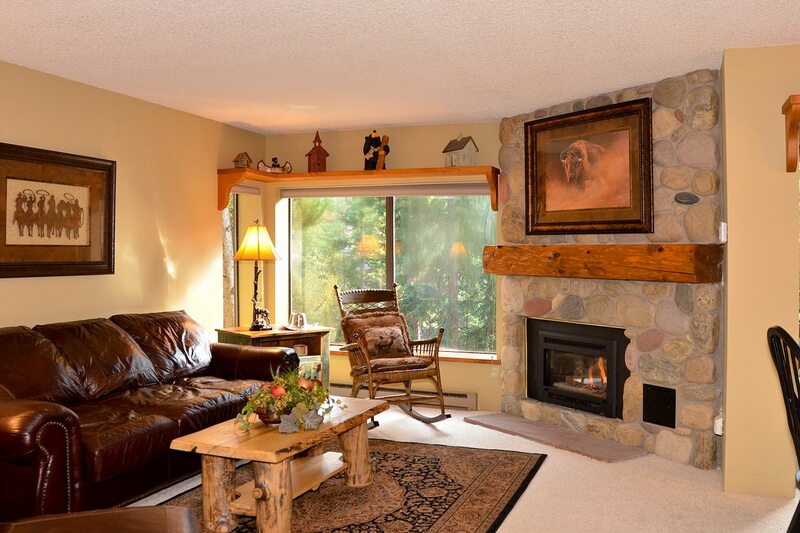 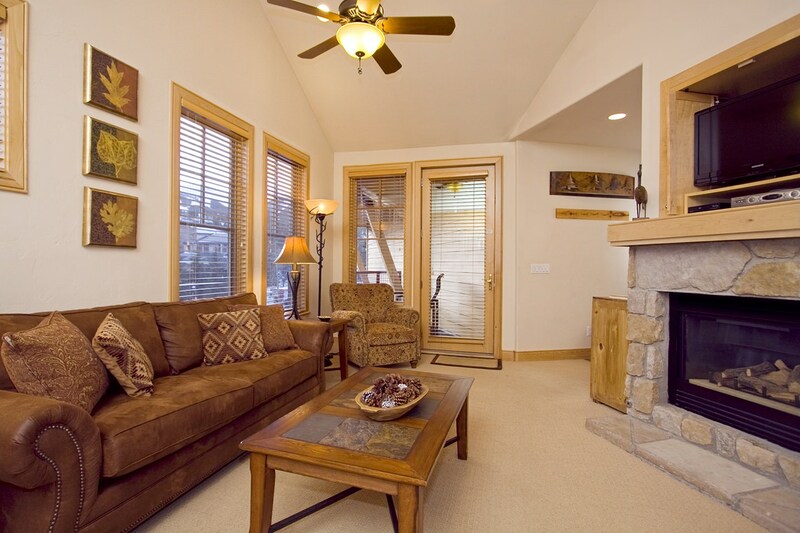 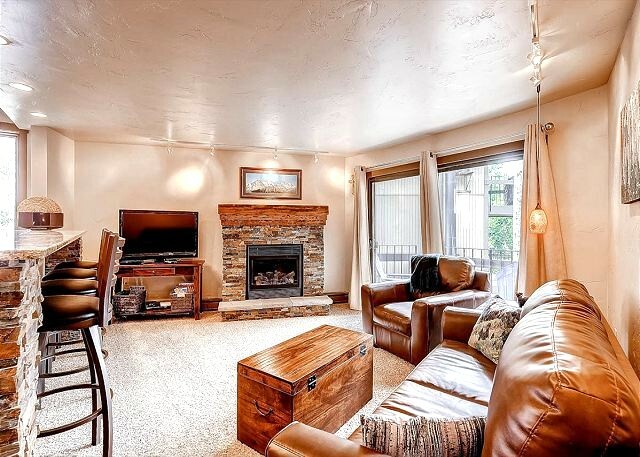 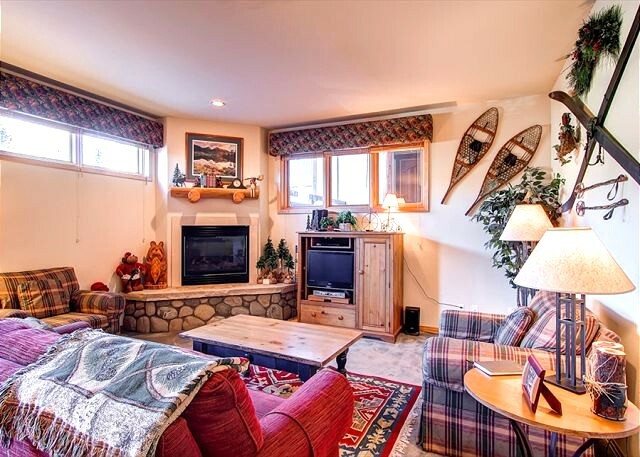 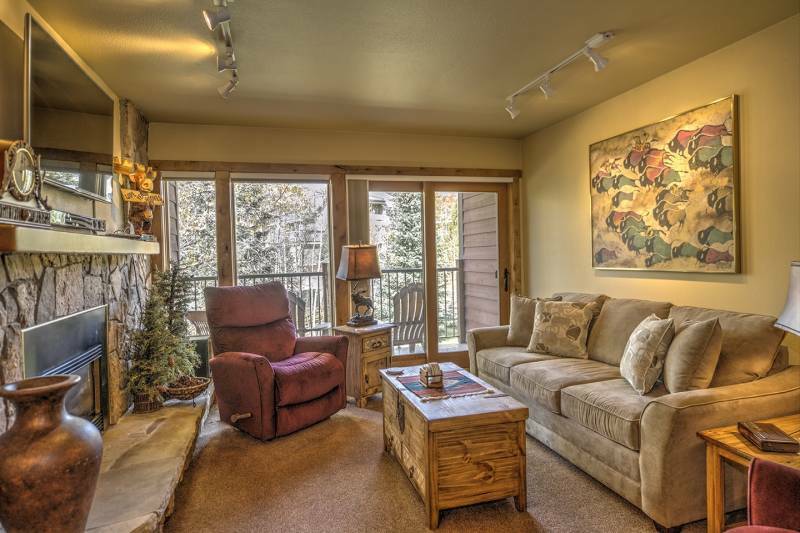 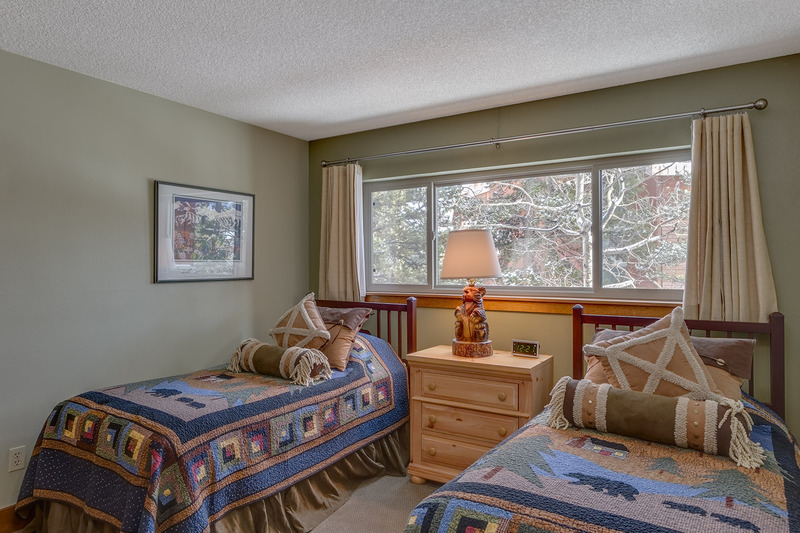 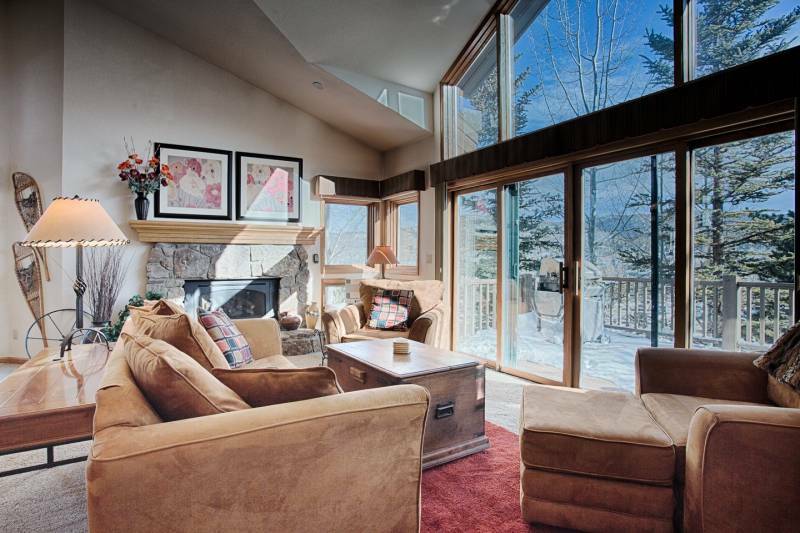 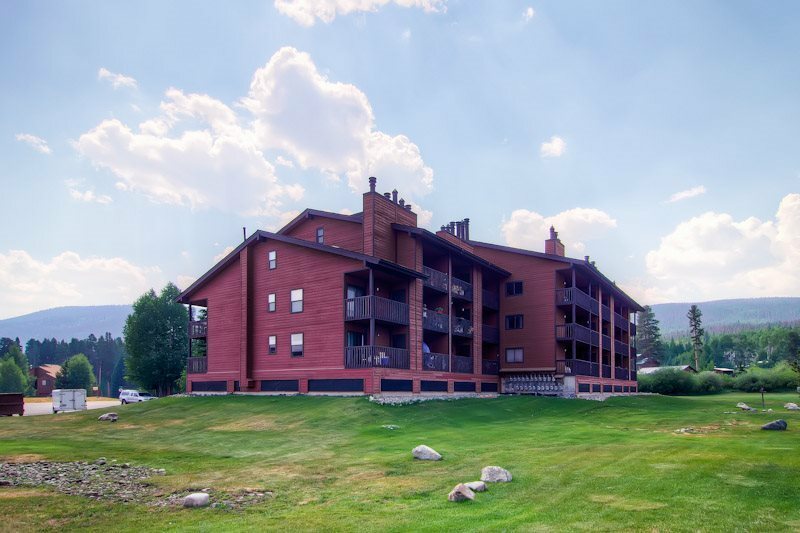 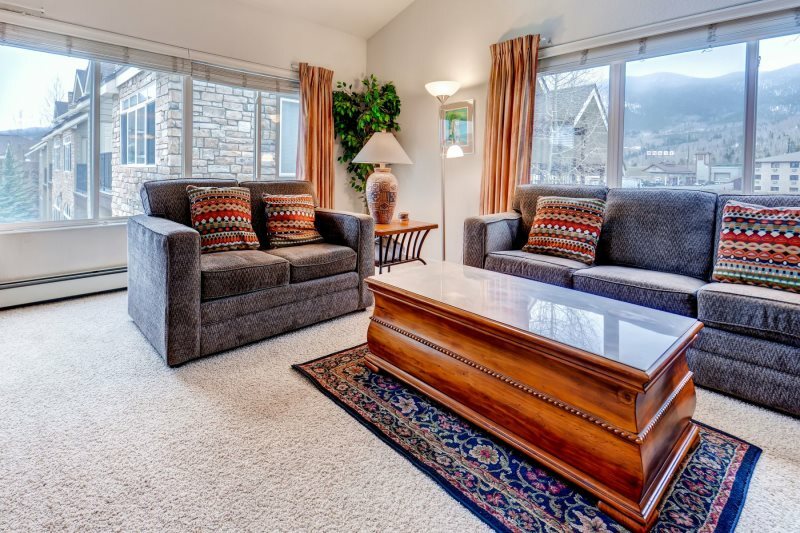 As the name states, you can even bring your furry friend to this mountain retreat! 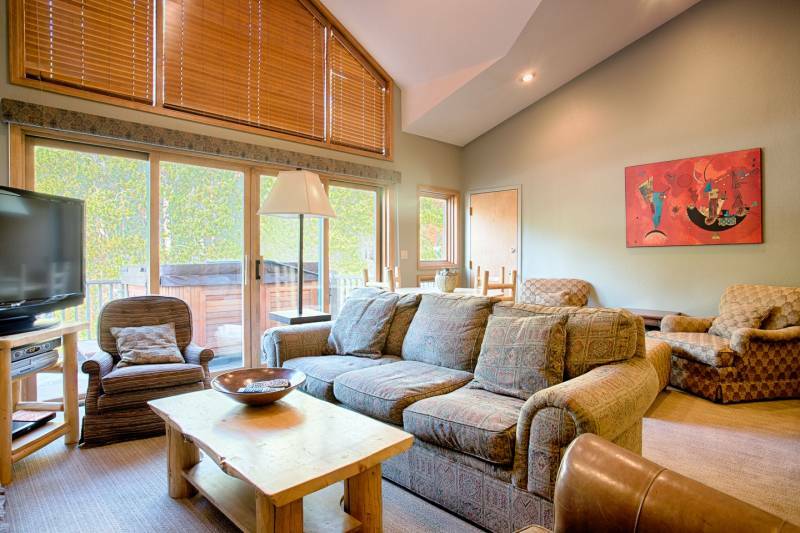 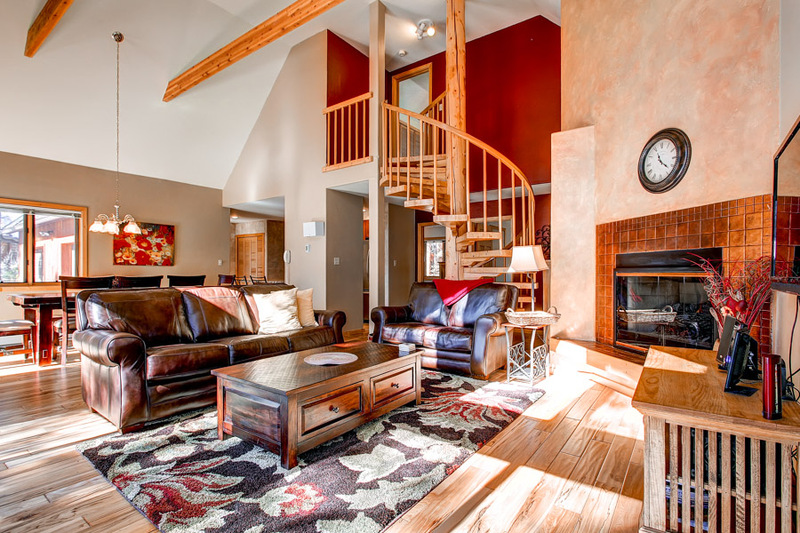 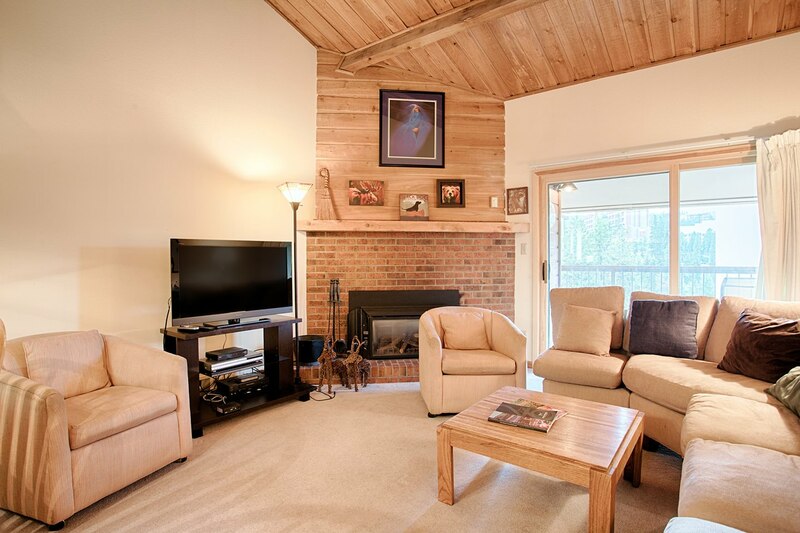 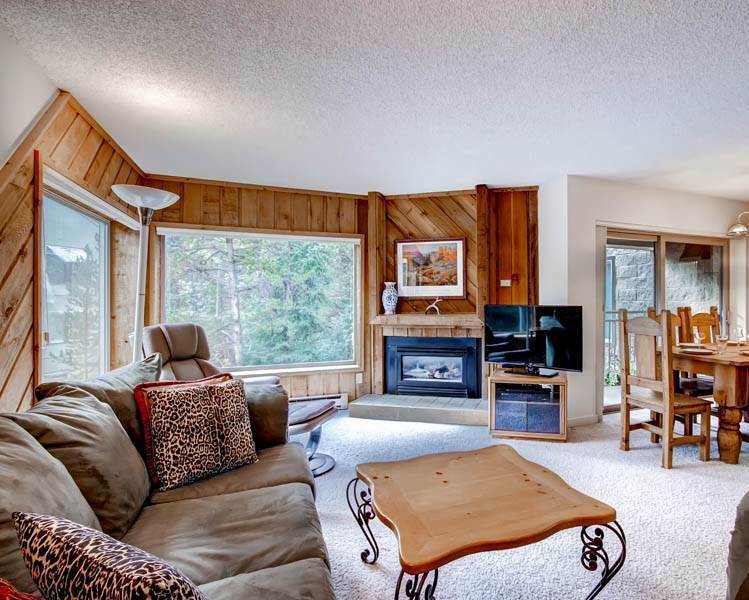 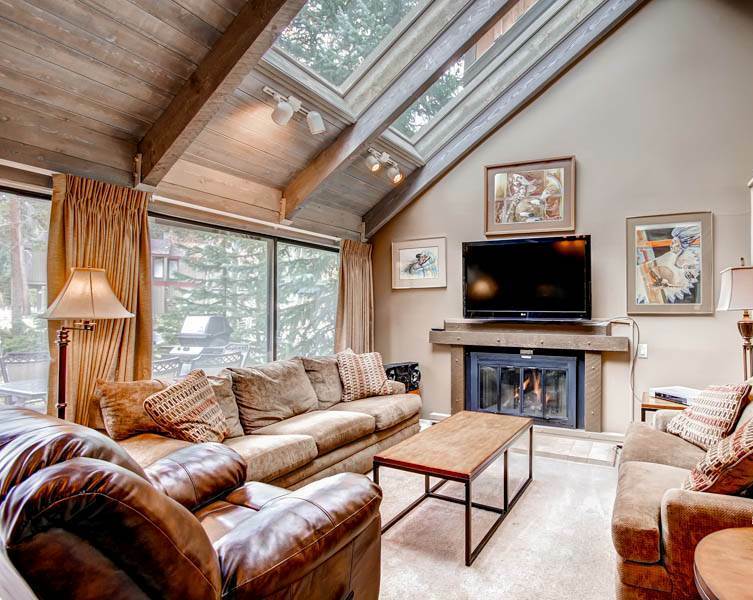 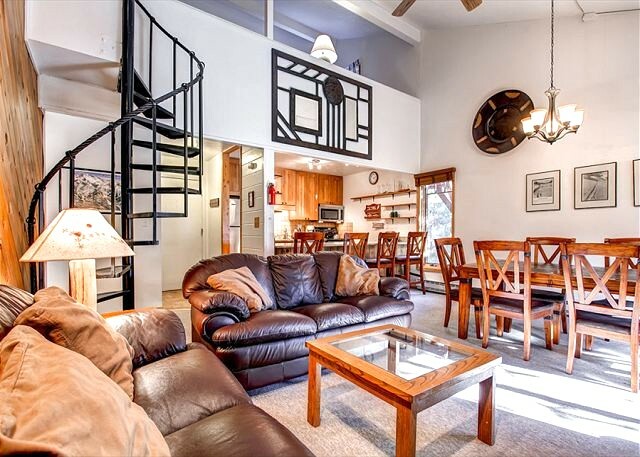 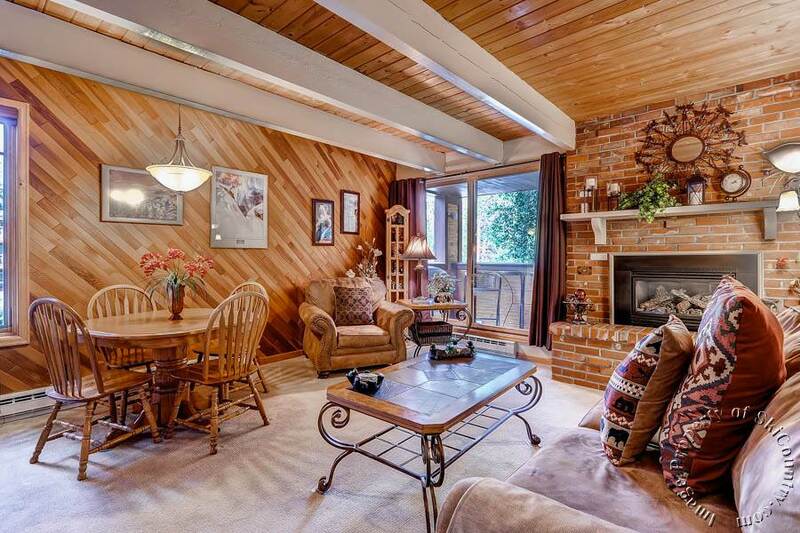 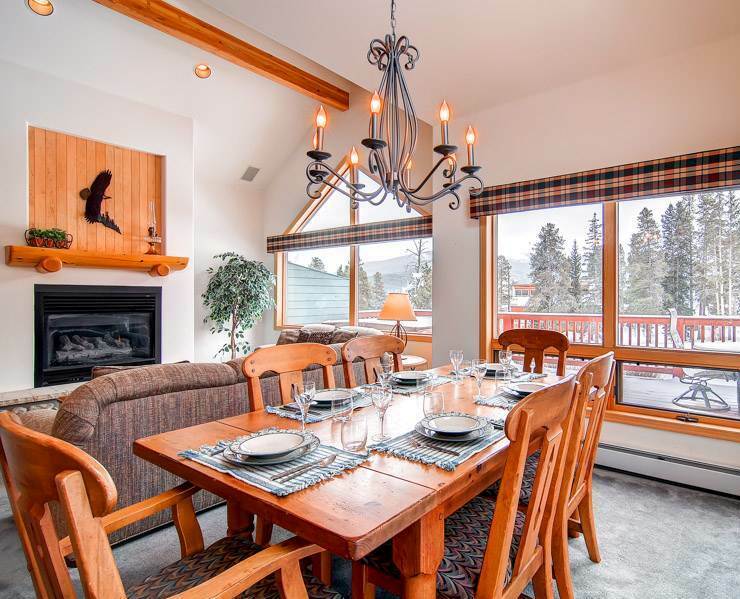 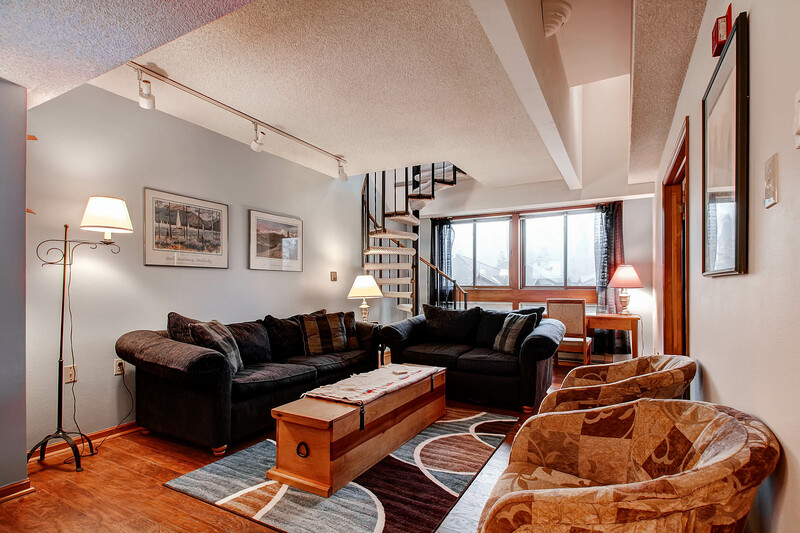 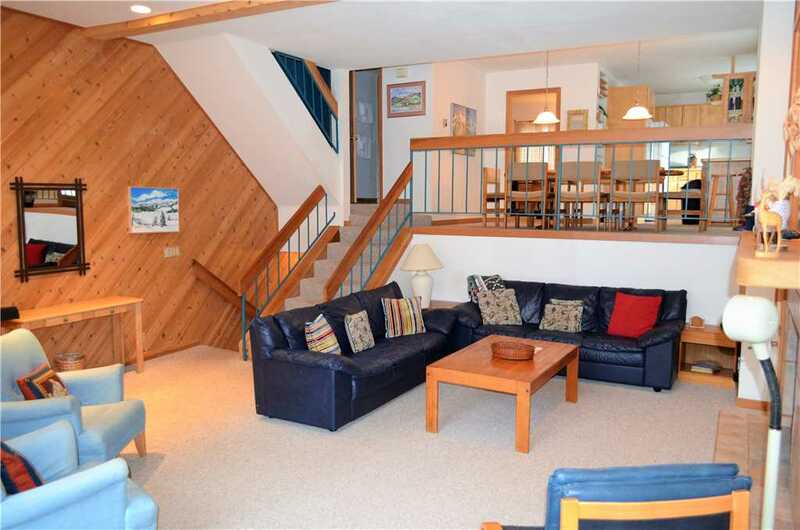 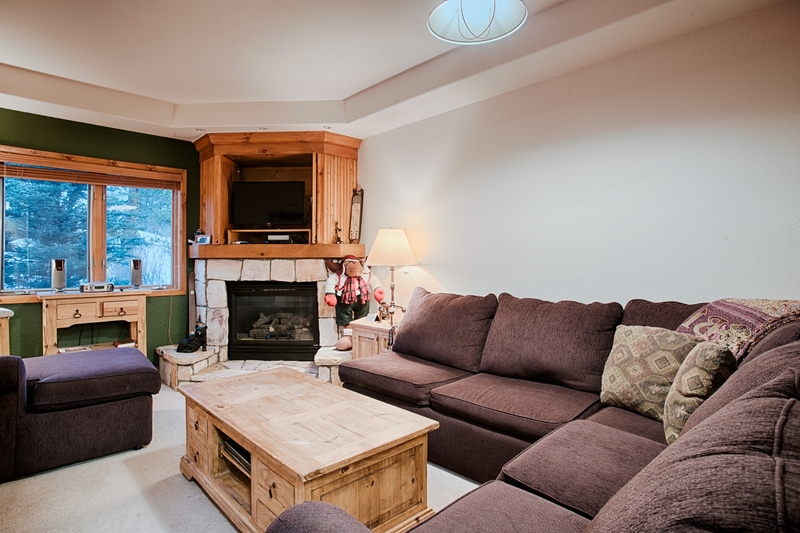 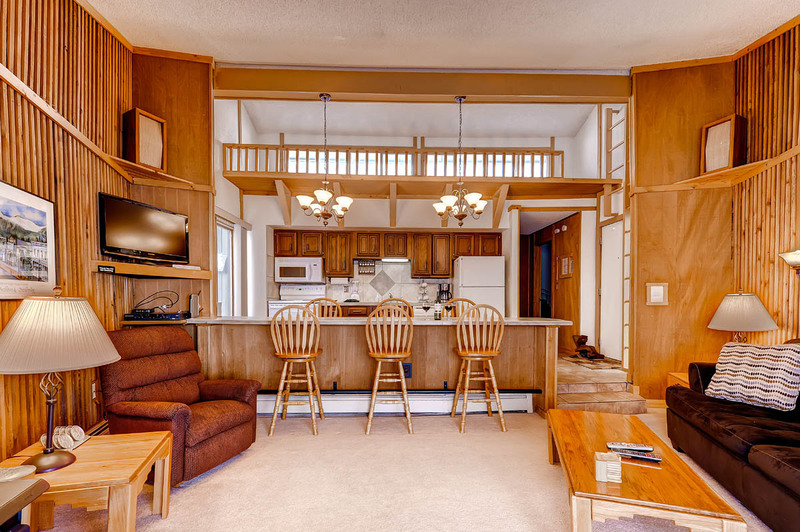 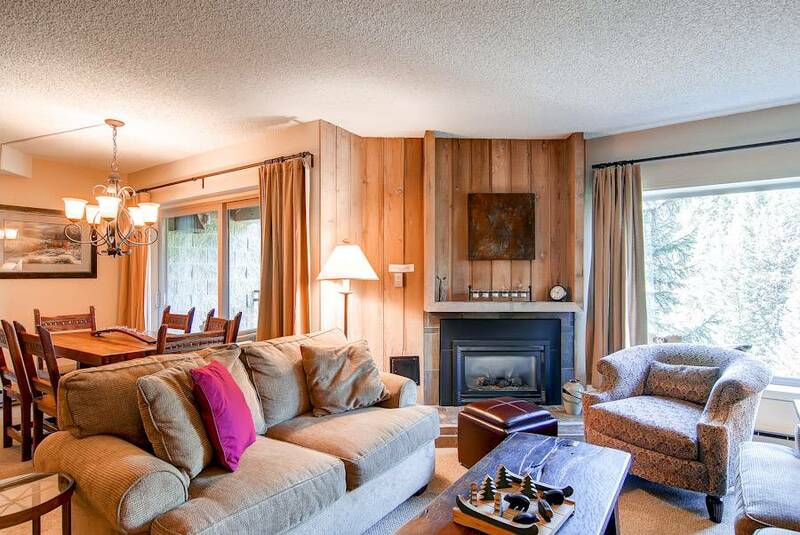 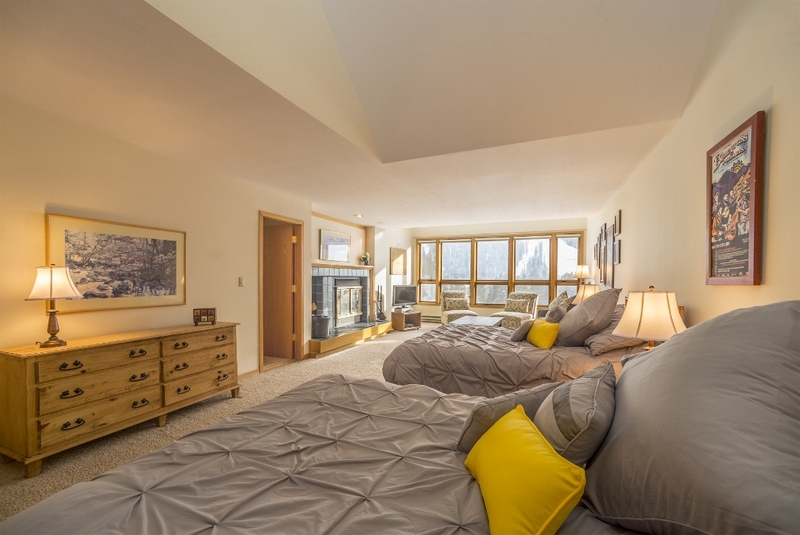 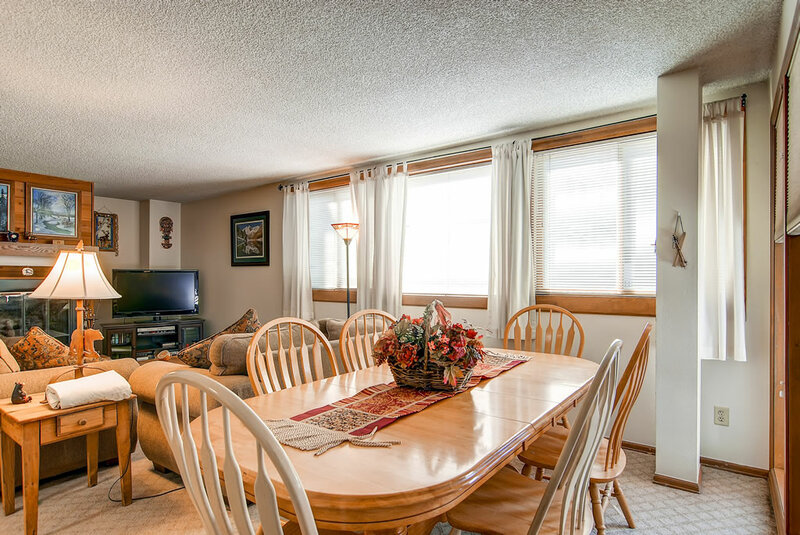 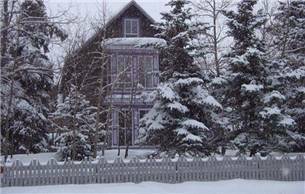 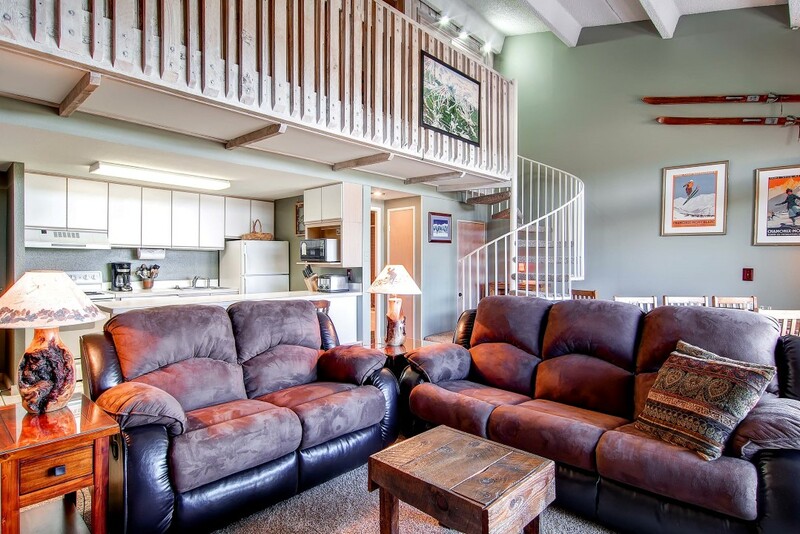 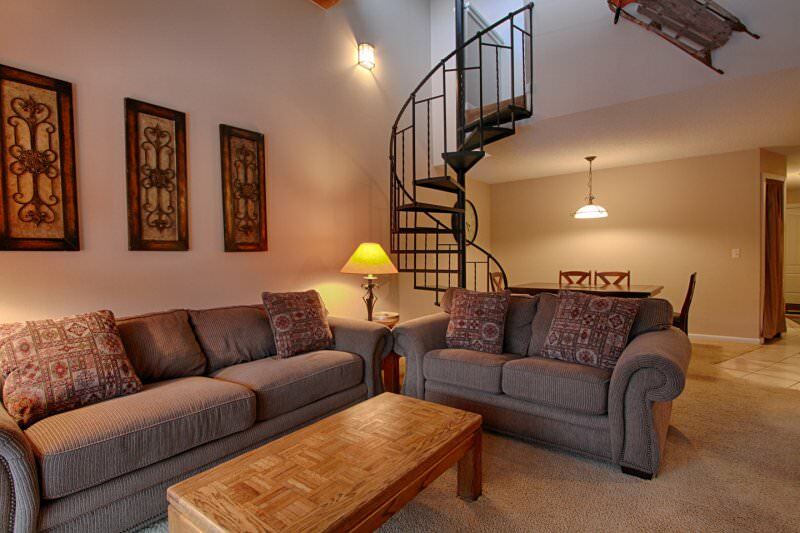 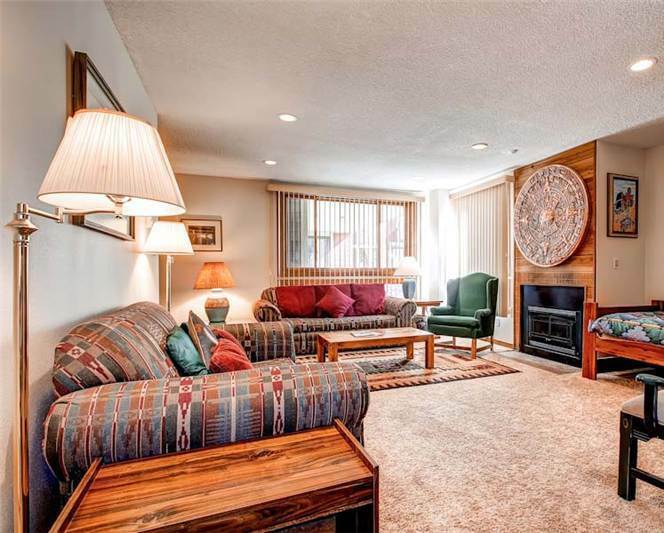 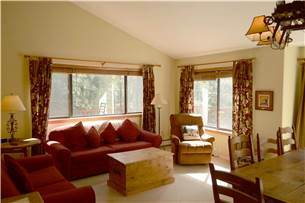 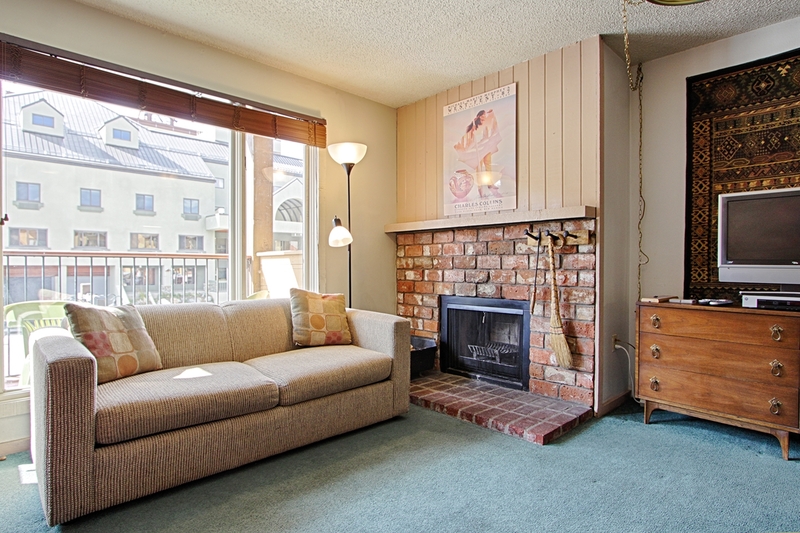 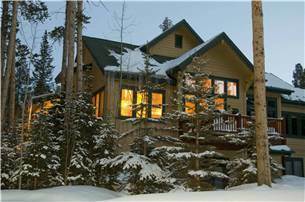 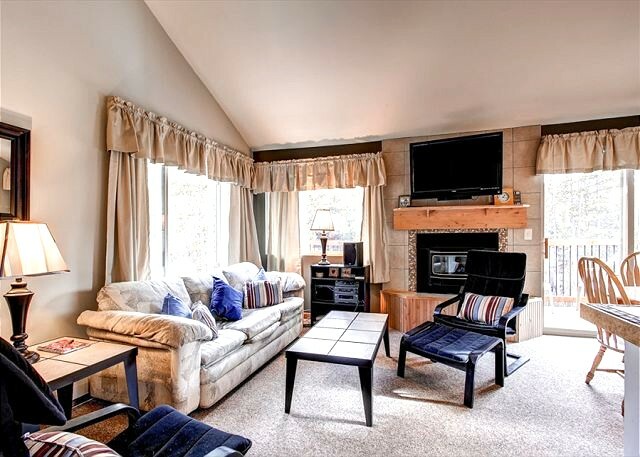 This 3-bedroom, 2-bathroom moderate home is the perfect retreat for families or groups of up to 8 people. 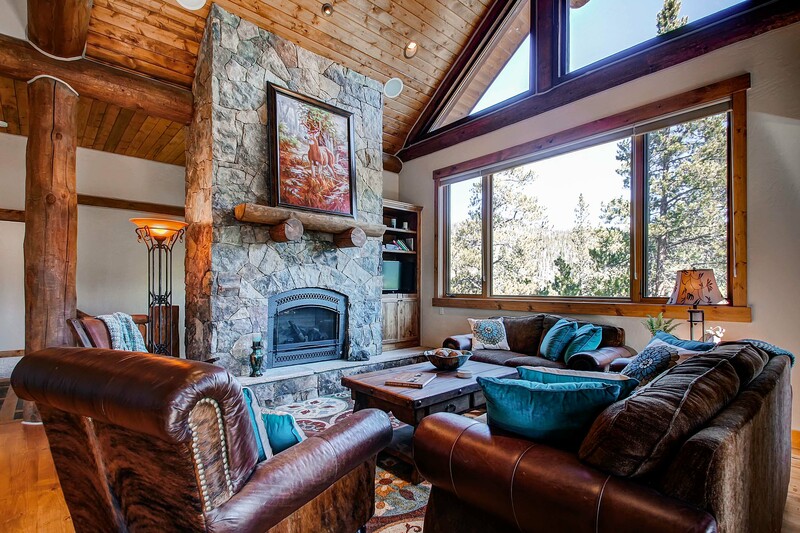 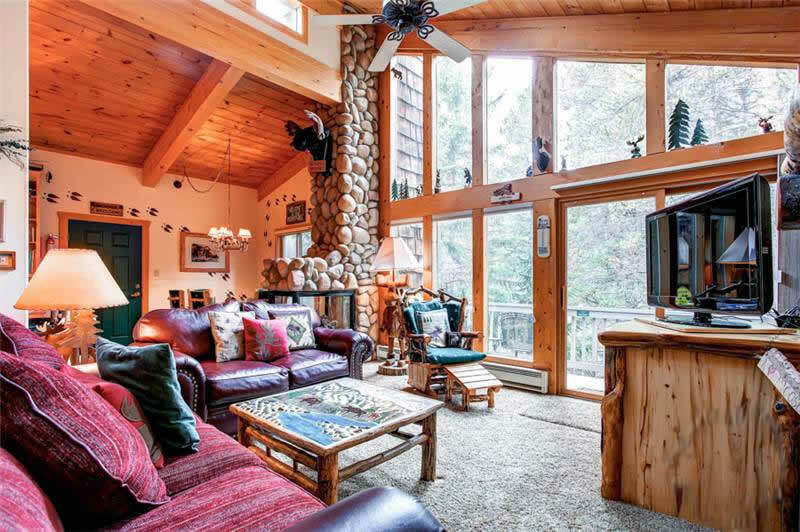 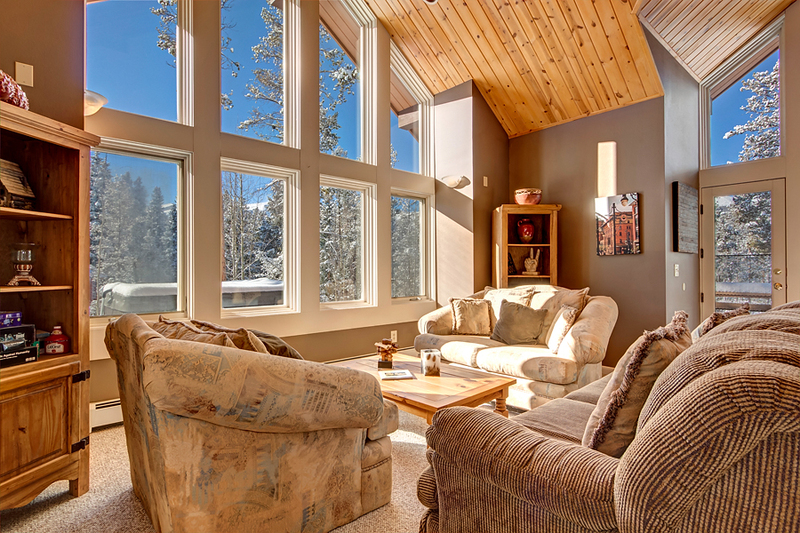 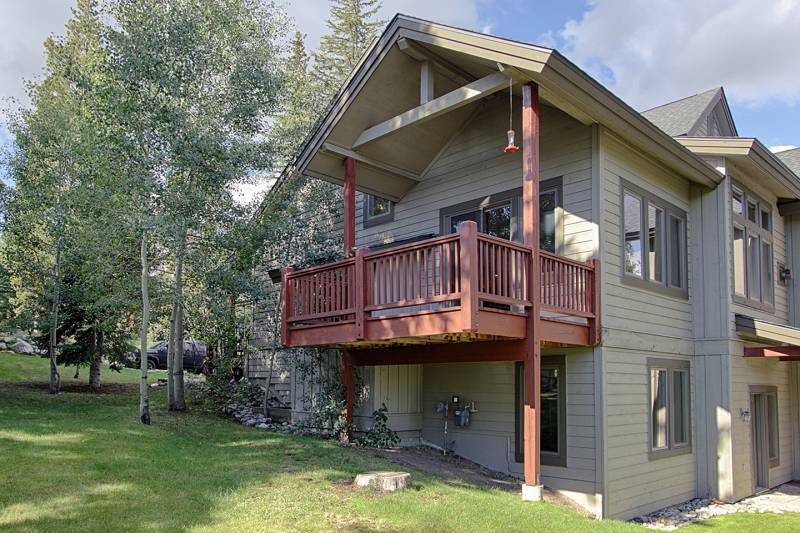 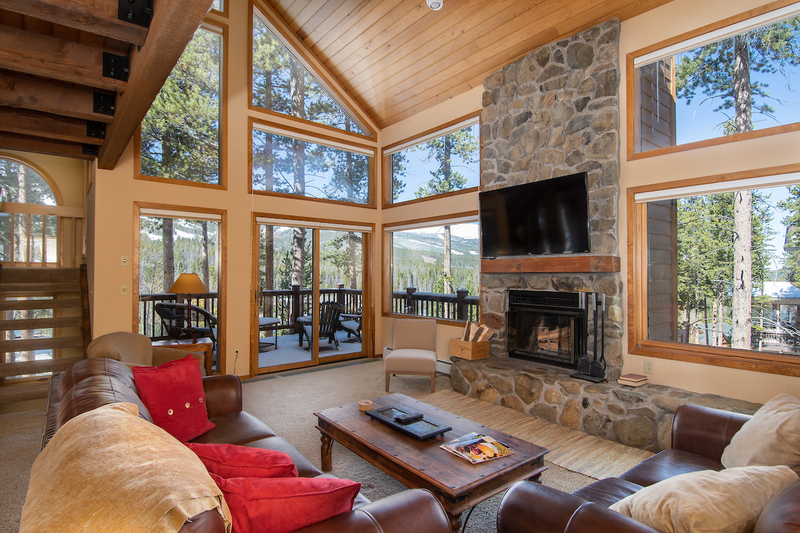 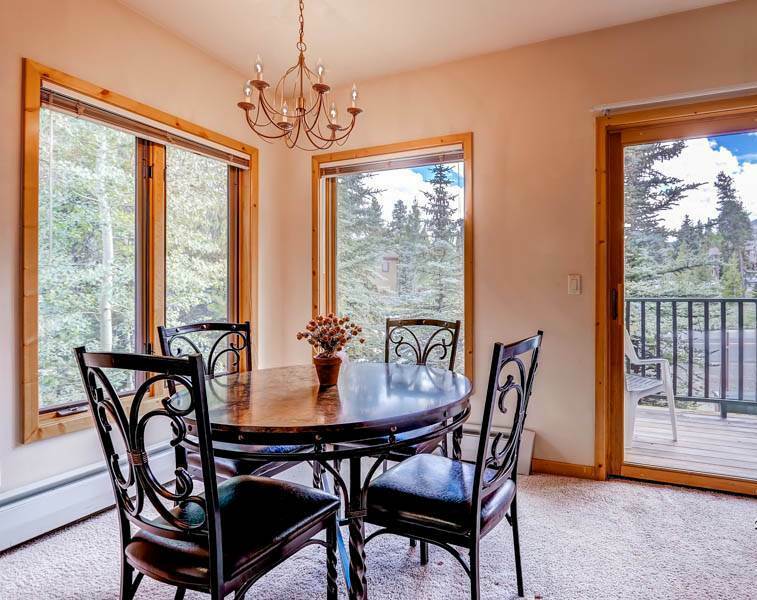 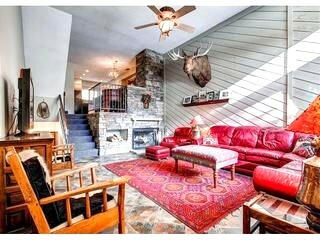 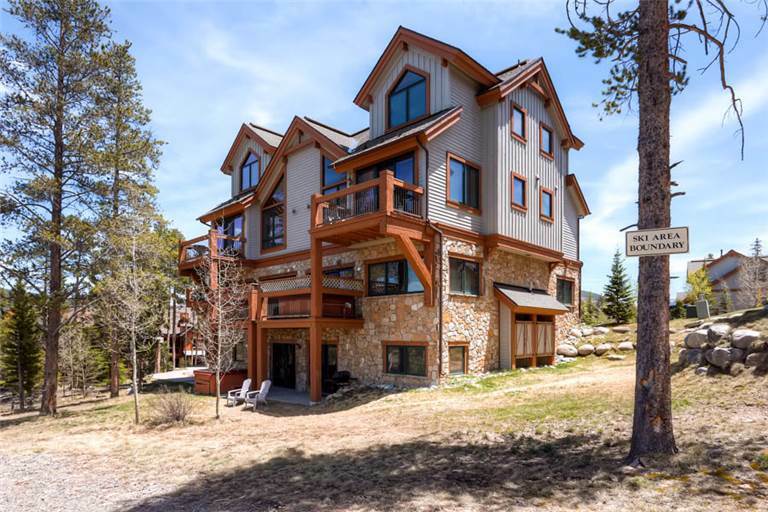 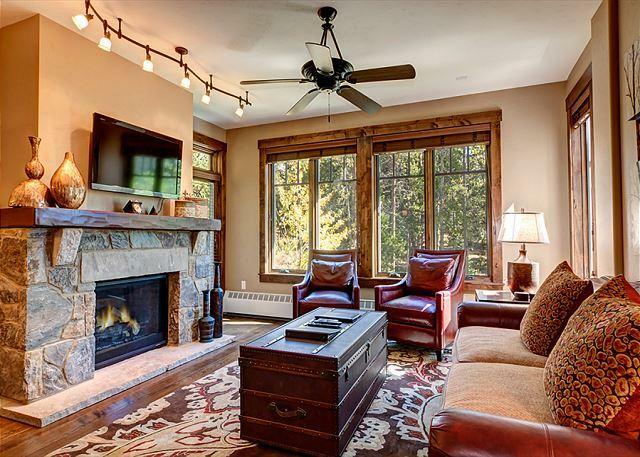 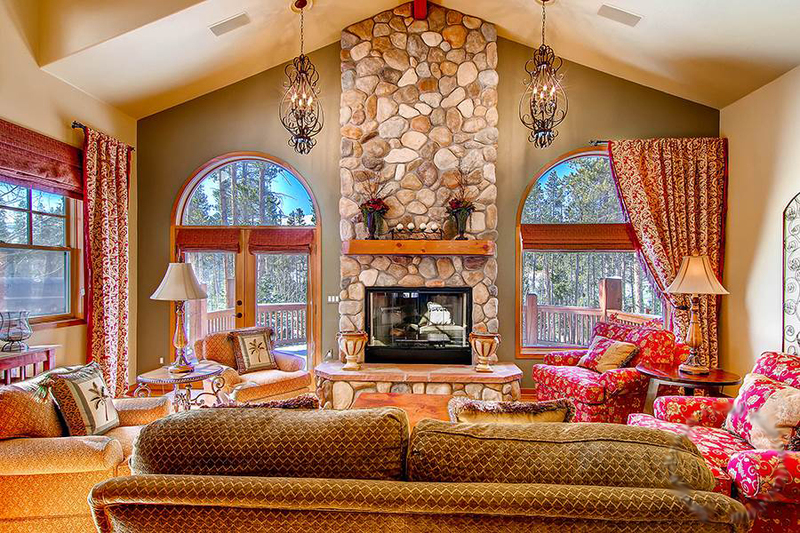 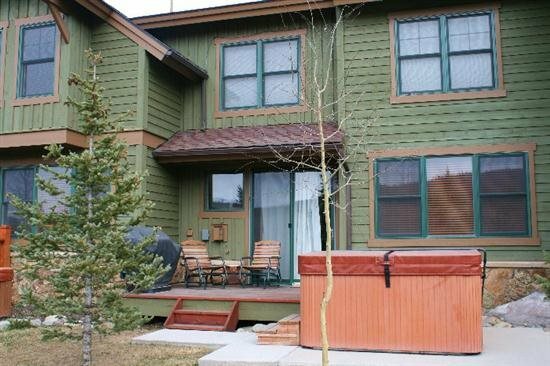 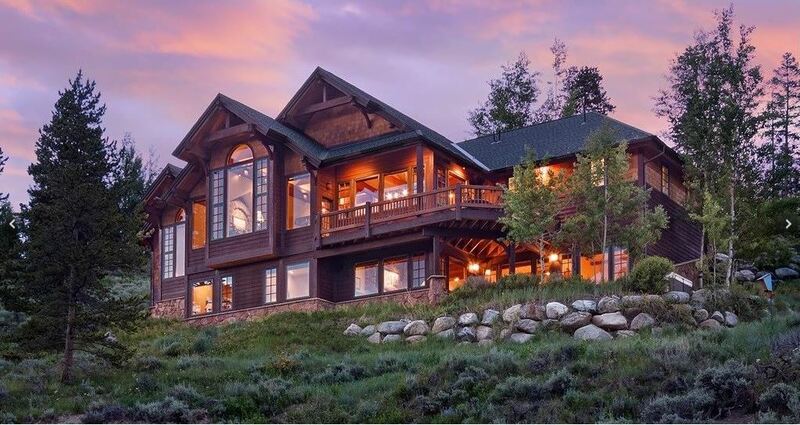 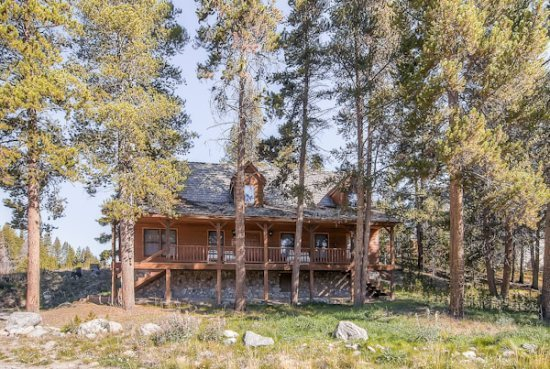 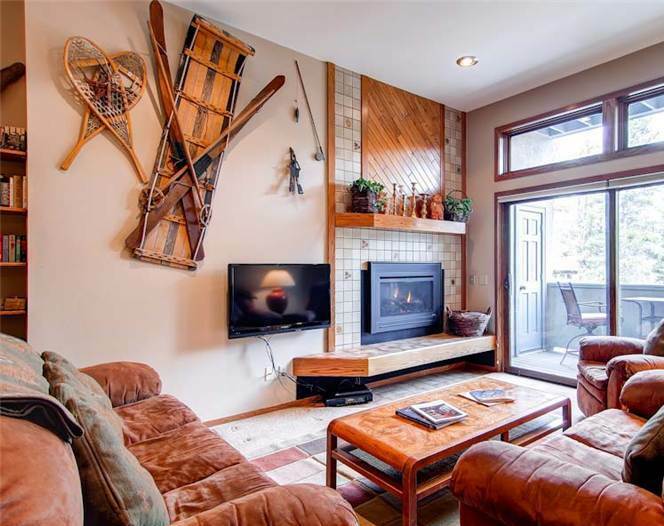 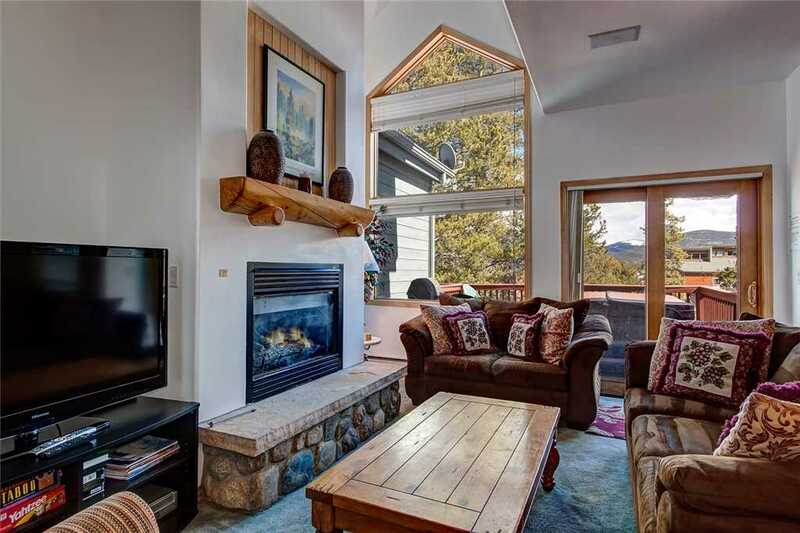 You’ll love the secluded feel of being in the woods, but yet being able to step onto the deck to see the beautiful Rocky Mountains. 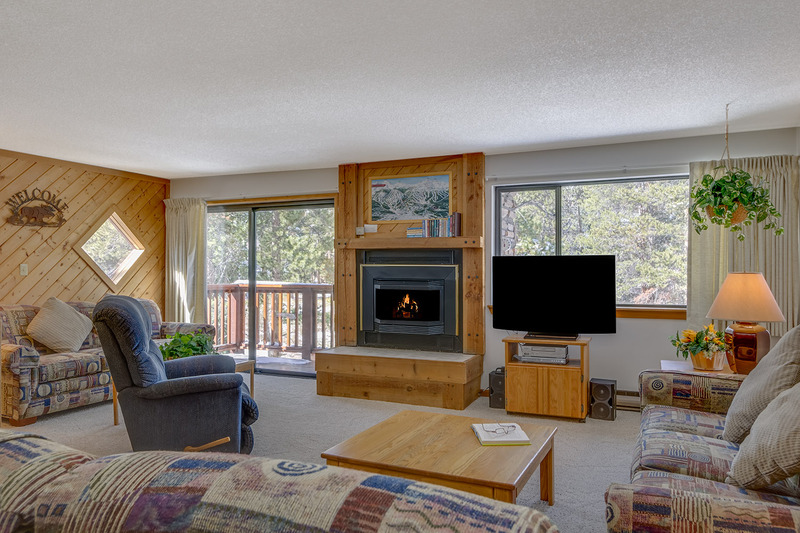 The lower level deck is also equipped with a gas grill to have a nice BBQ for your group while taking in the mountain air. 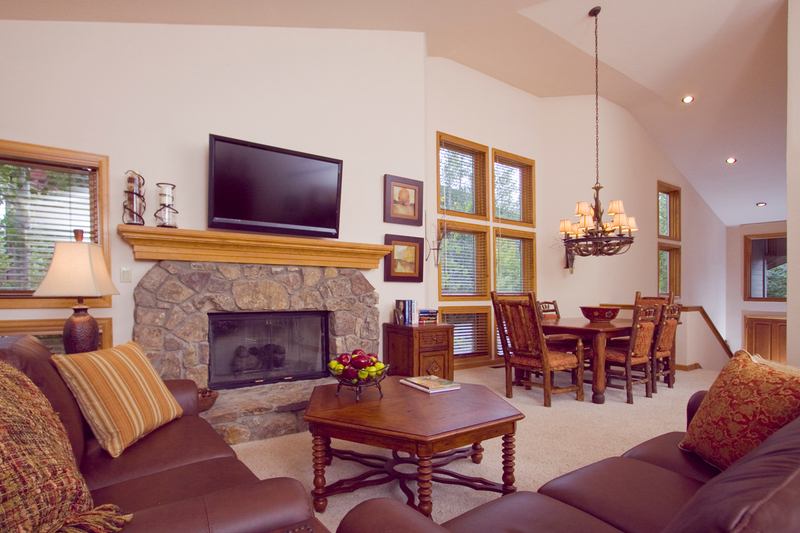 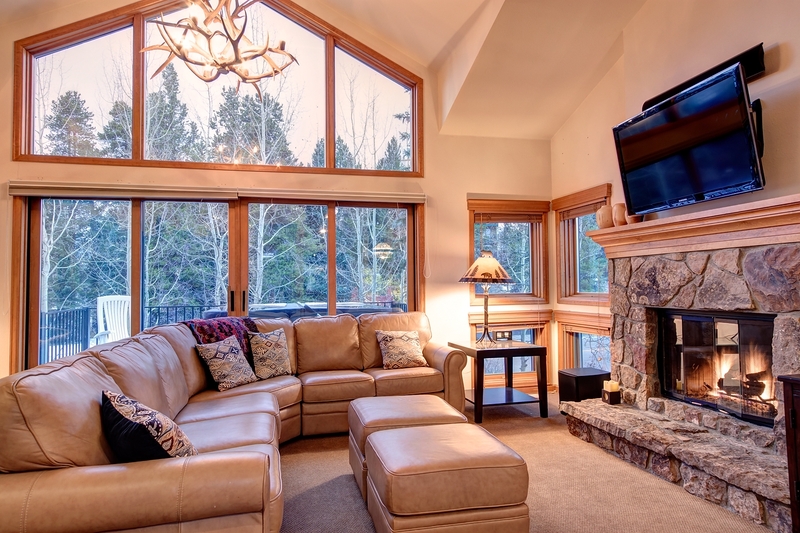 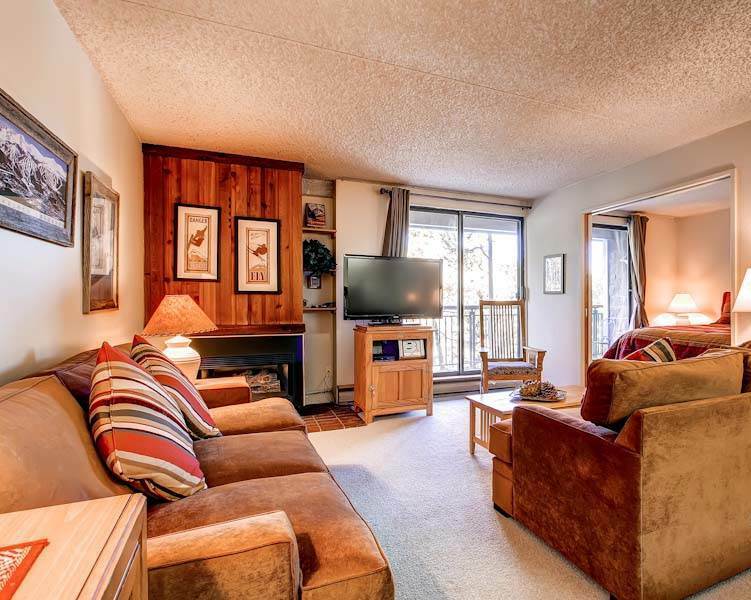 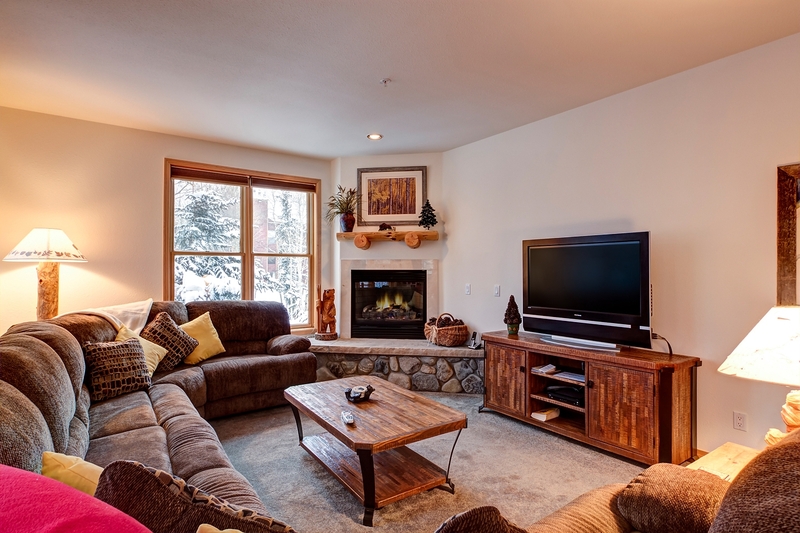 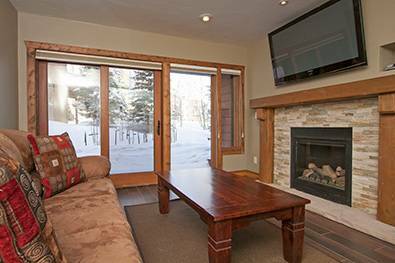 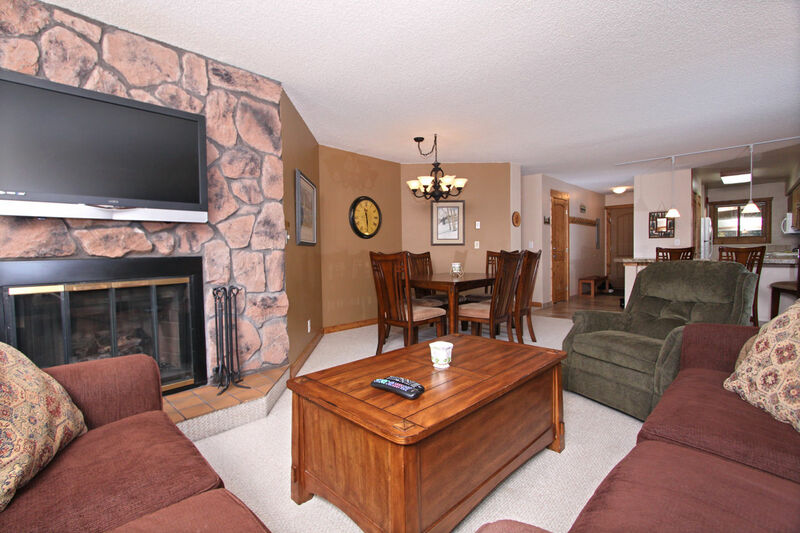 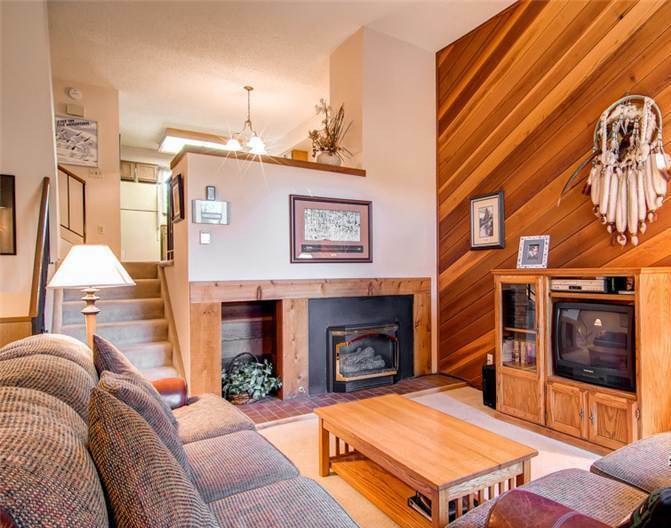 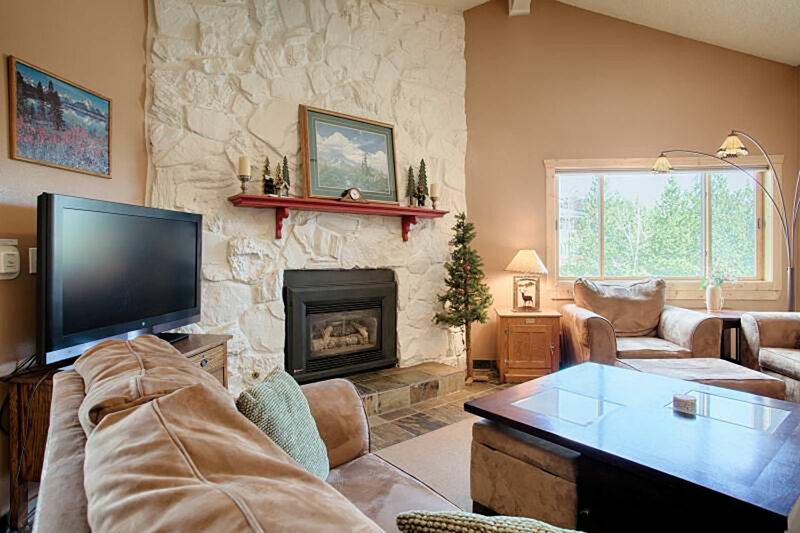 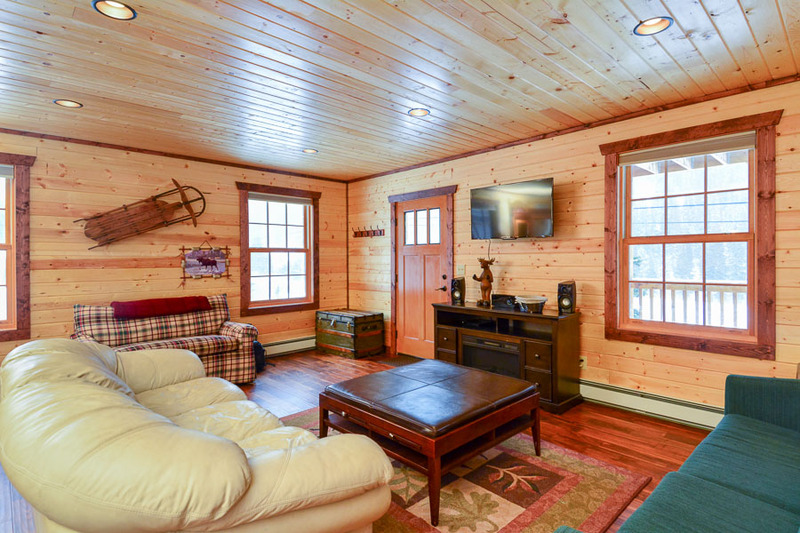 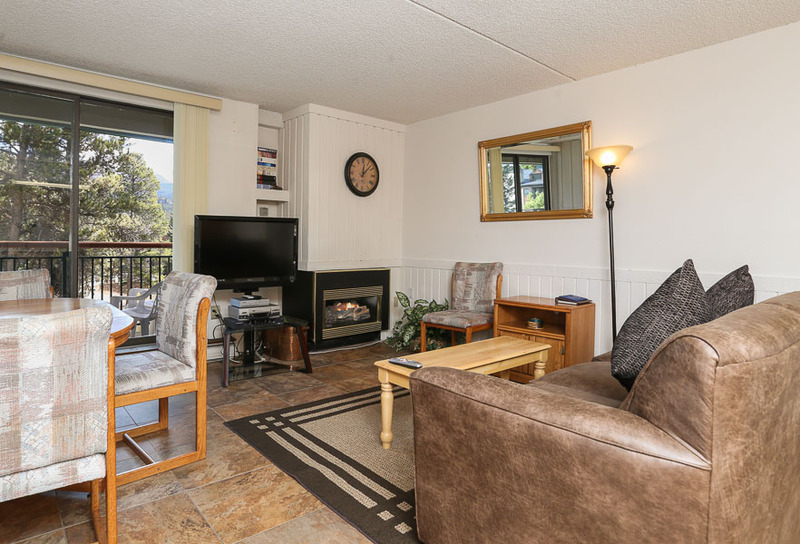 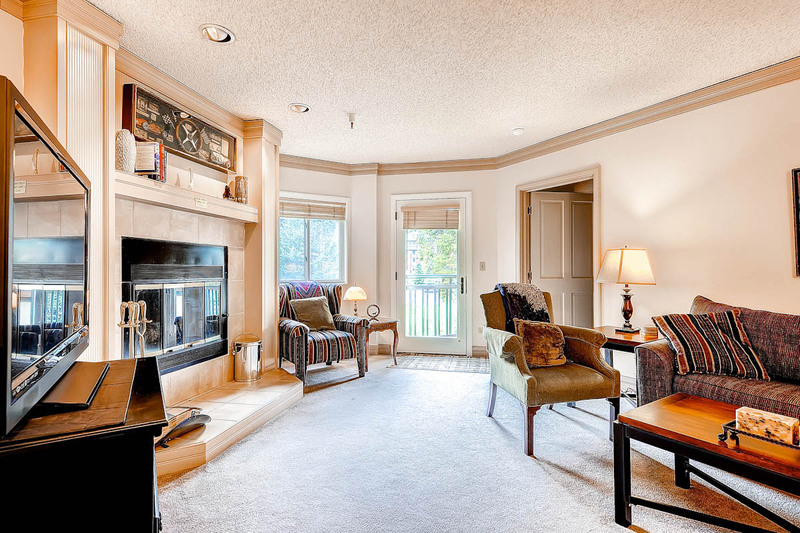 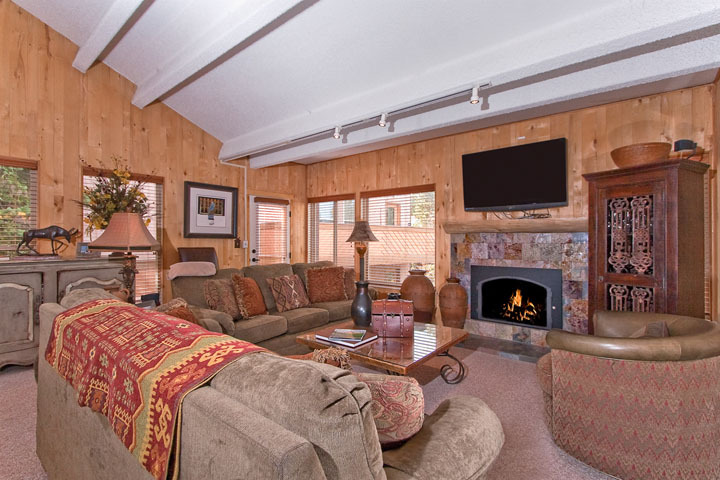 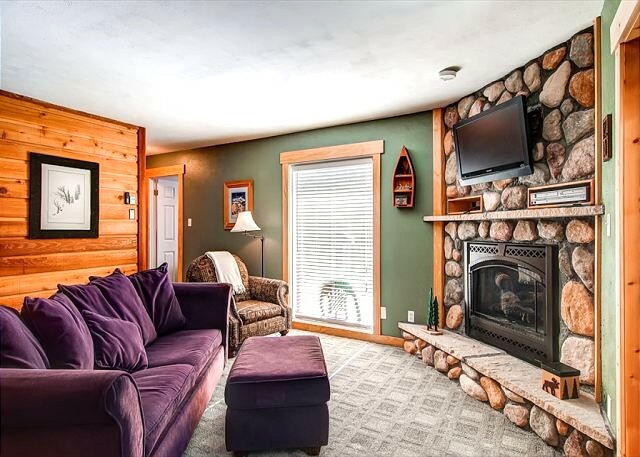 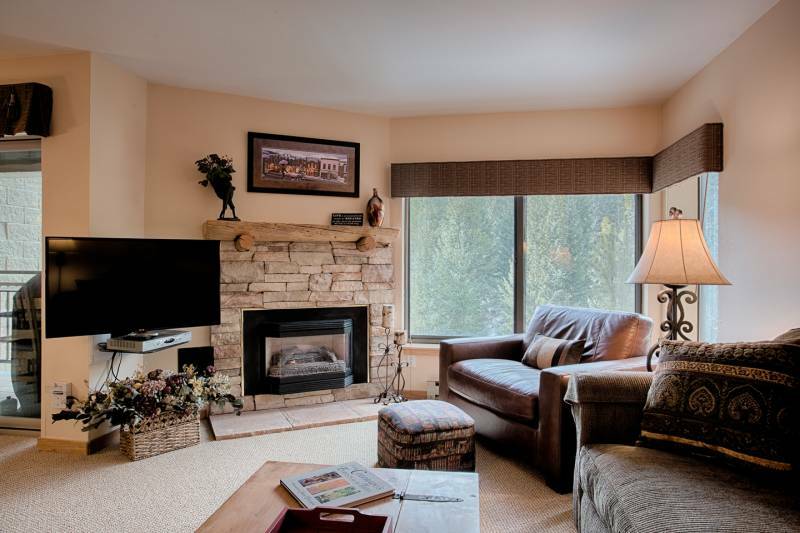 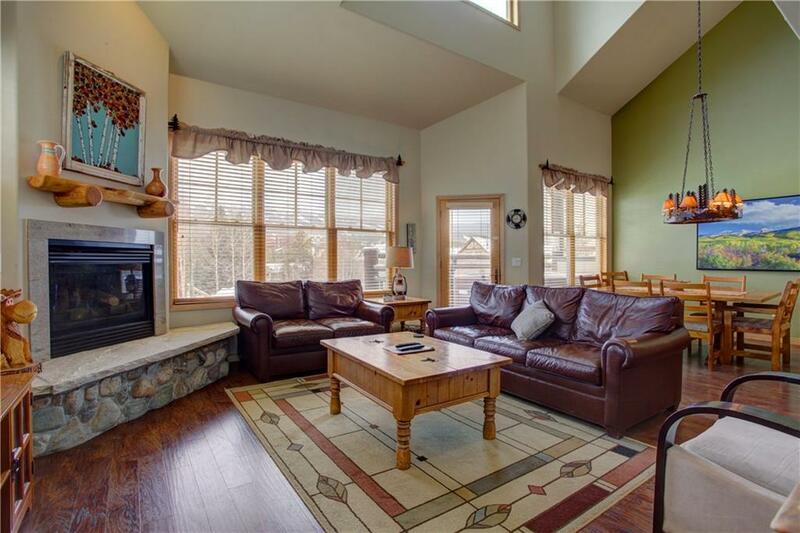 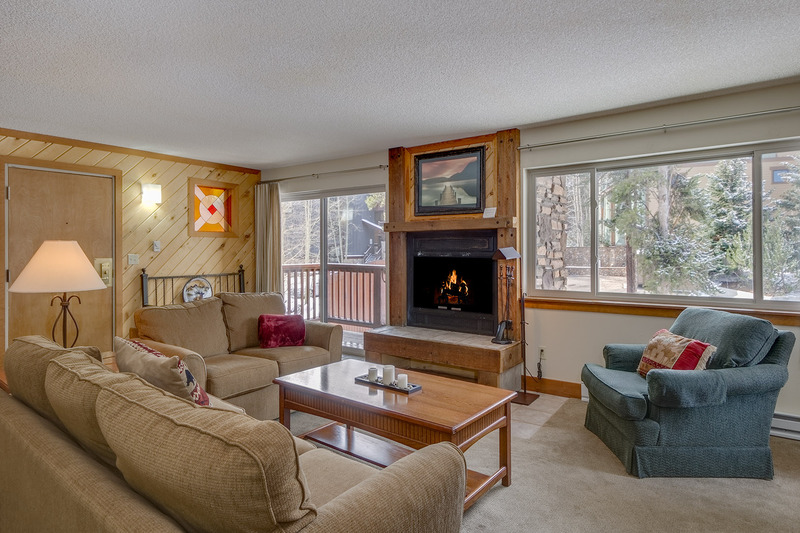 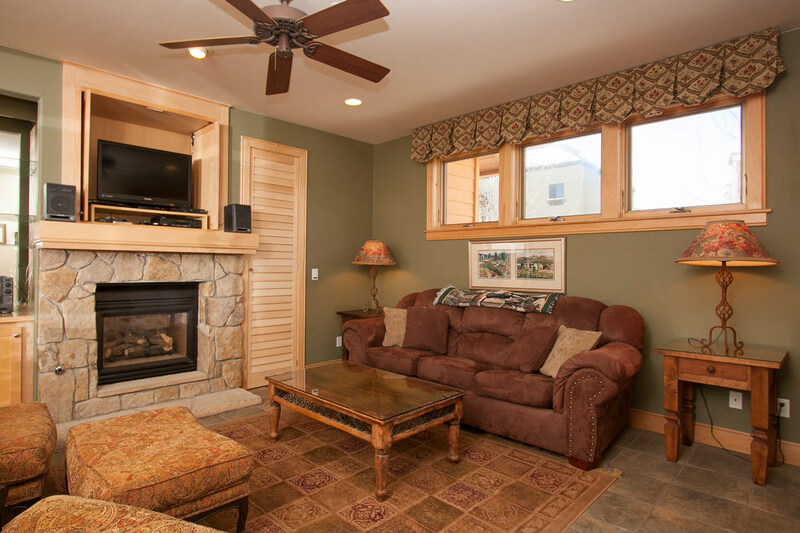 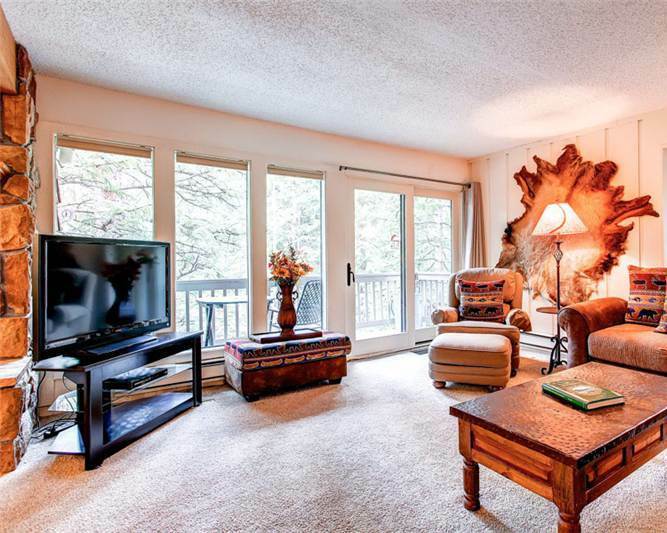 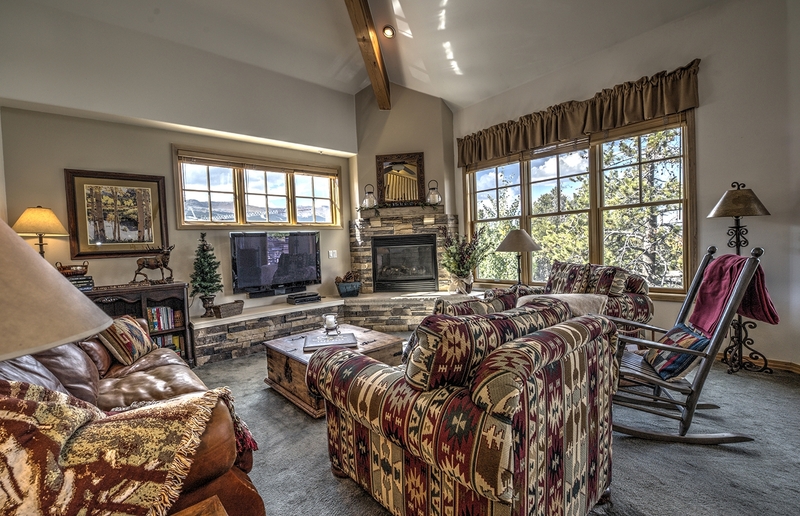 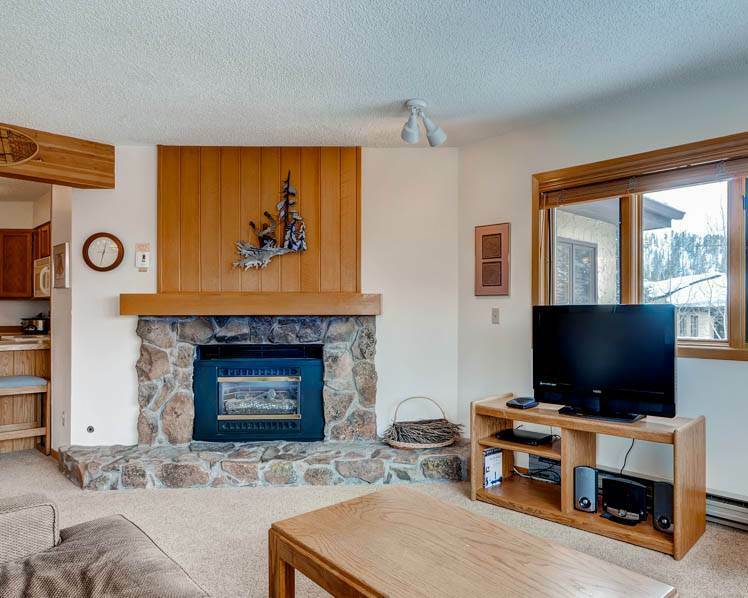 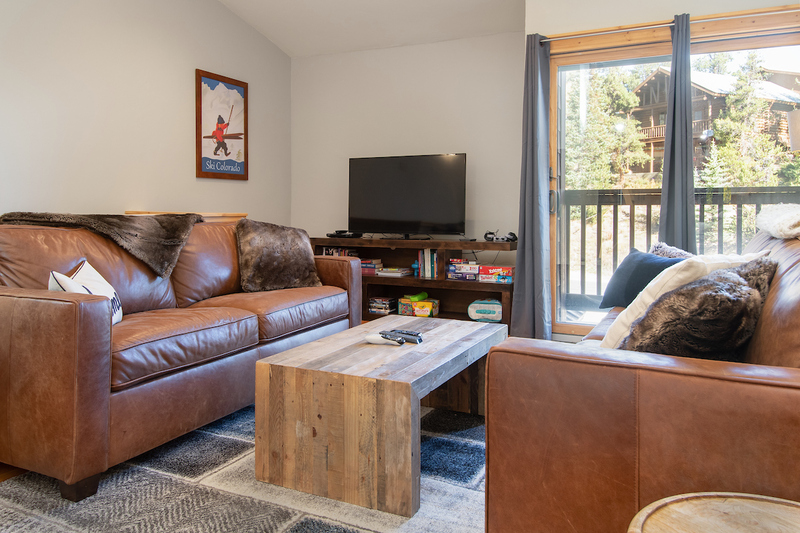 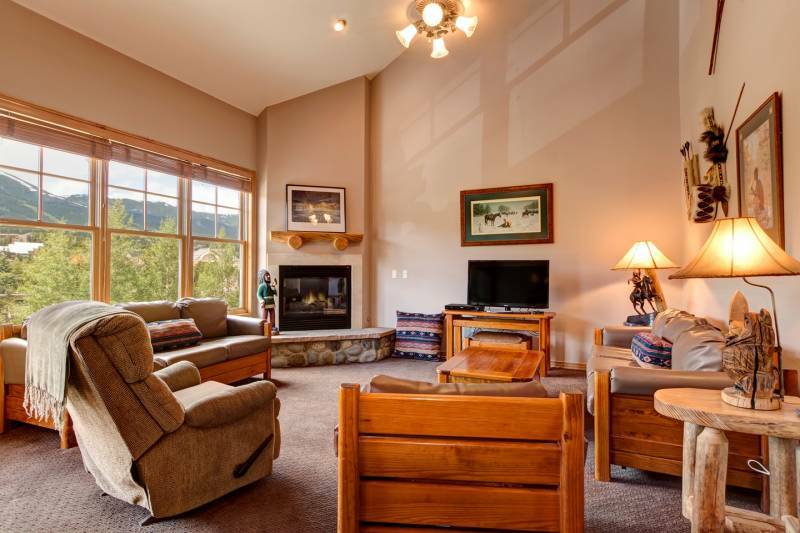 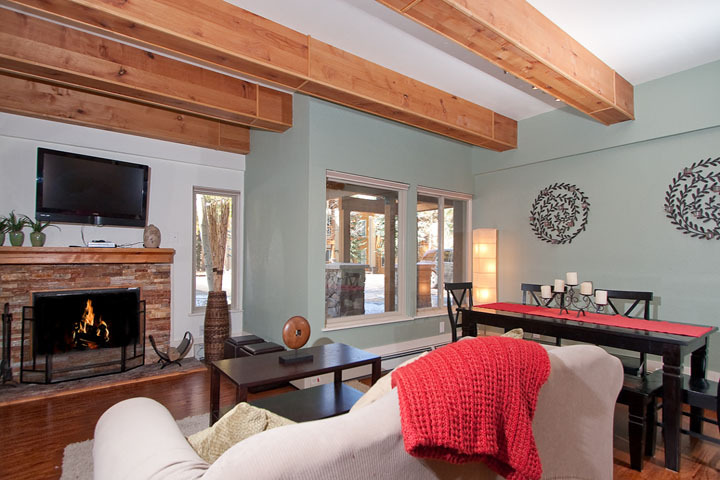 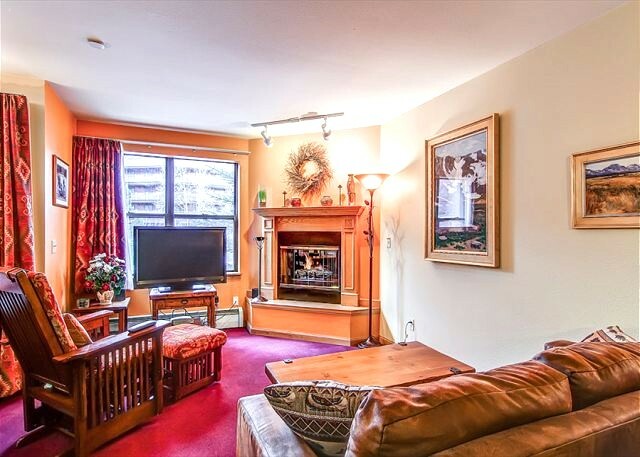 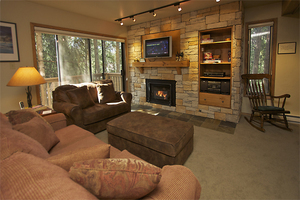 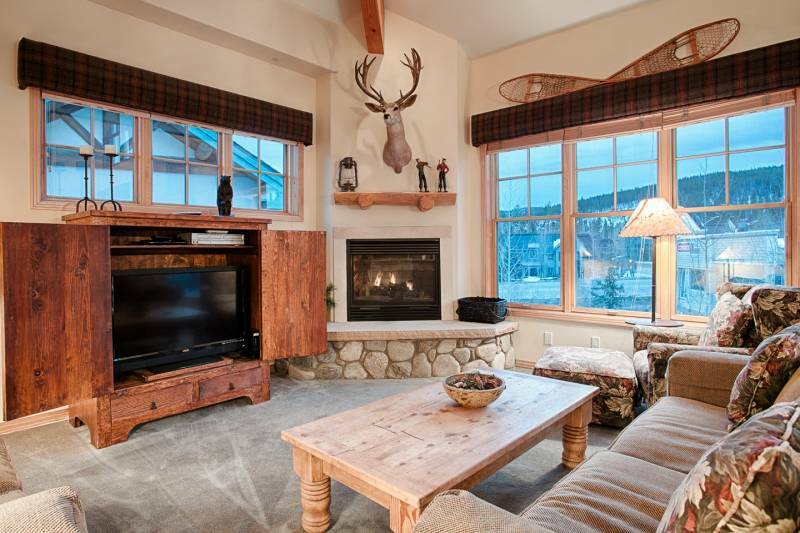 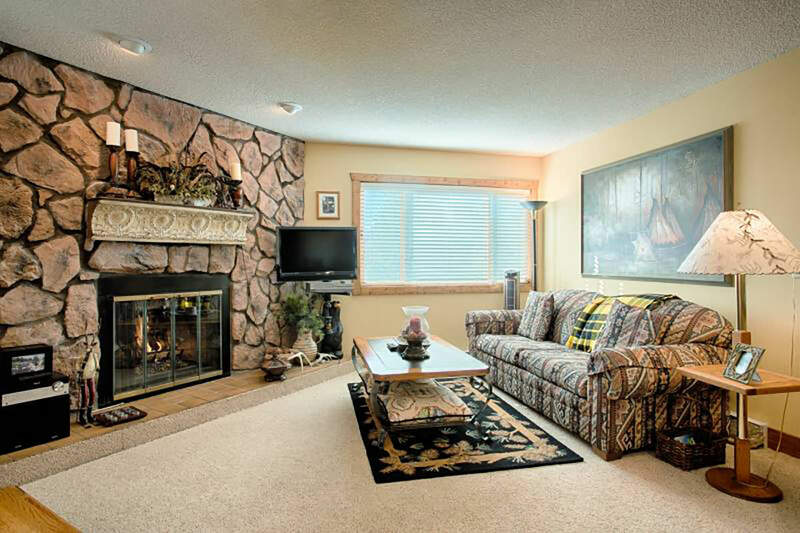 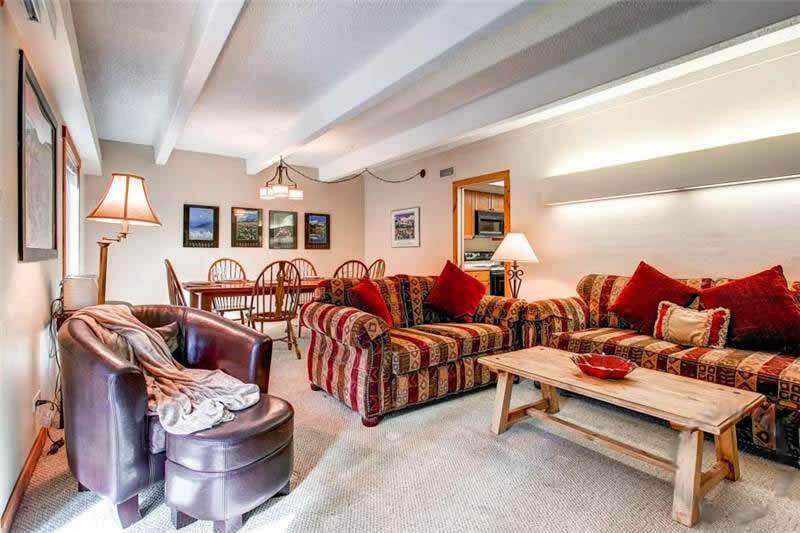 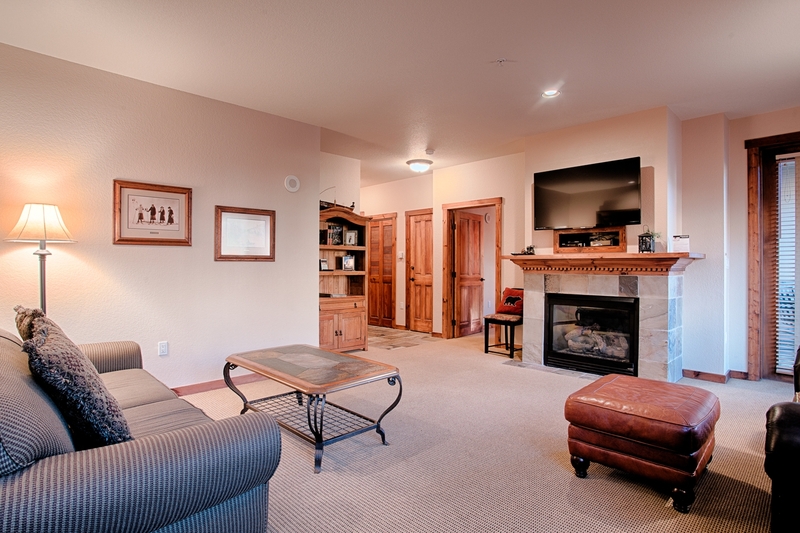 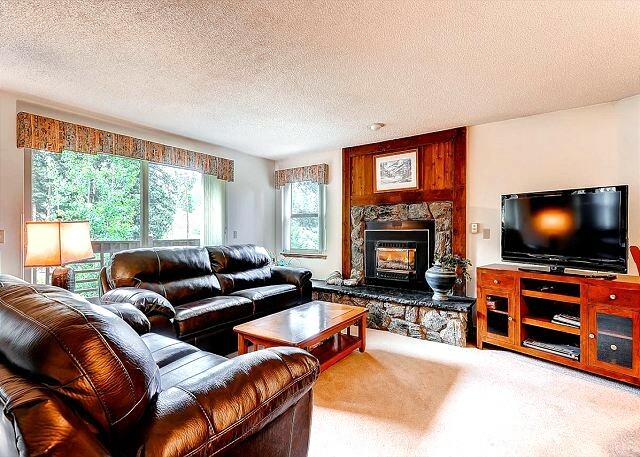 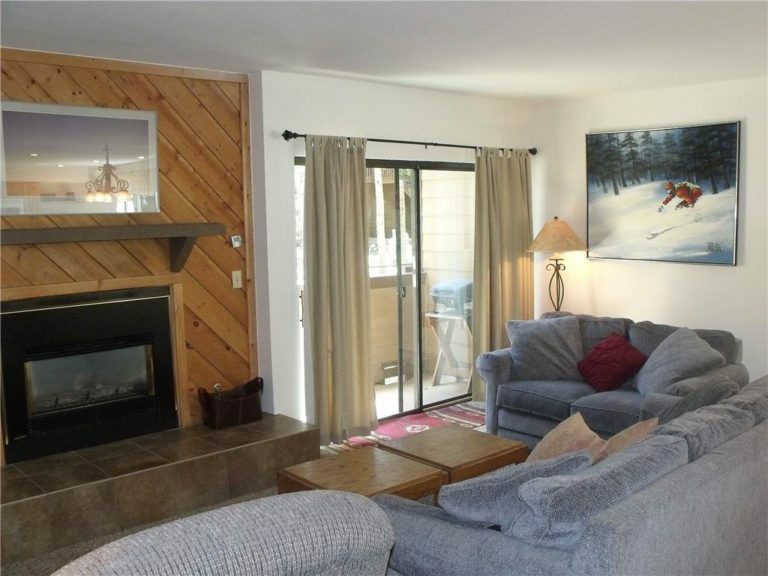 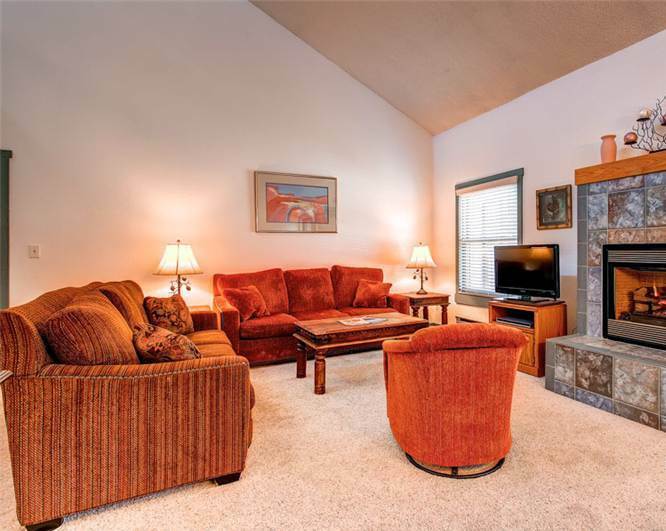 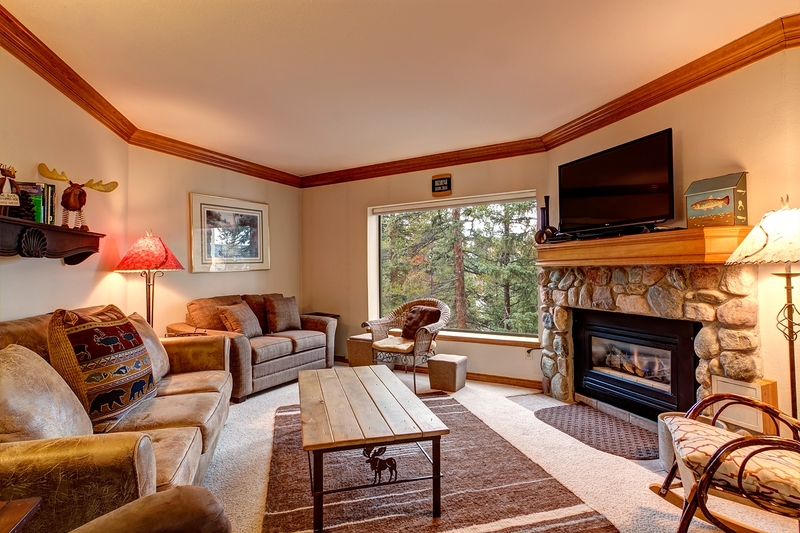 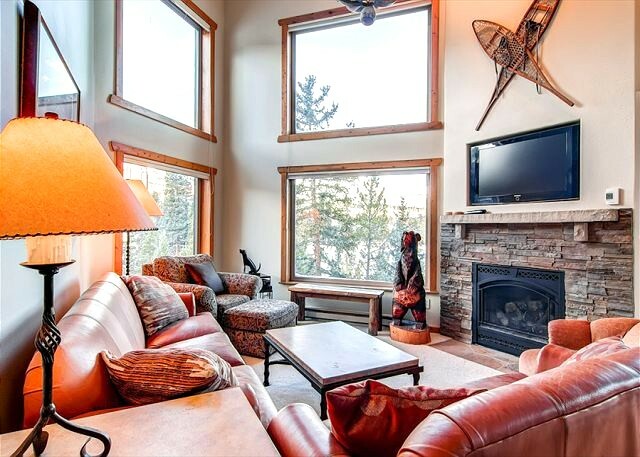 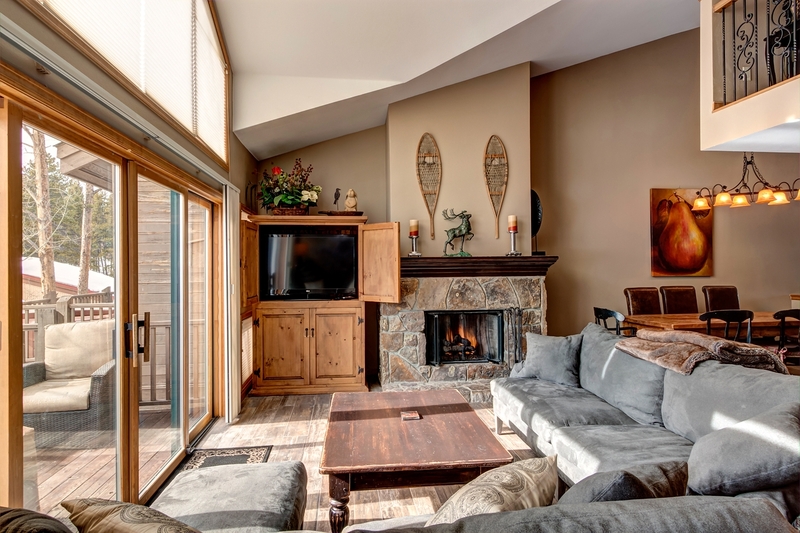 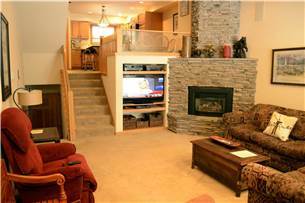 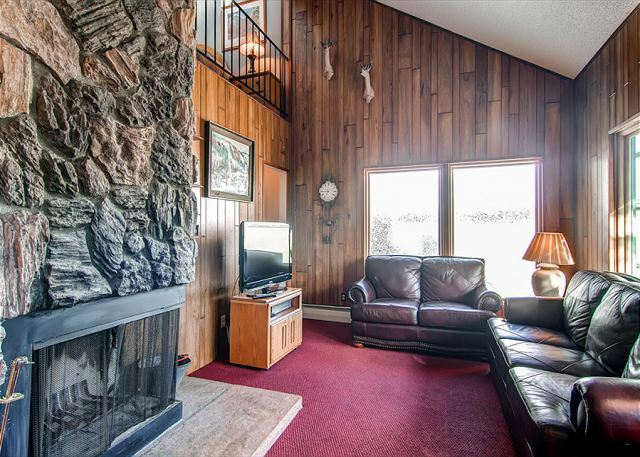 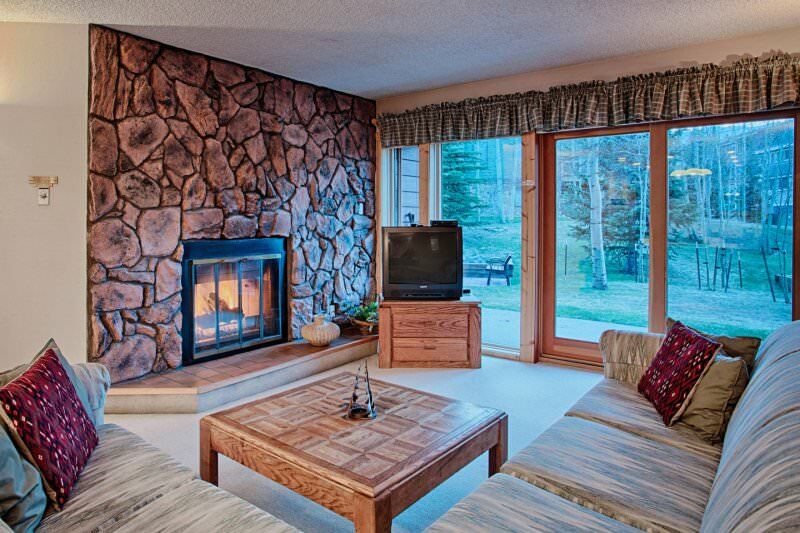 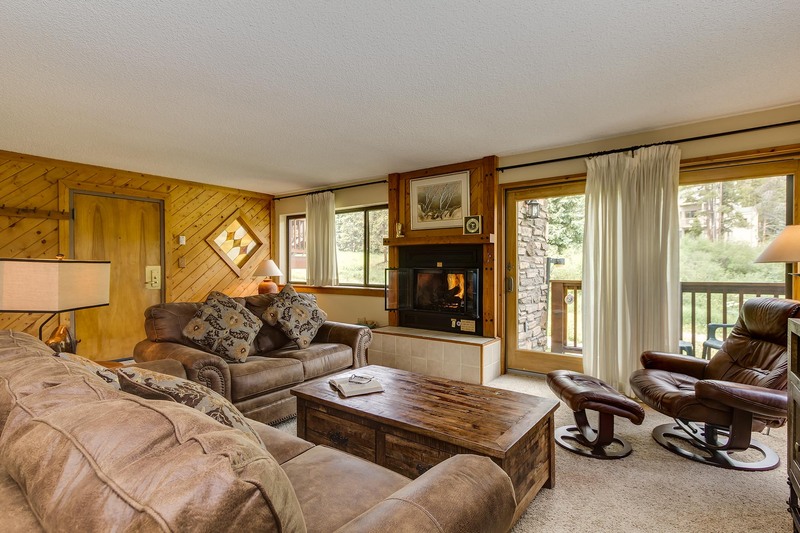 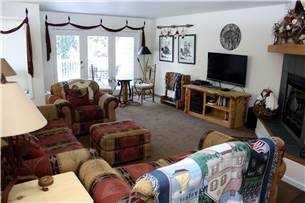 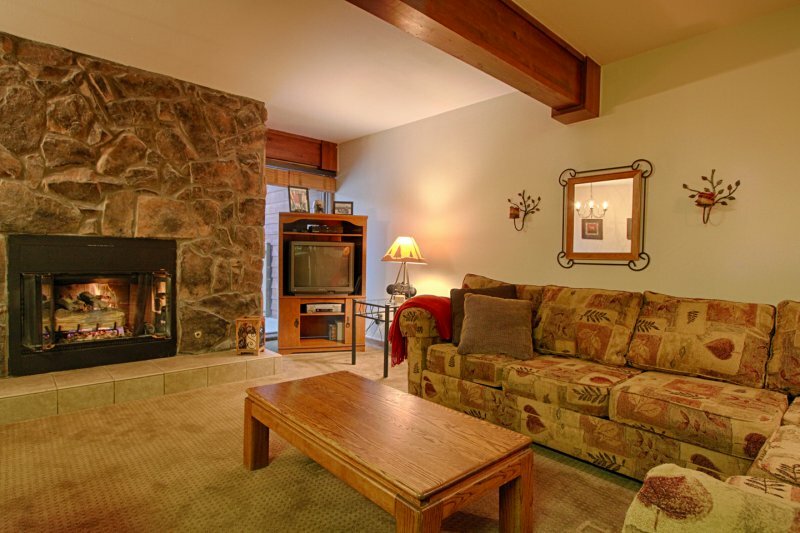 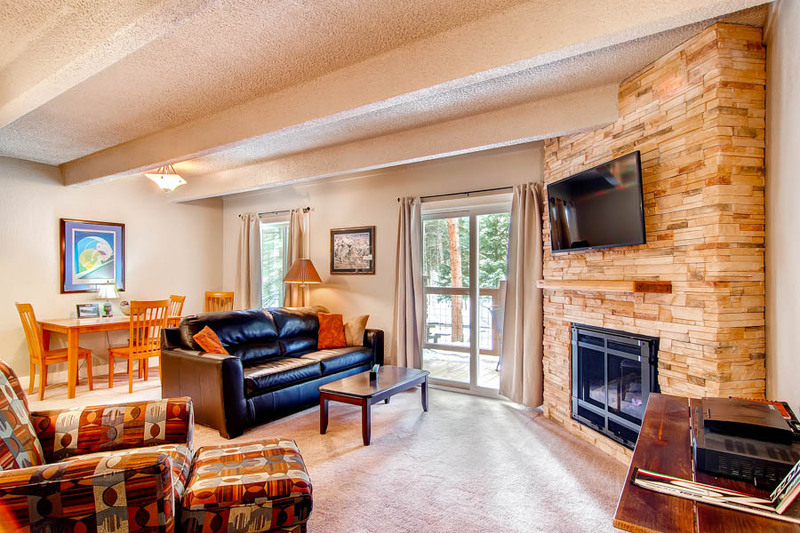 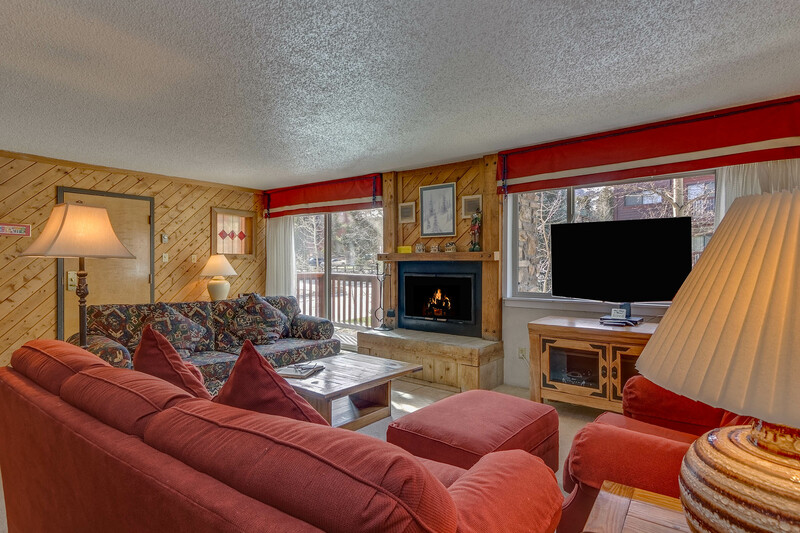 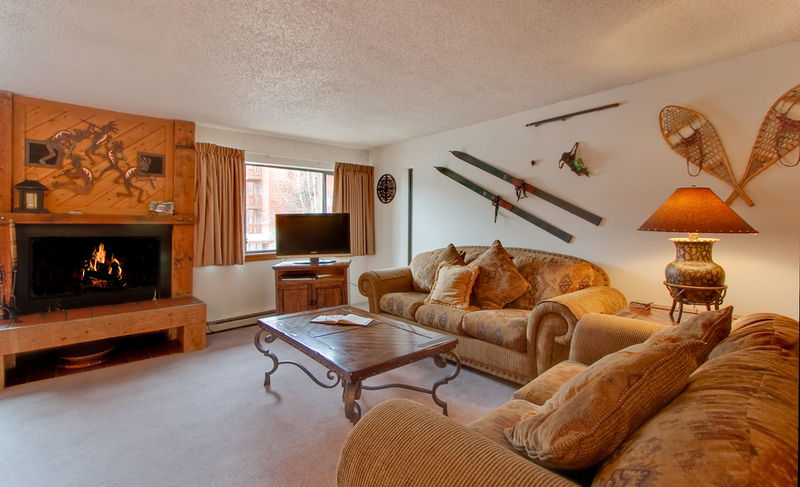 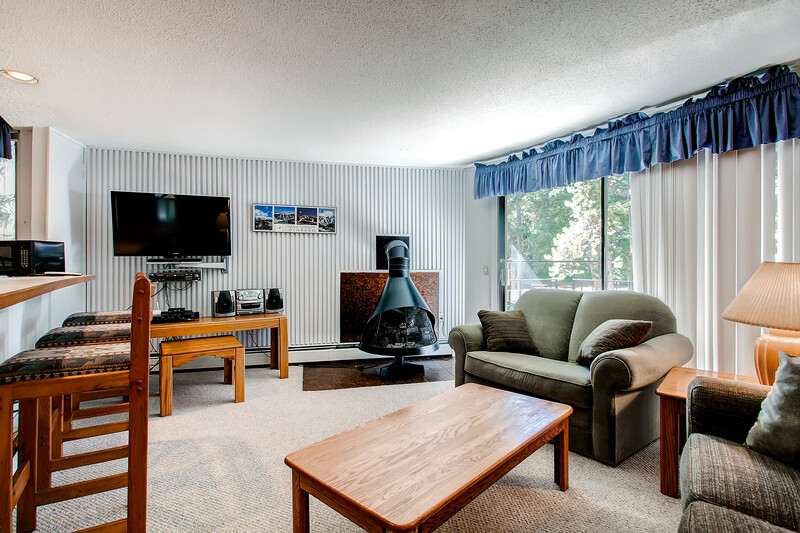 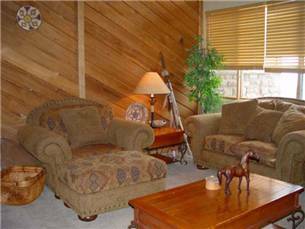 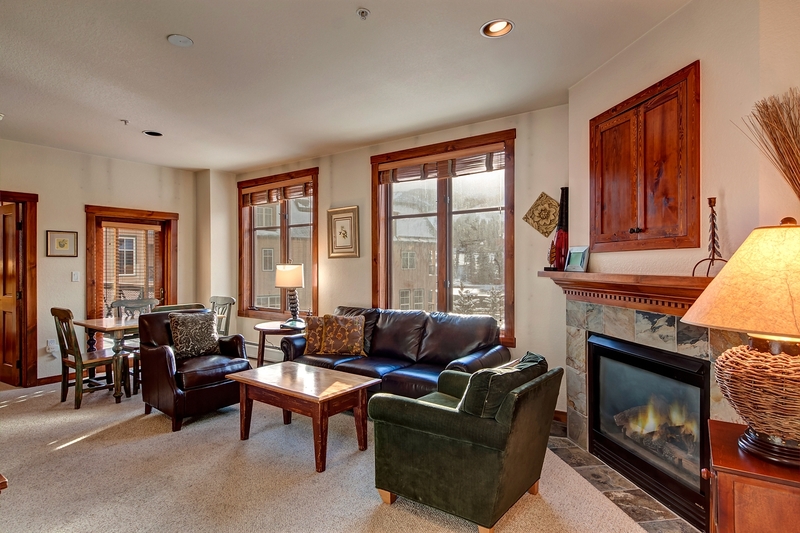 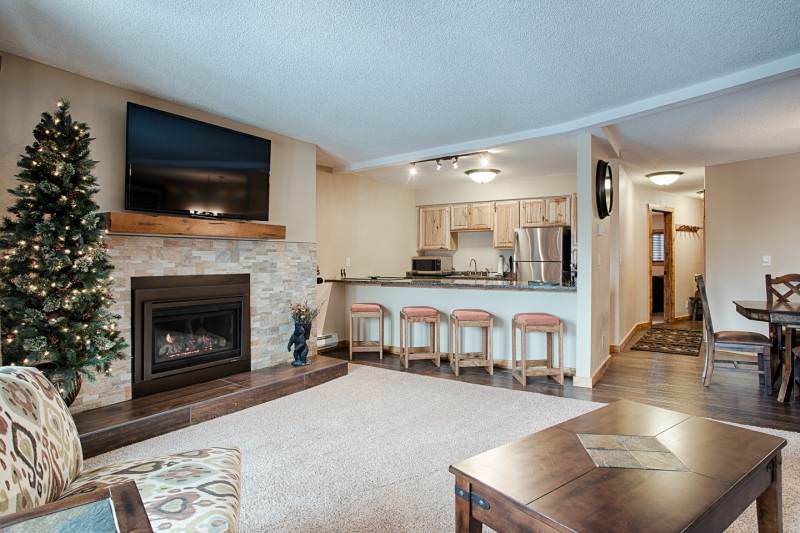 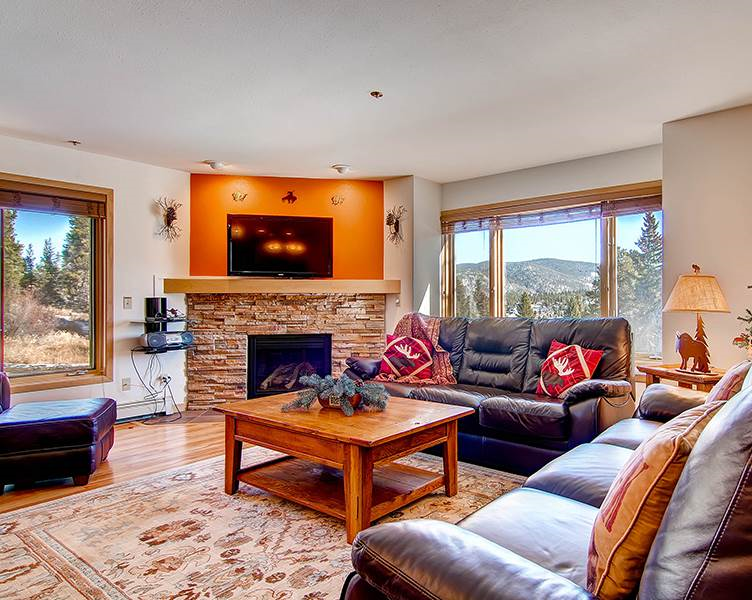 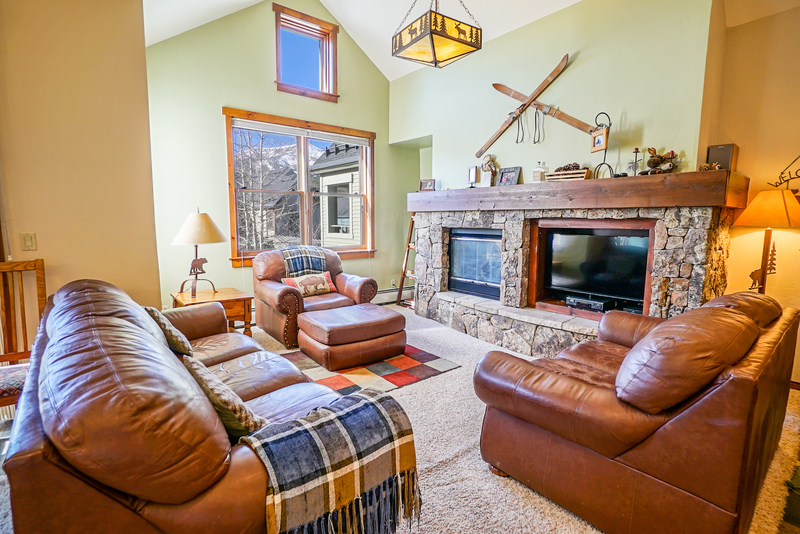 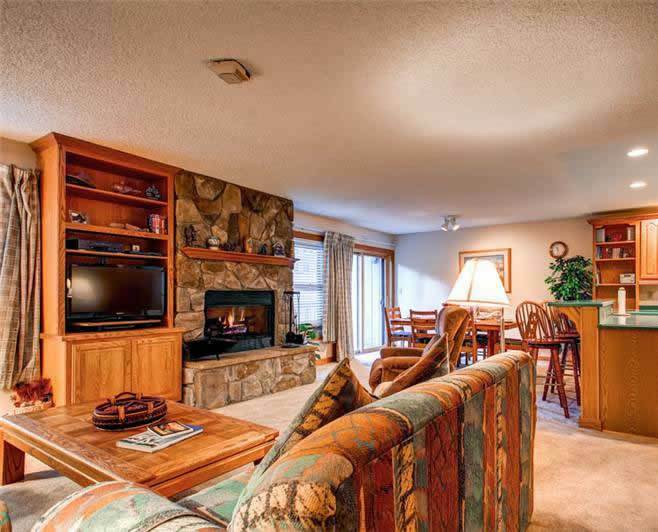 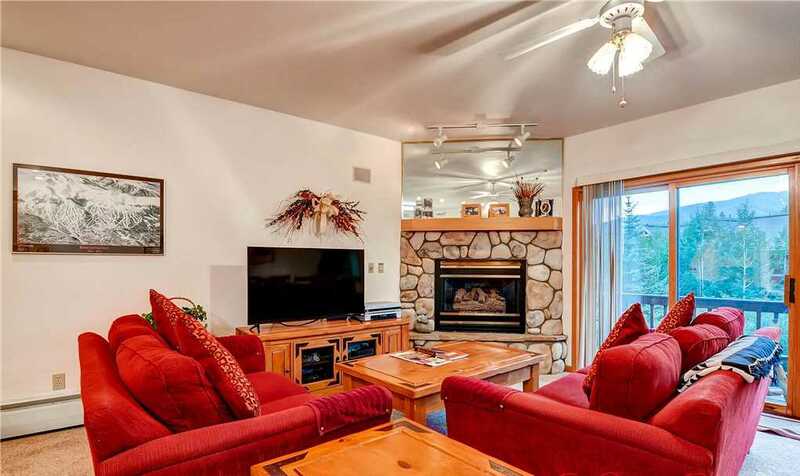 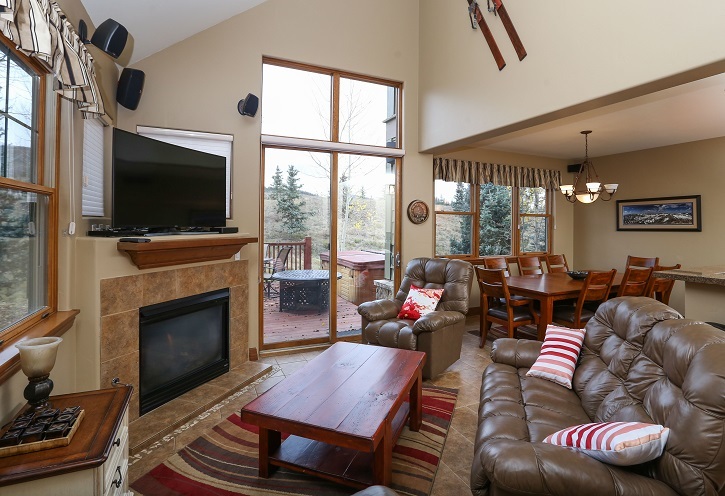 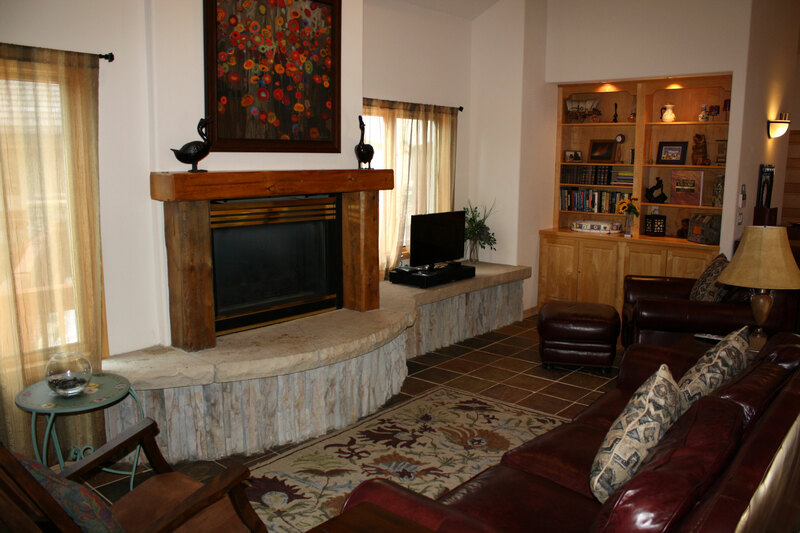 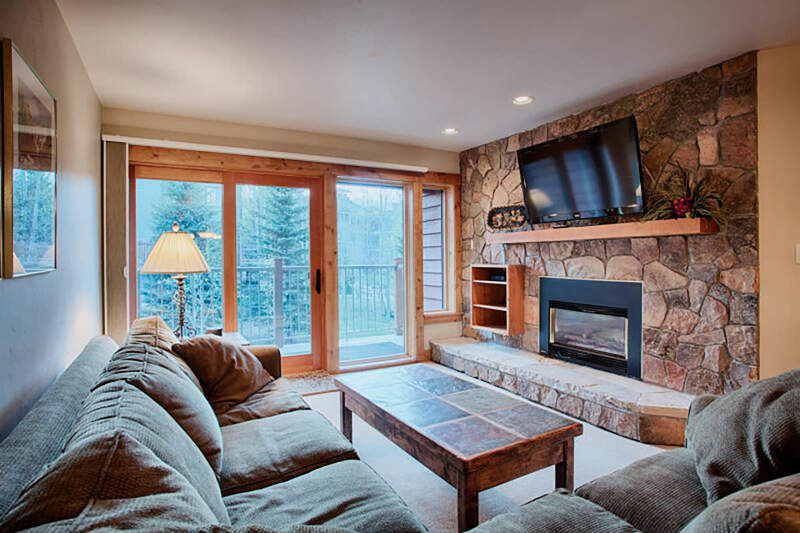 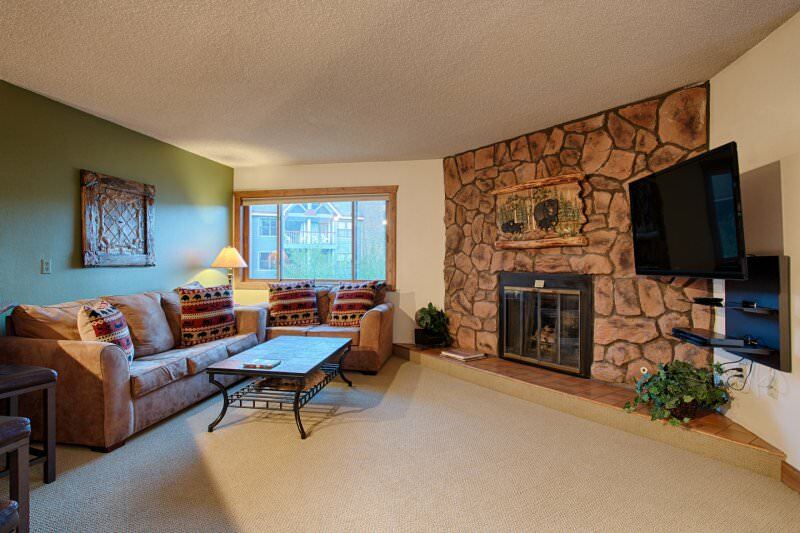 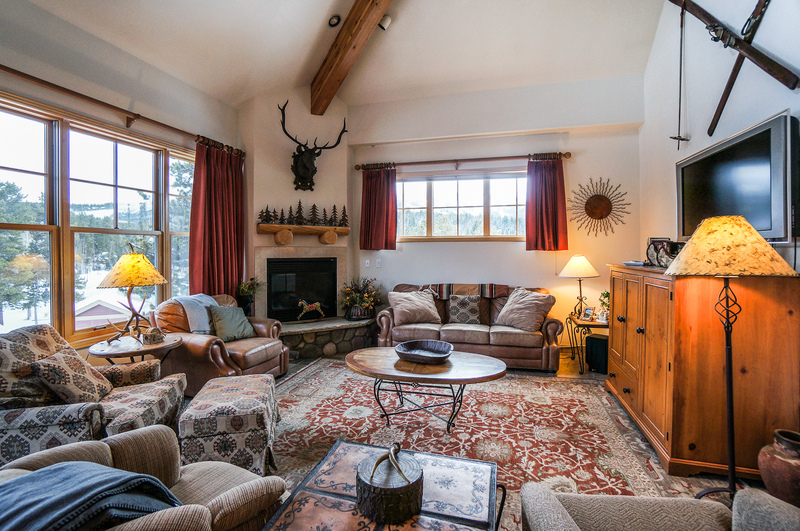 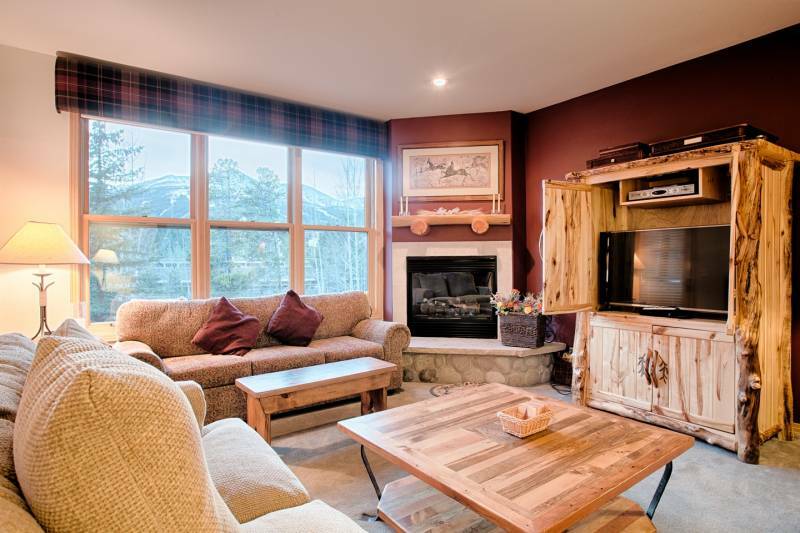 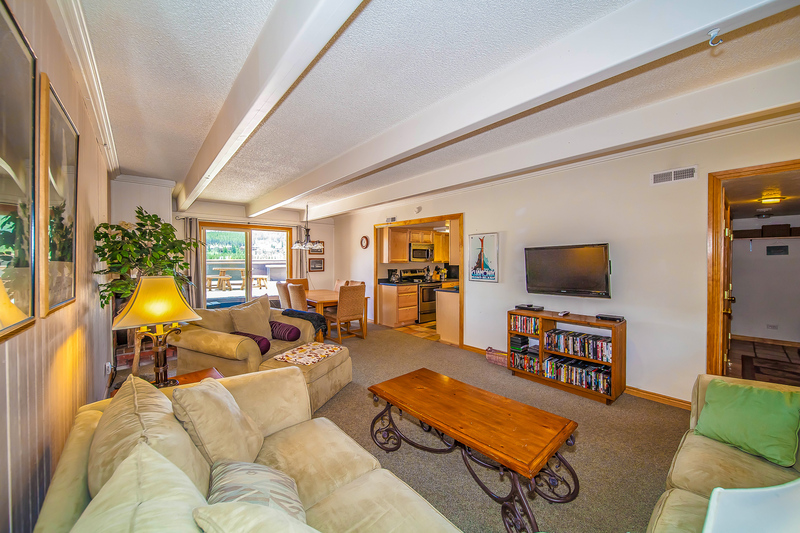 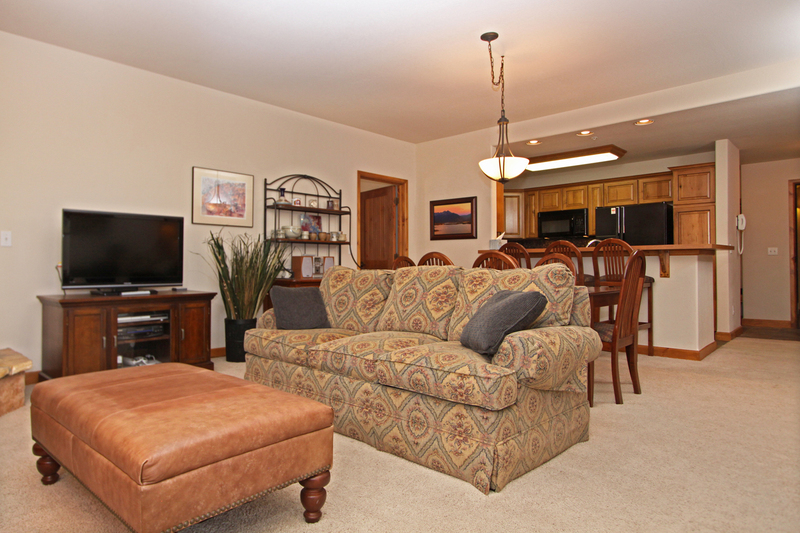 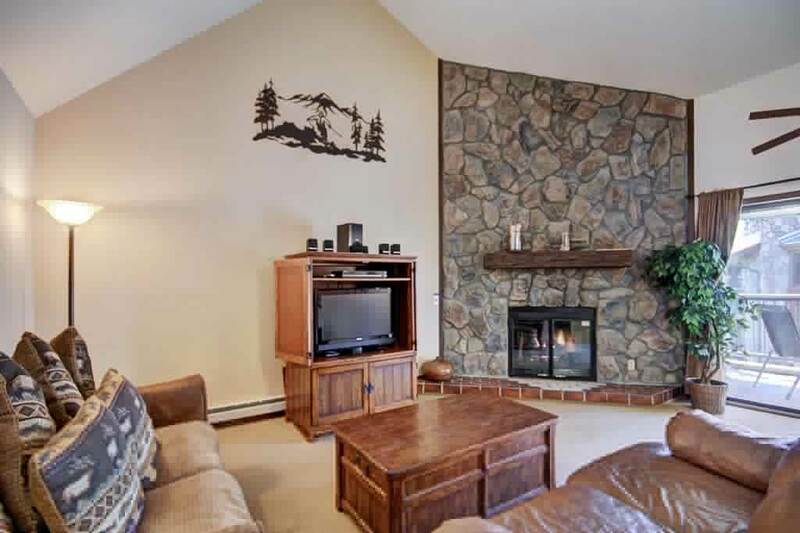 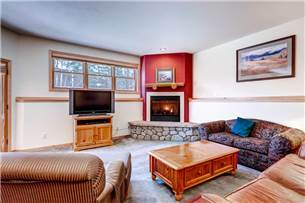 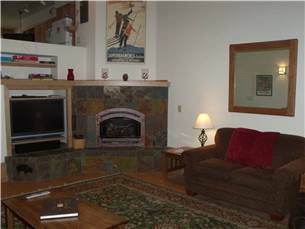 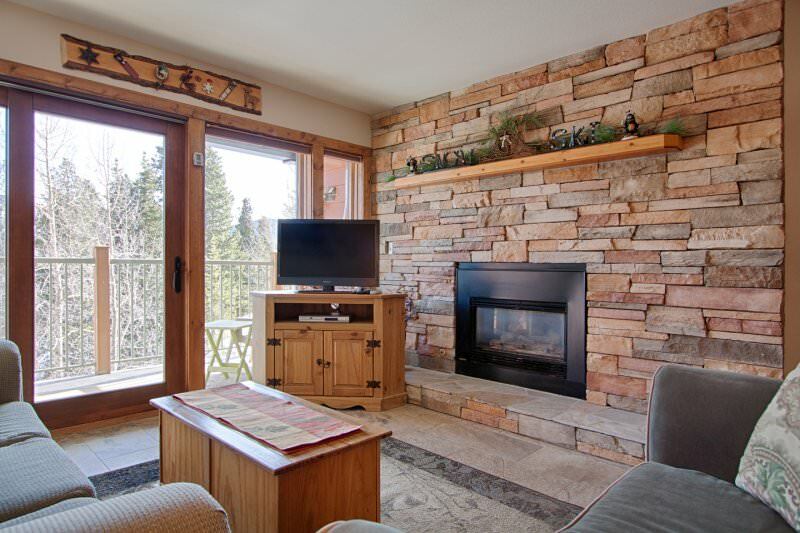 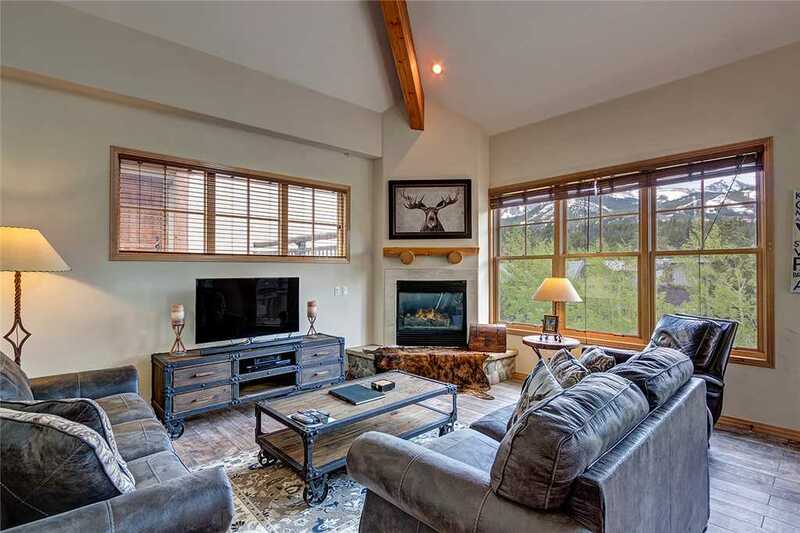 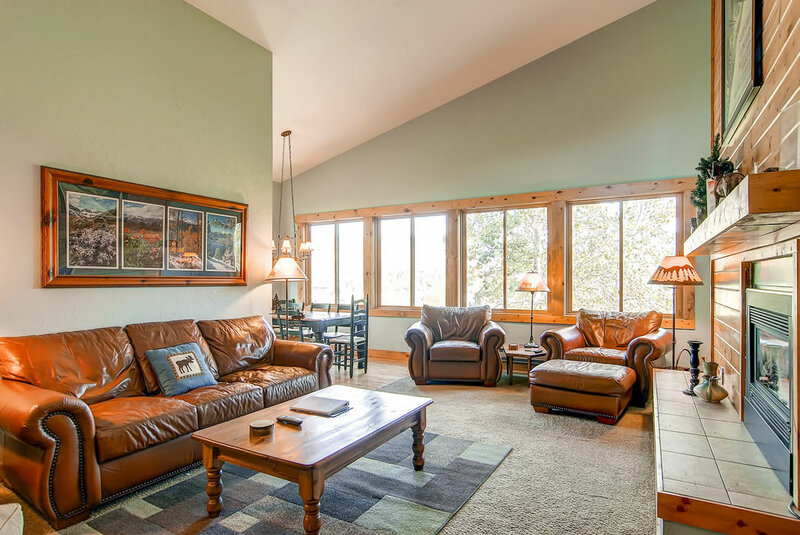 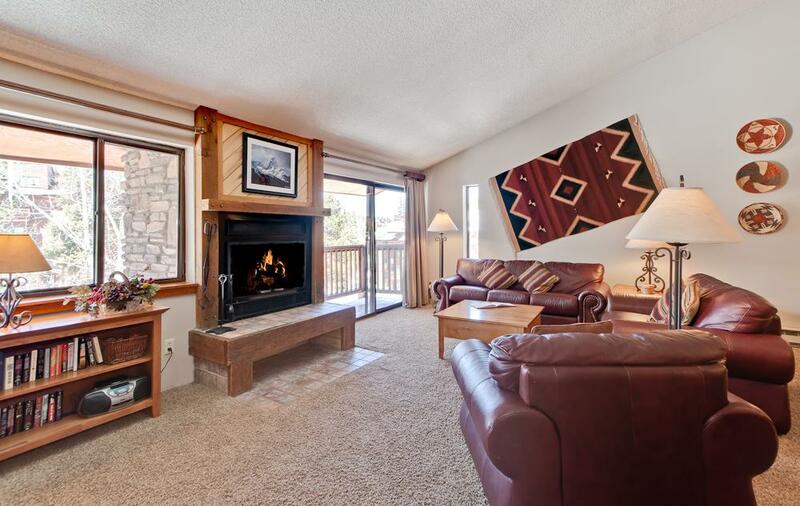 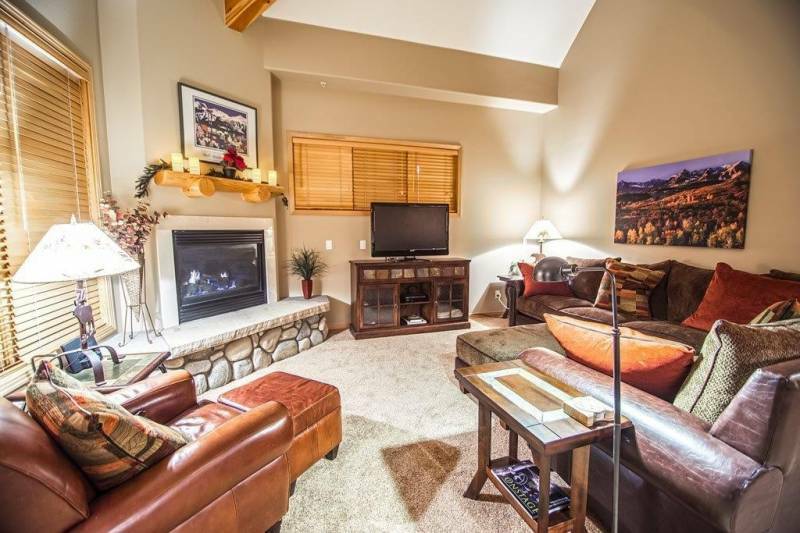 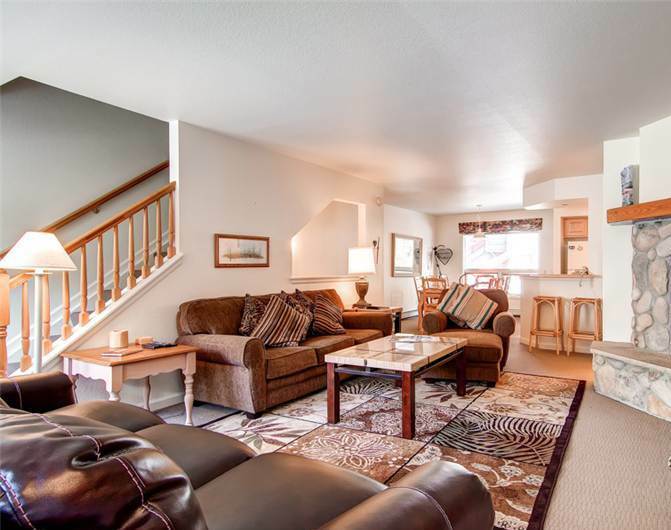 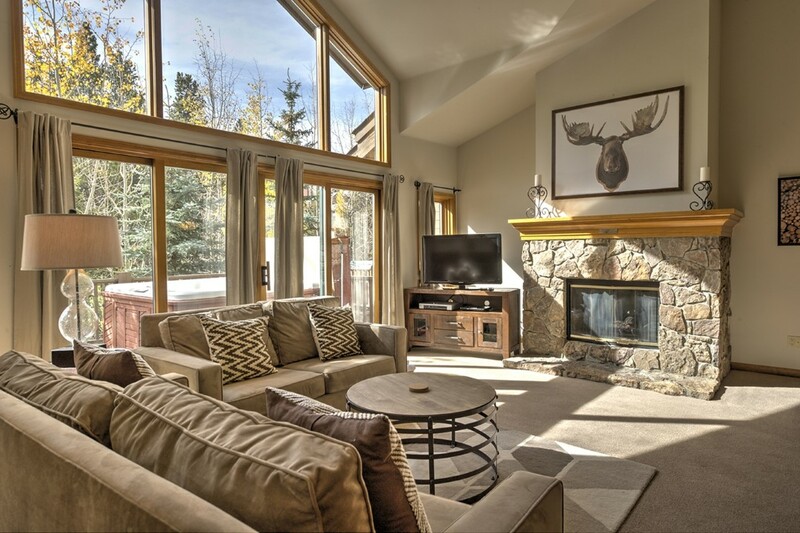 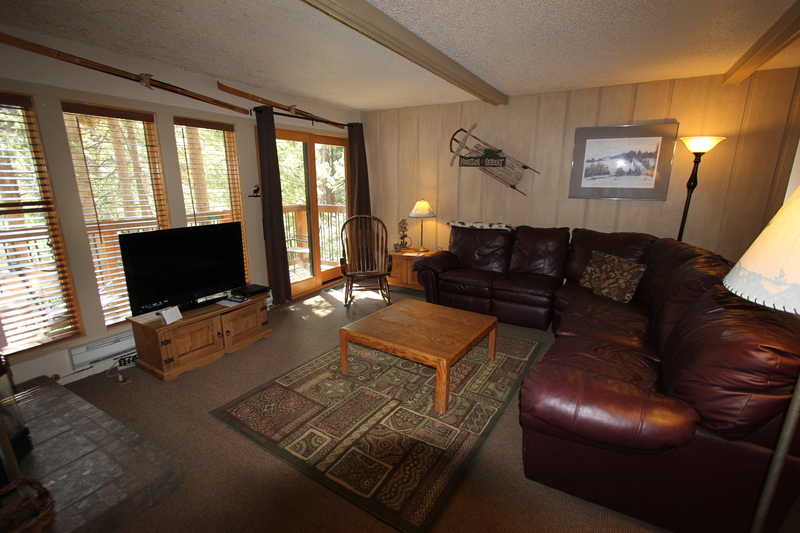 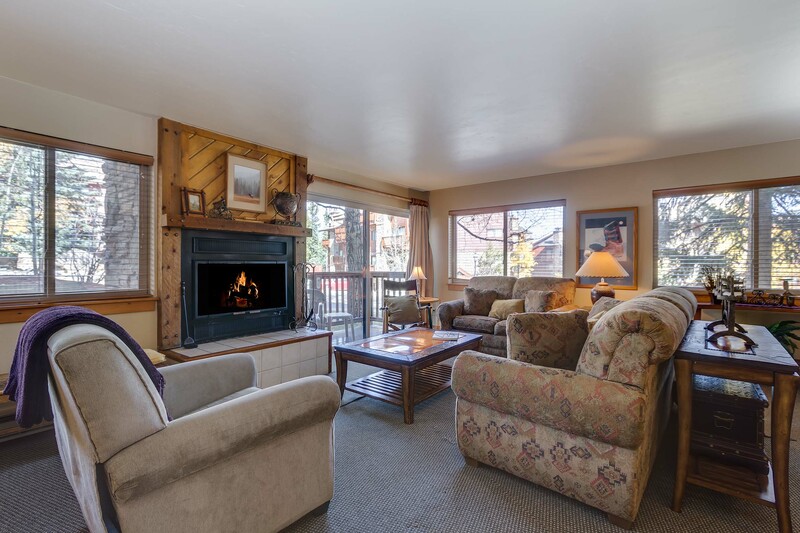 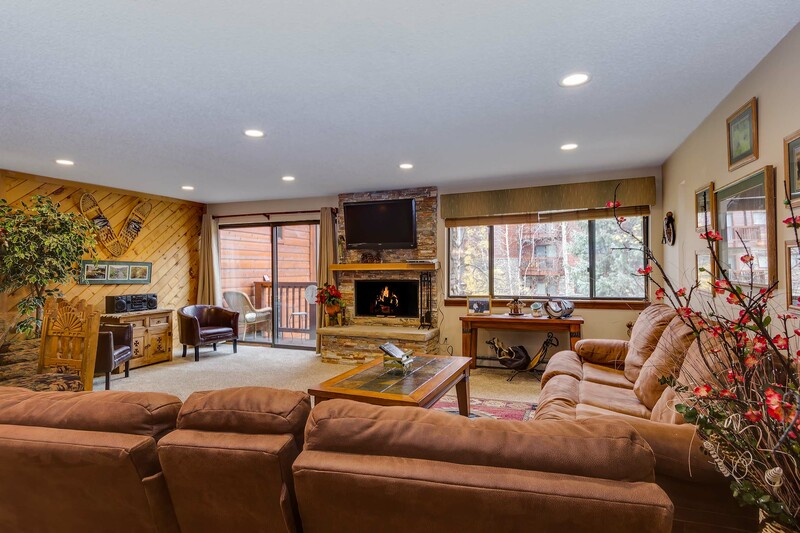 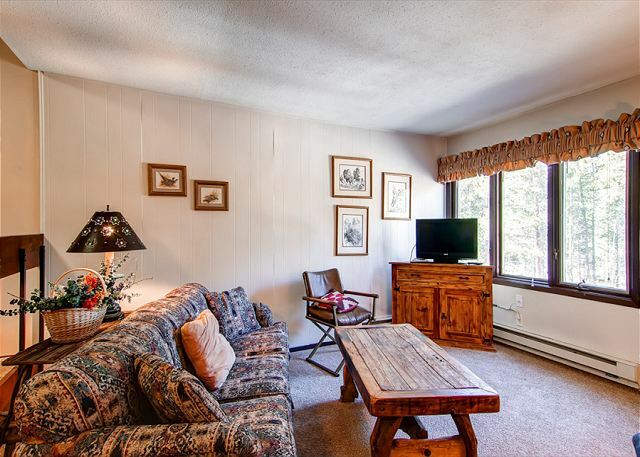 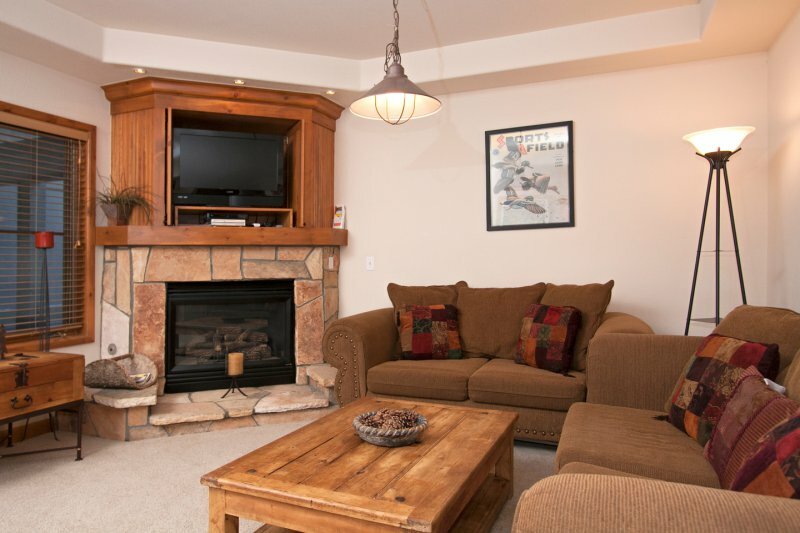 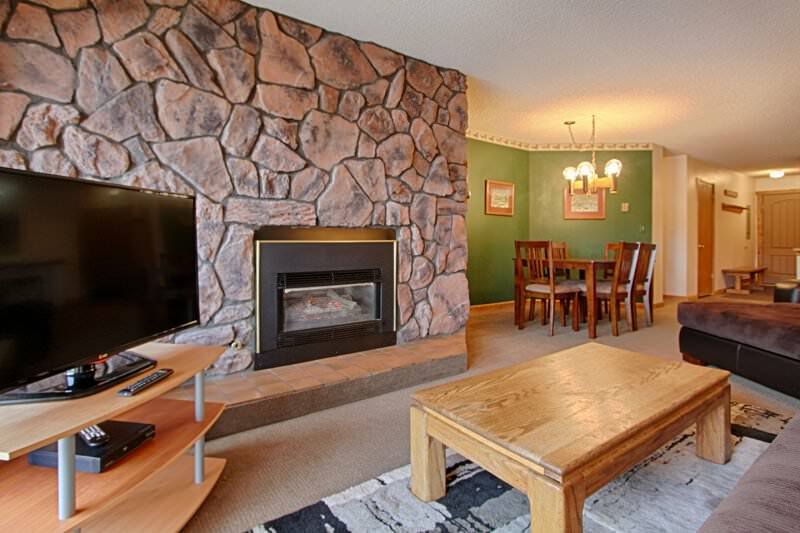 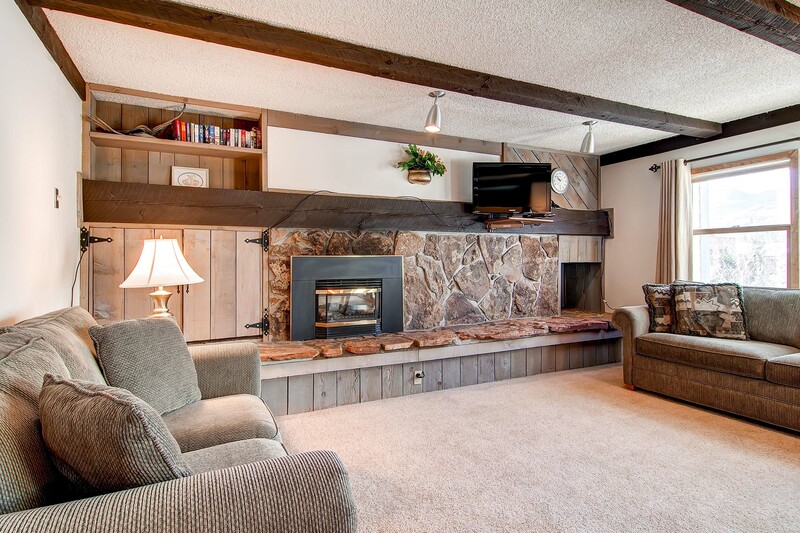 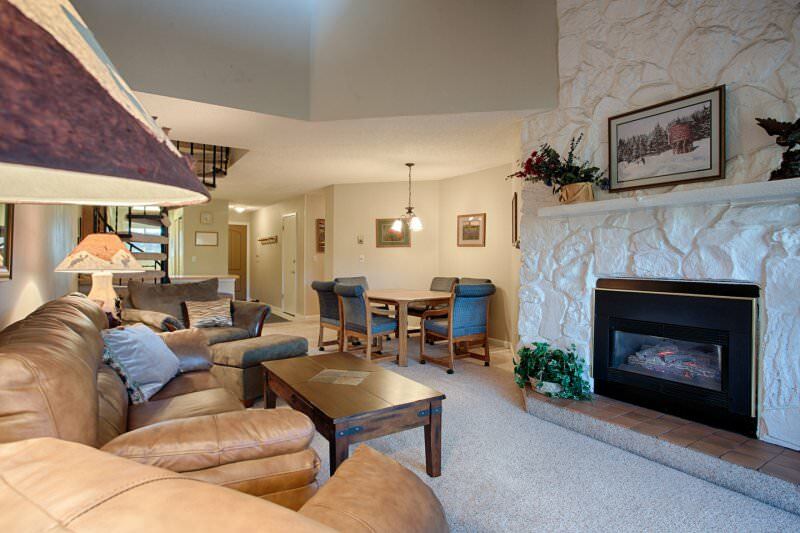 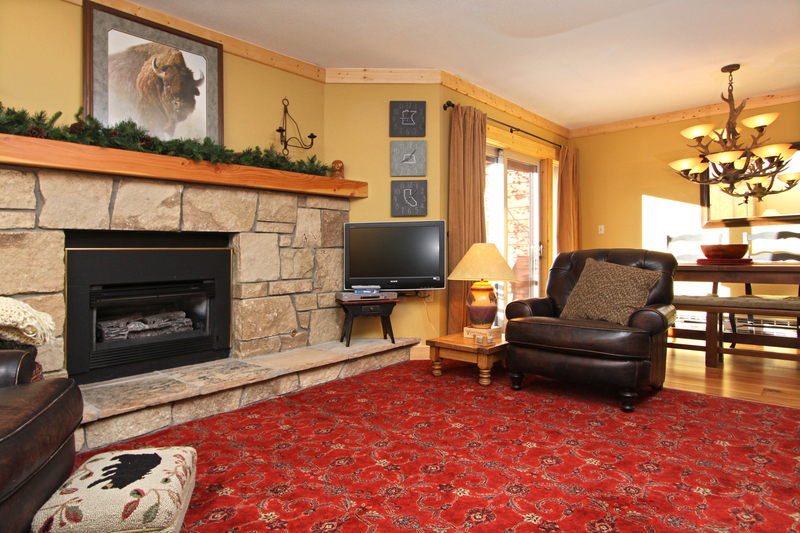 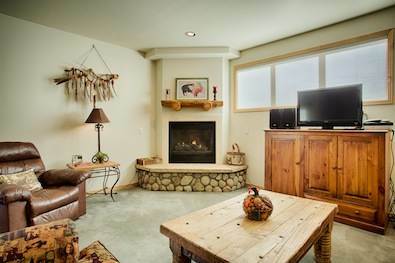 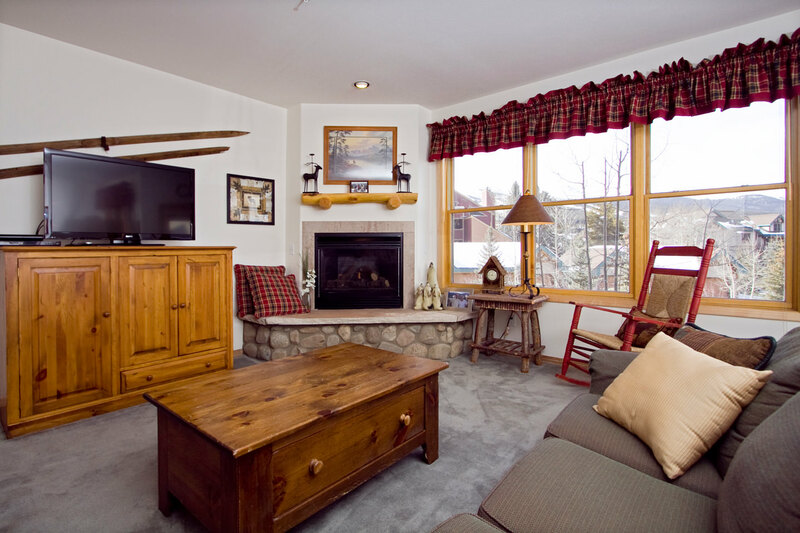 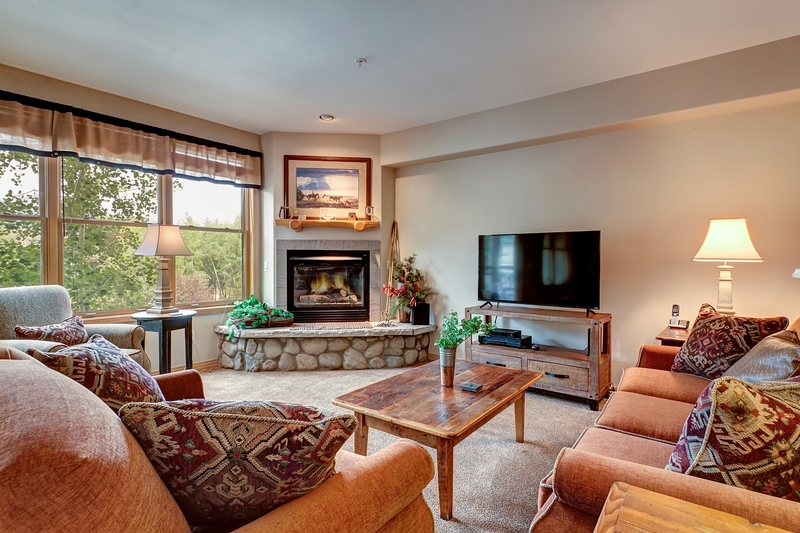 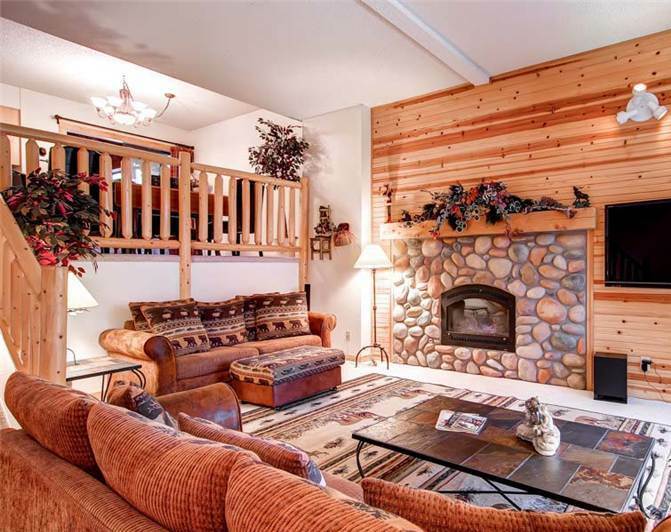 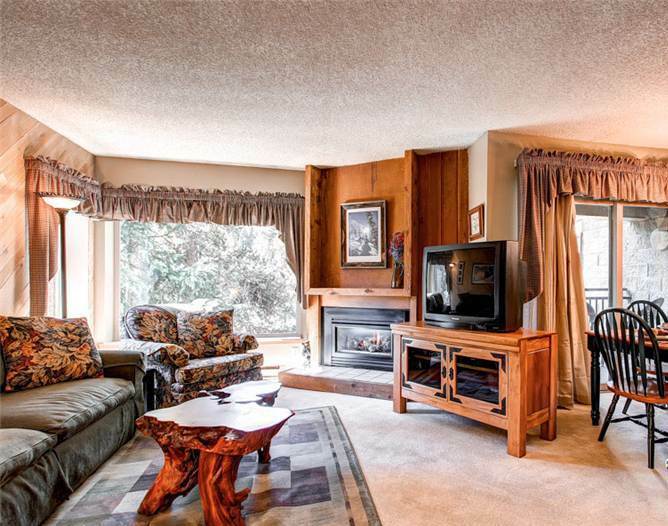 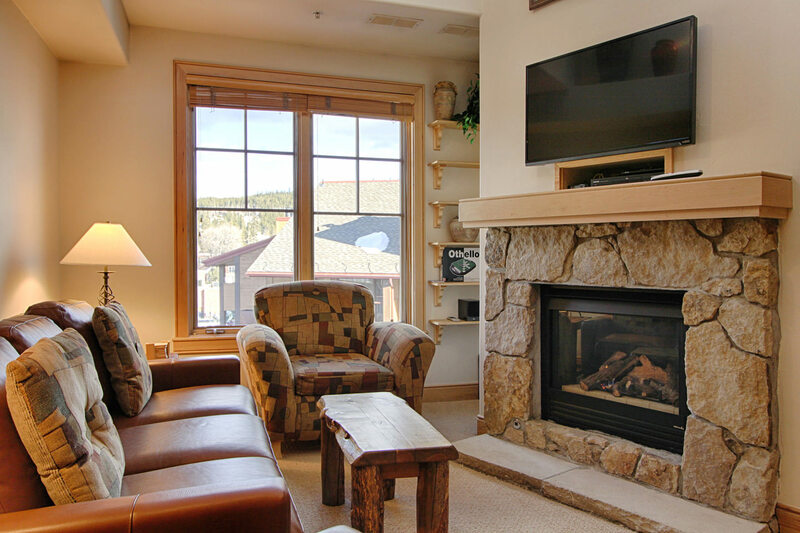 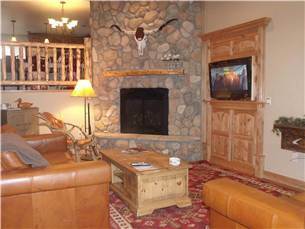 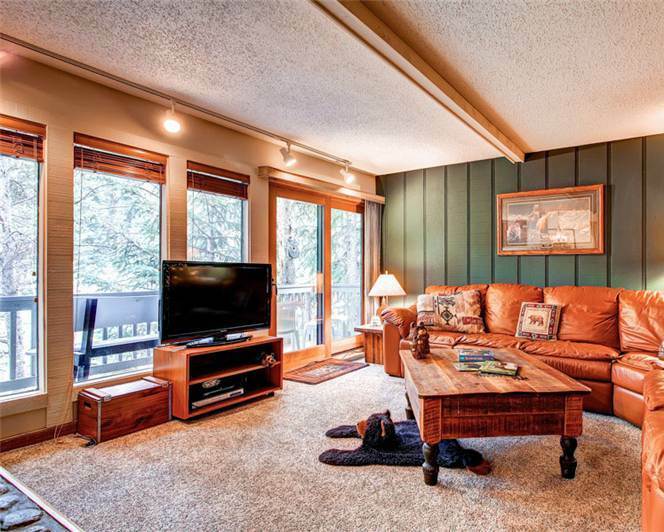 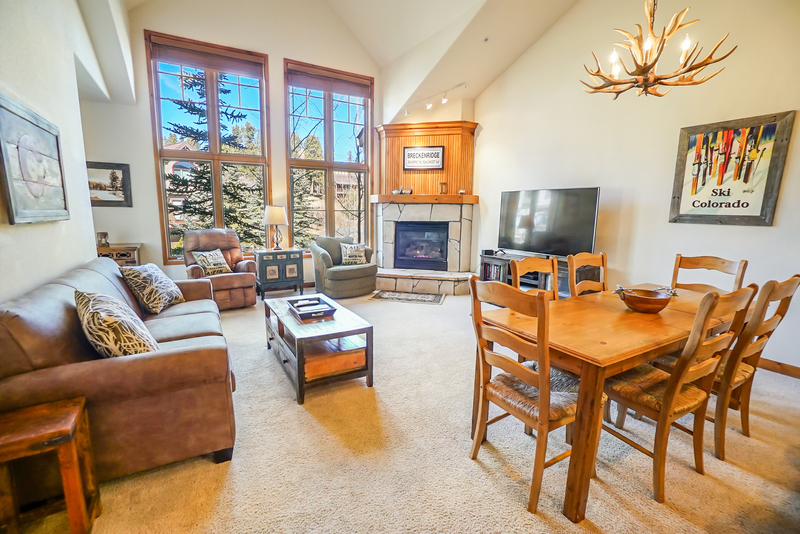 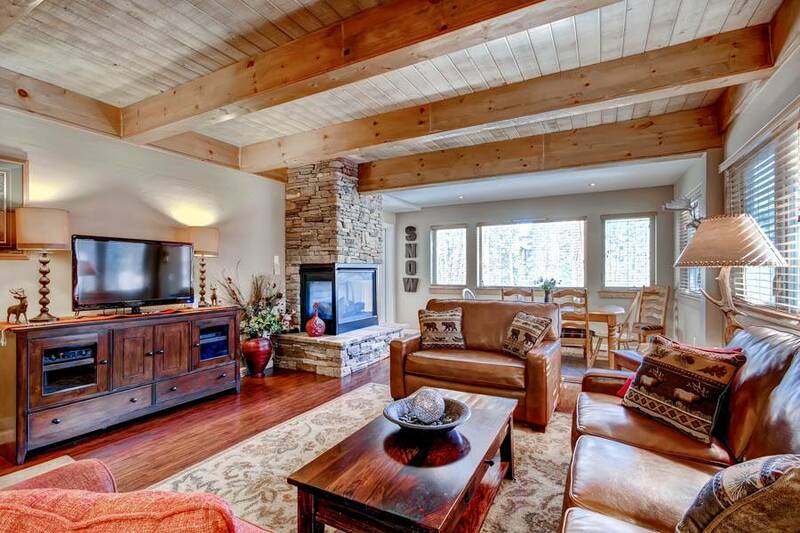 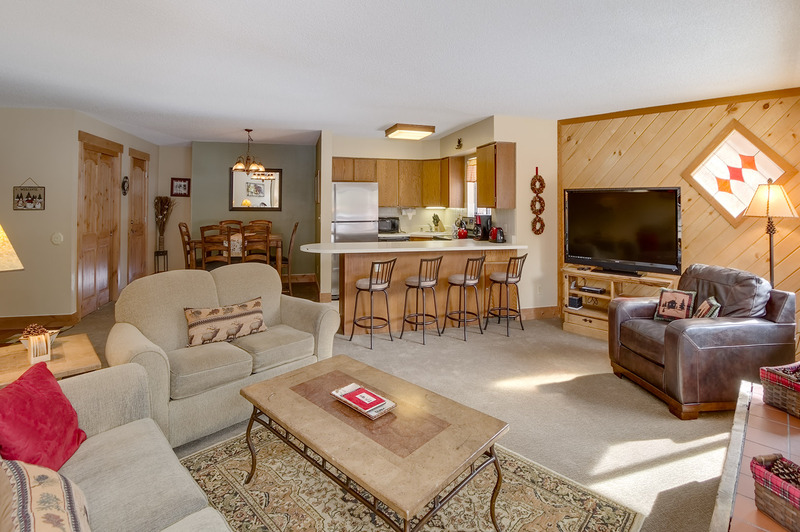 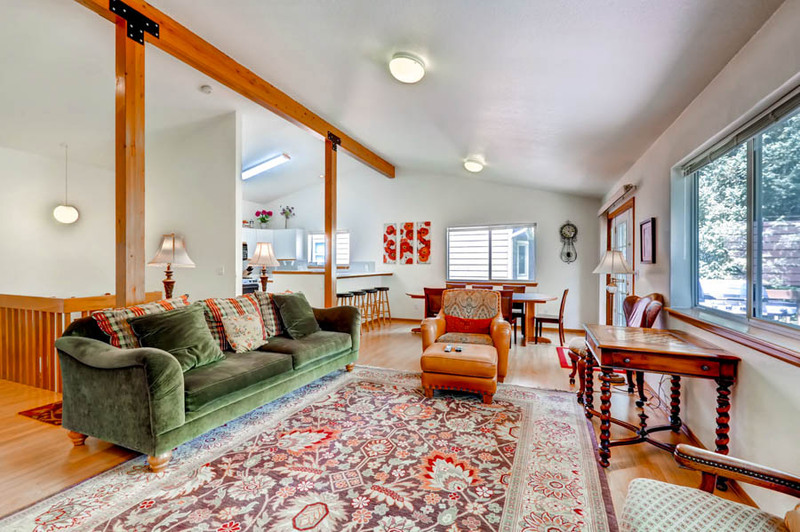 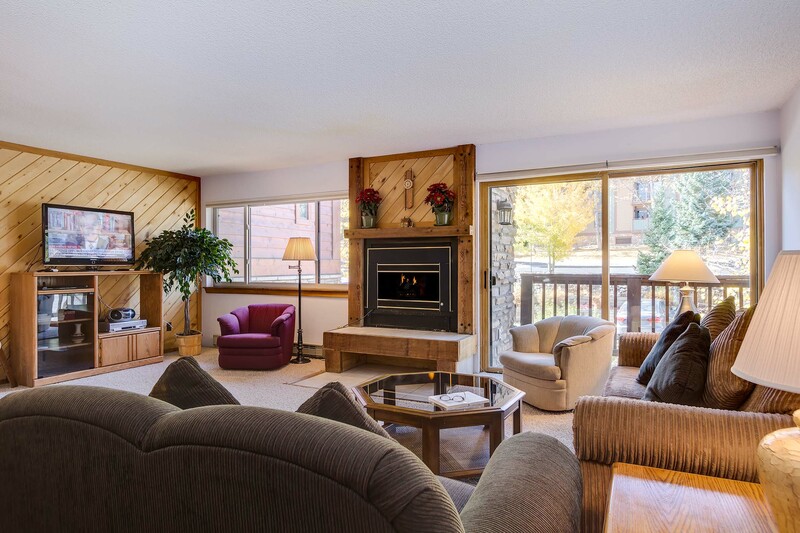 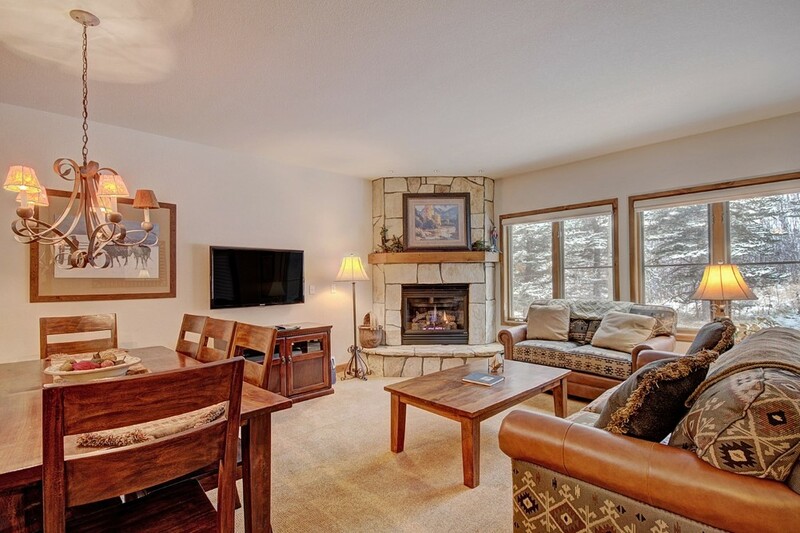 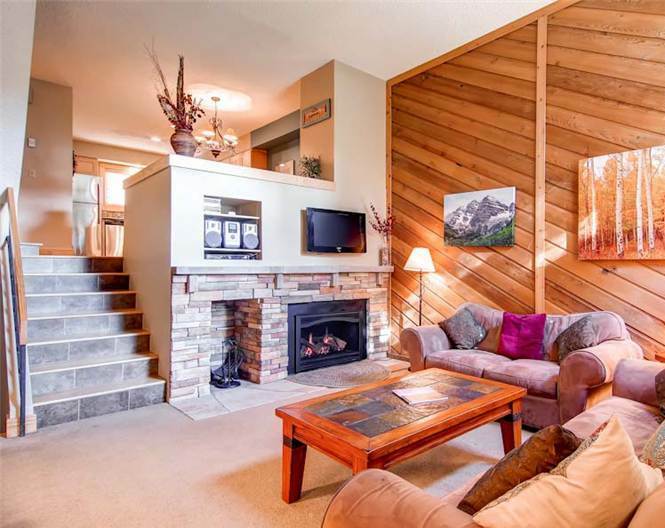 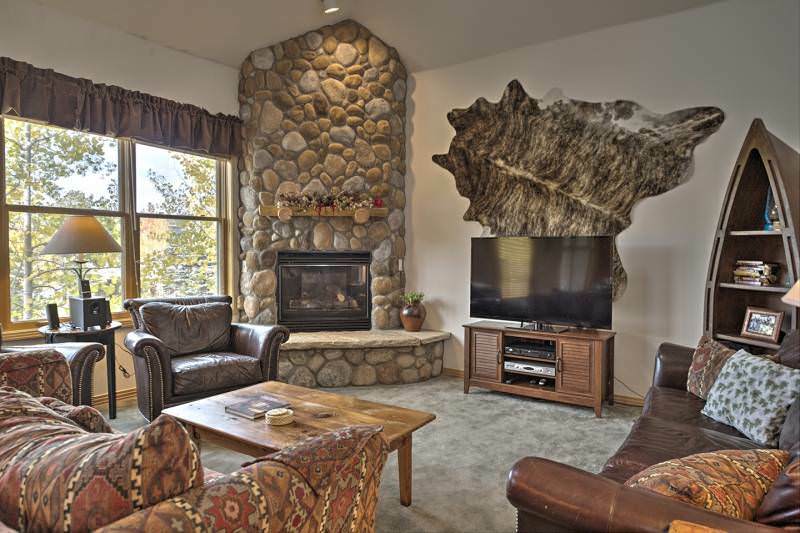 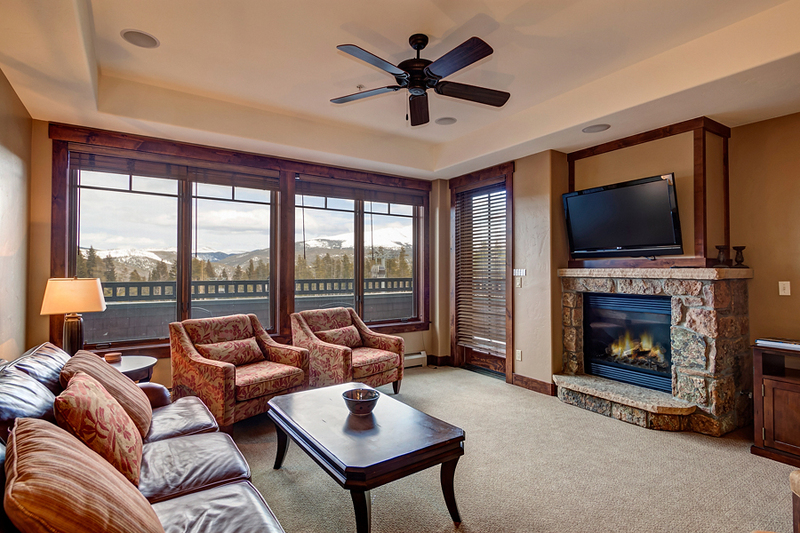 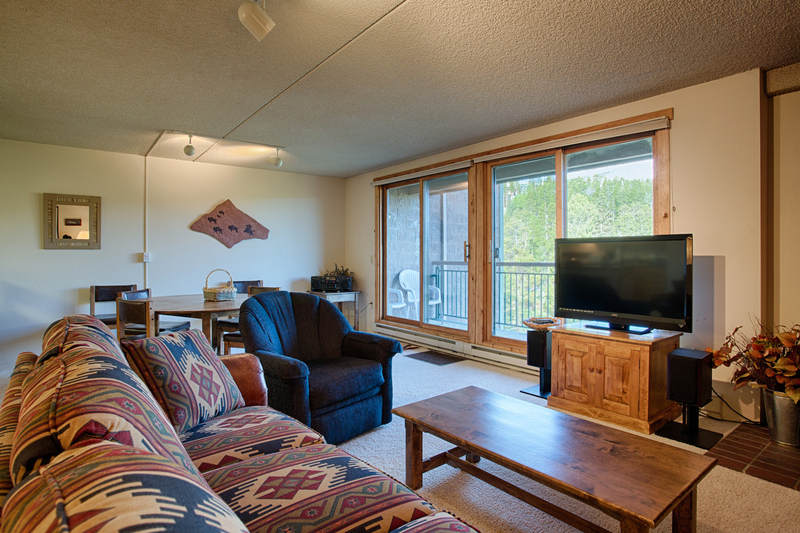 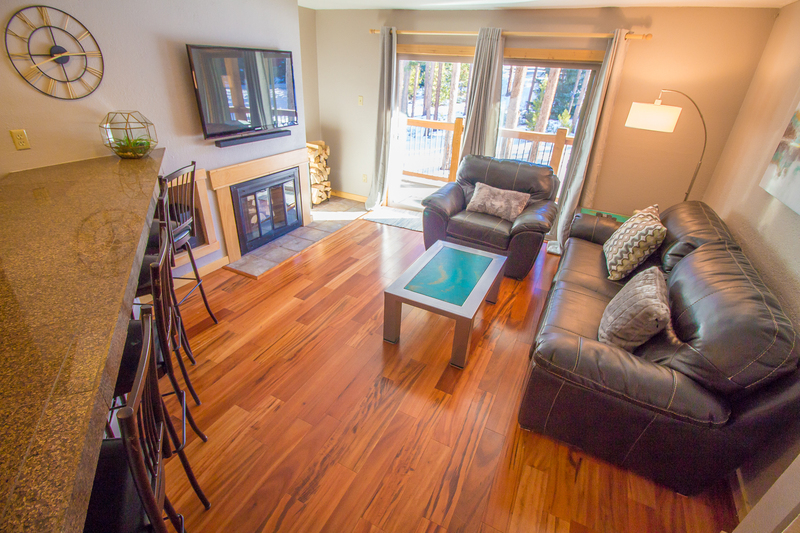 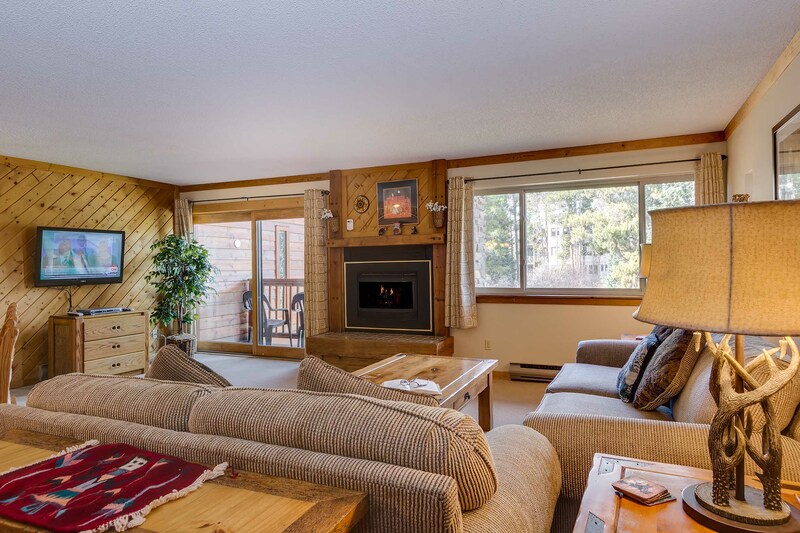 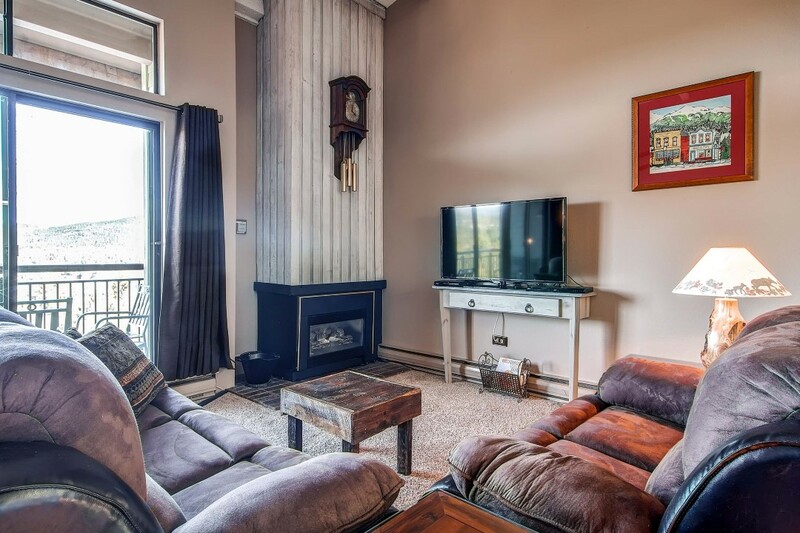 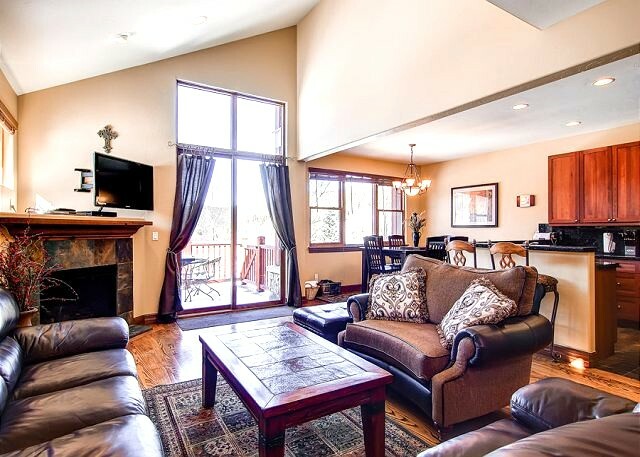 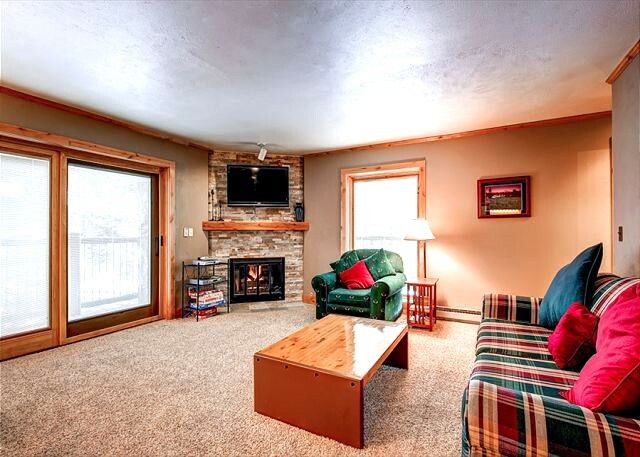 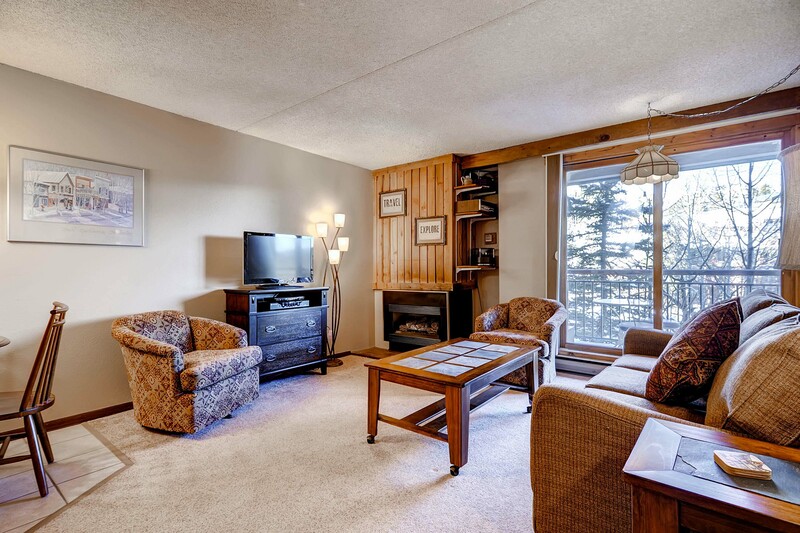 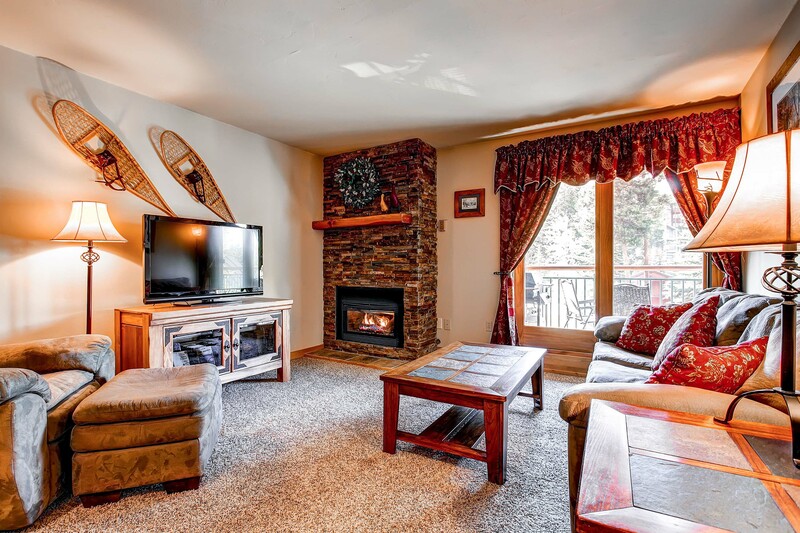 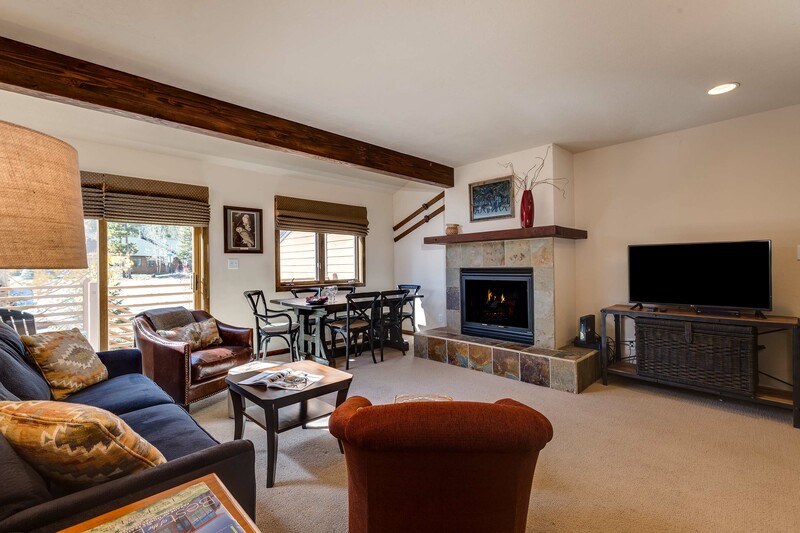 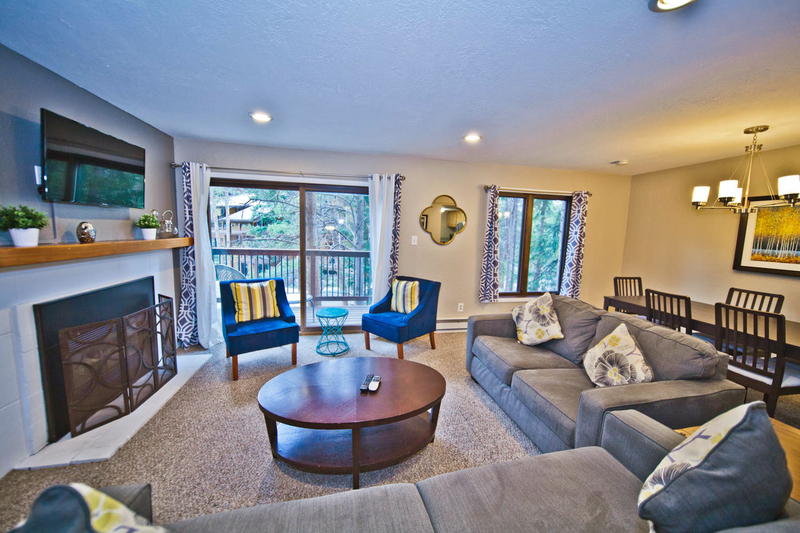 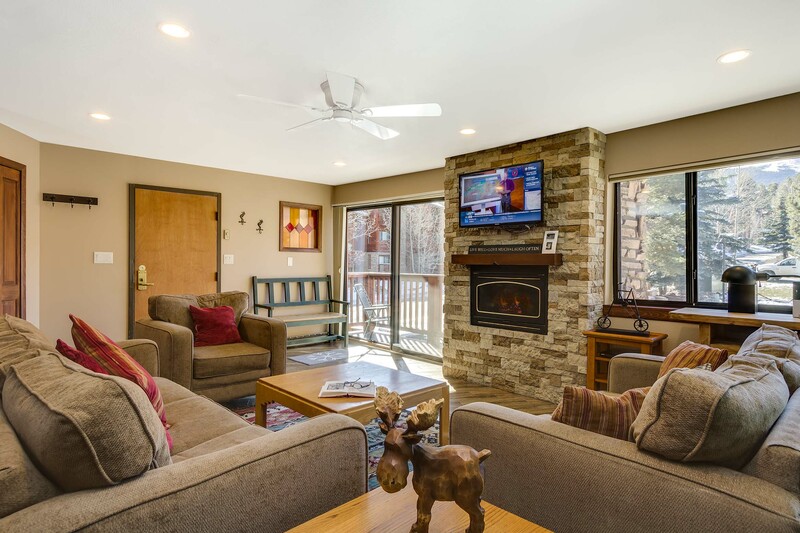 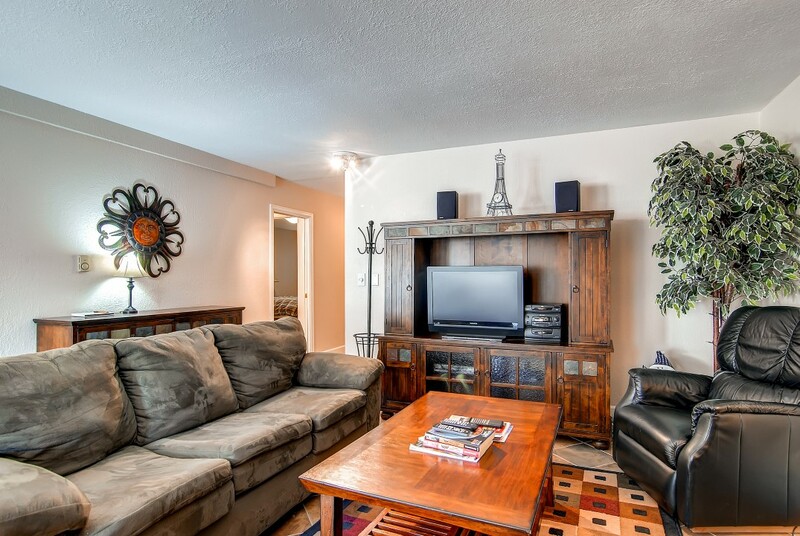 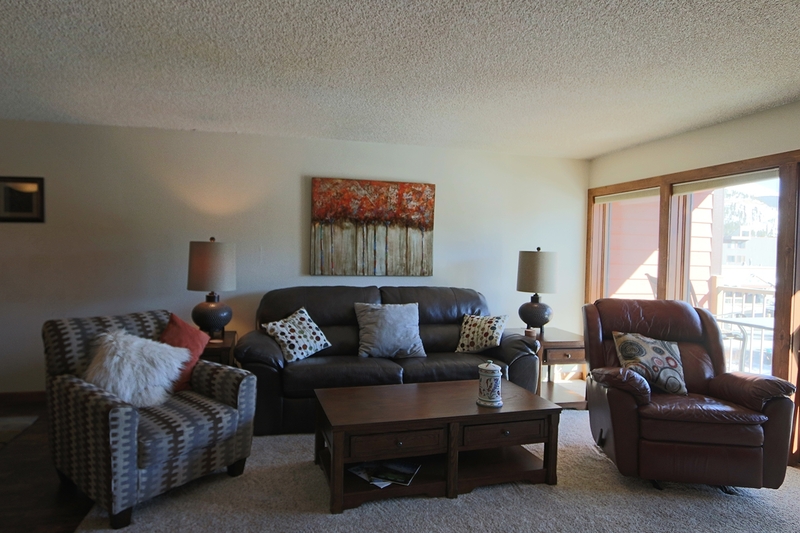 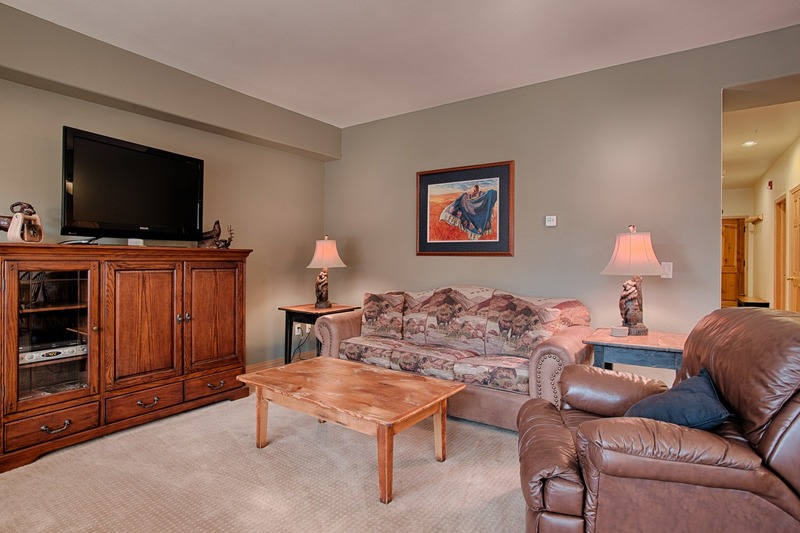 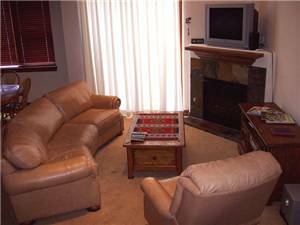 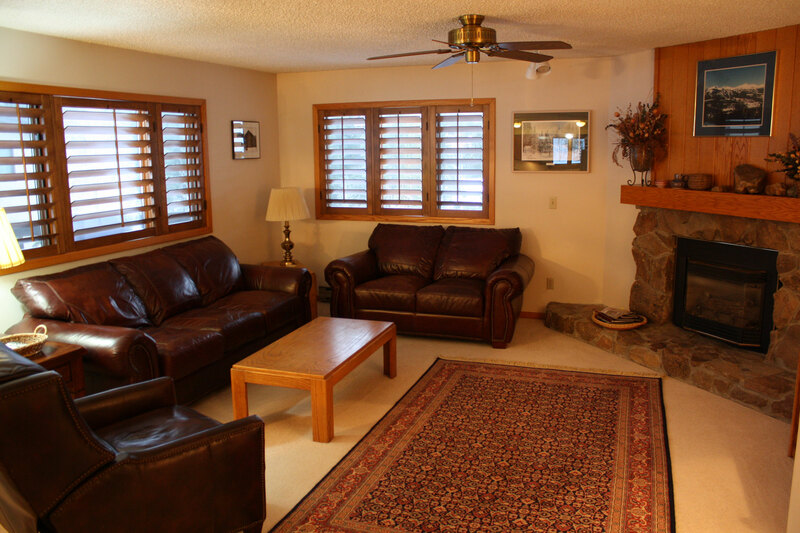 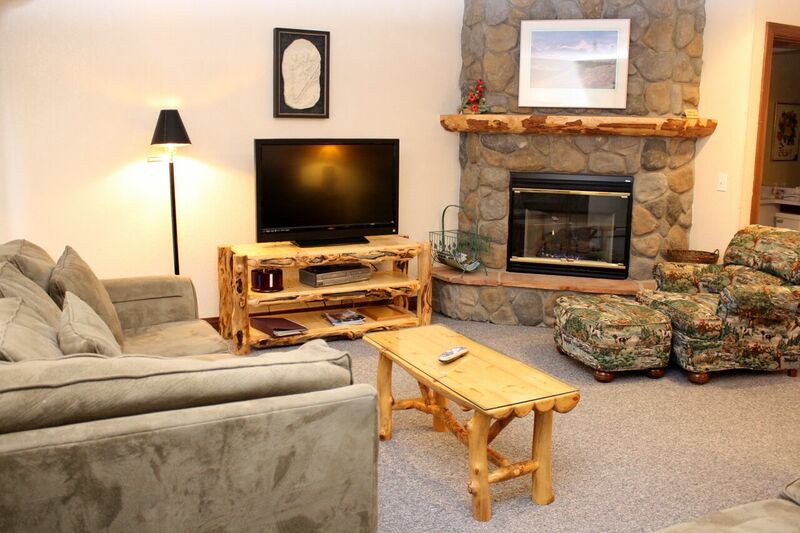 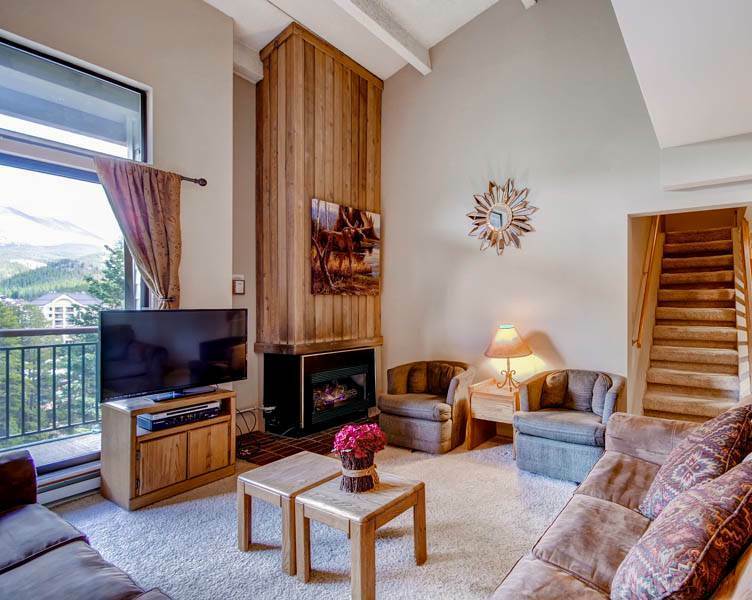 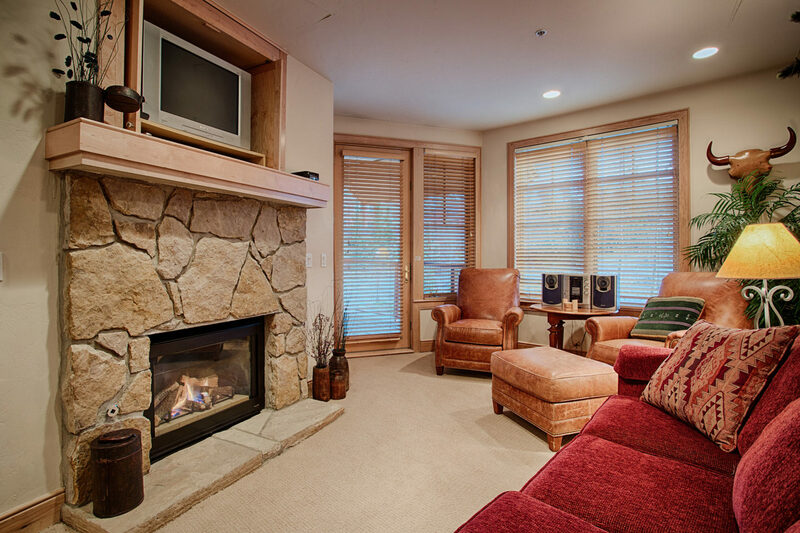 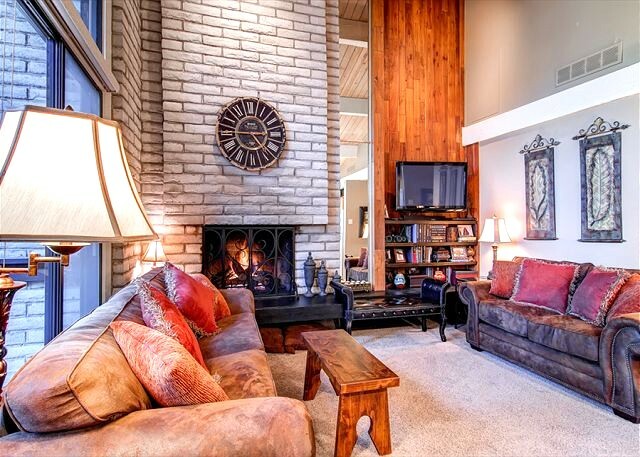 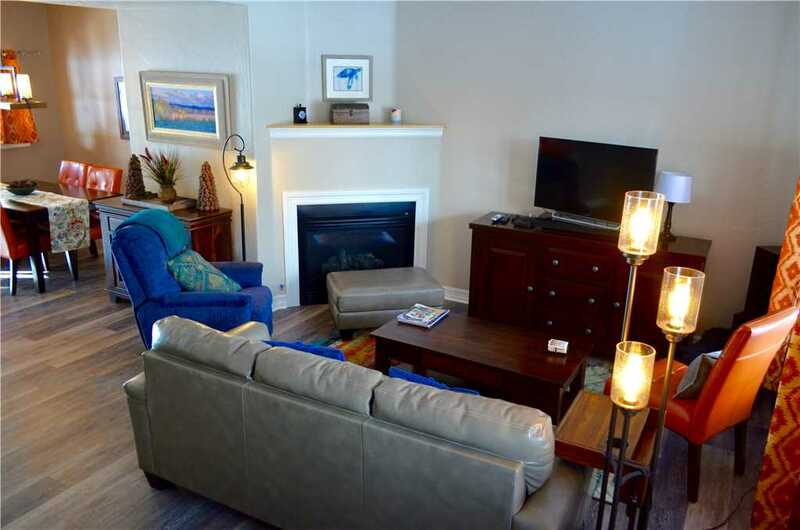 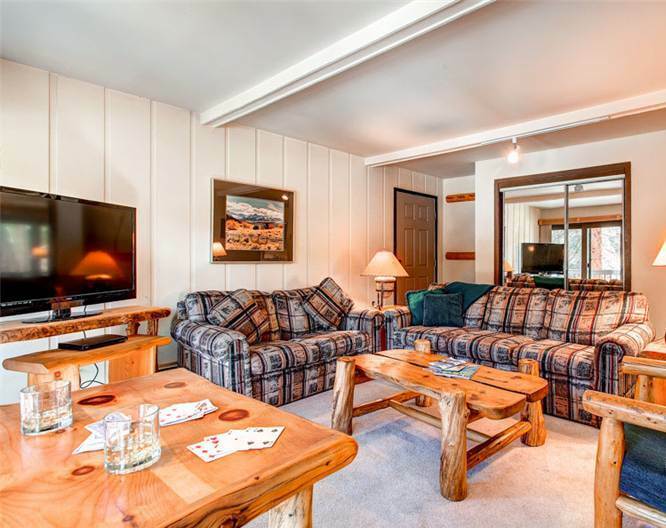 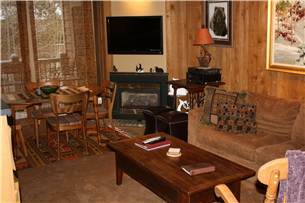 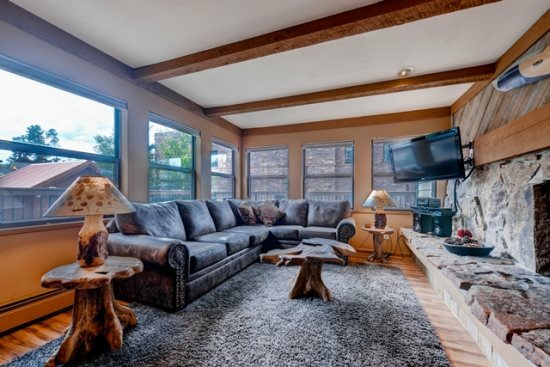 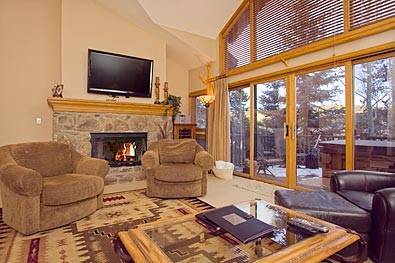 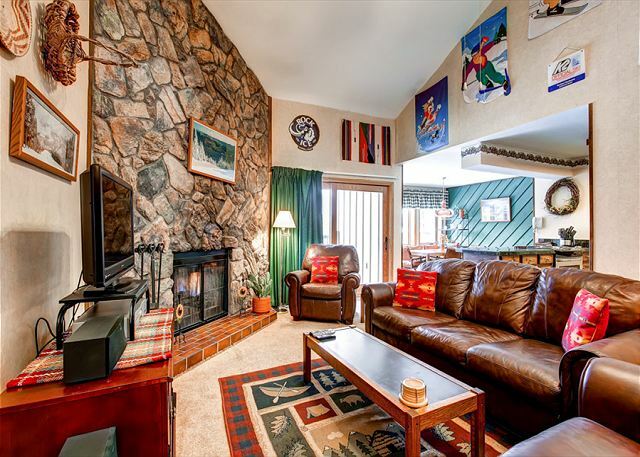 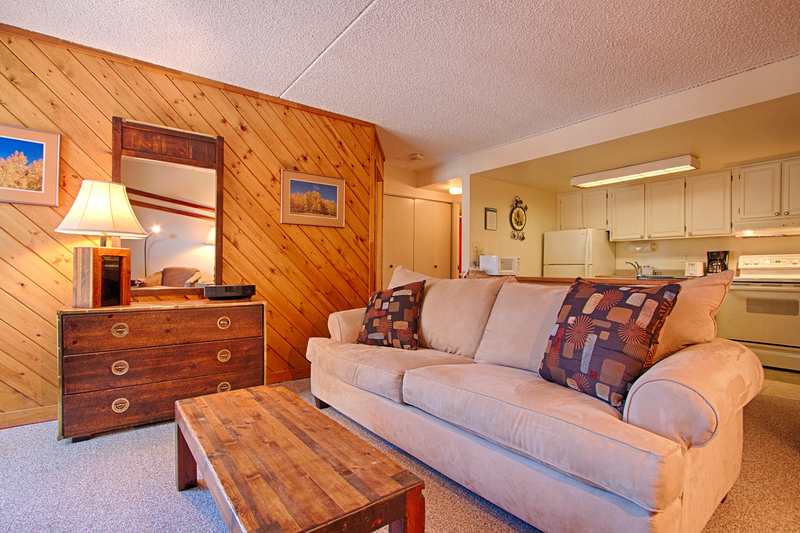 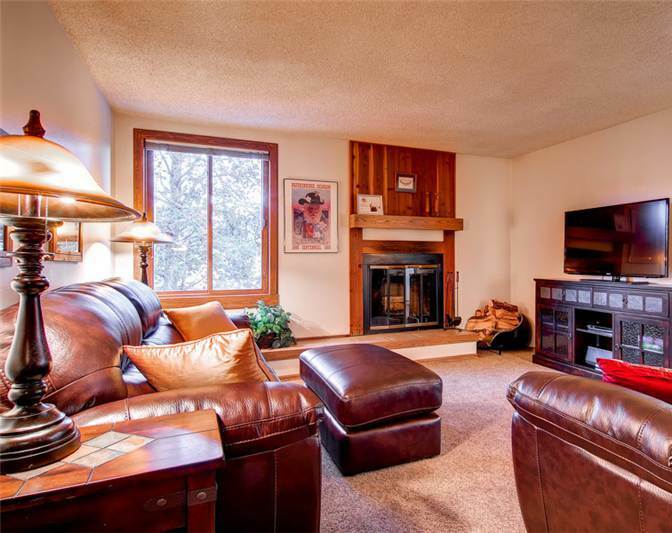 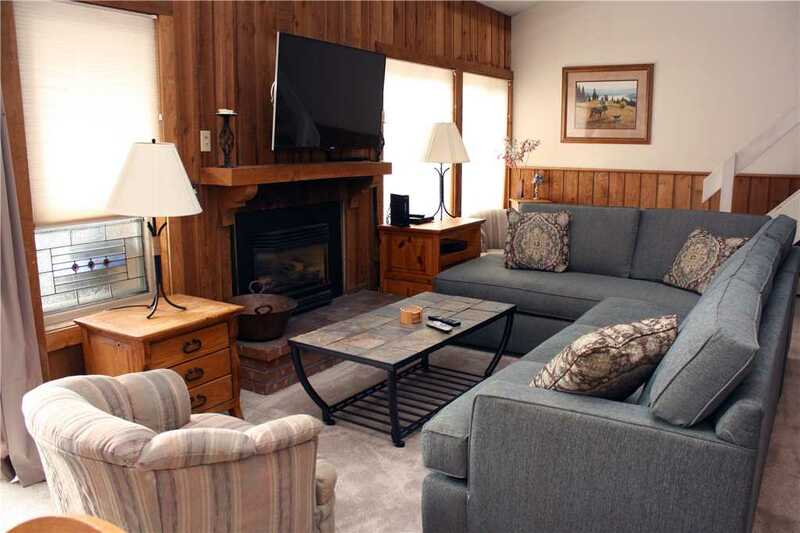 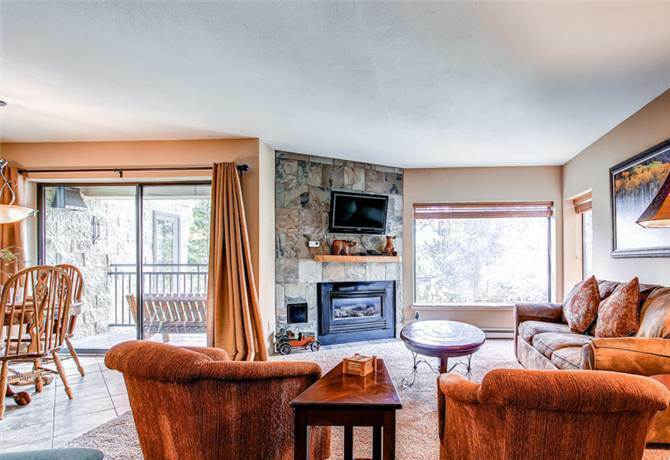 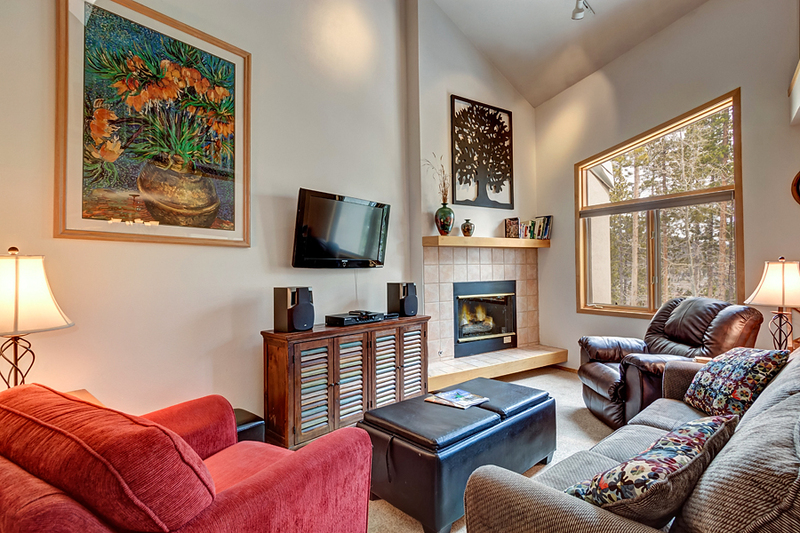 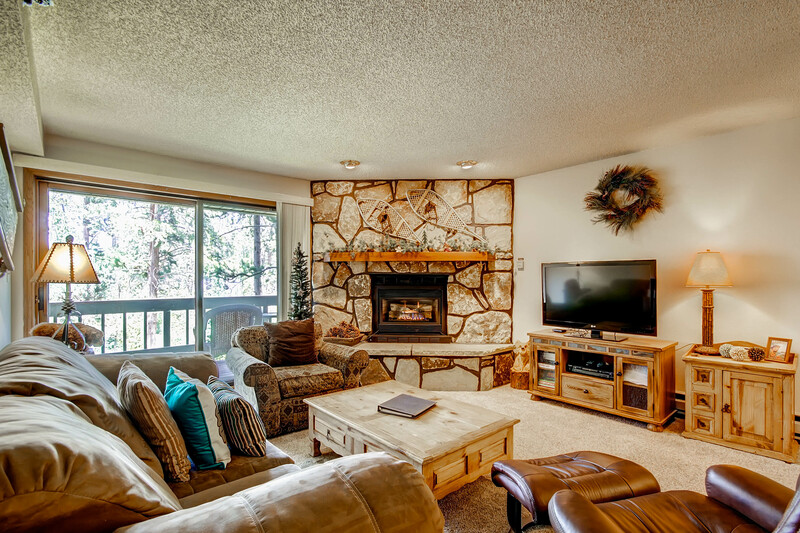 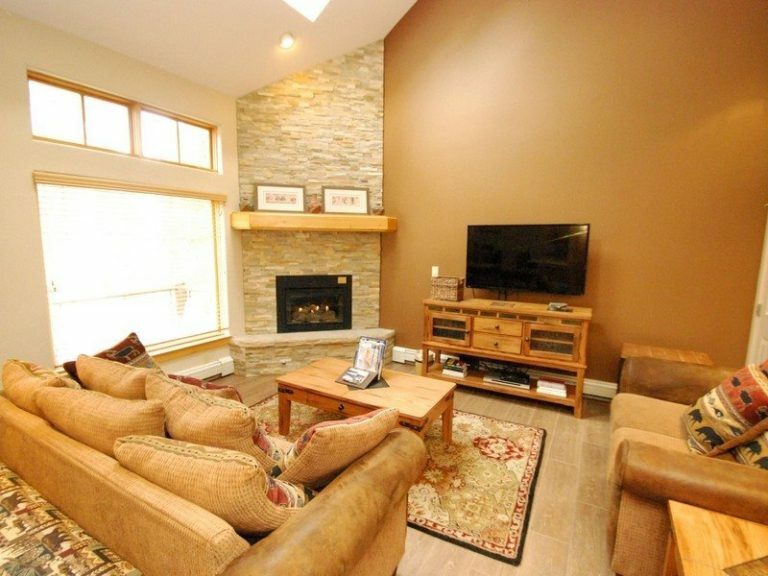 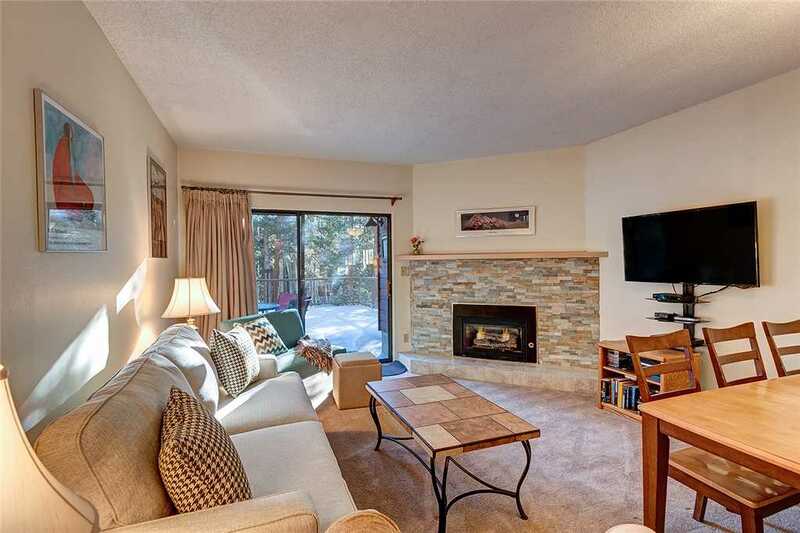 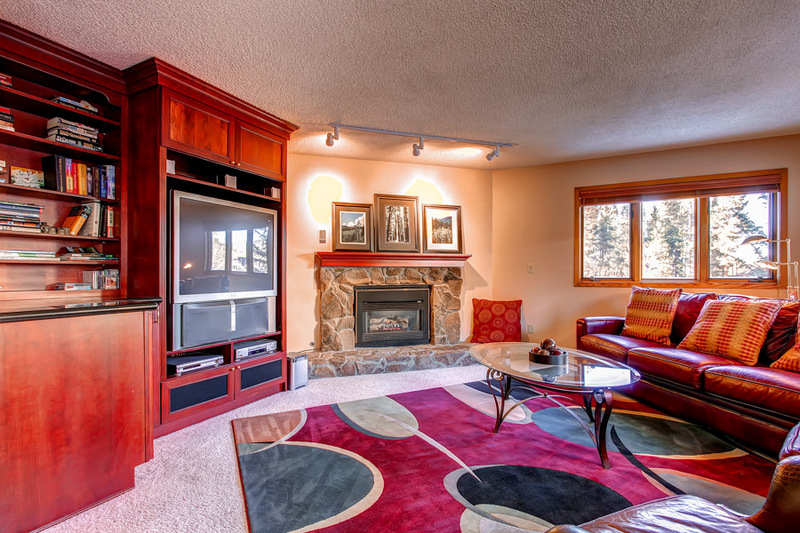 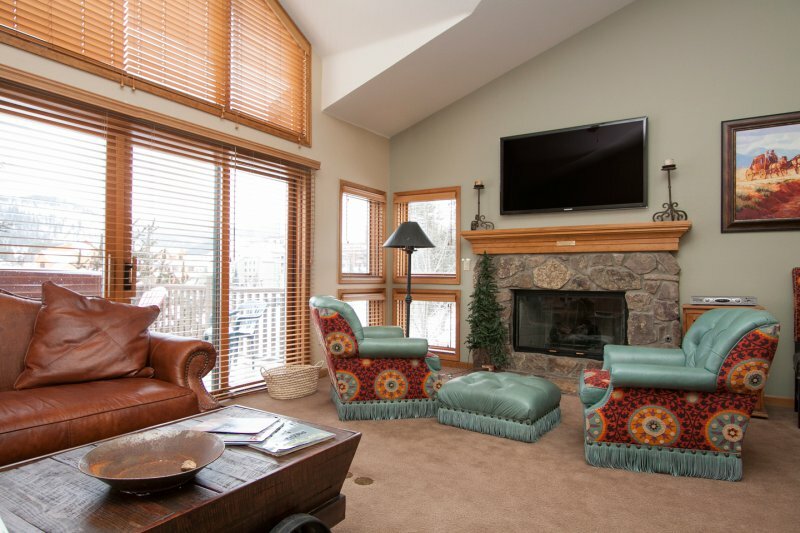 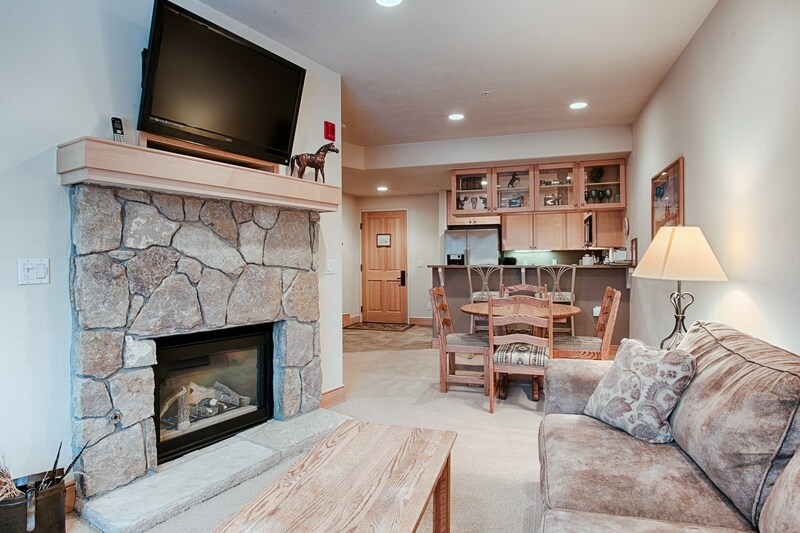 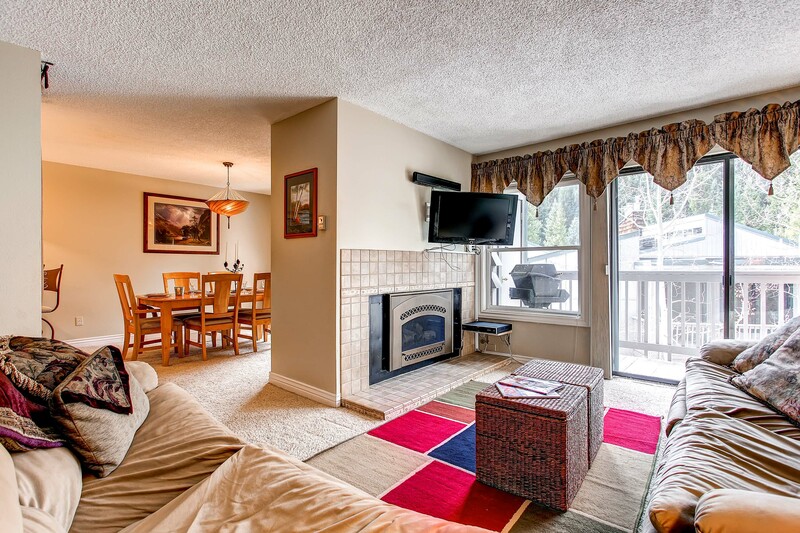 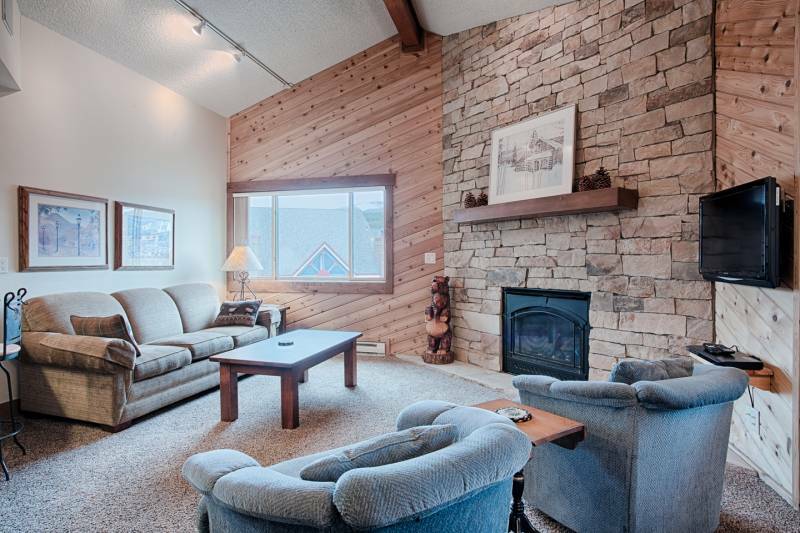 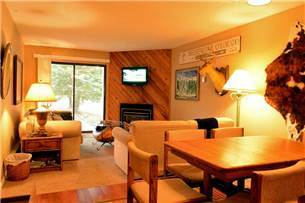 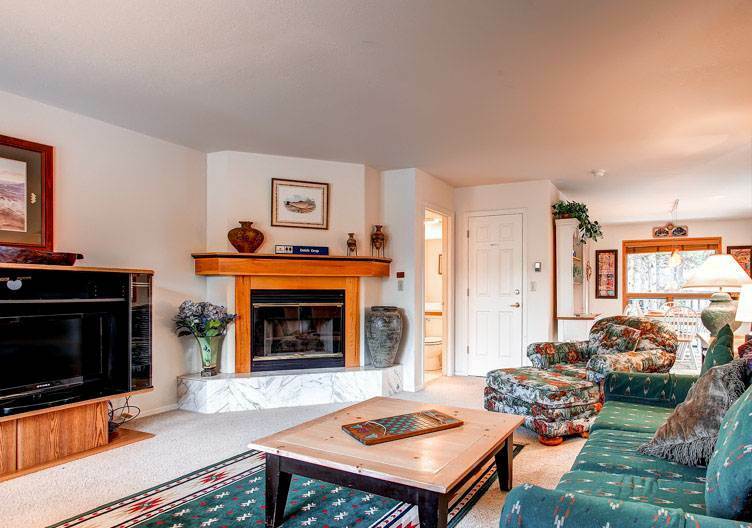 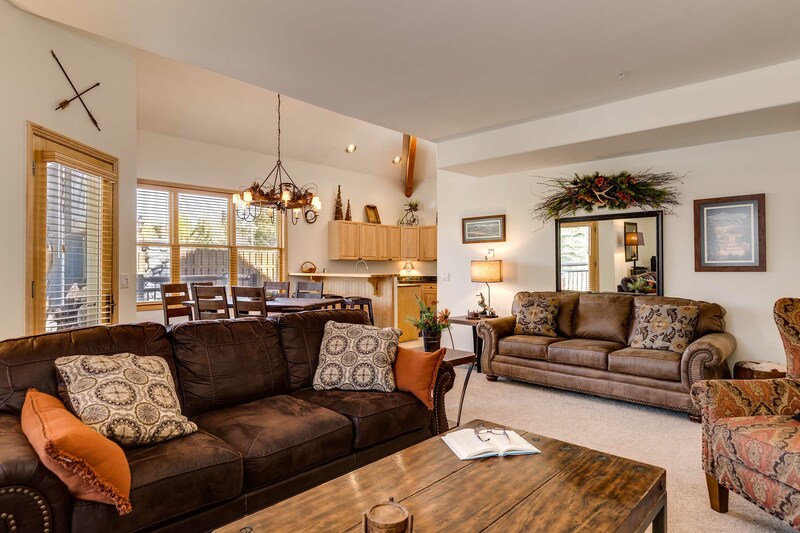 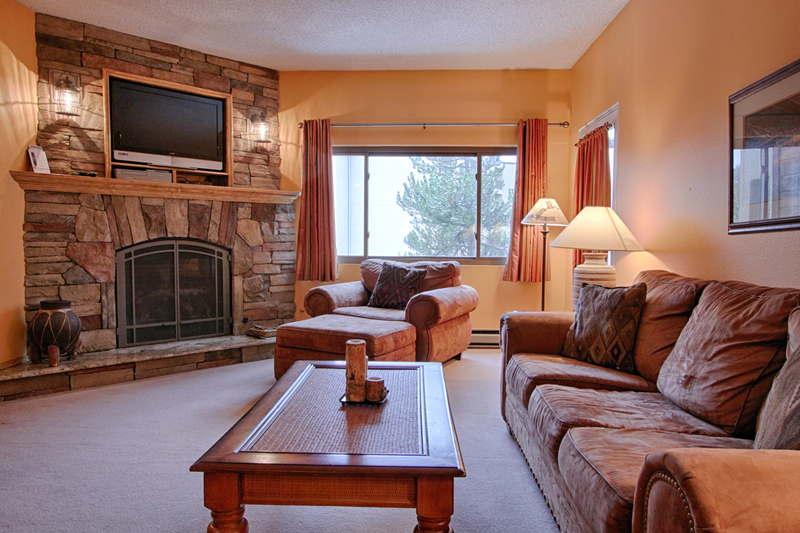 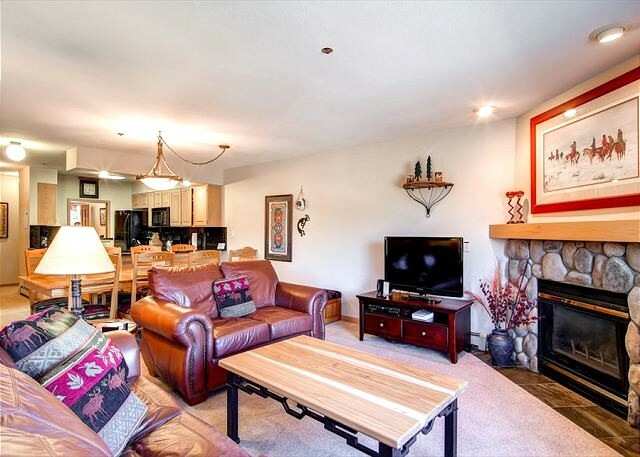 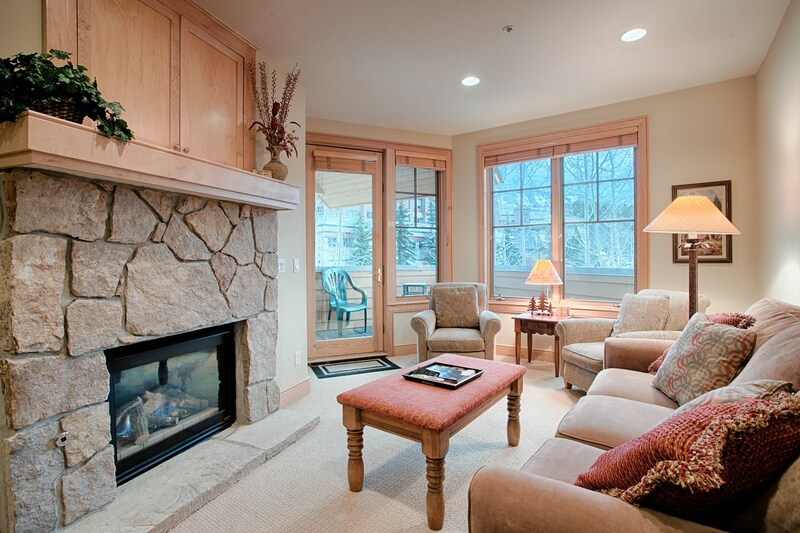 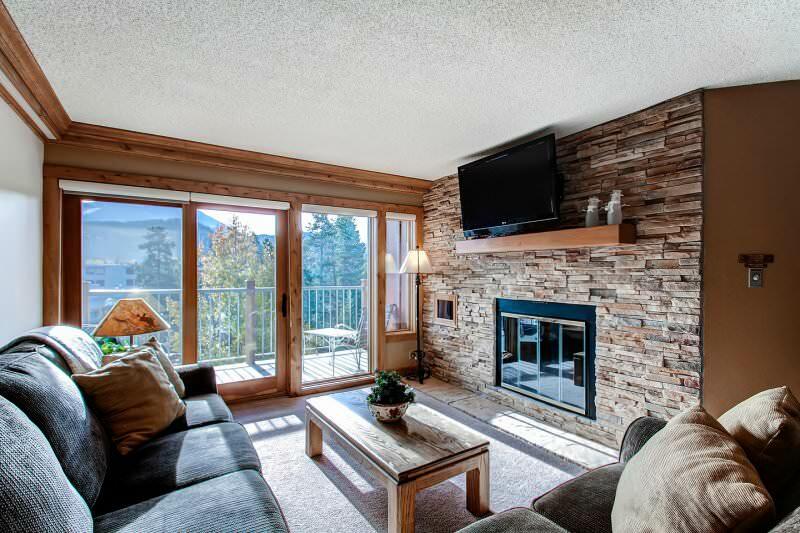 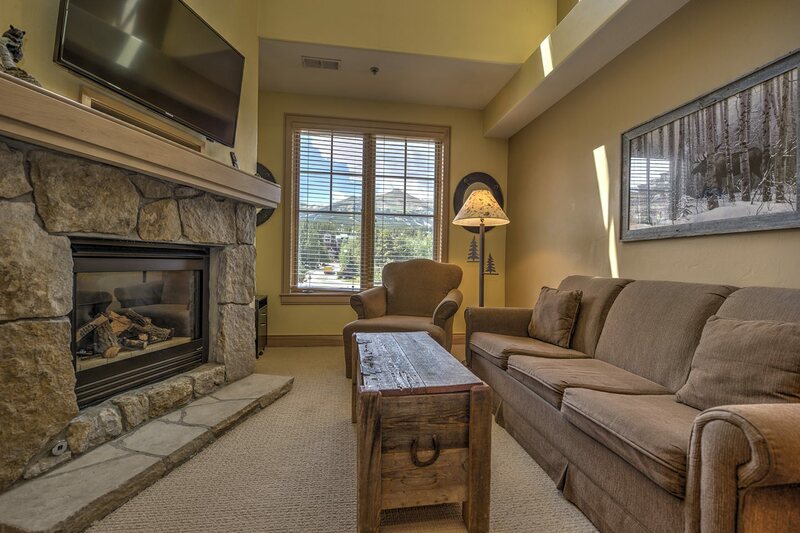 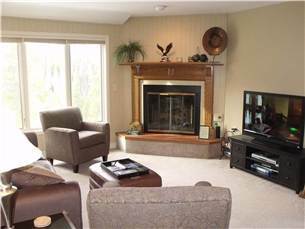 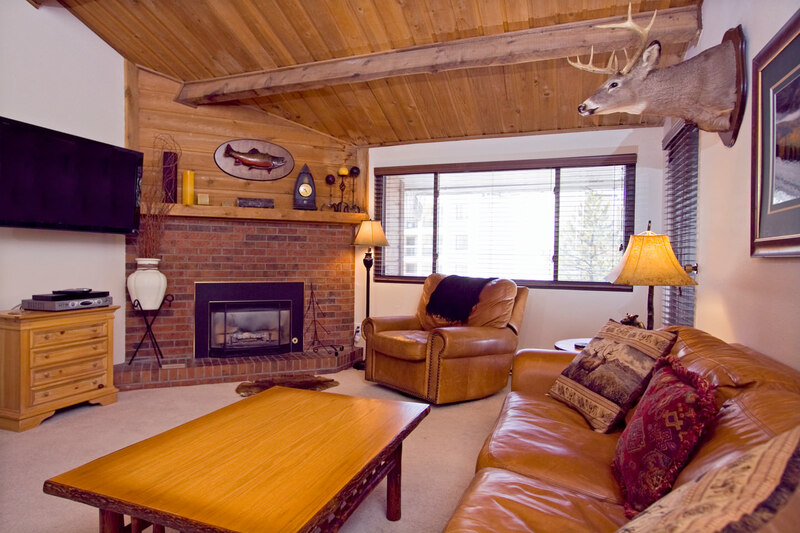 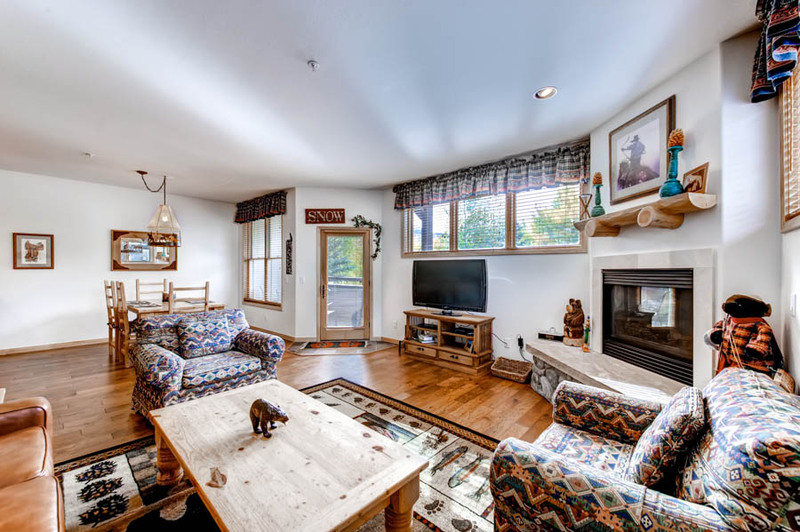 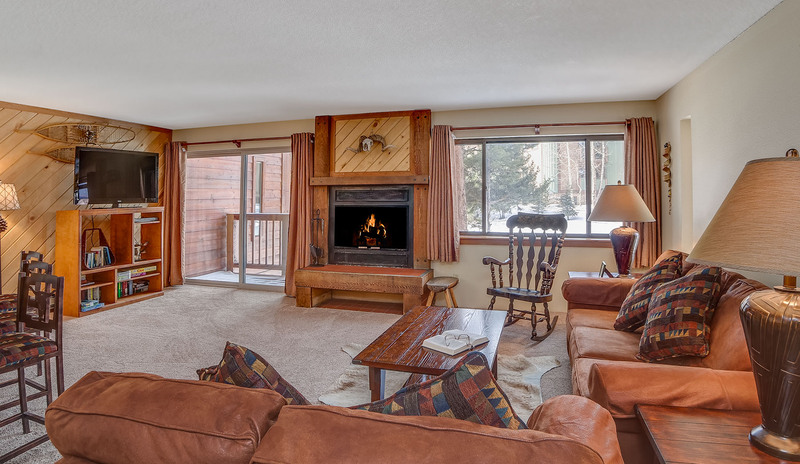 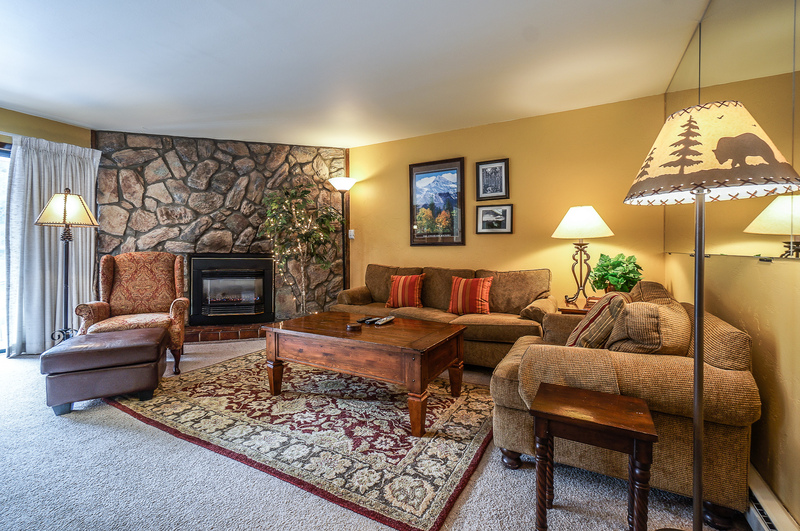 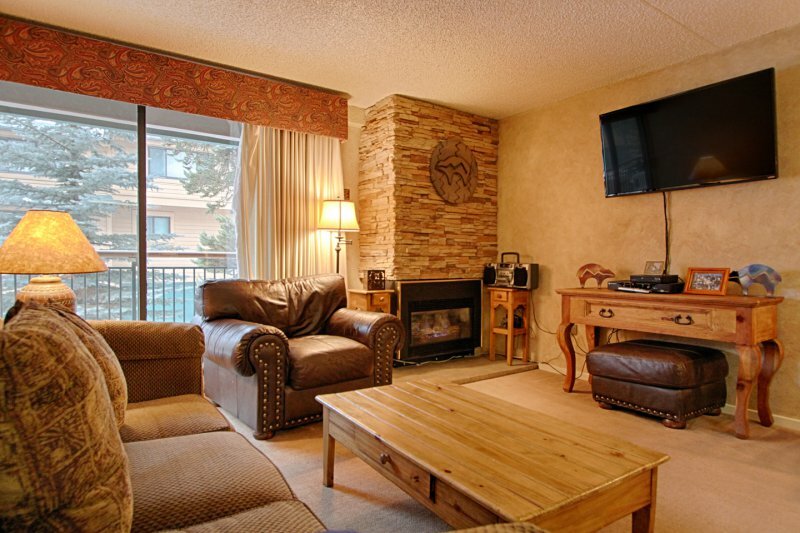 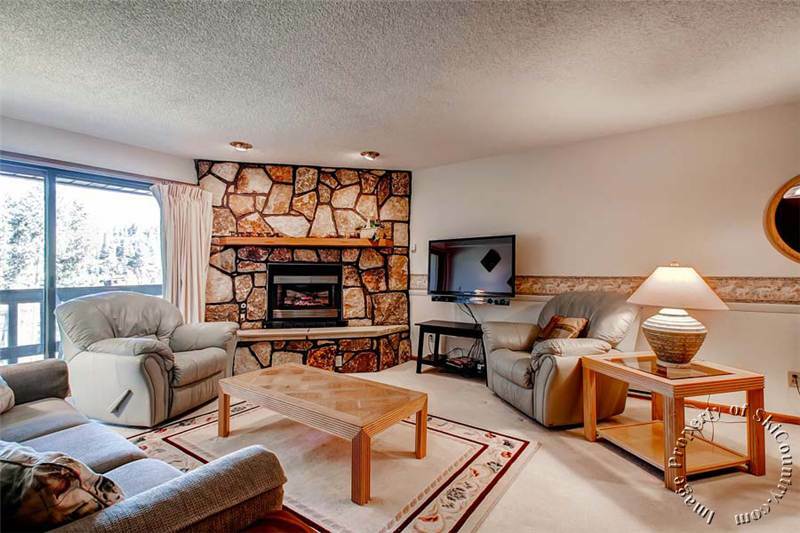 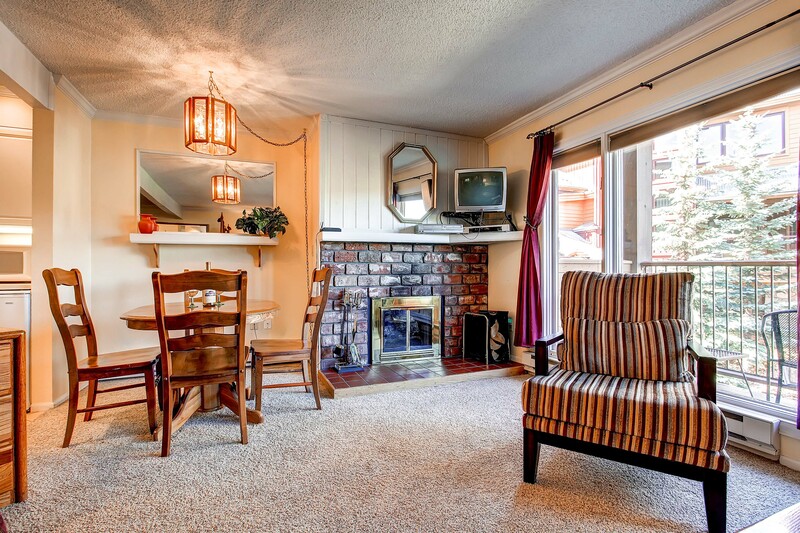 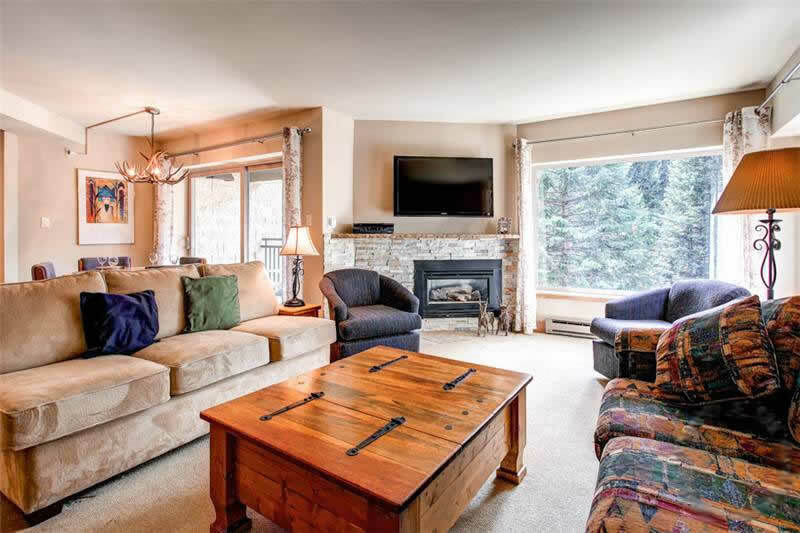 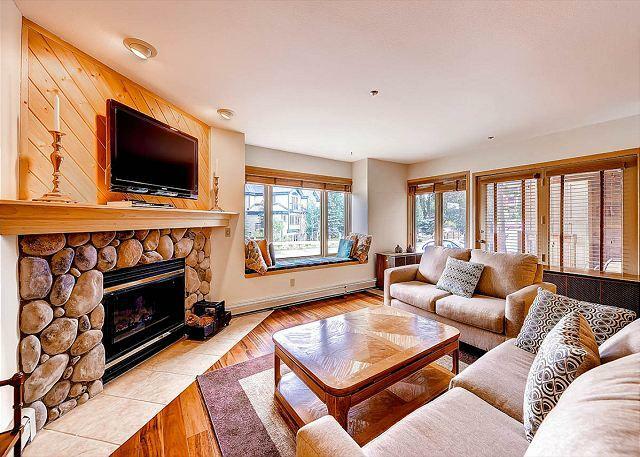 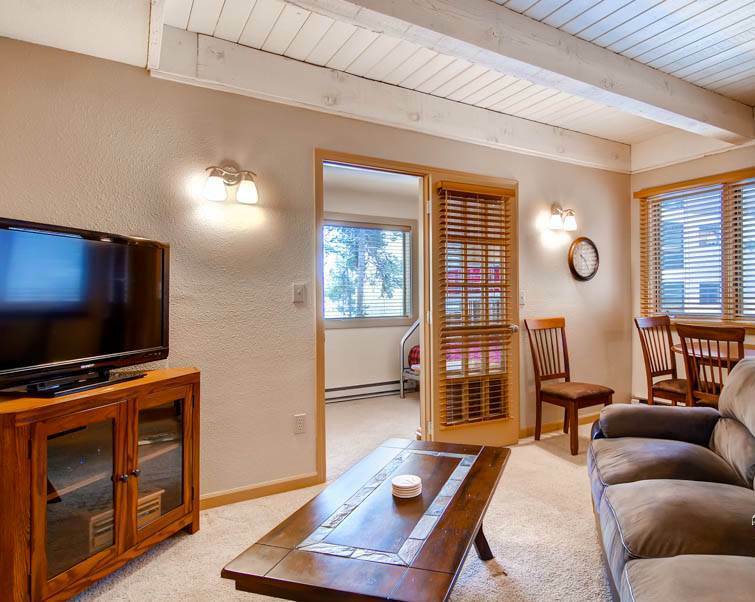 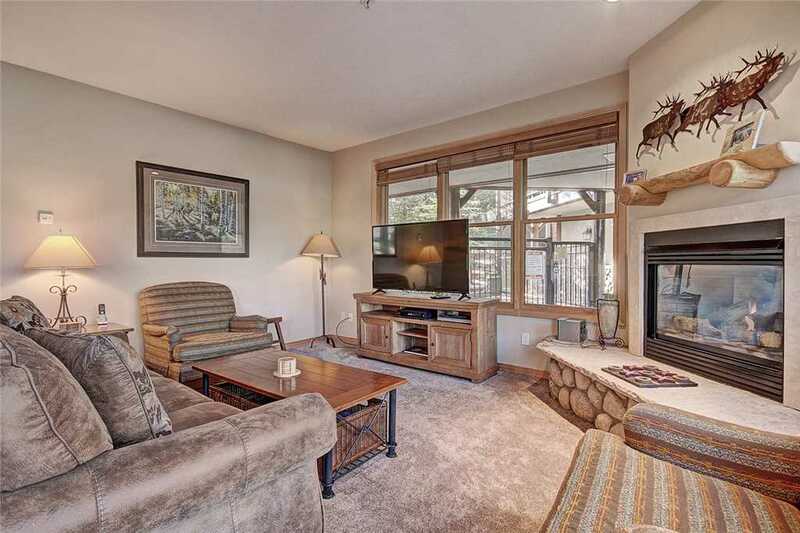 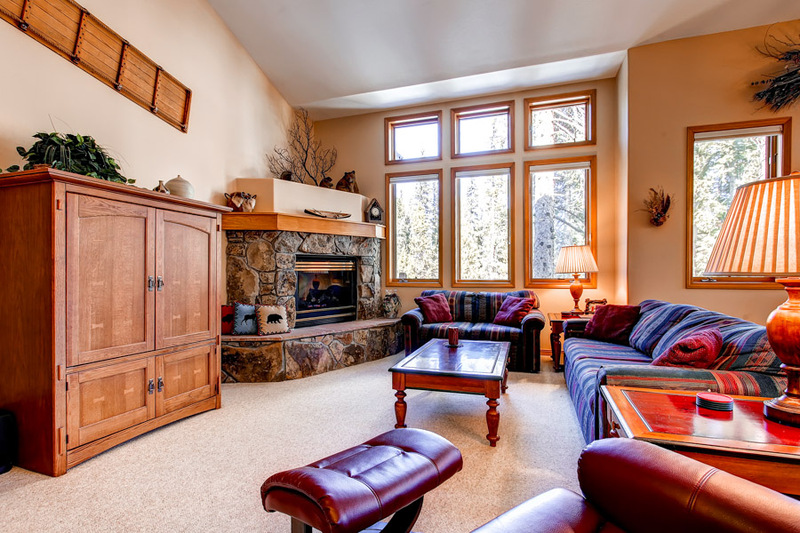 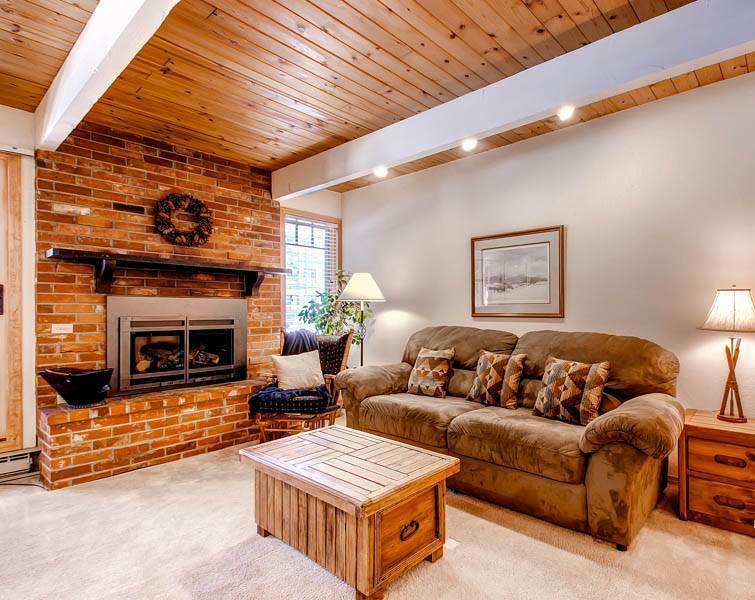 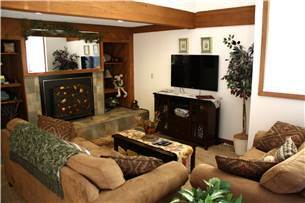 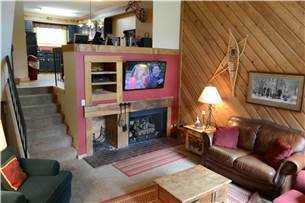 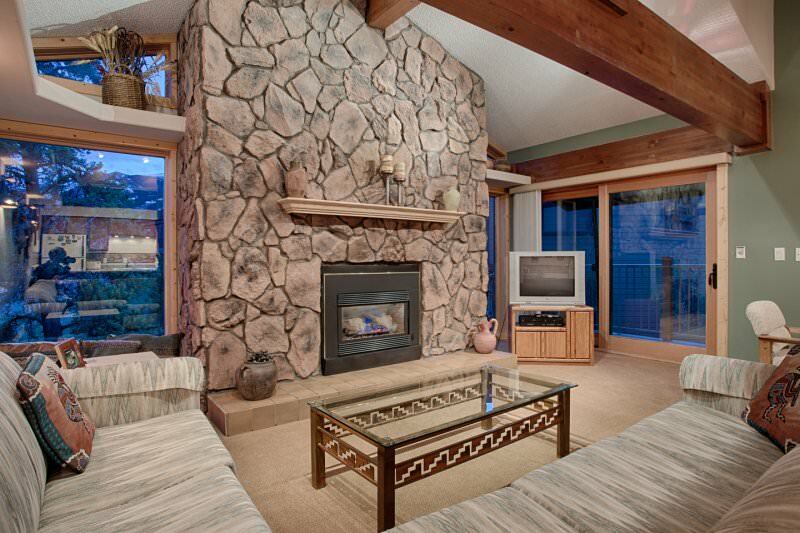 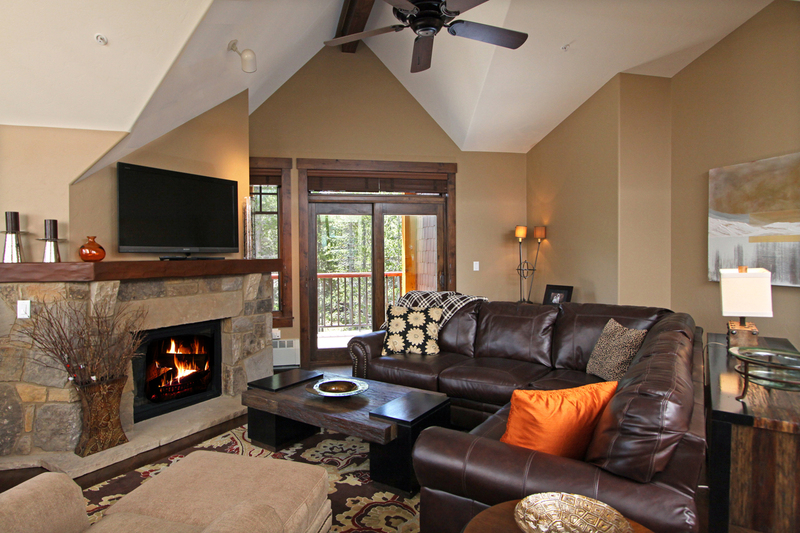 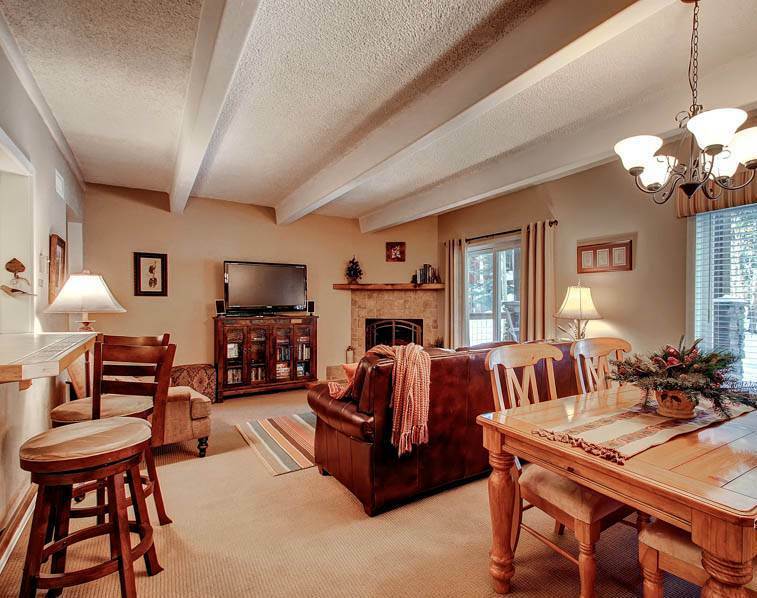 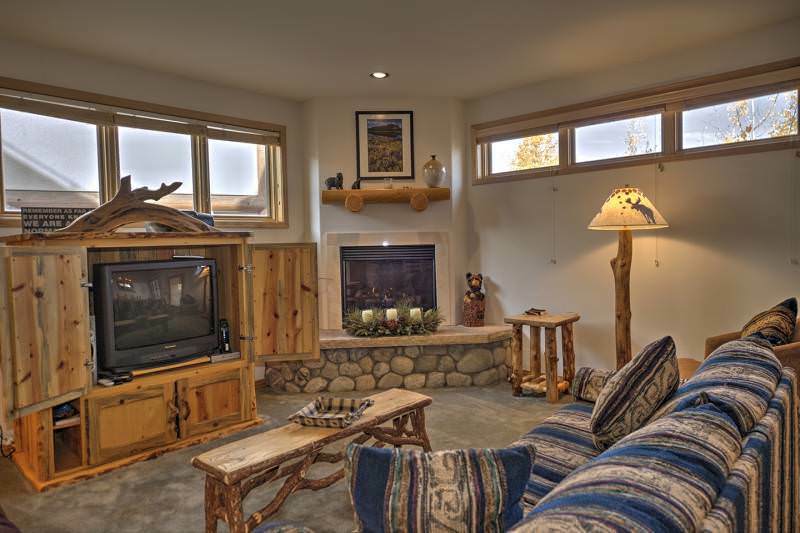 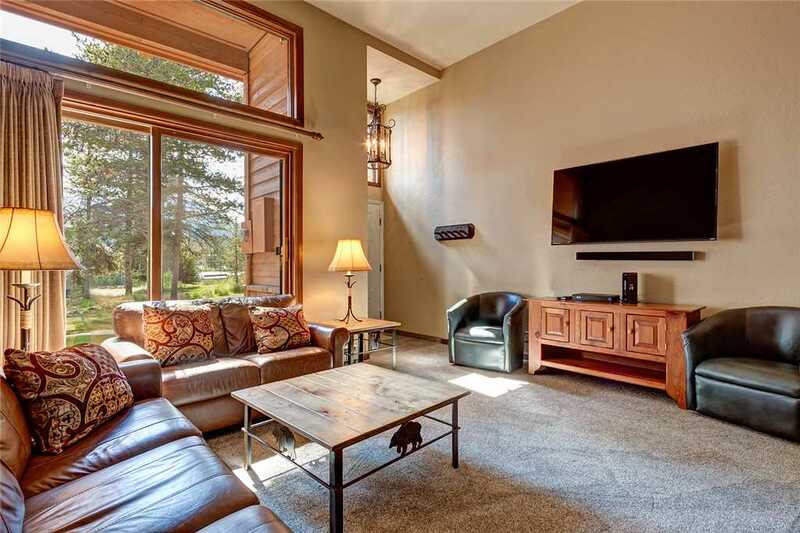 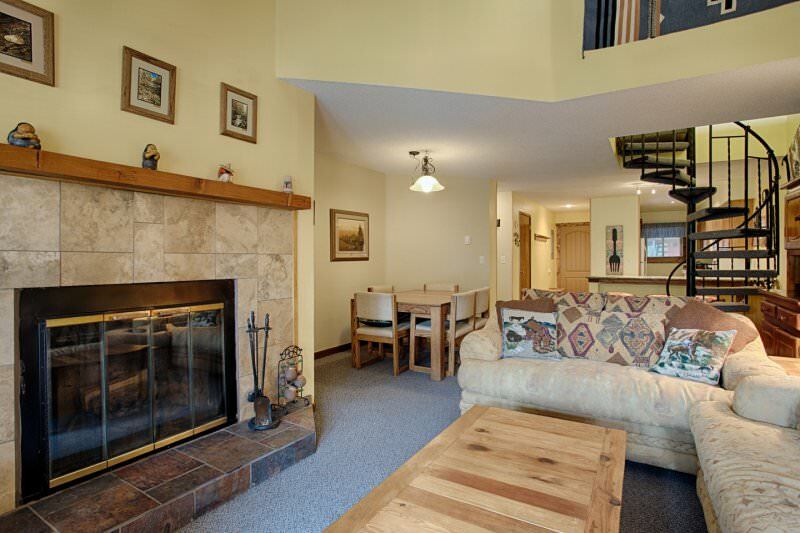 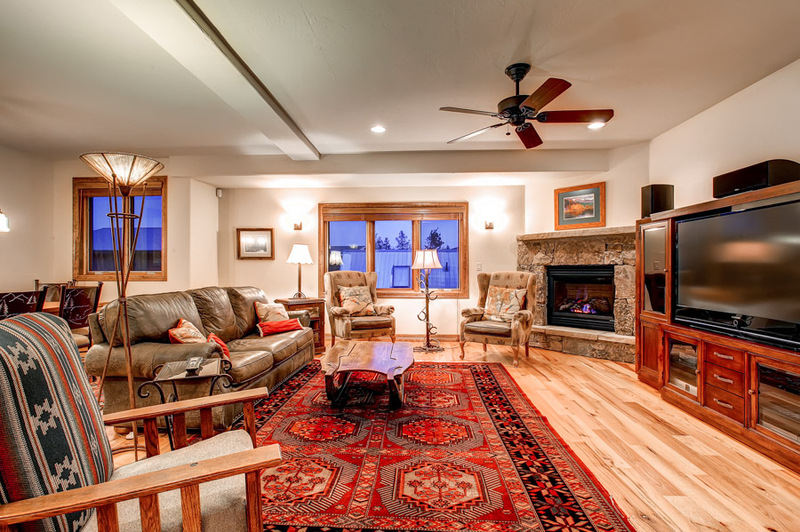 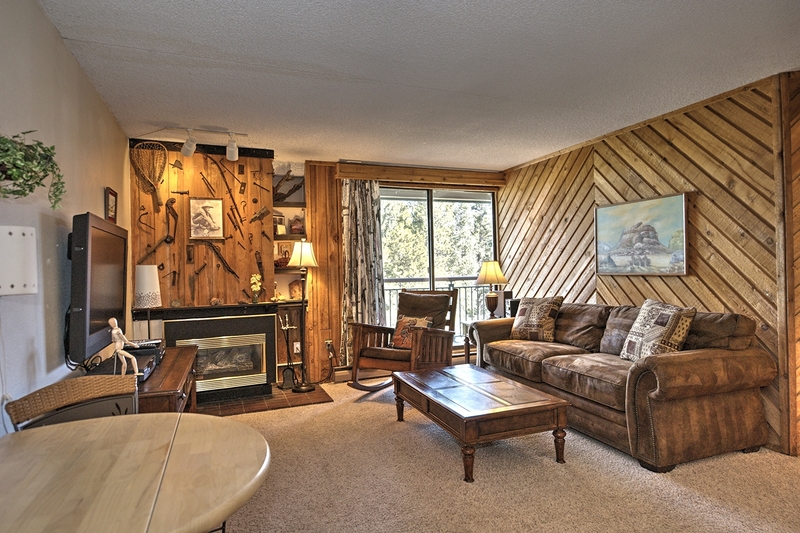 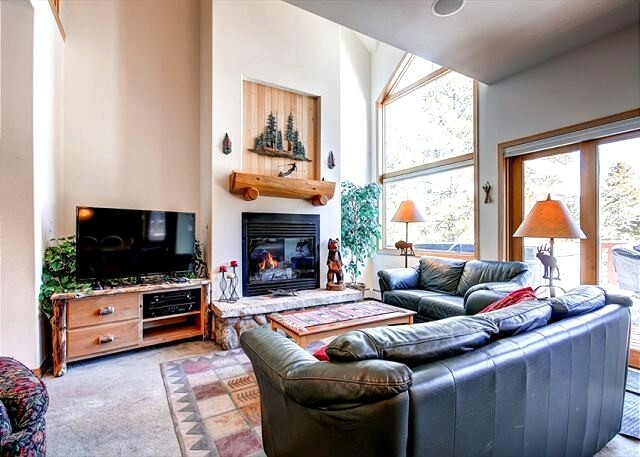 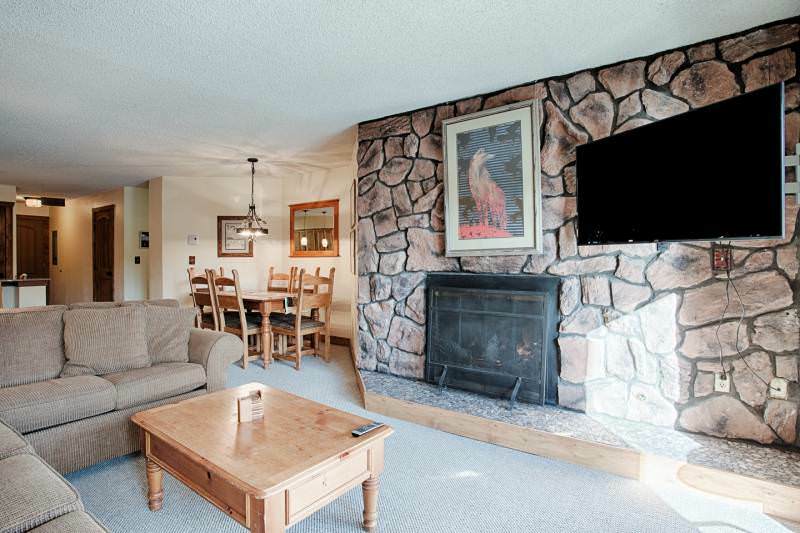 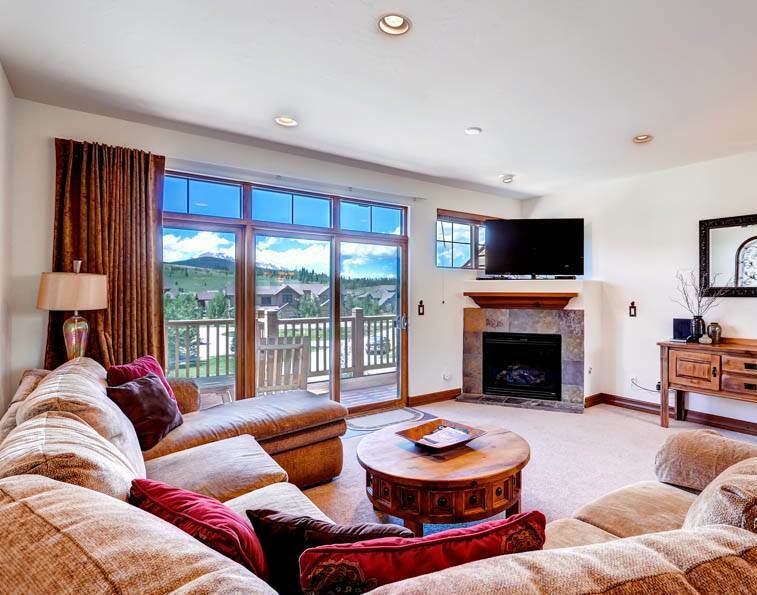 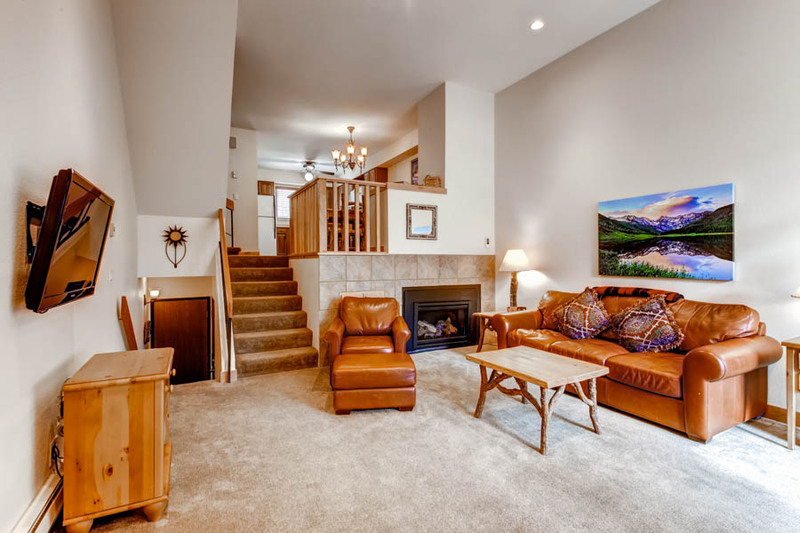 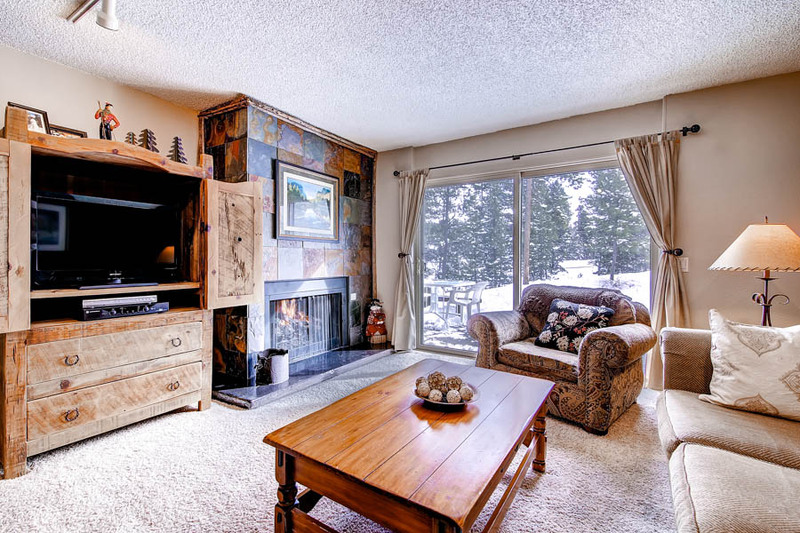 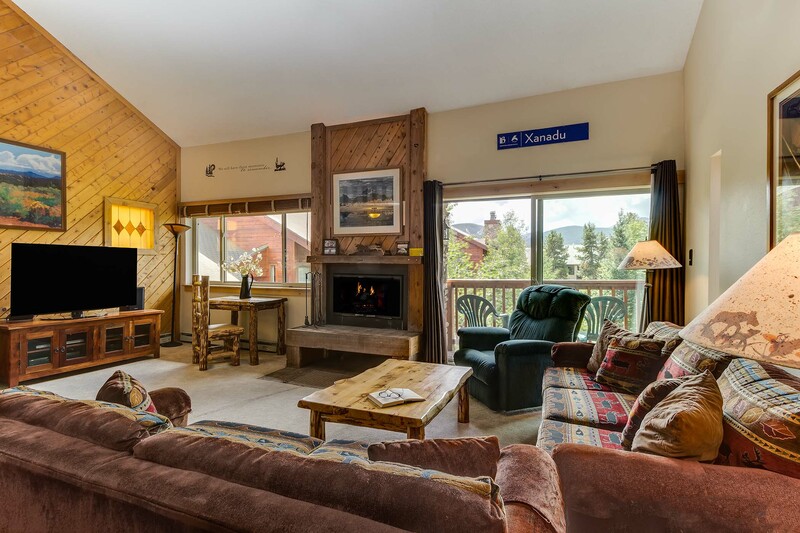 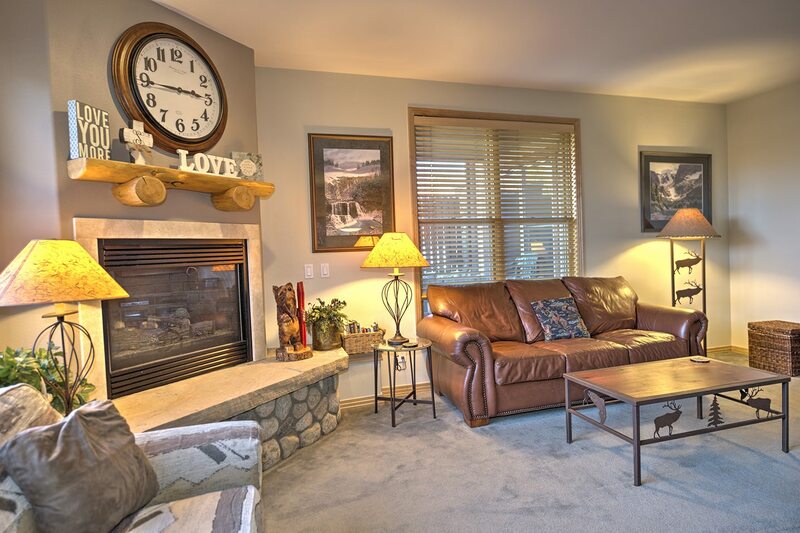 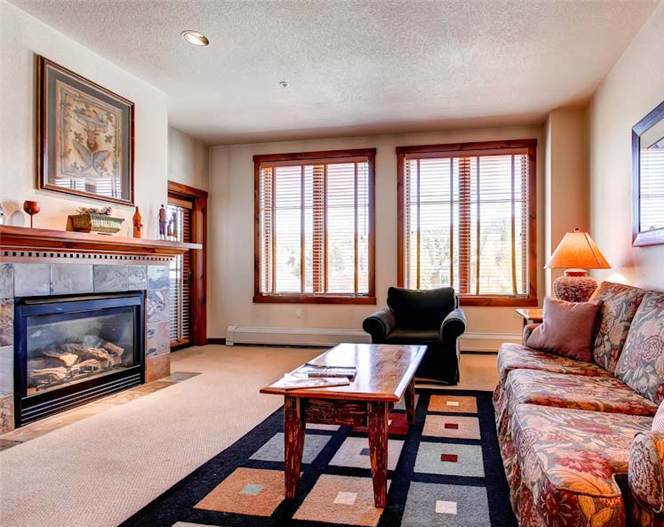 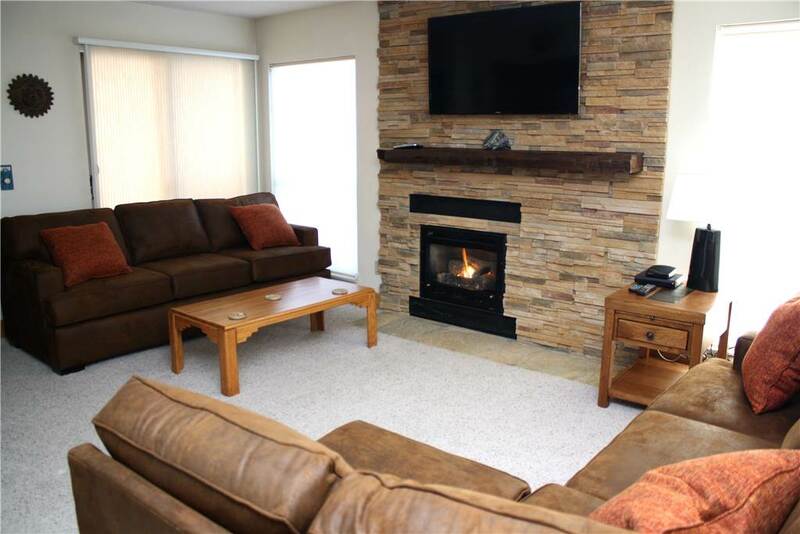 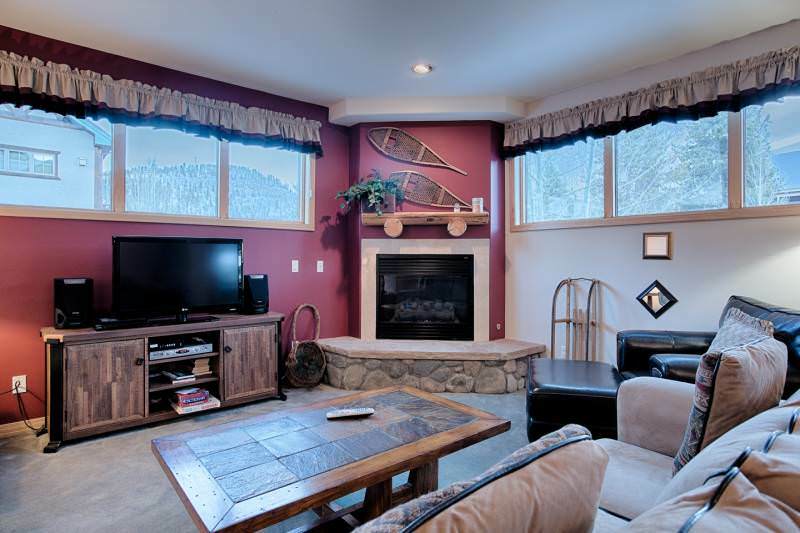 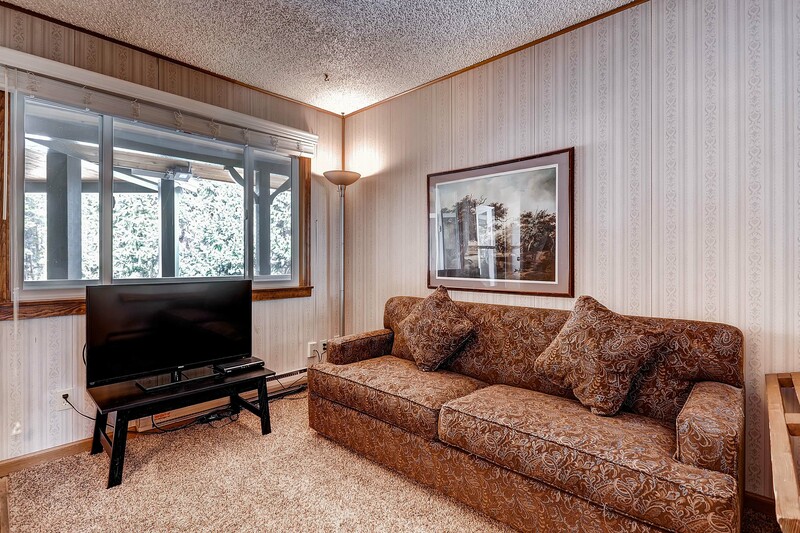 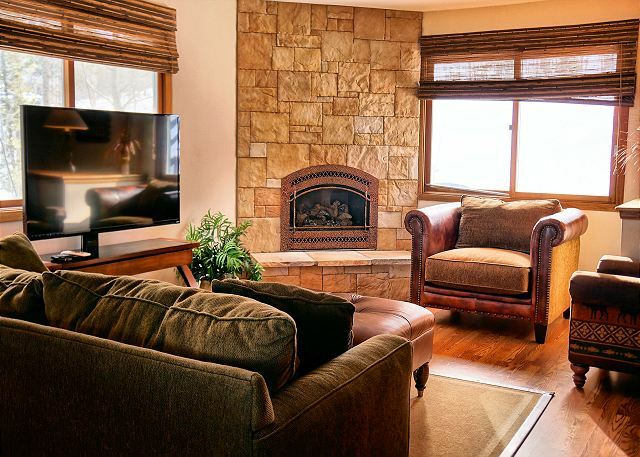 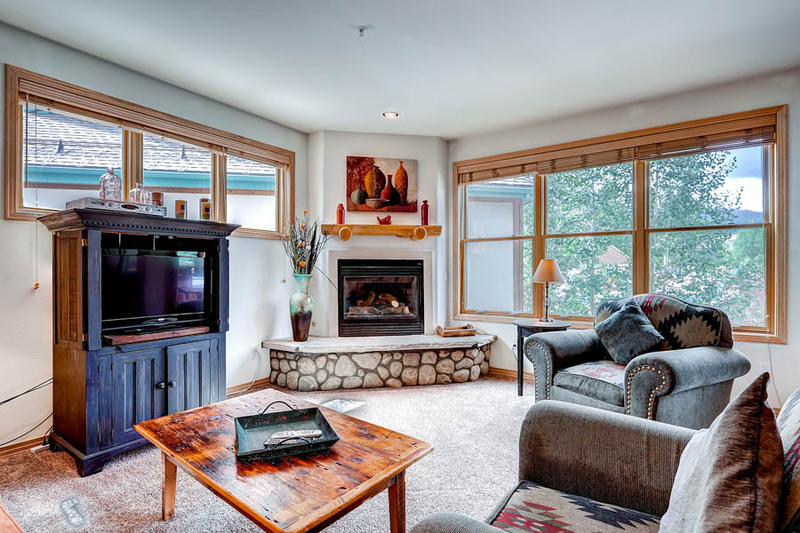 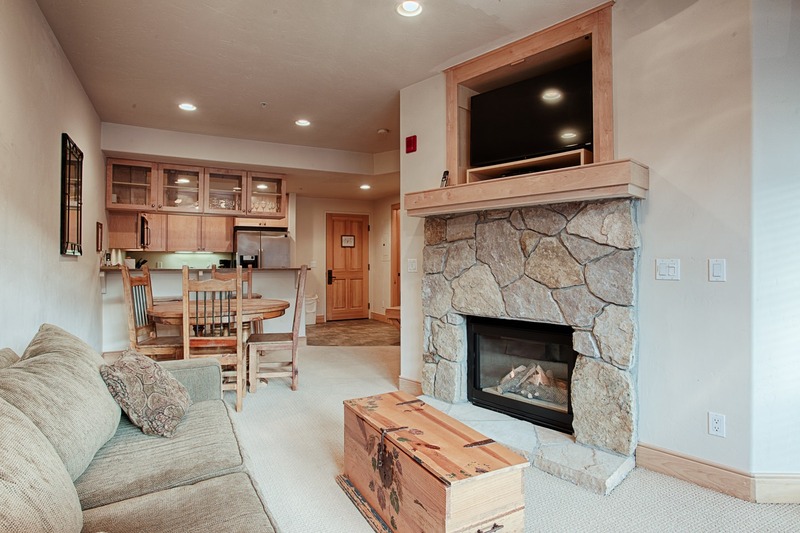 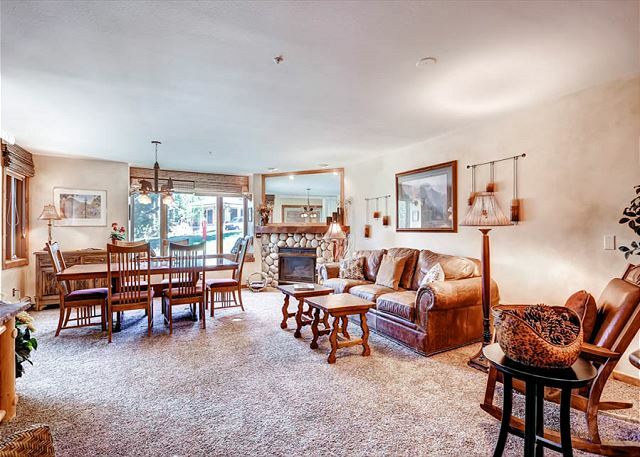 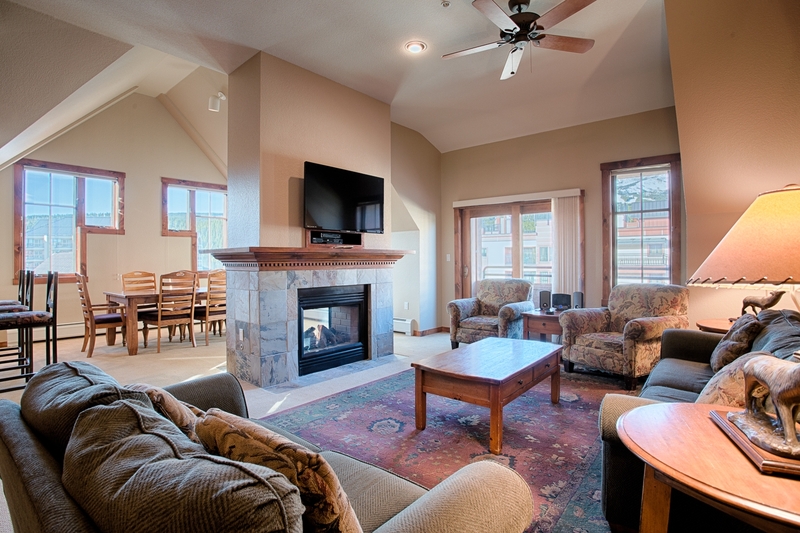 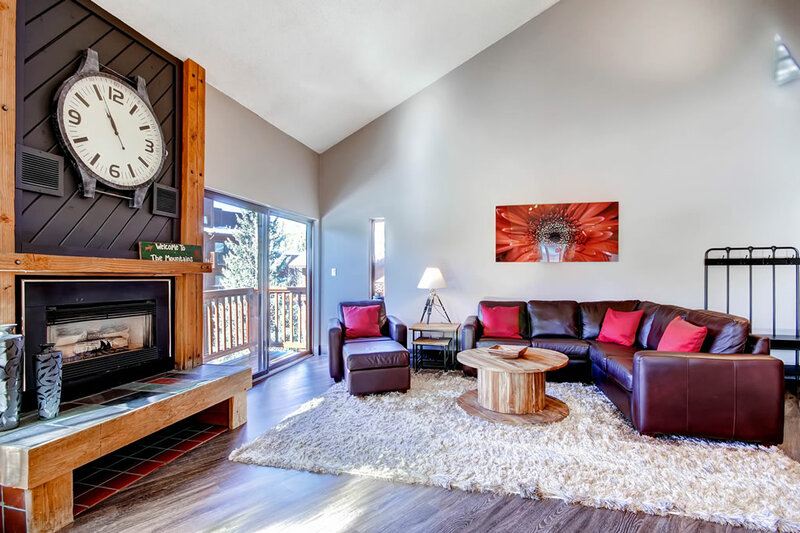 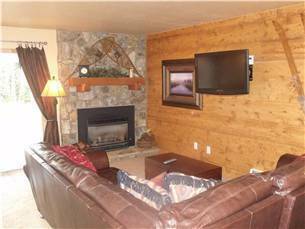 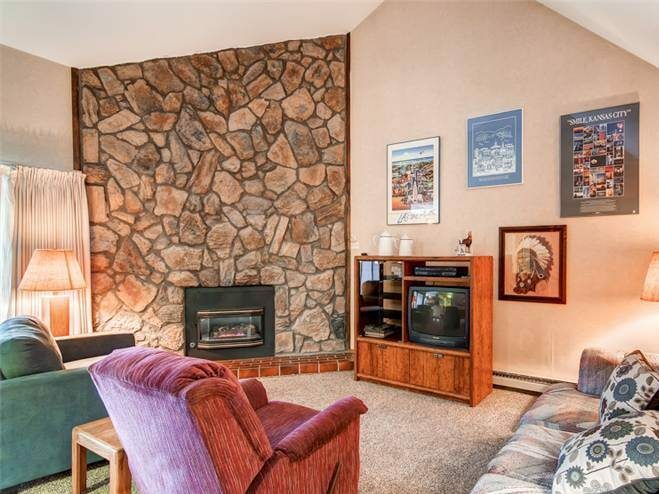 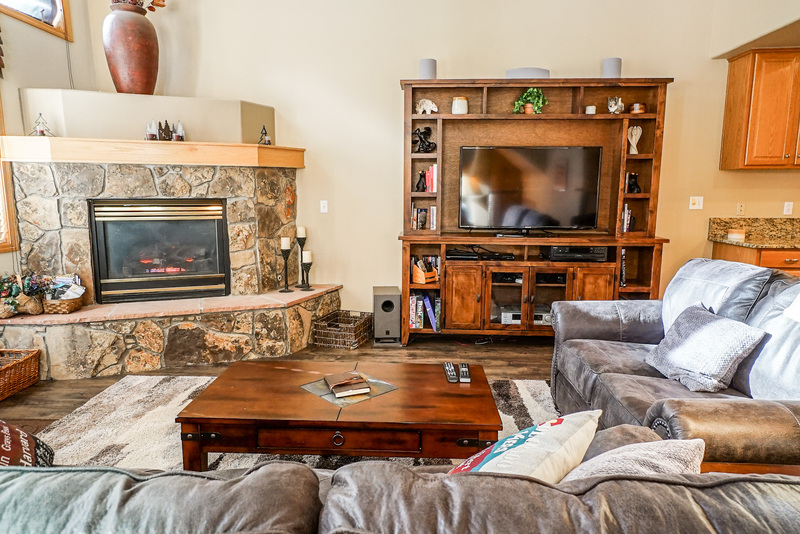 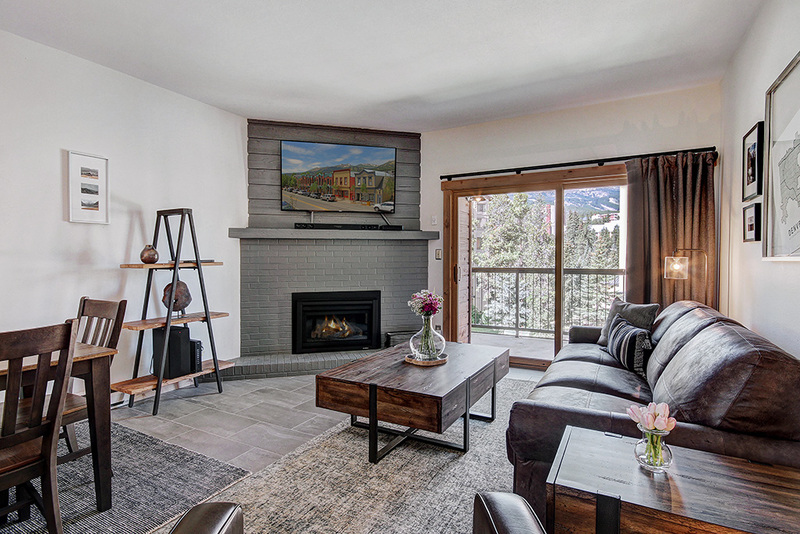 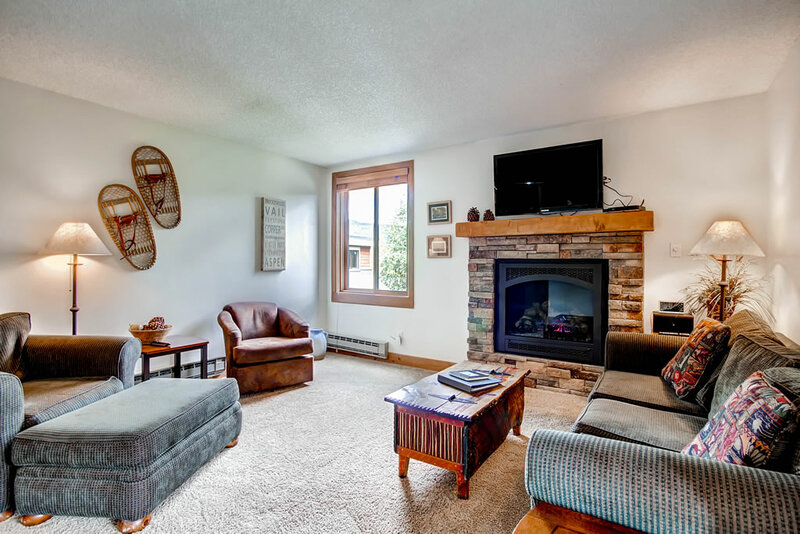 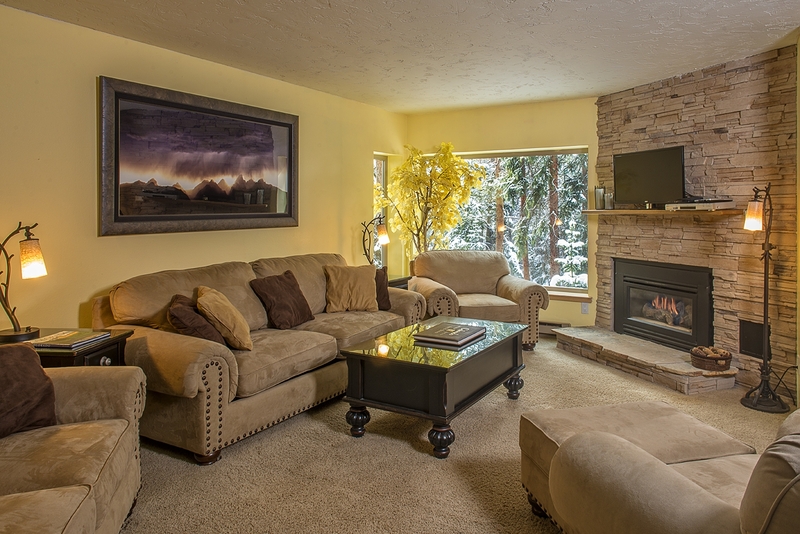 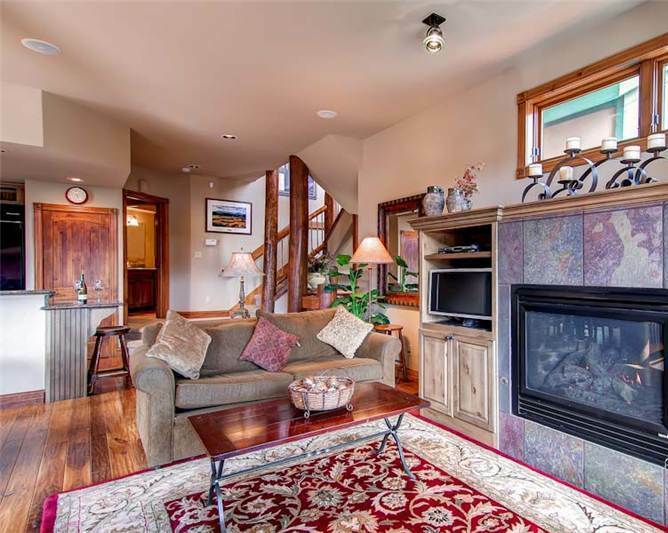 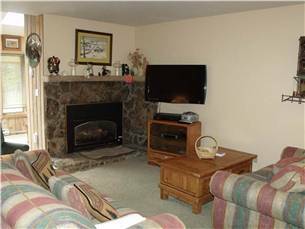 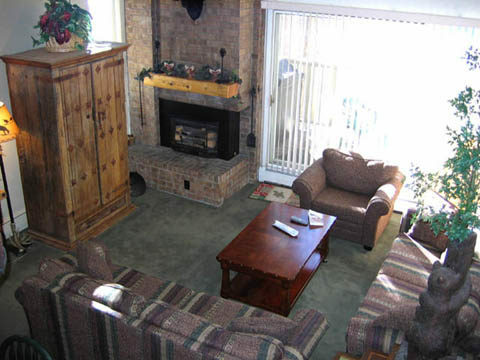 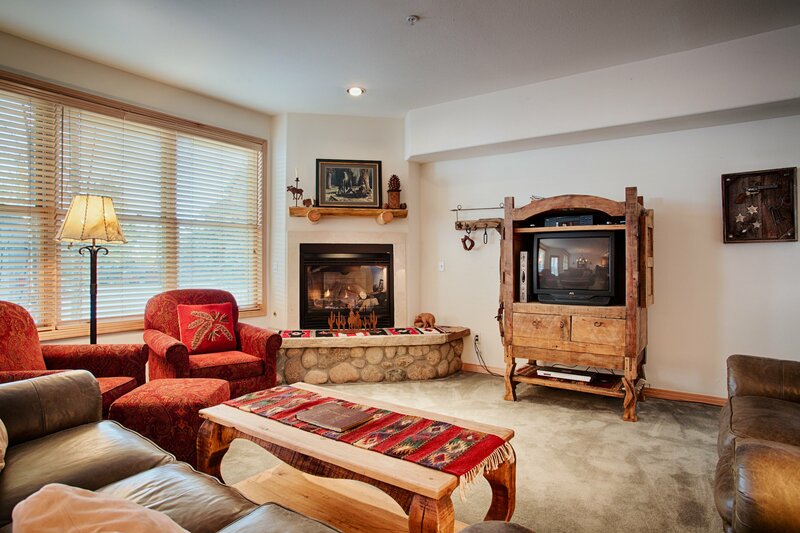 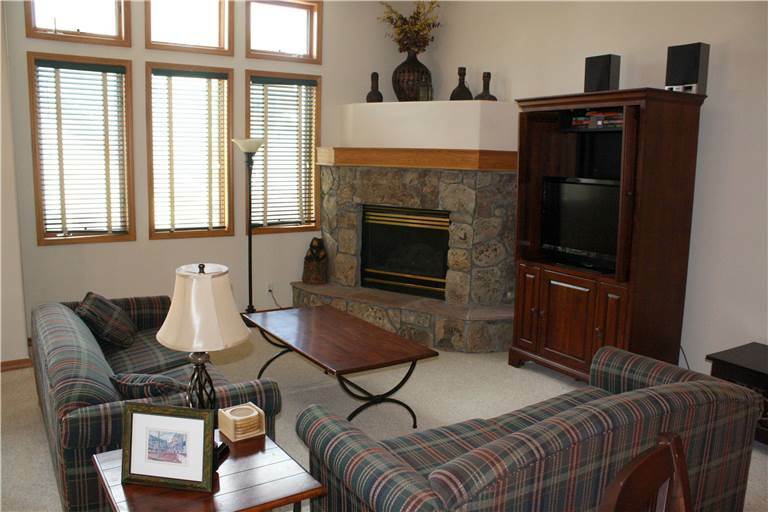 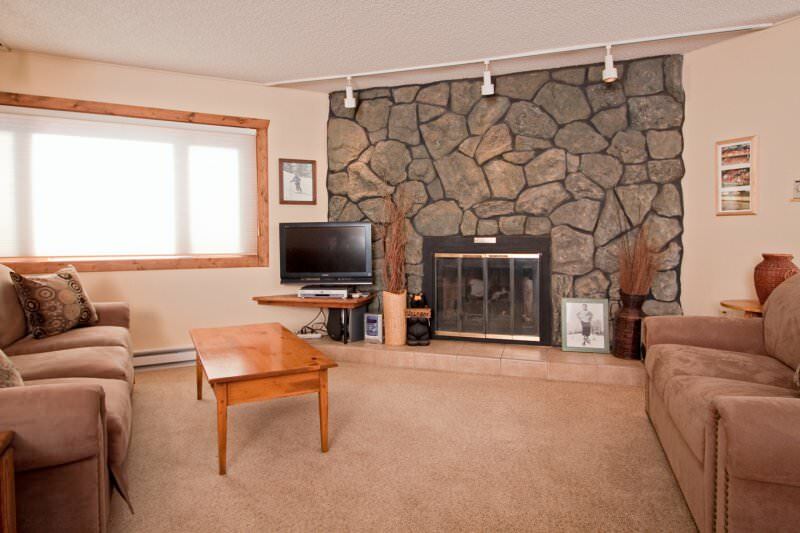 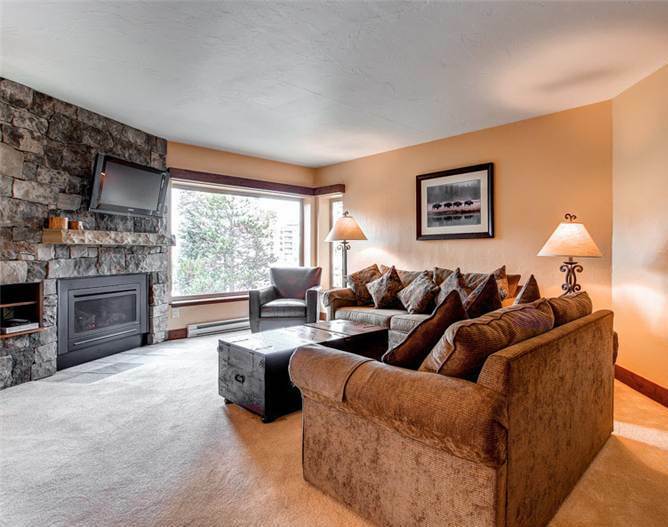 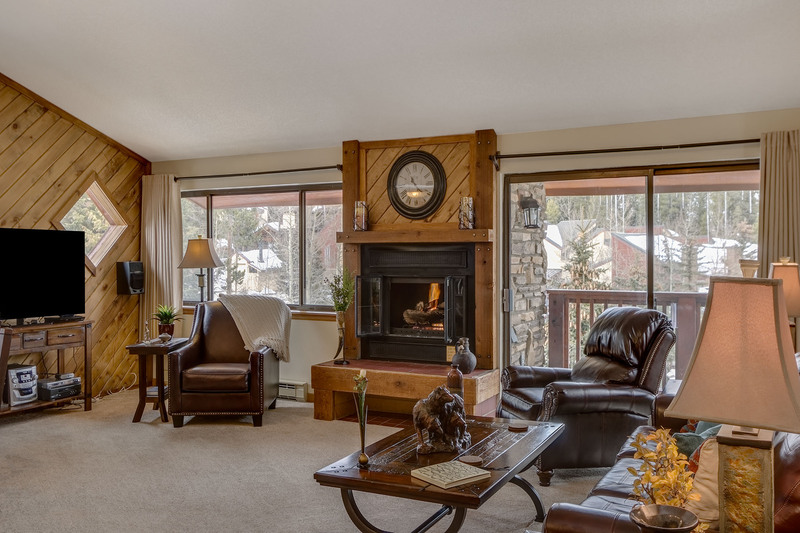 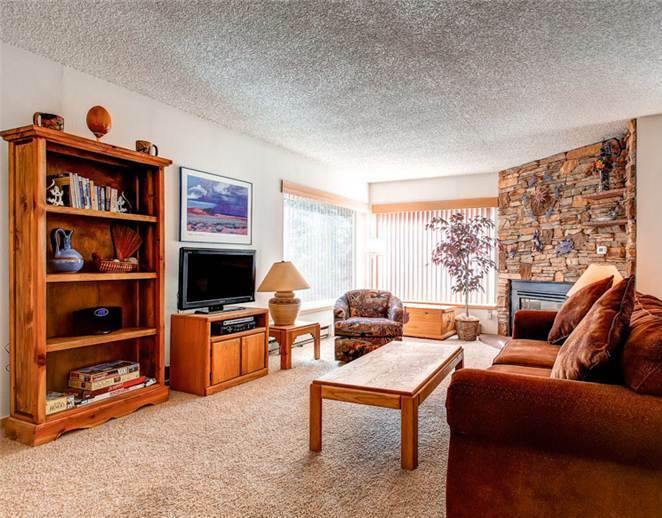 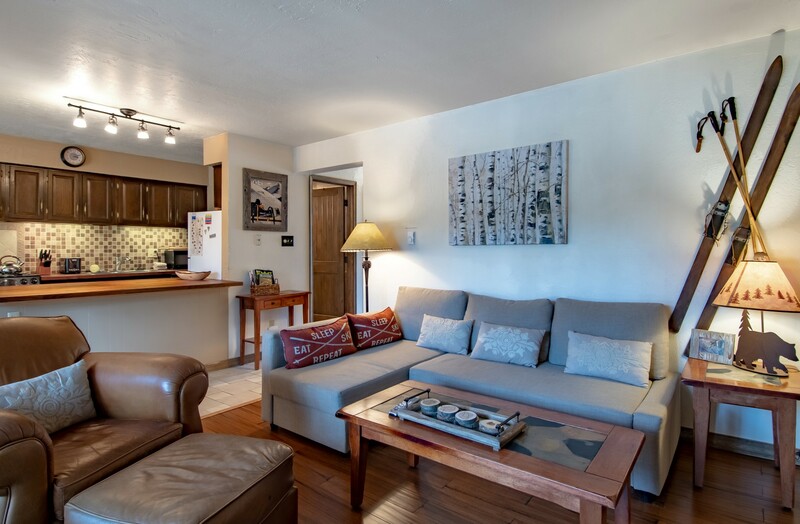 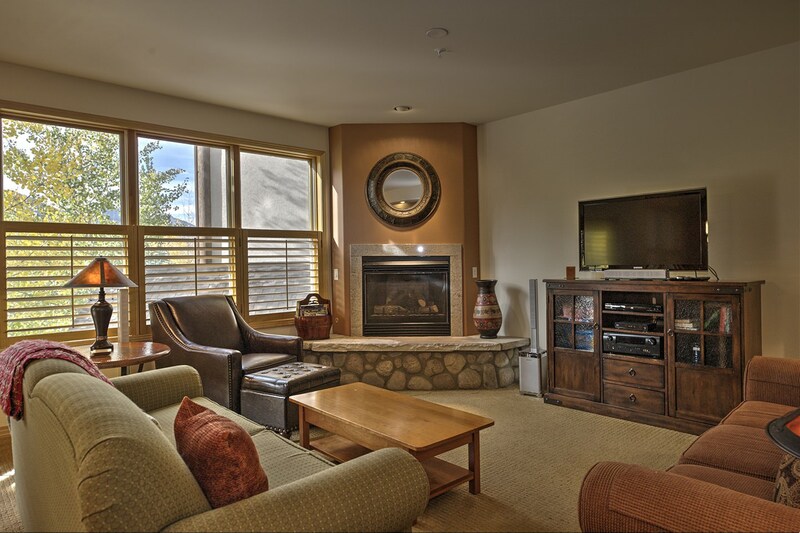 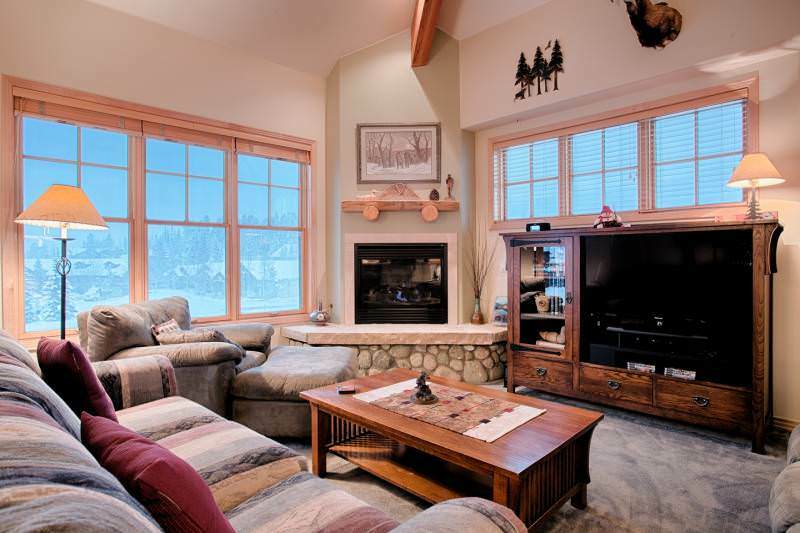 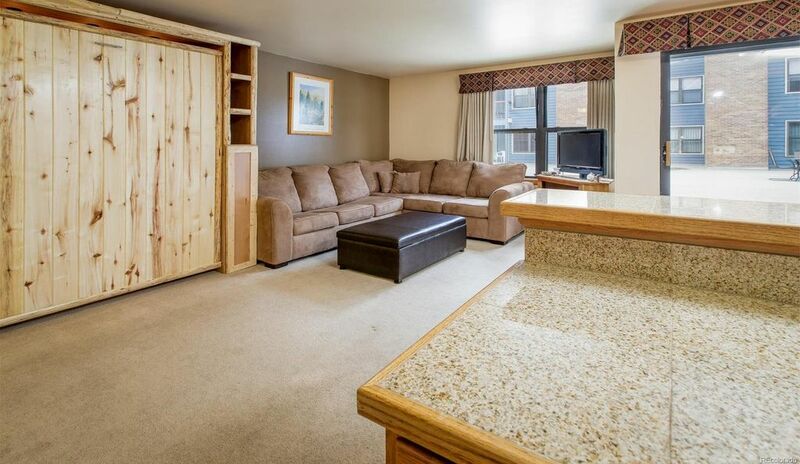 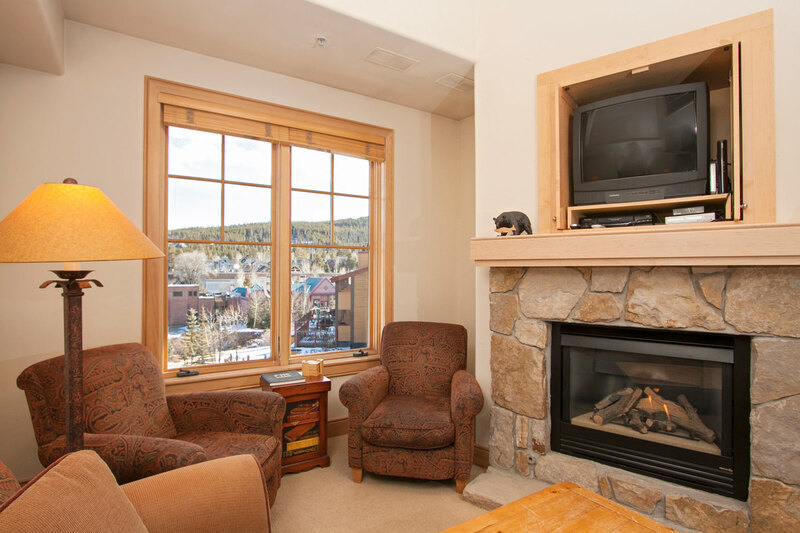 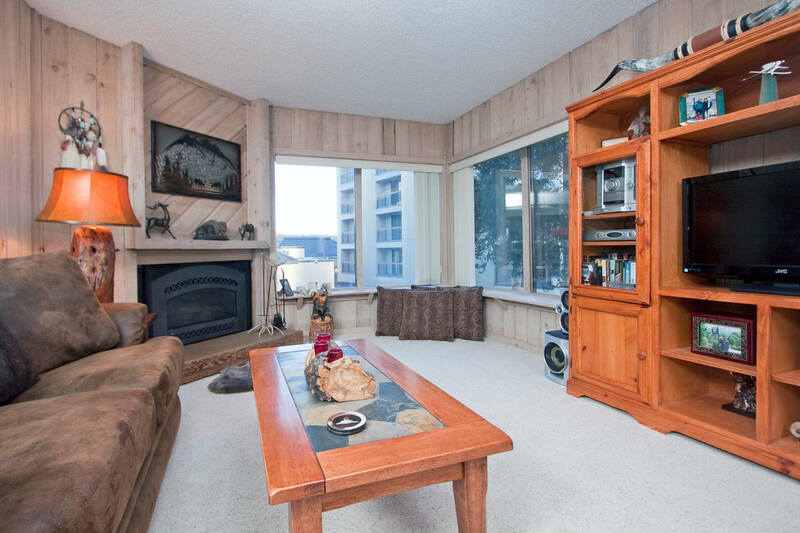 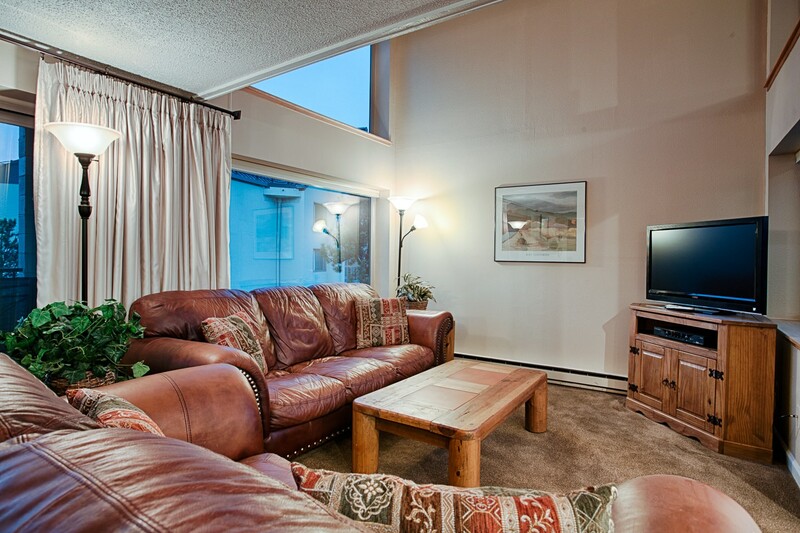 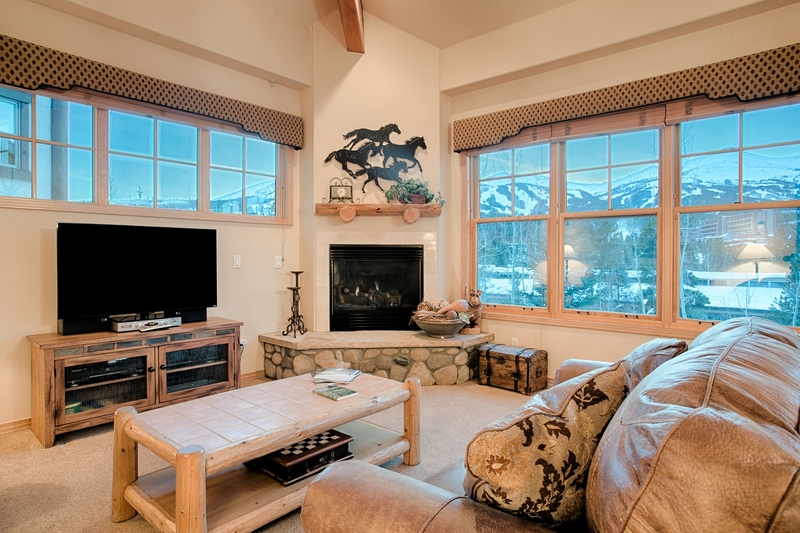 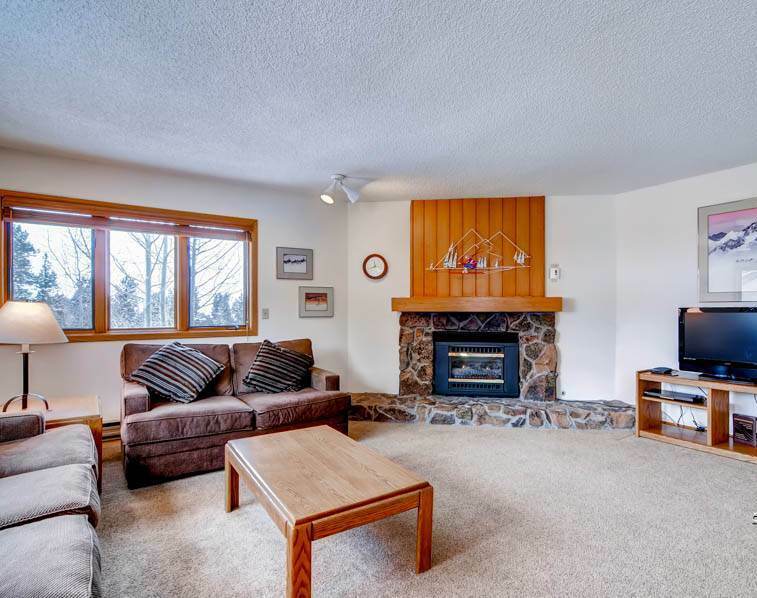 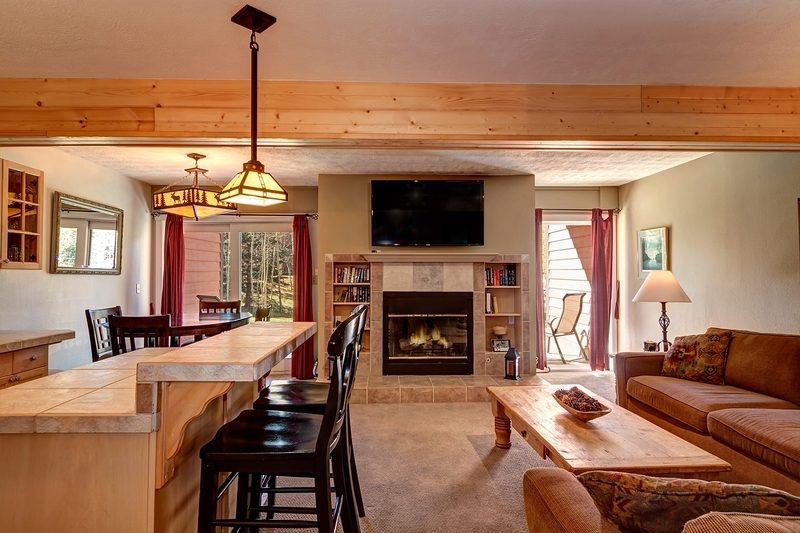 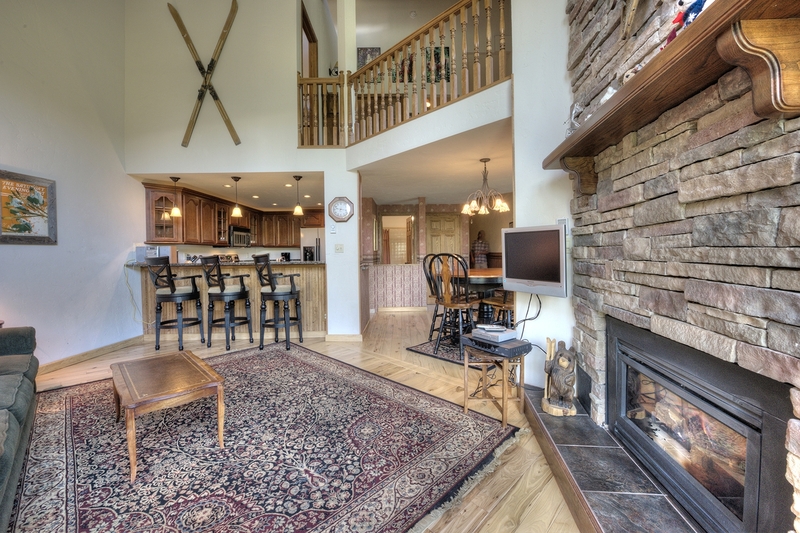 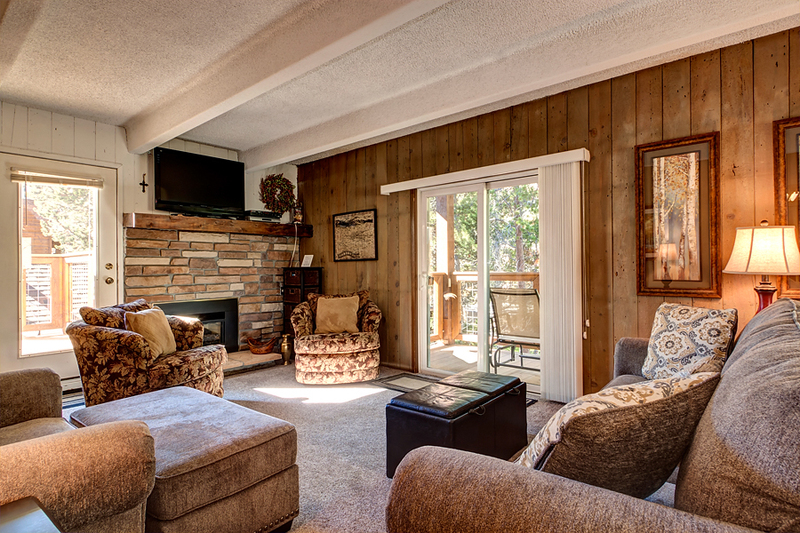 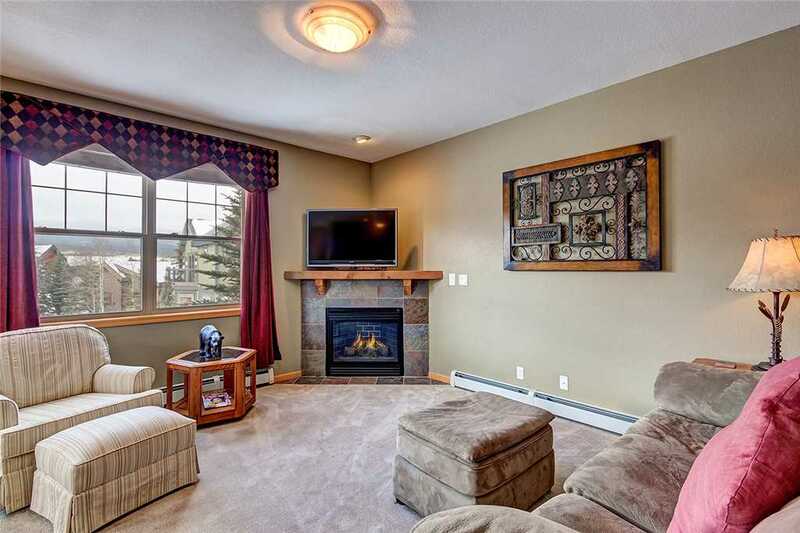 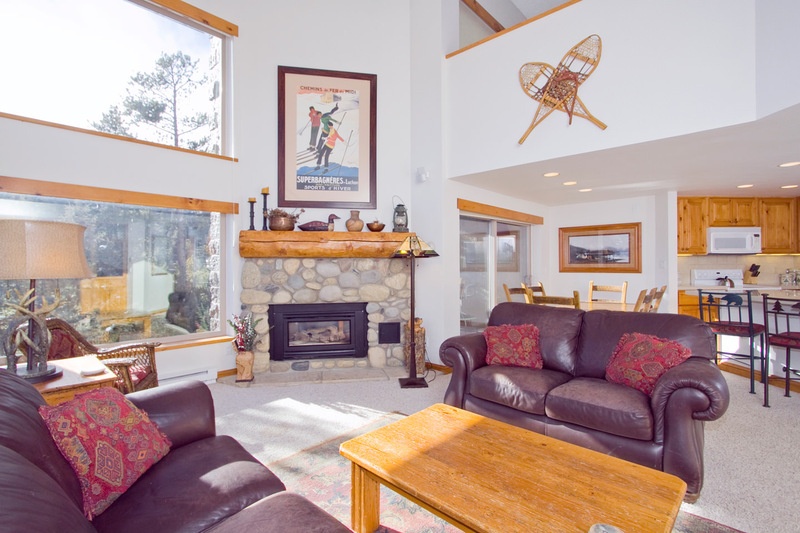 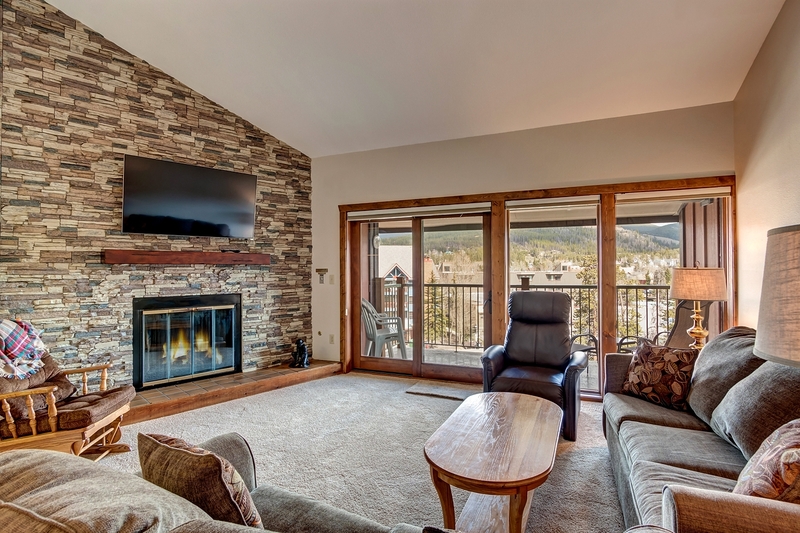 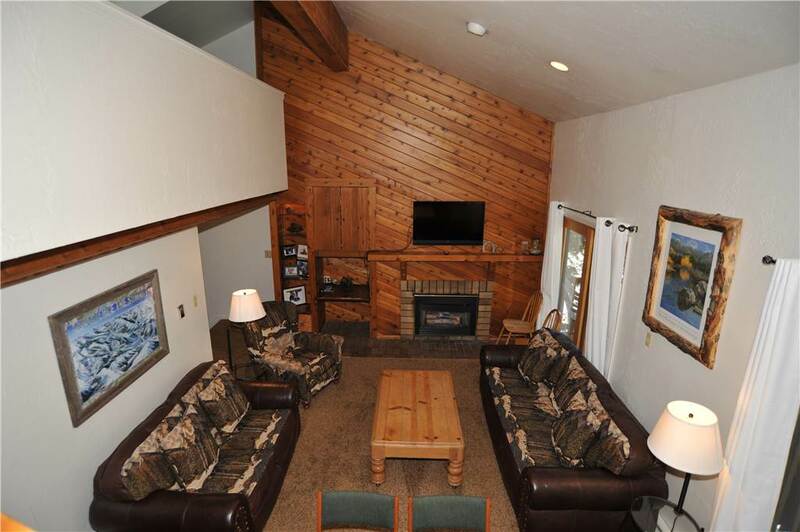 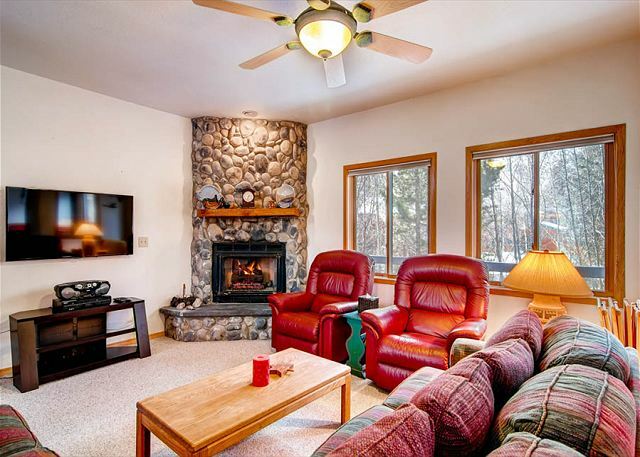 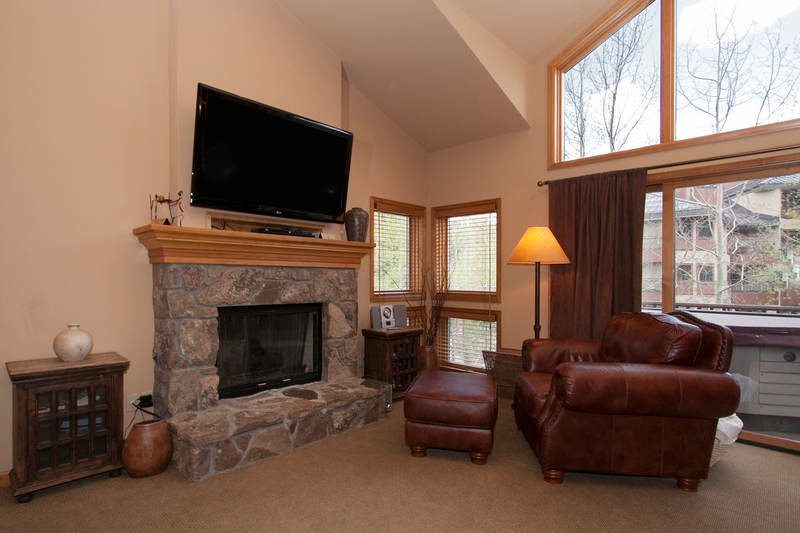 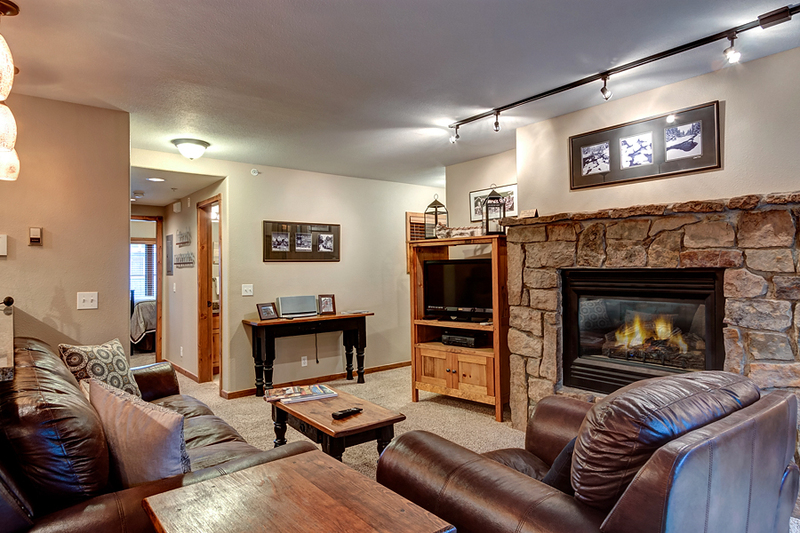 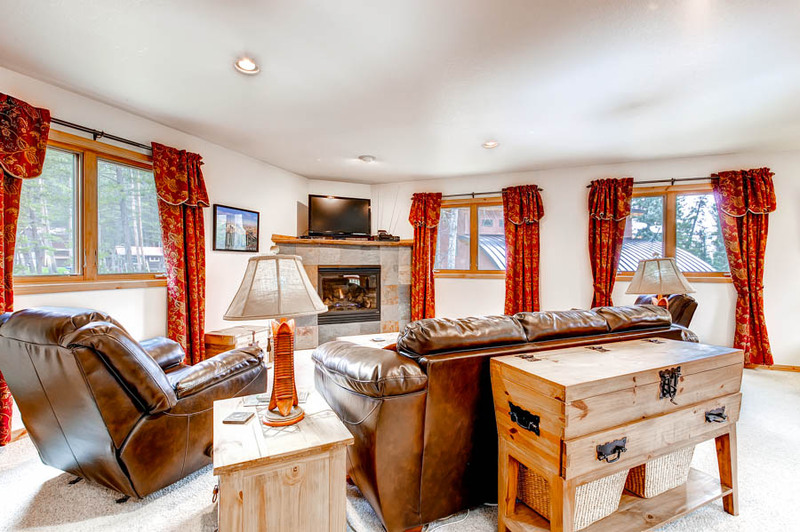 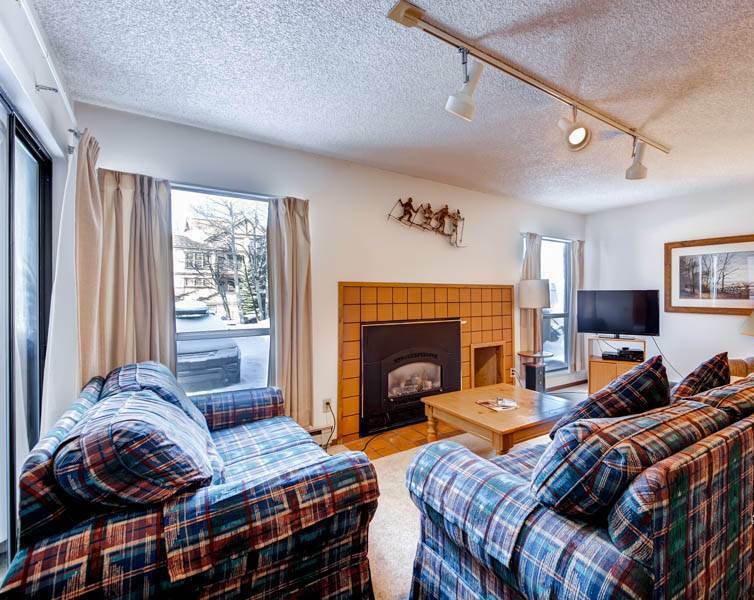 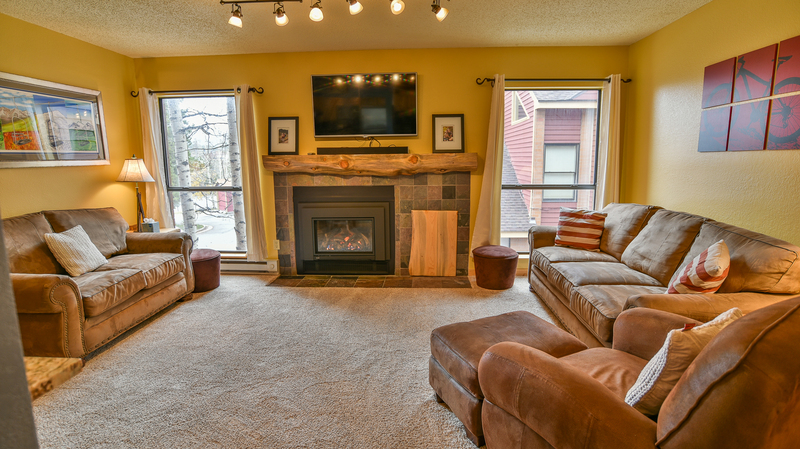 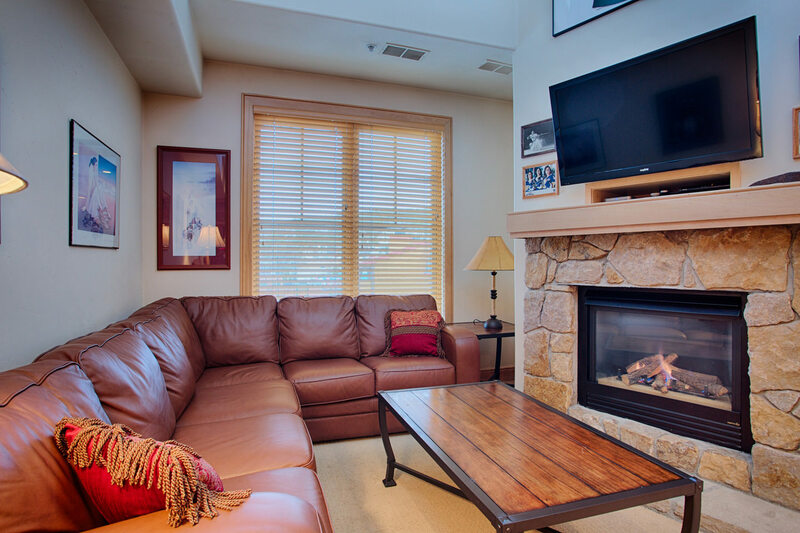 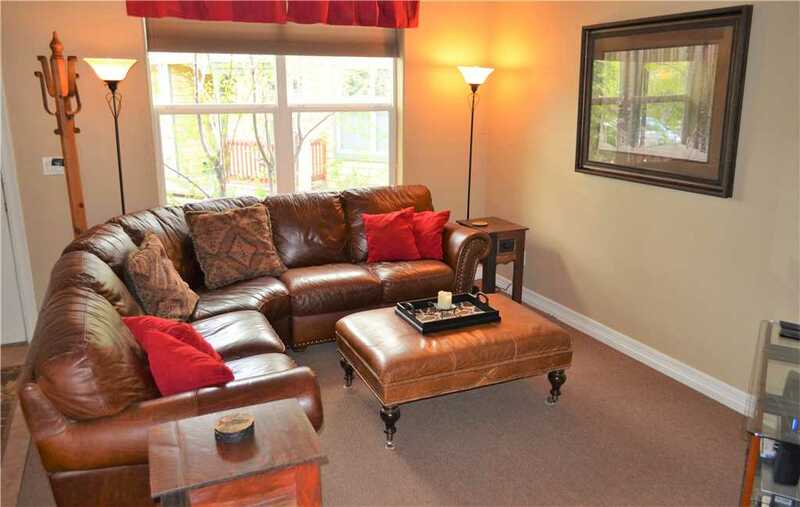 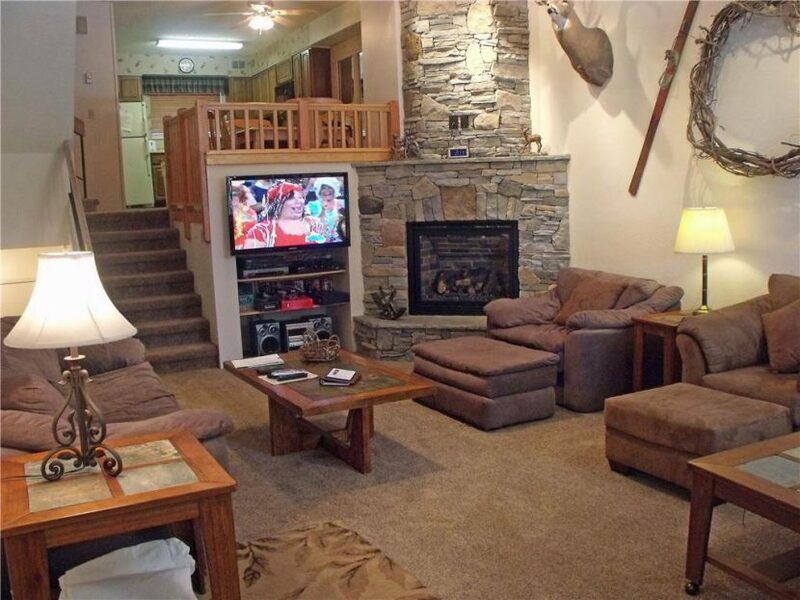 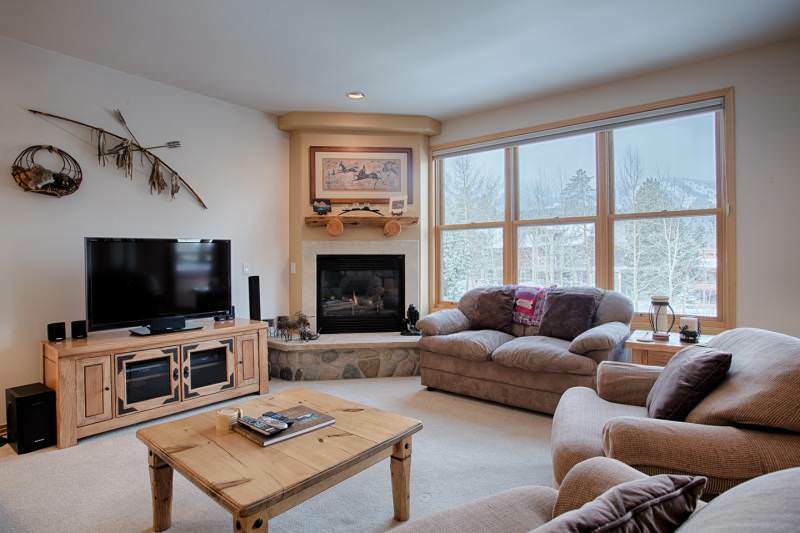 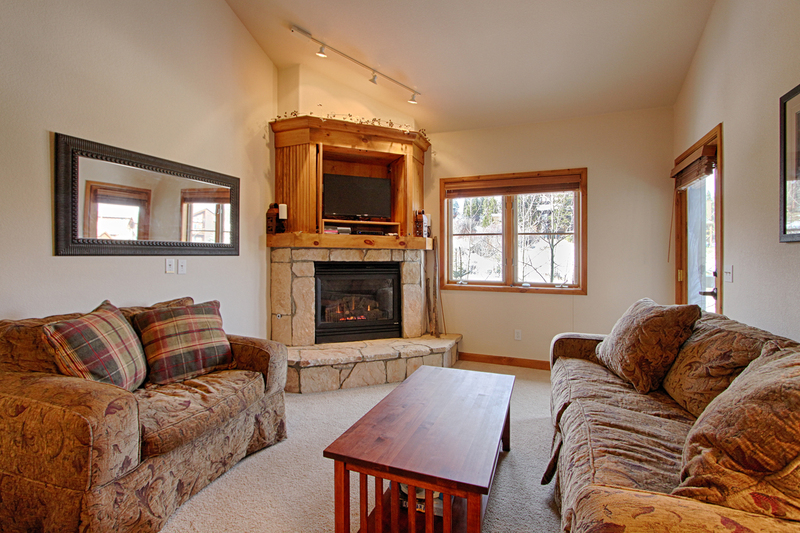 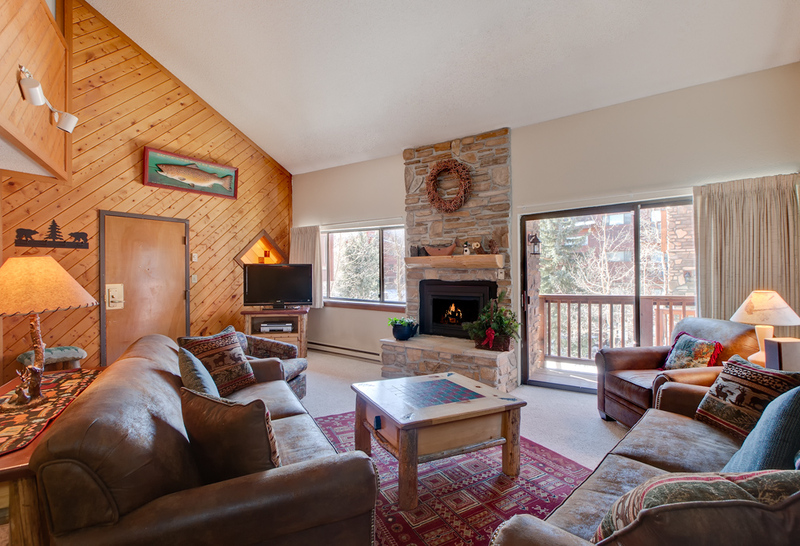 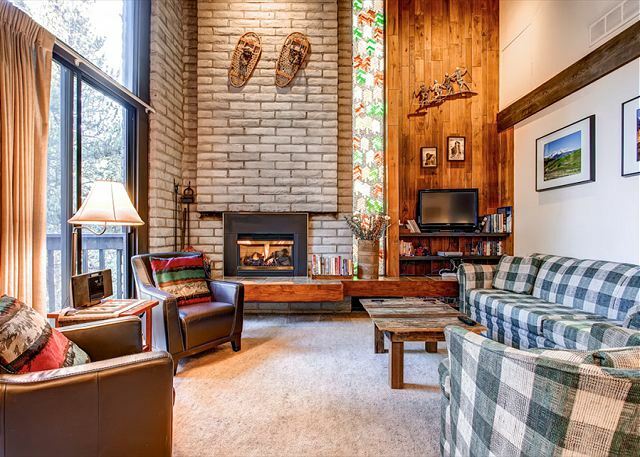 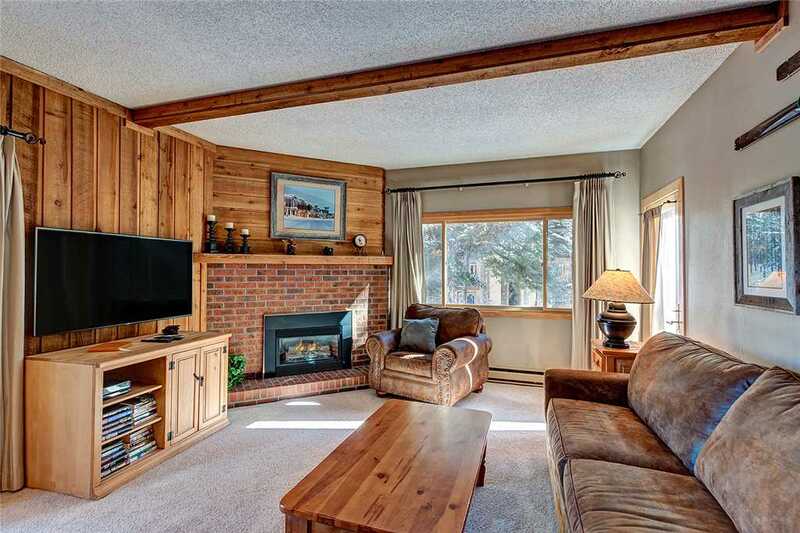 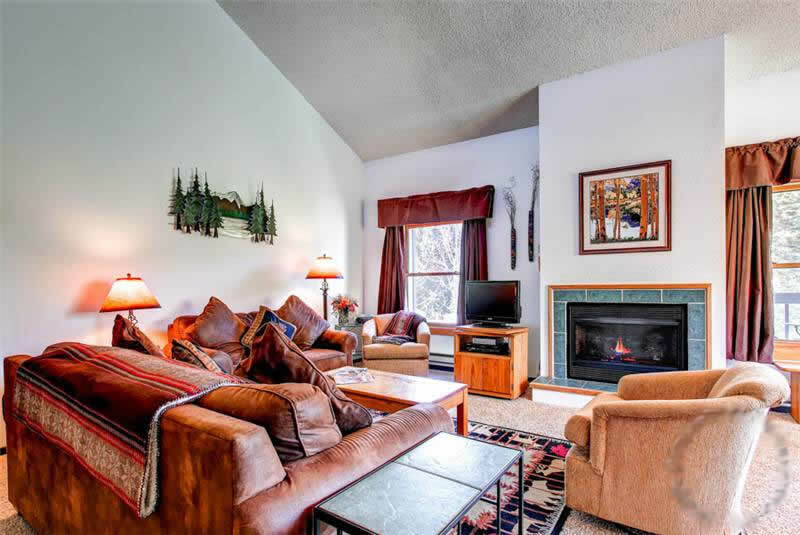 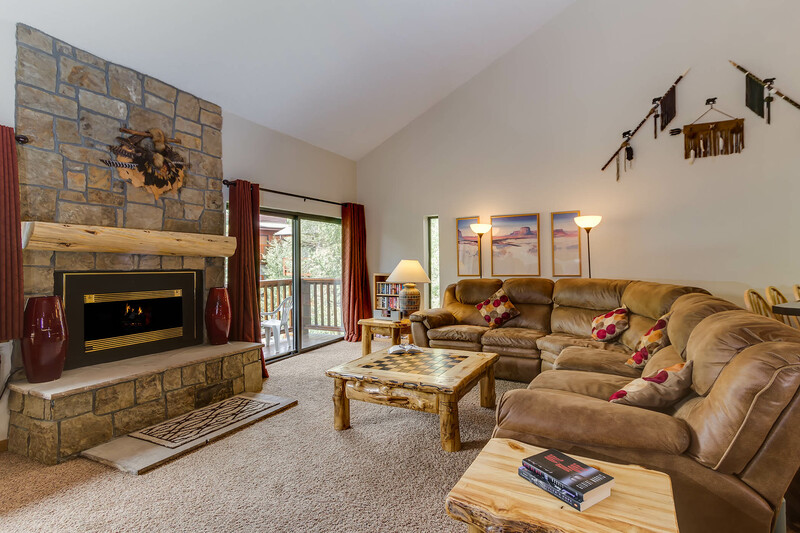 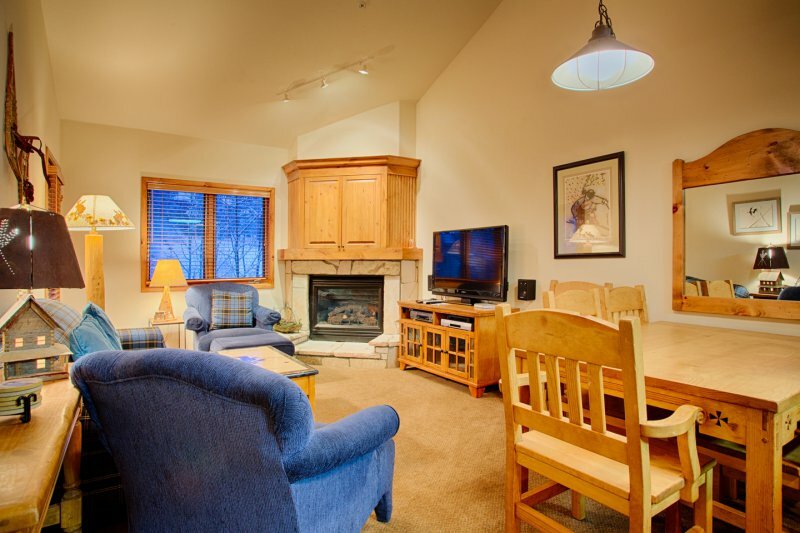 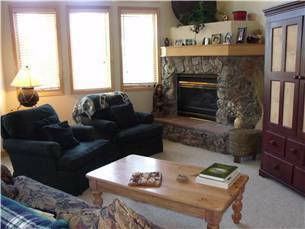 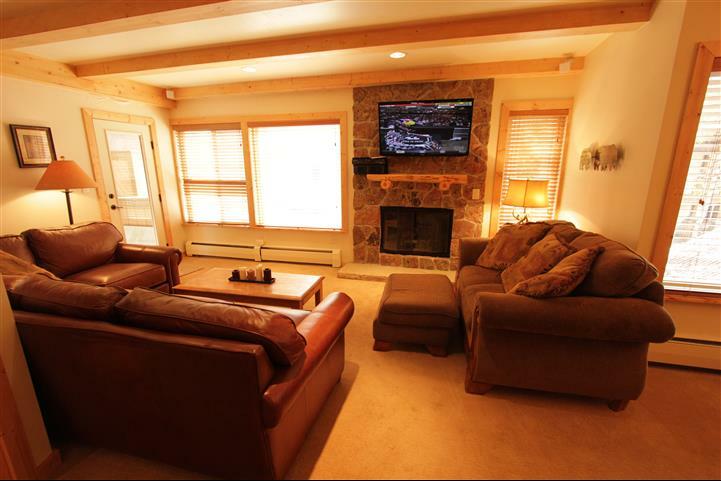 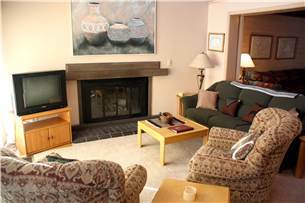 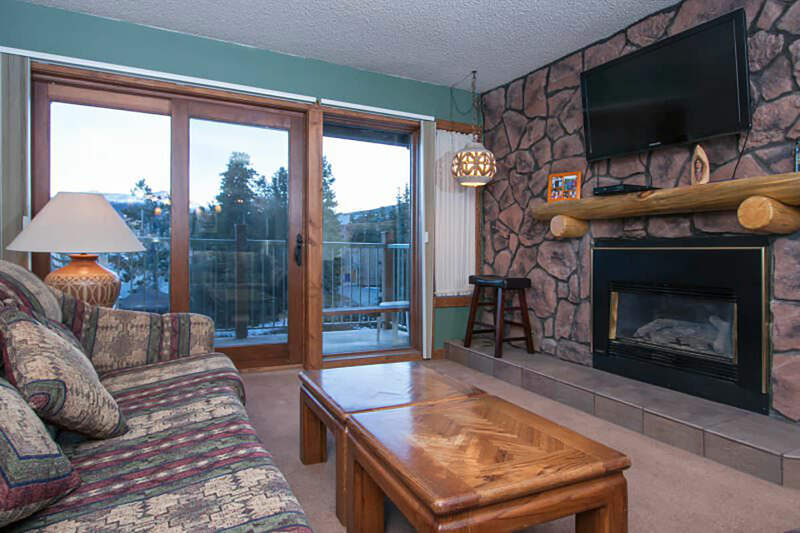 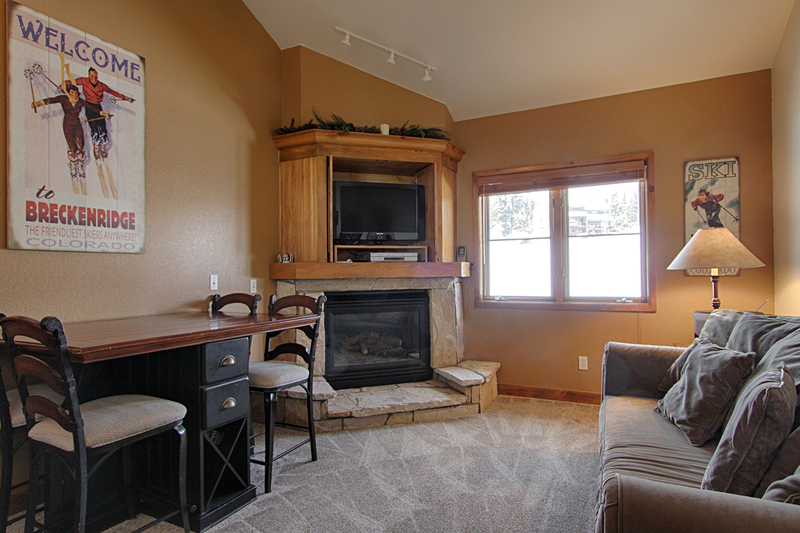 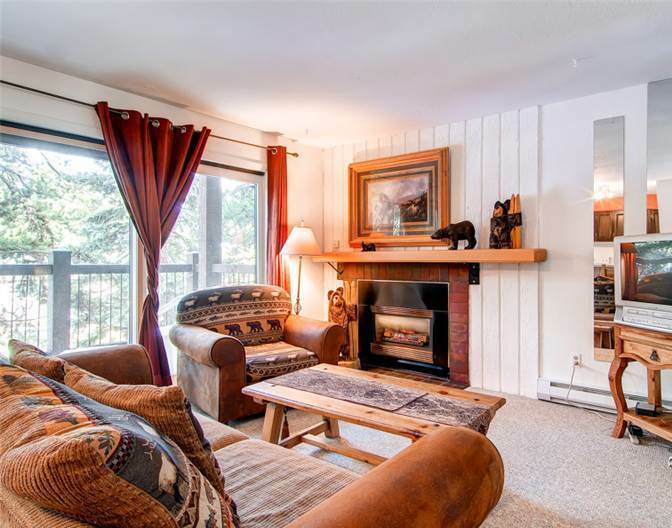 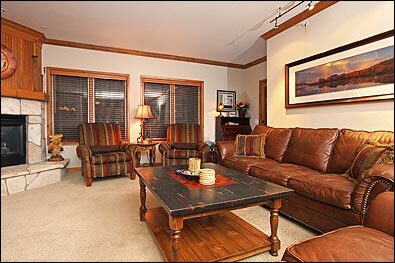 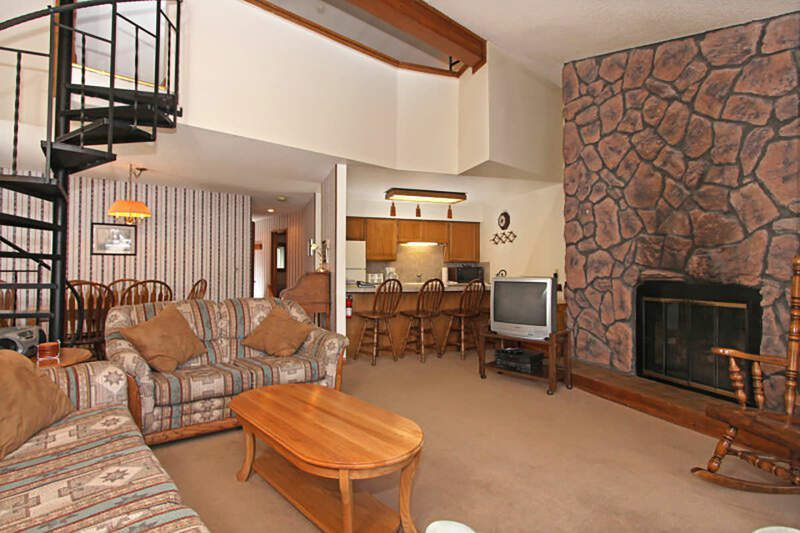 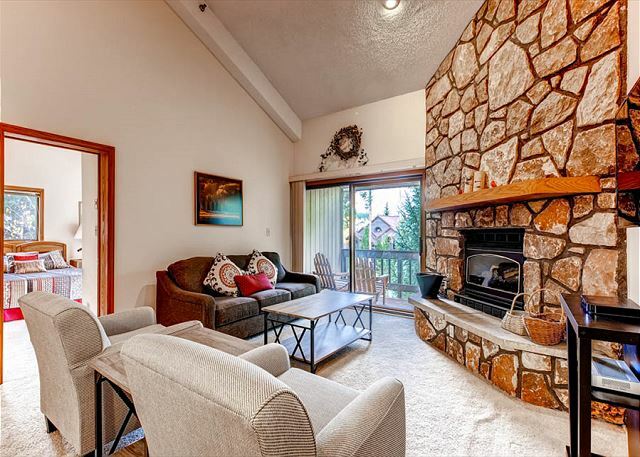 The living area welcomes you with a nice big LCD TV and a gas fireplace perfect for relaxing next to after a day of adventure. 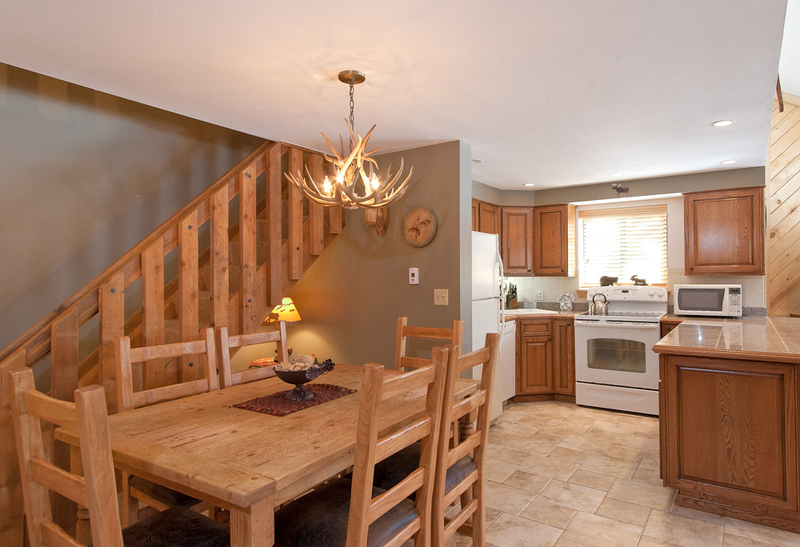 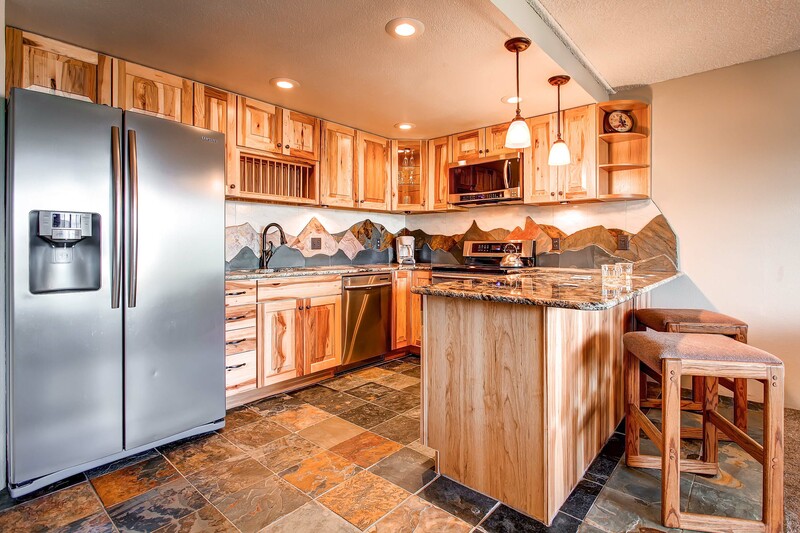 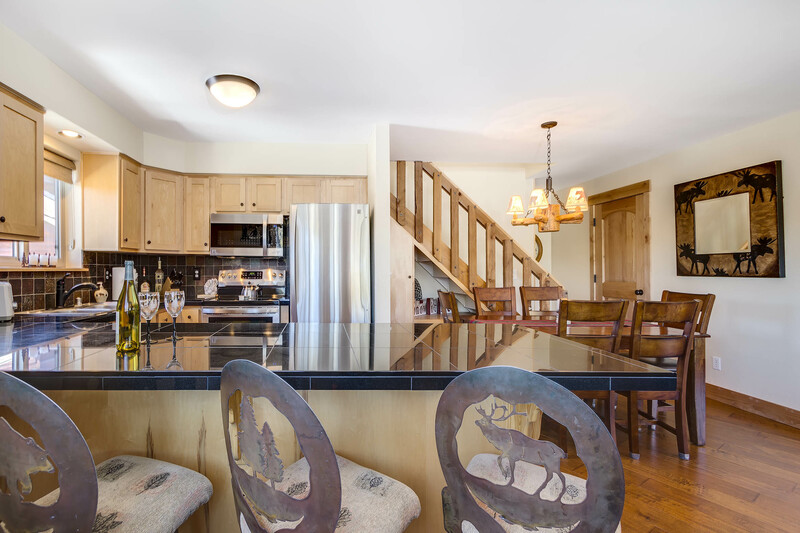 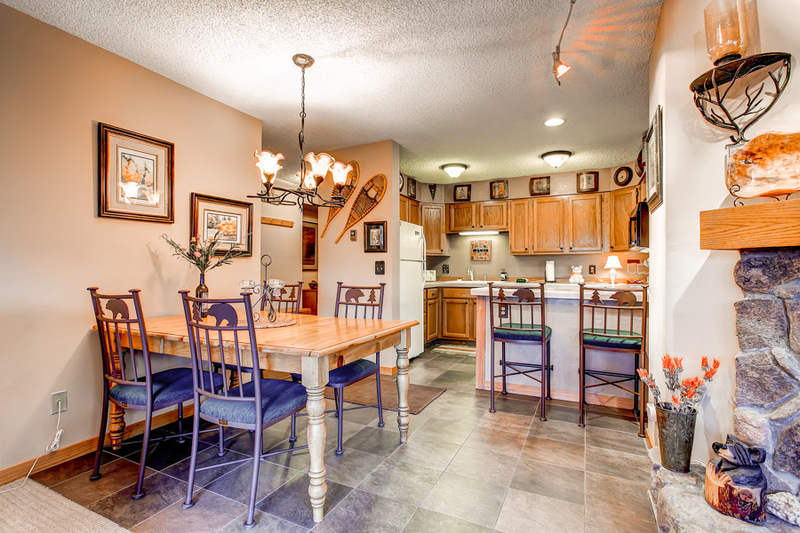 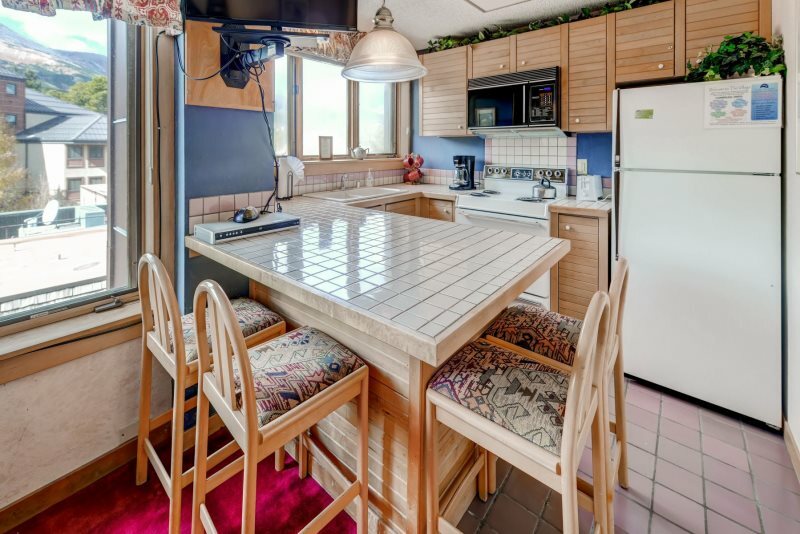 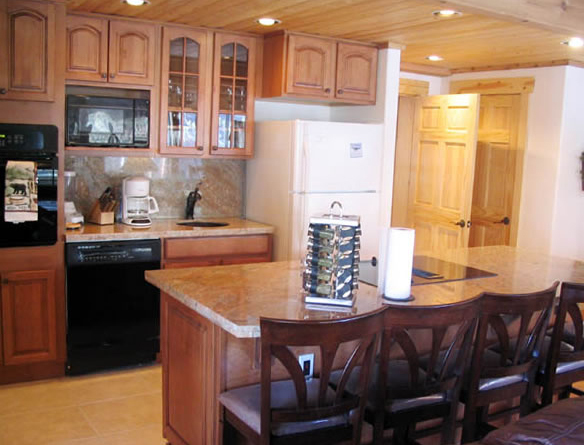 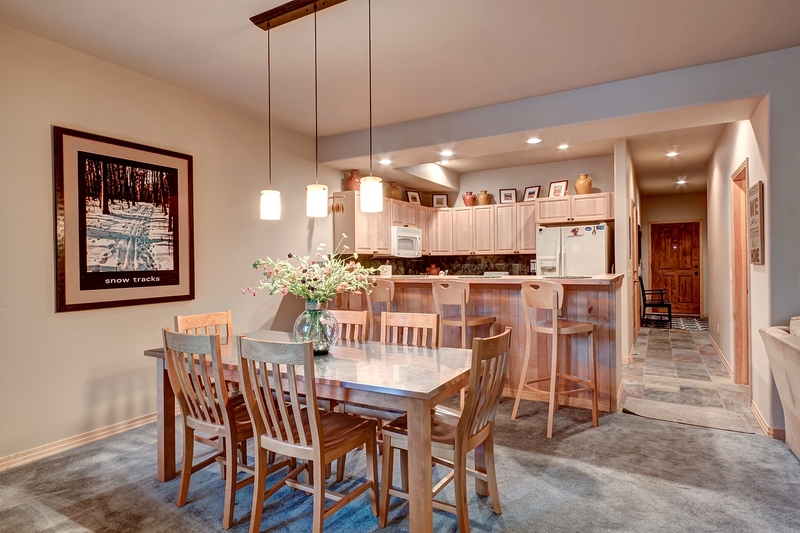 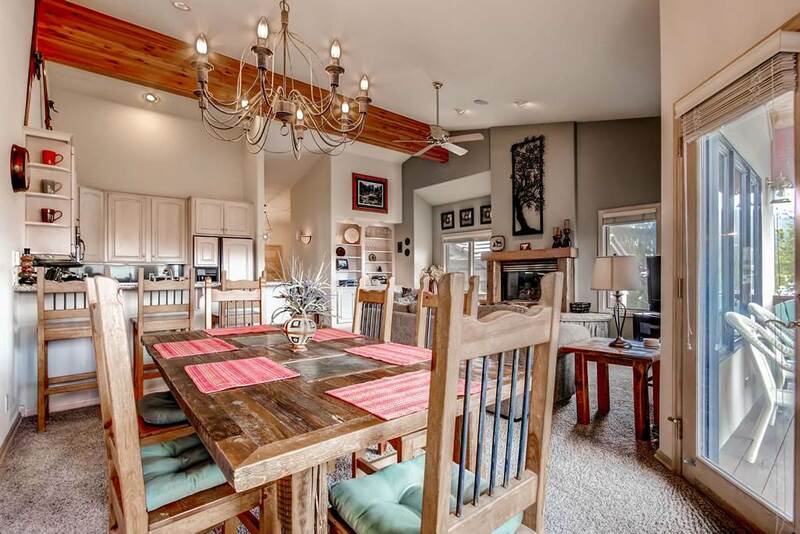 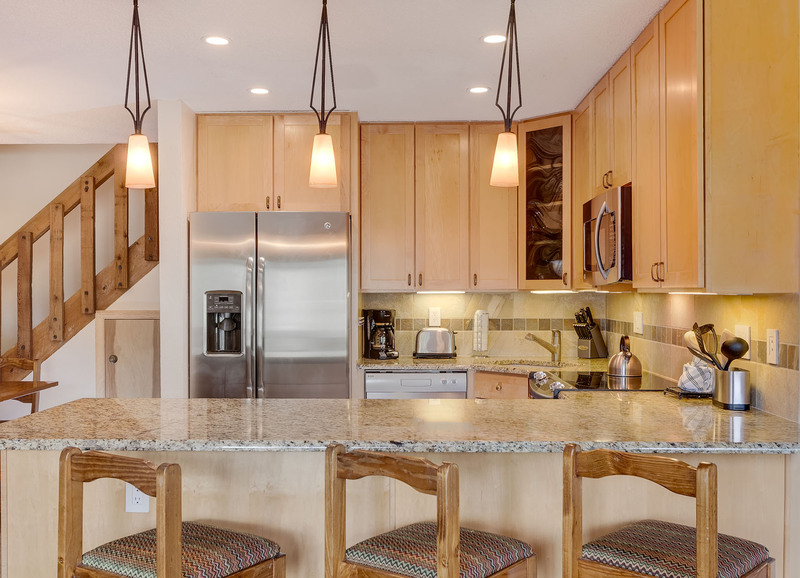 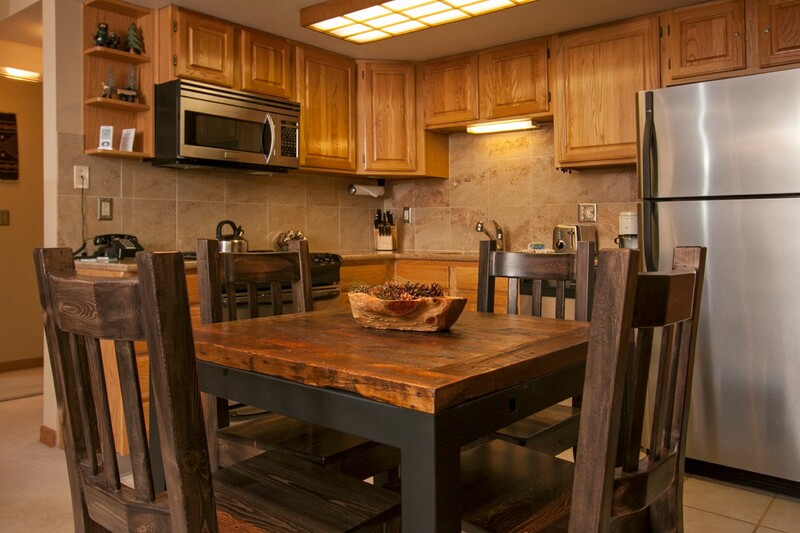 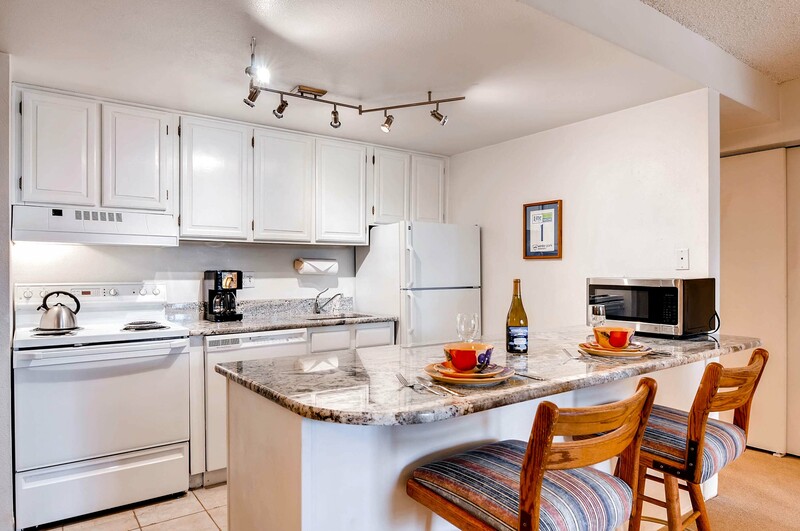 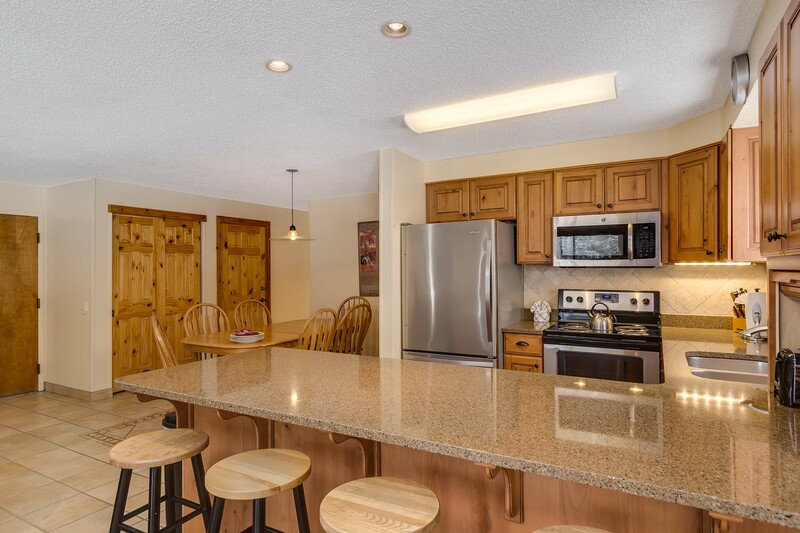 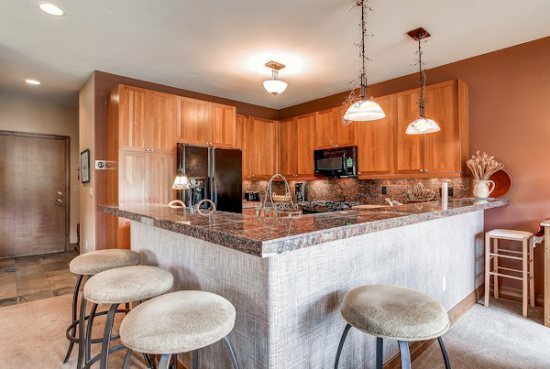 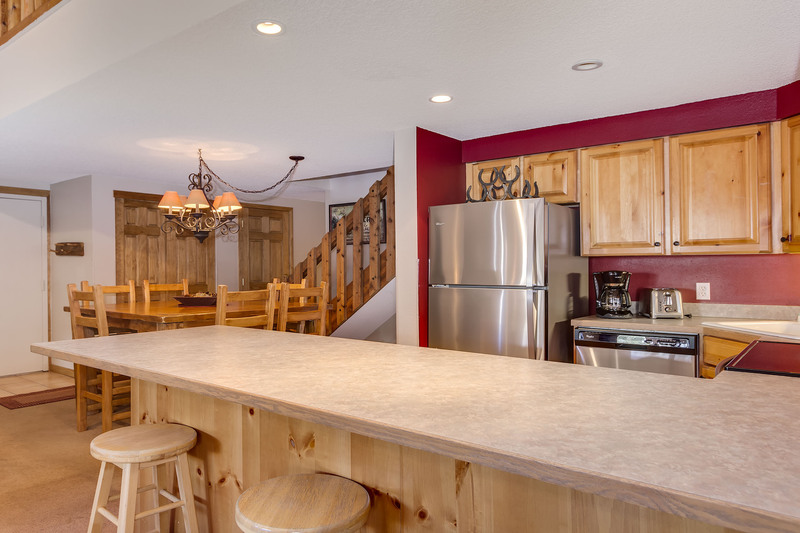 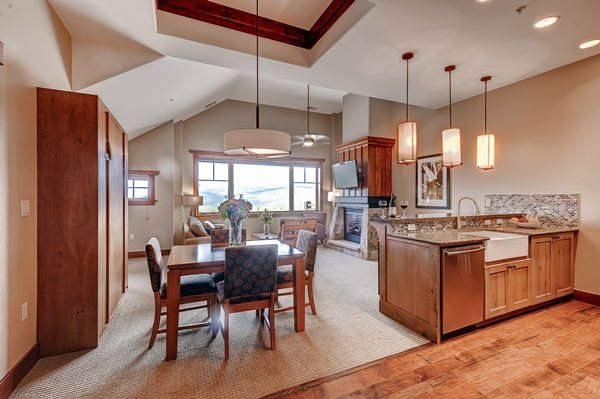 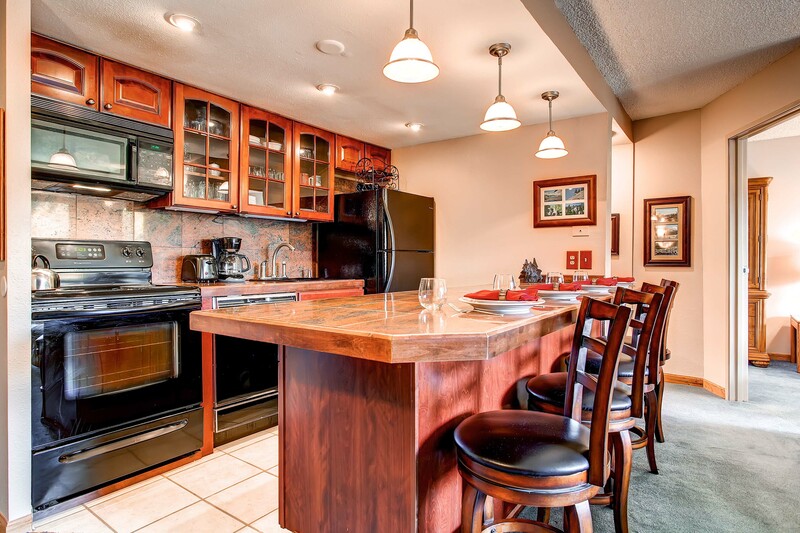 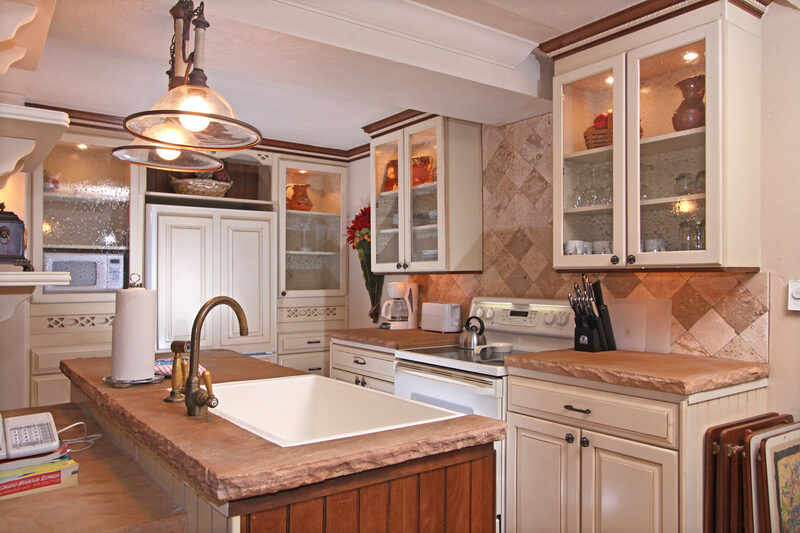 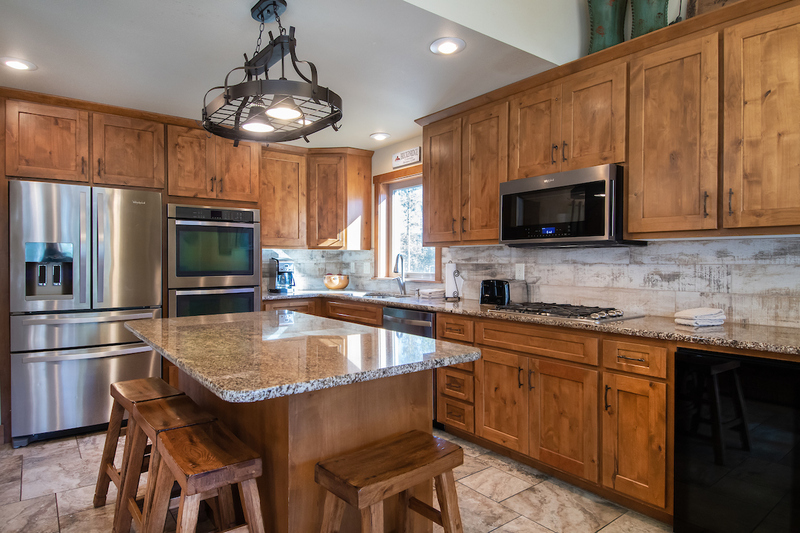 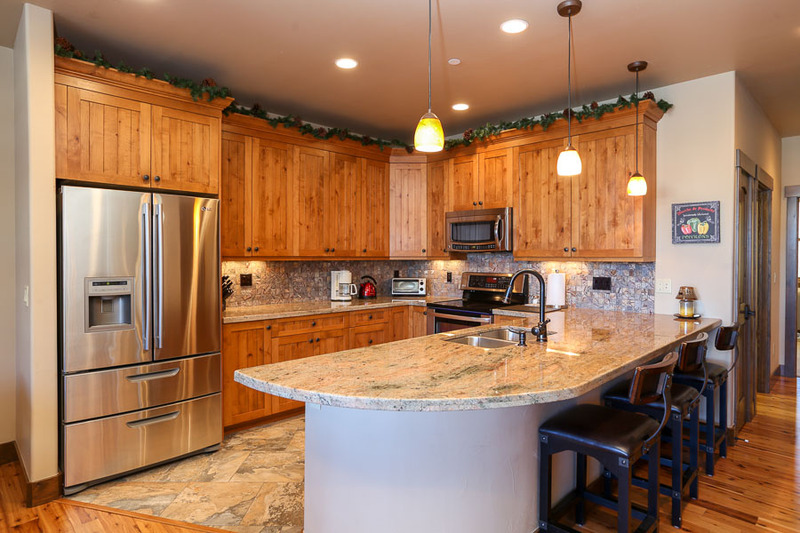 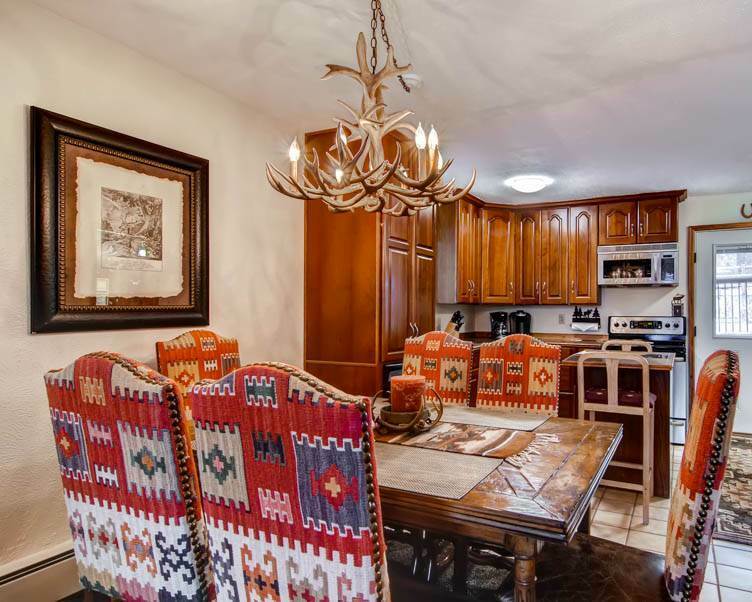 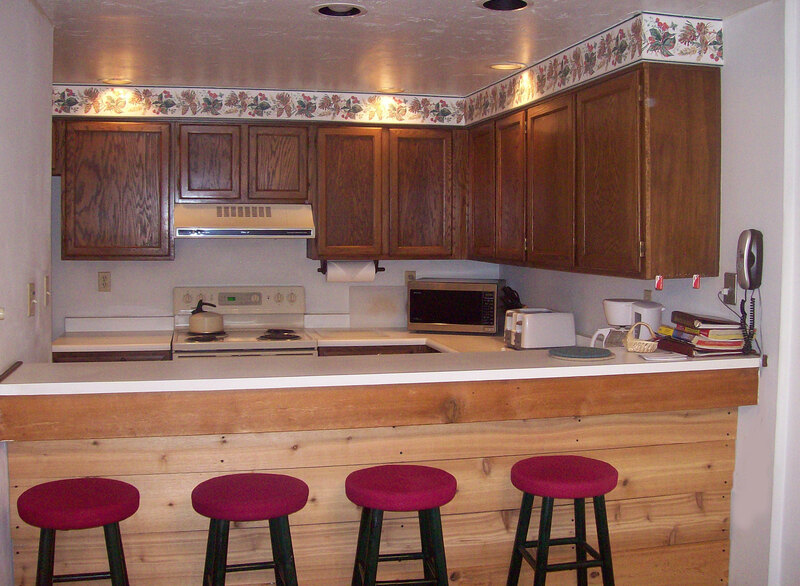 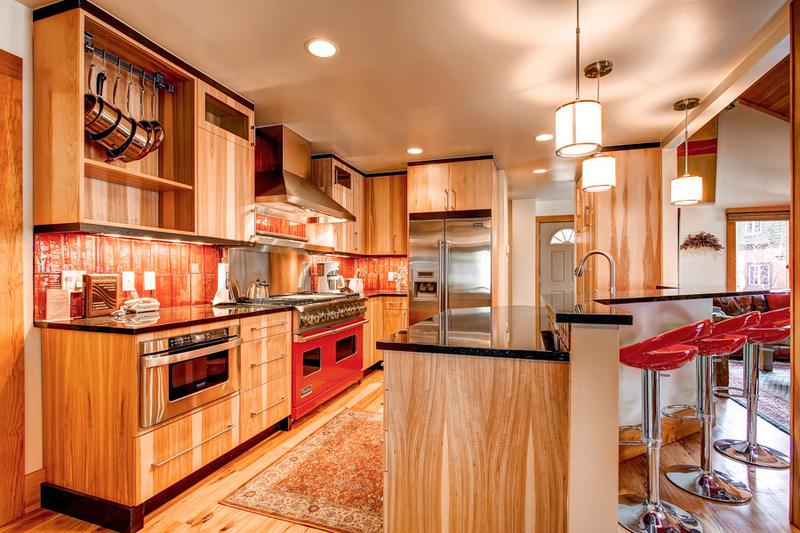 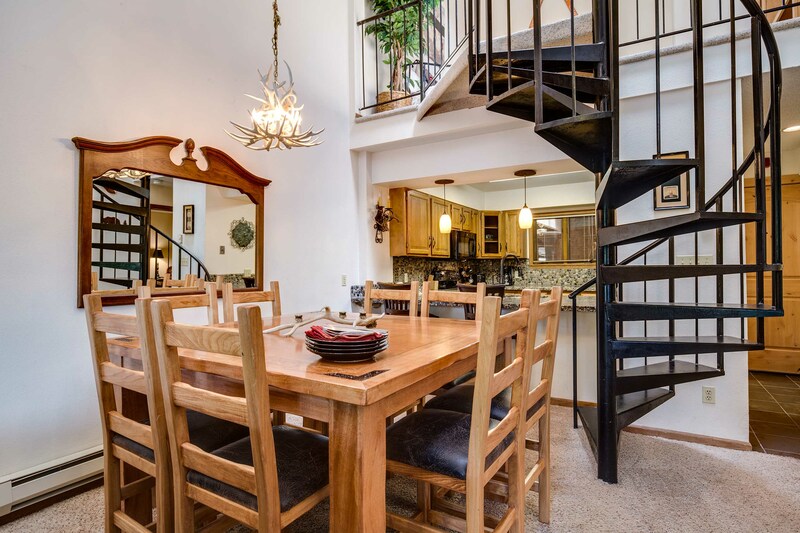 The fully equipped kitchen has everything you’ll need to make fantastic meals for your group, and there’s seating for all 8 guests at the dining table. 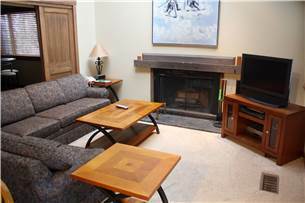 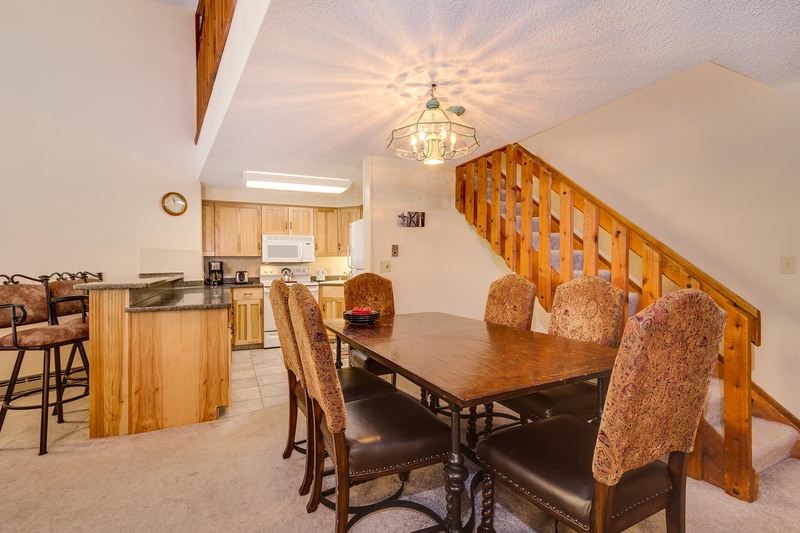 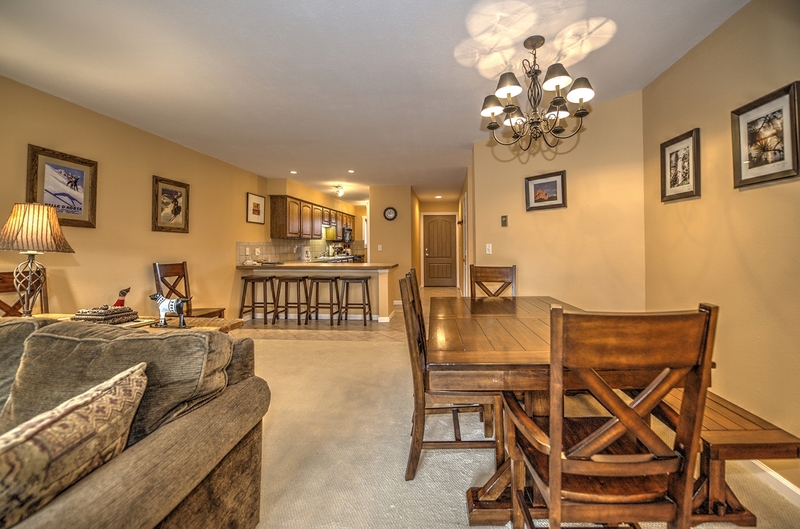 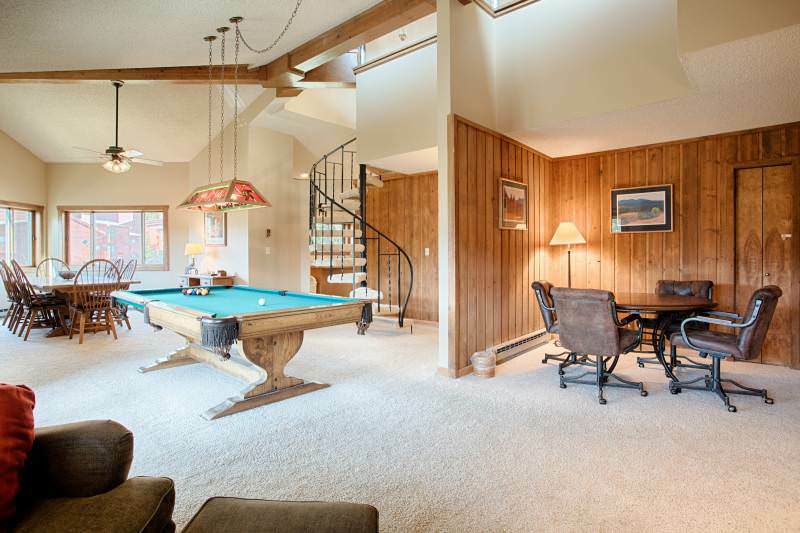 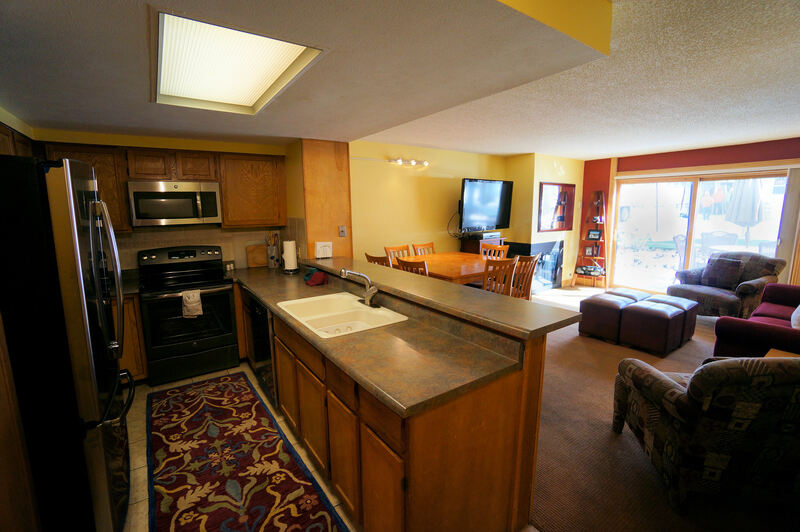 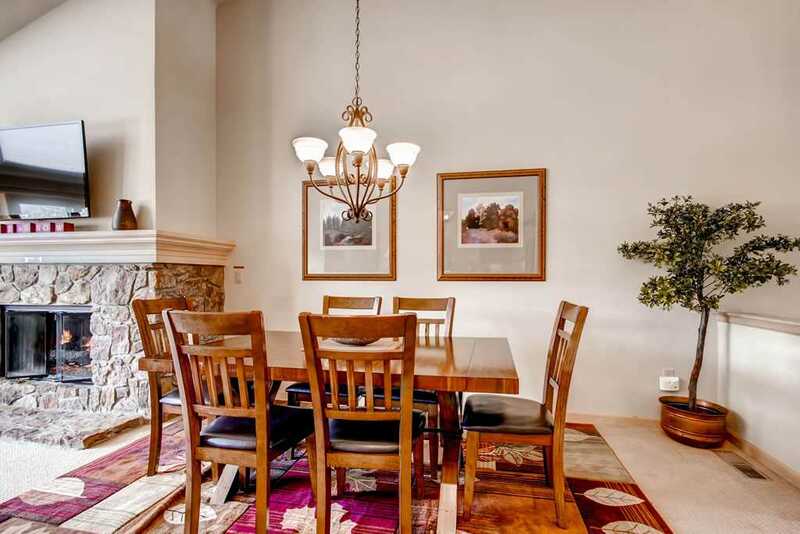 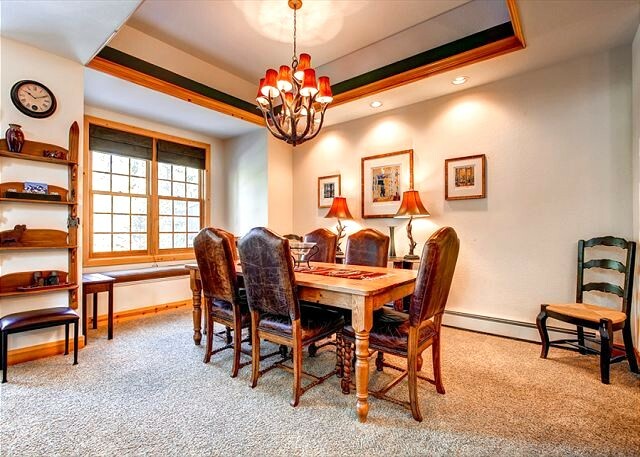 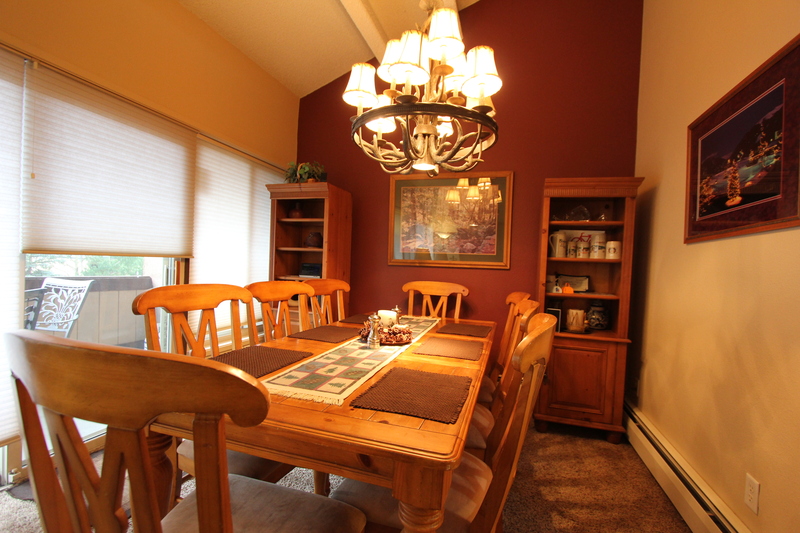 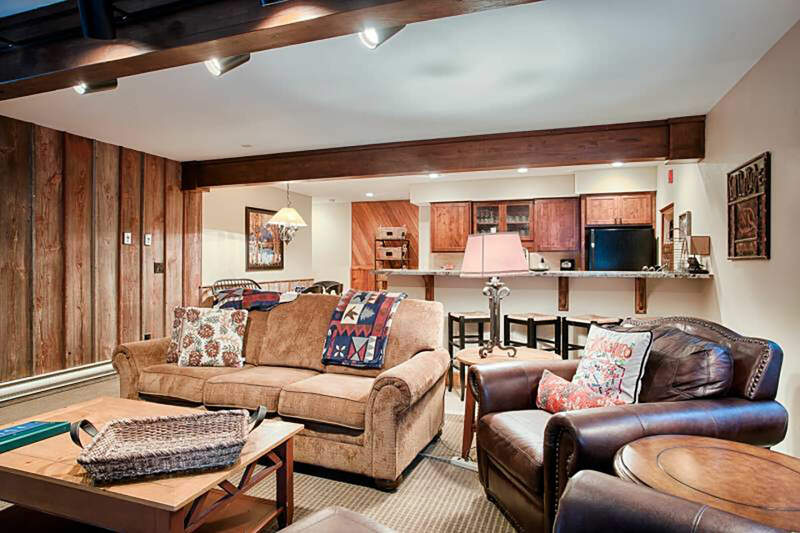 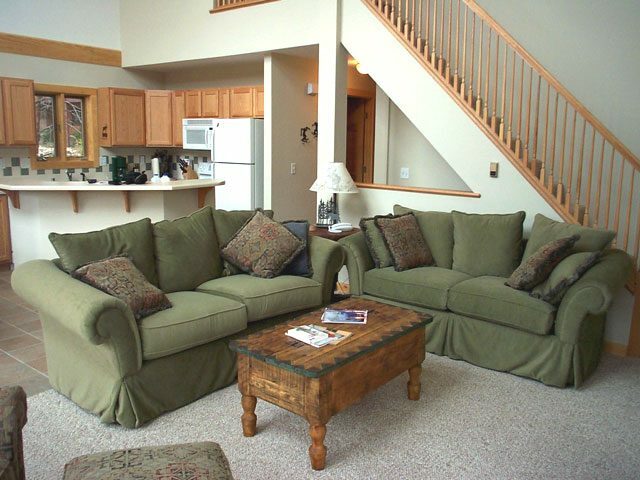 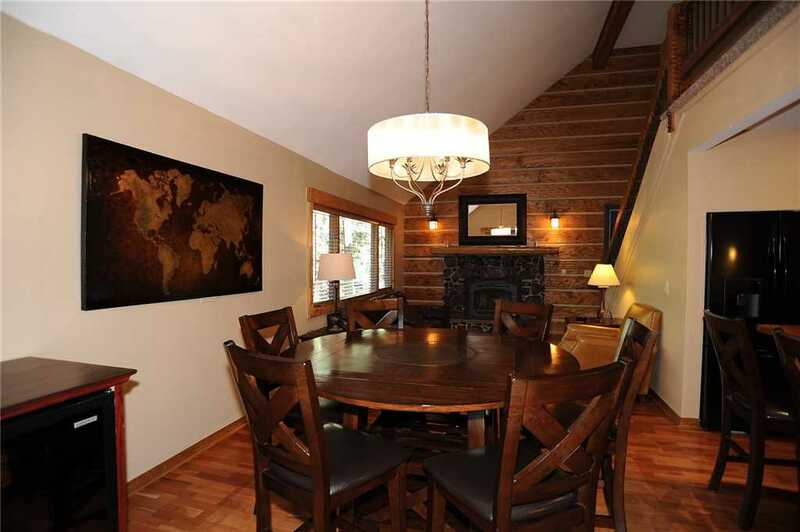 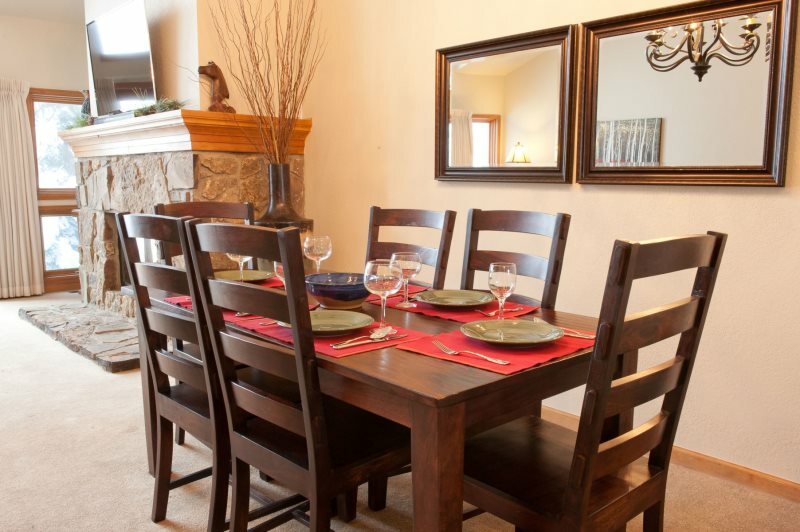 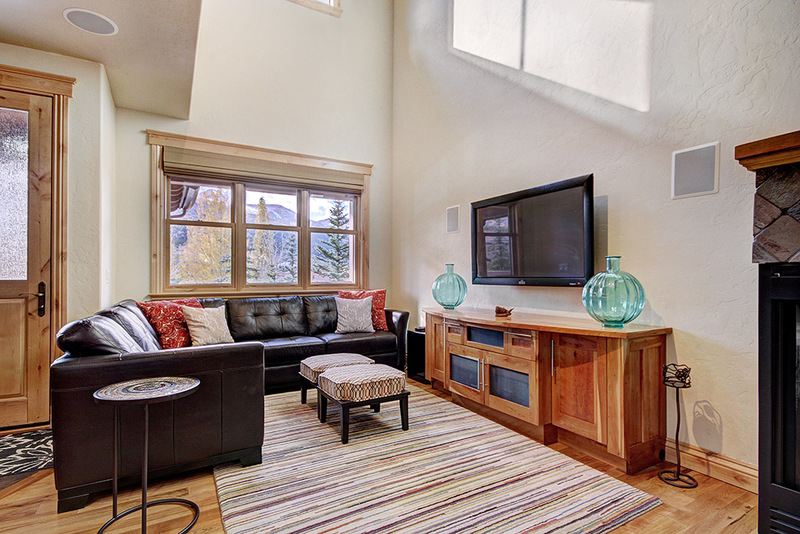 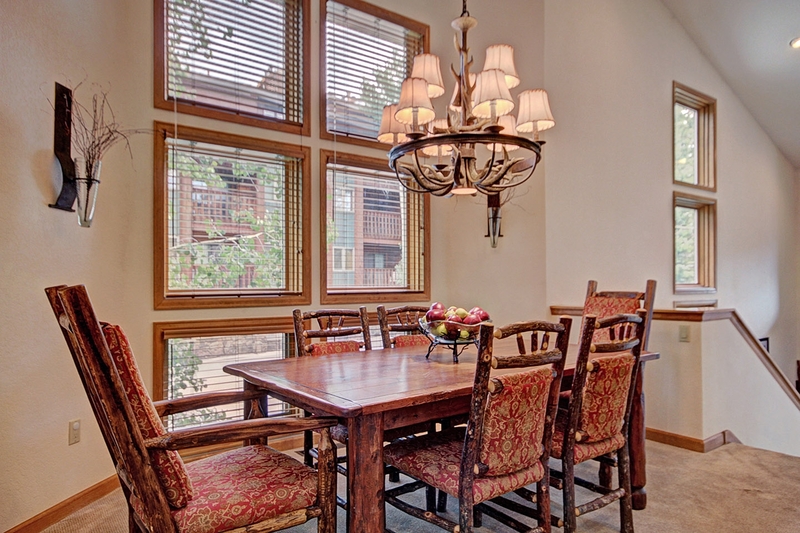 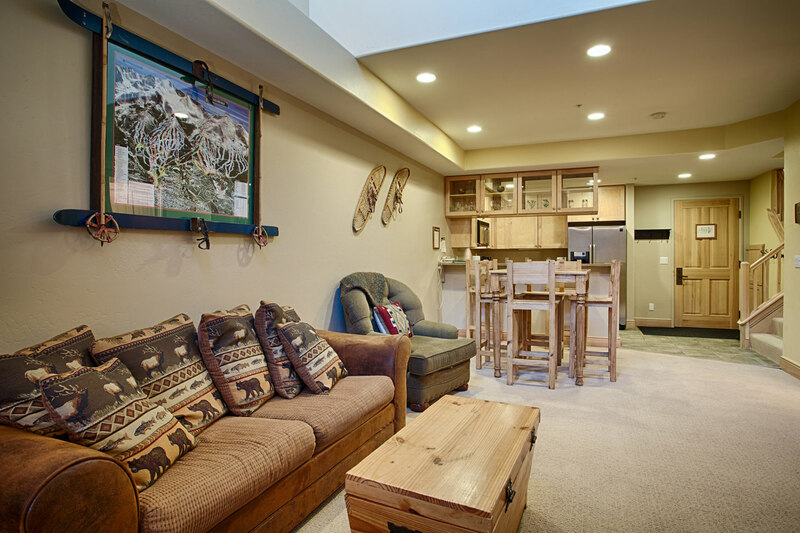 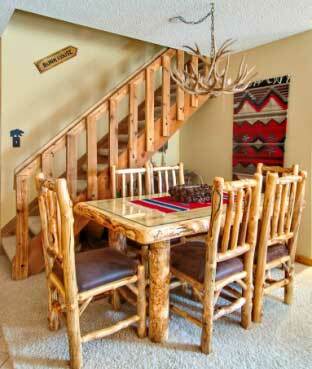 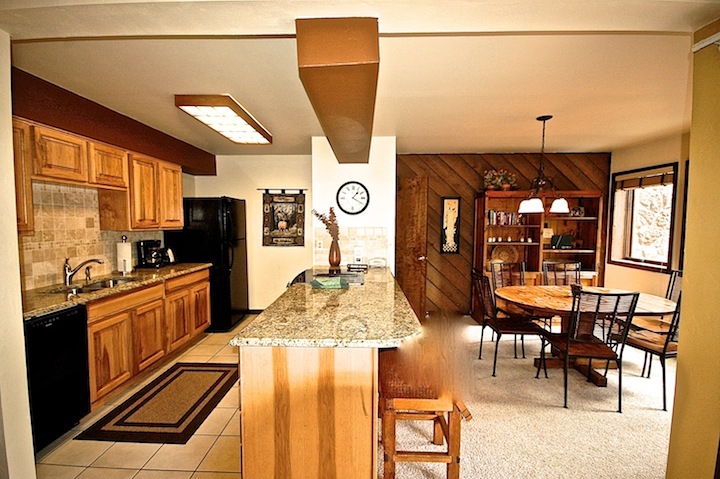 Heading downstairs, you’ll find a nice game table with room for 6 and plenty more seating by another LCD TV. 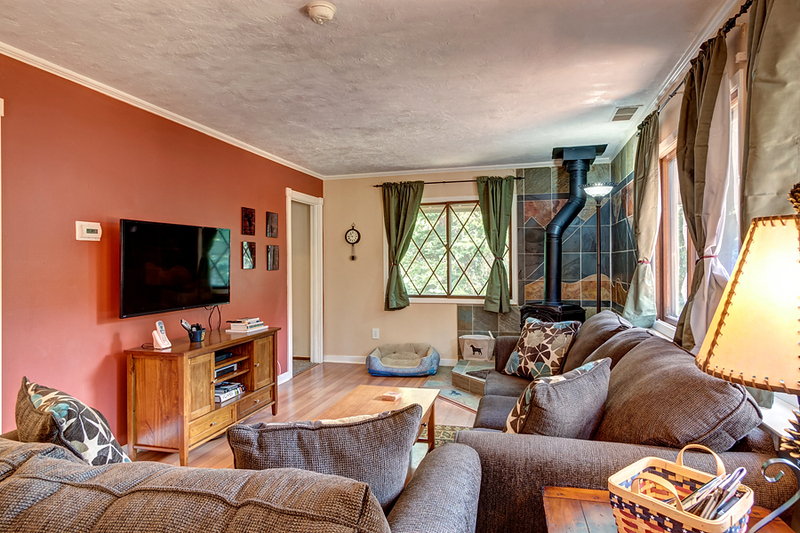 There’s room for everyone — and your dogs will love having space to roam, too! 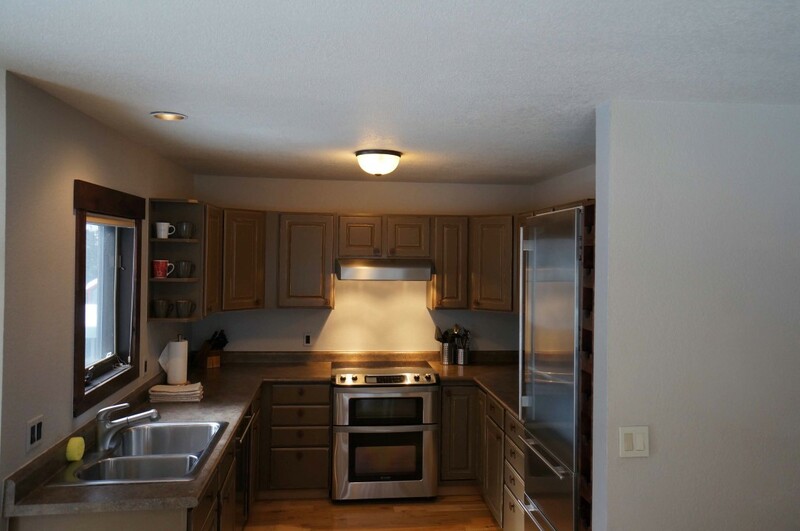 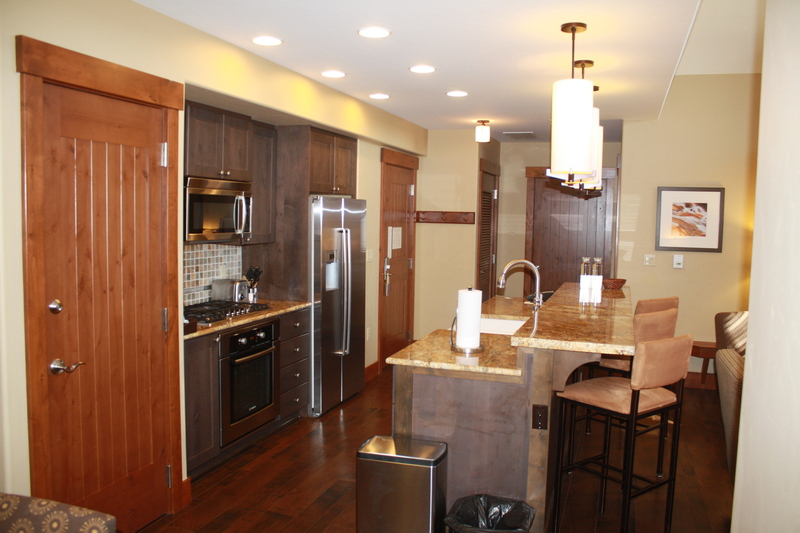 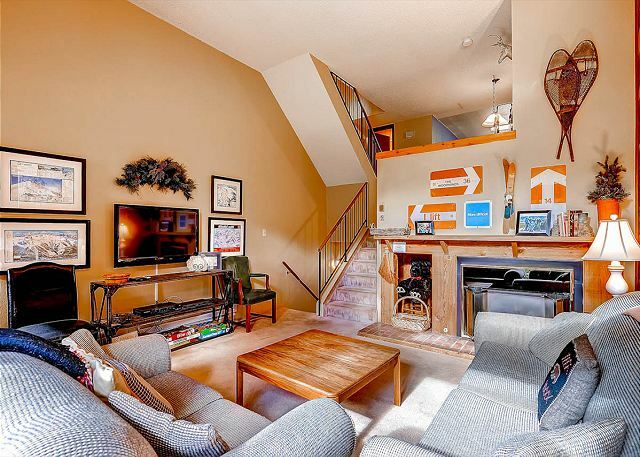 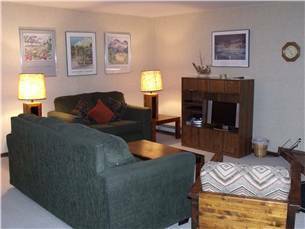 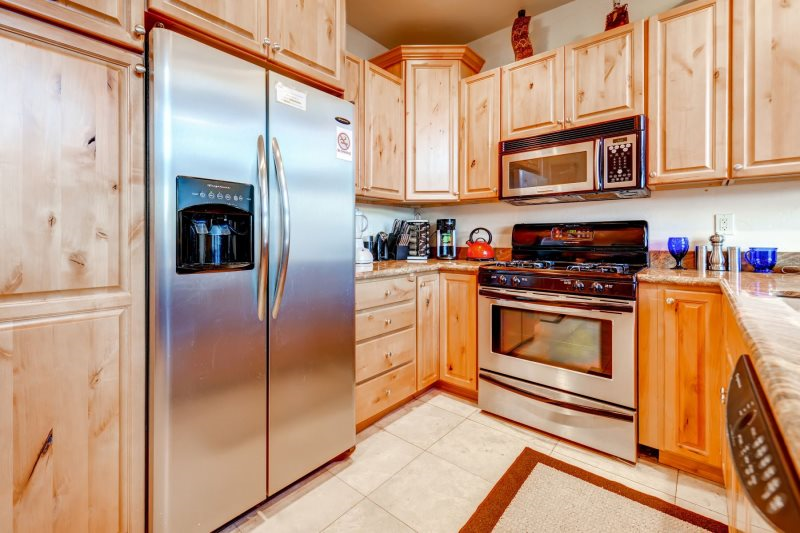 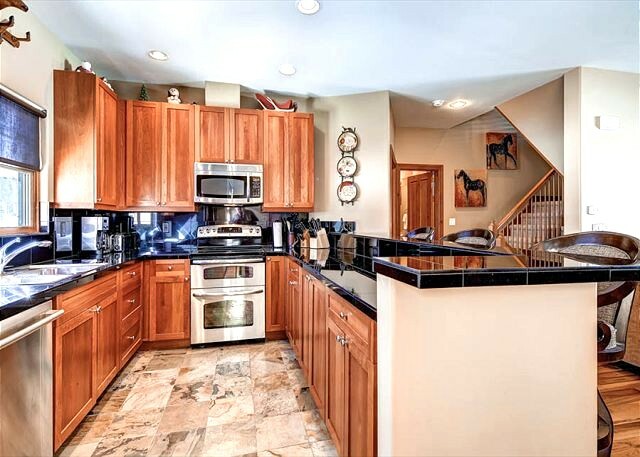 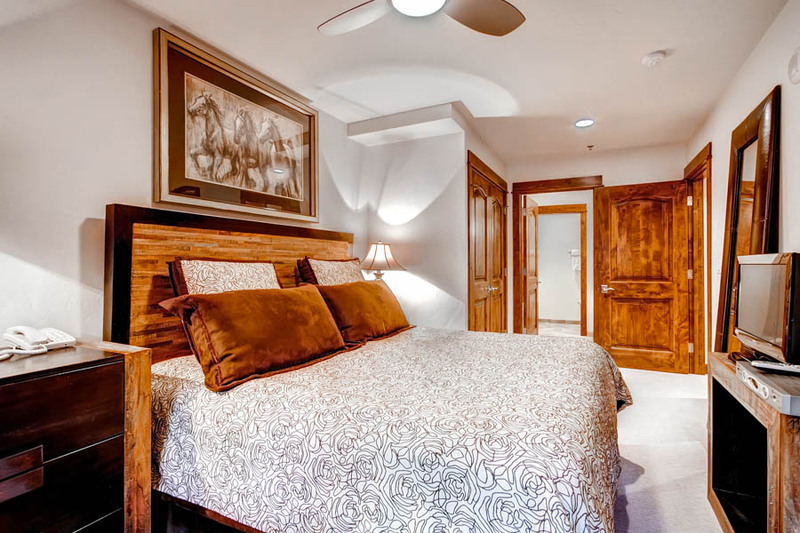 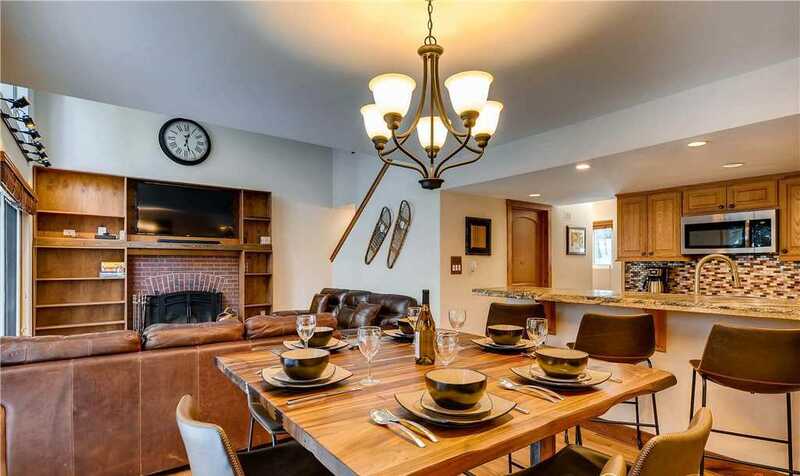 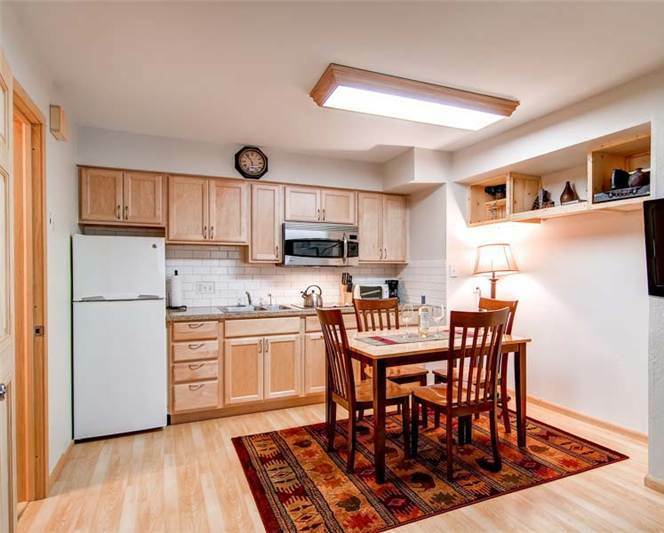 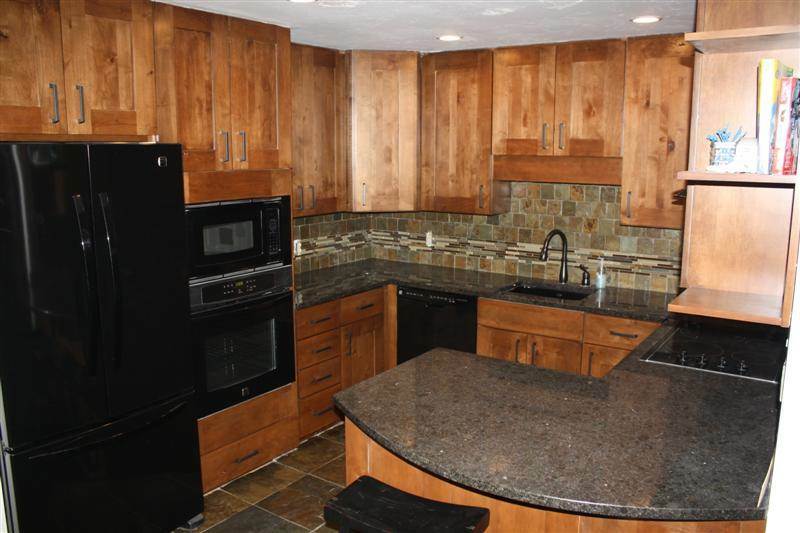 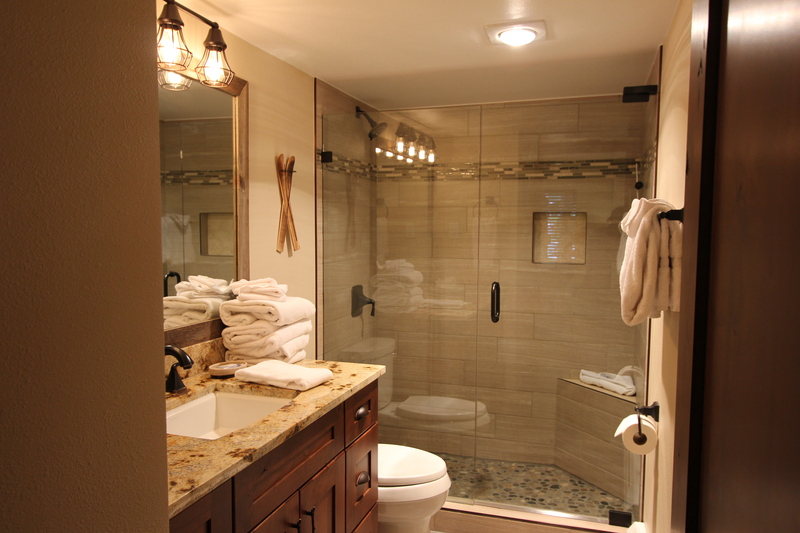 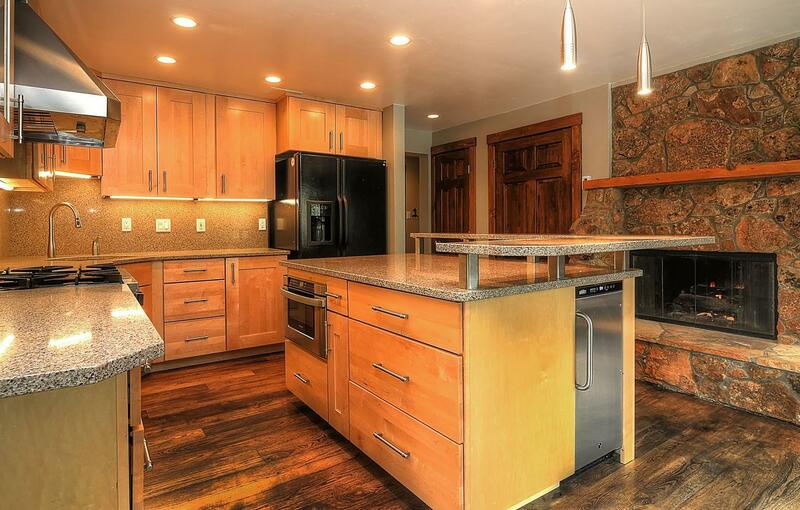 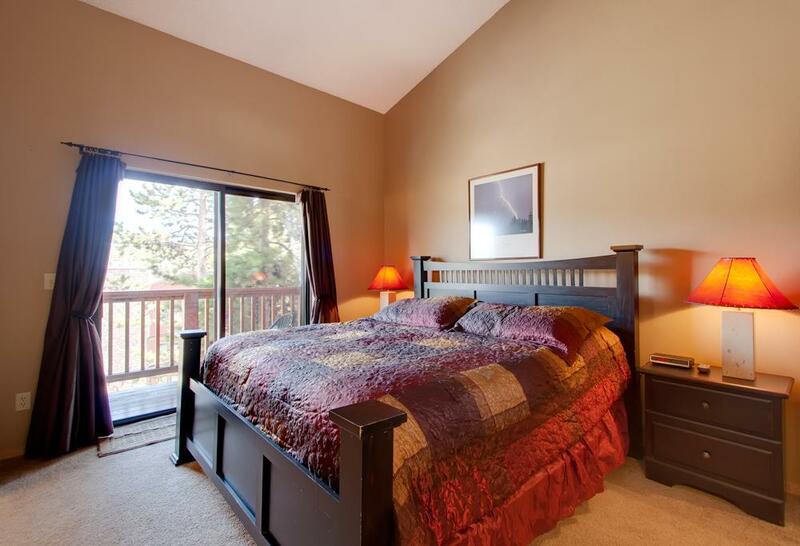 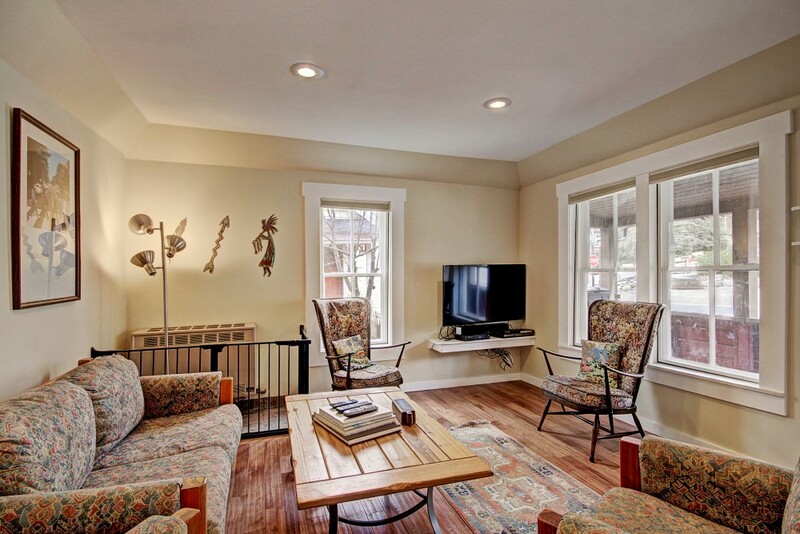 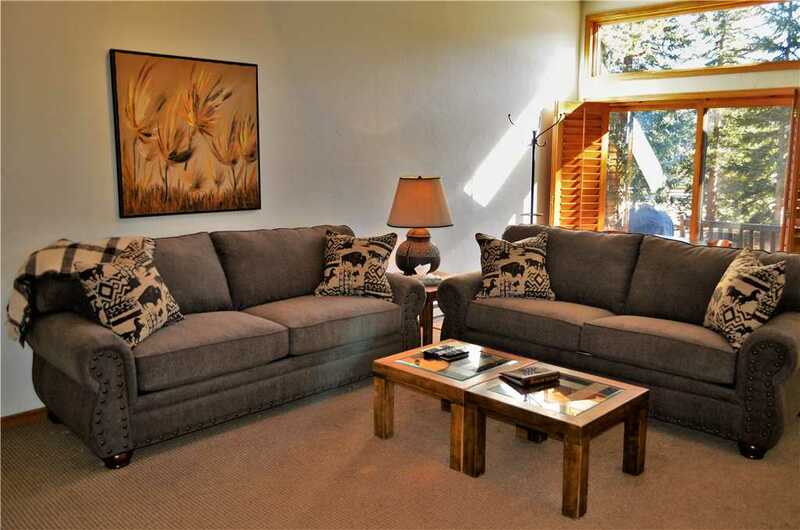 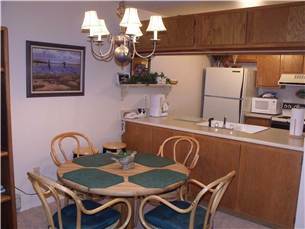 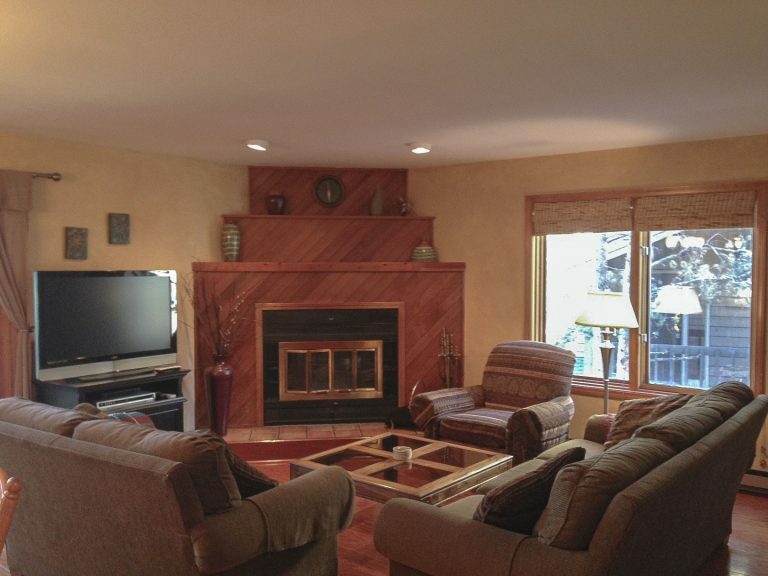 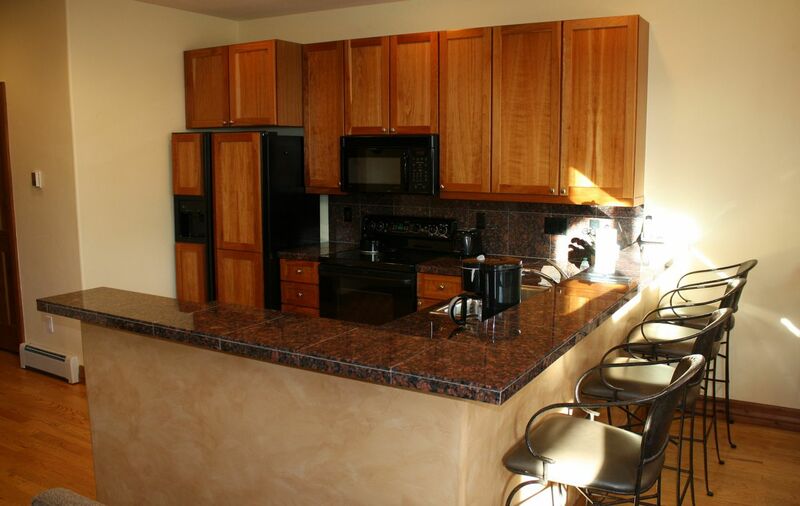 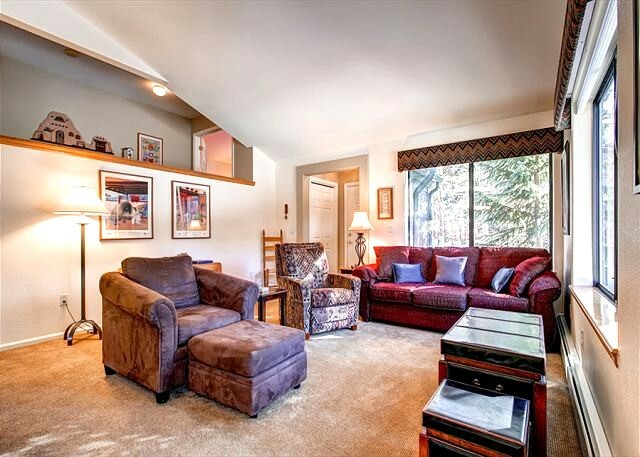 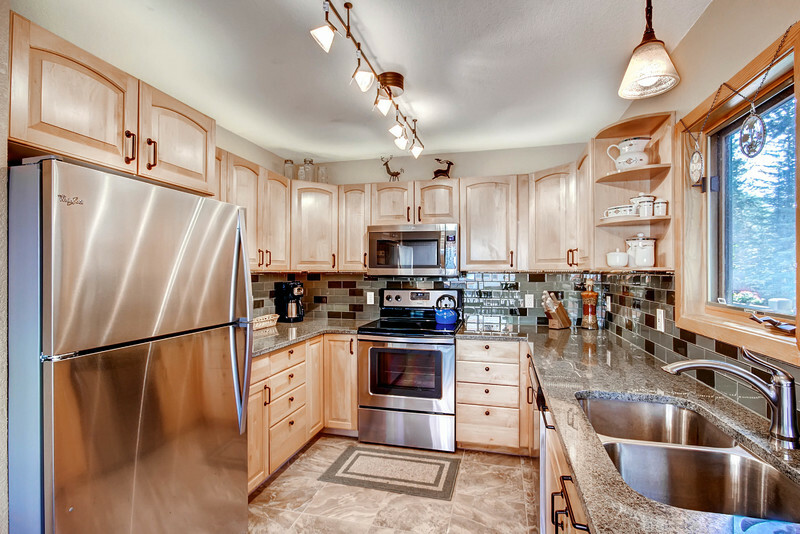 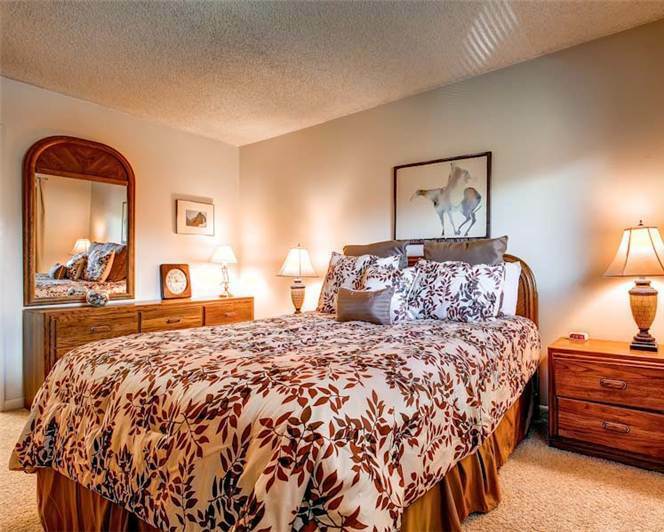 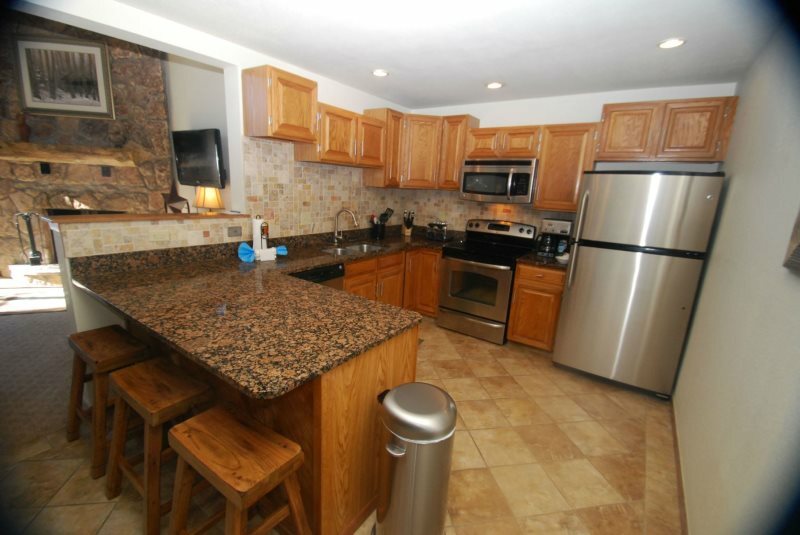 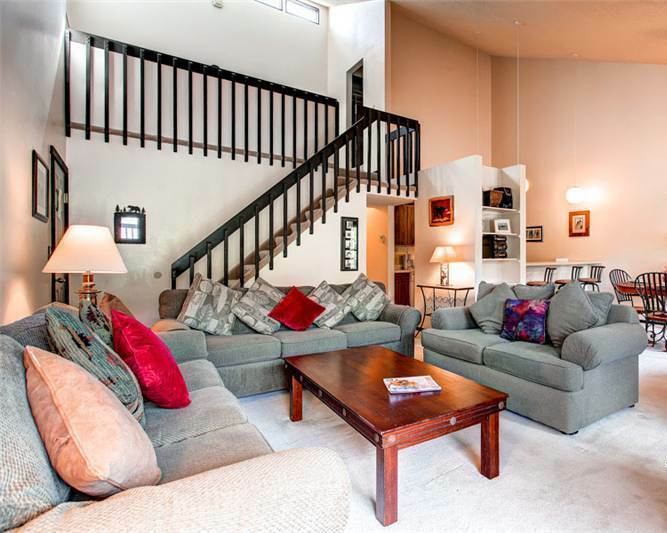 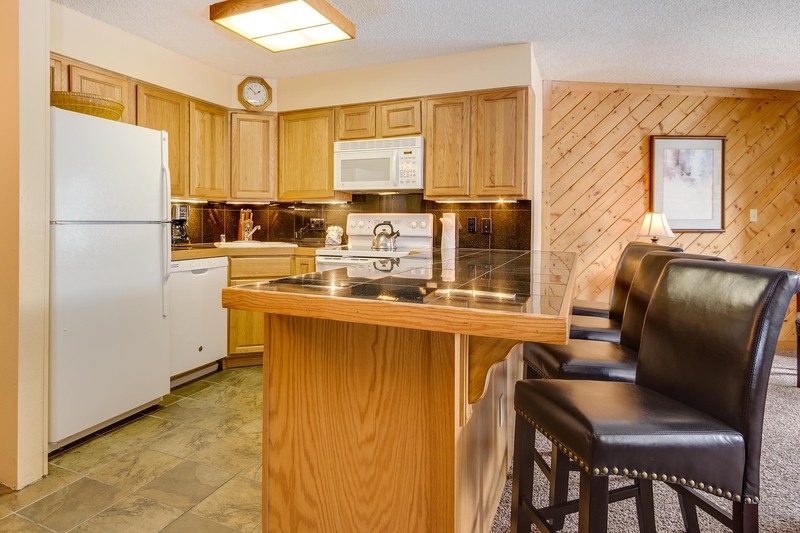 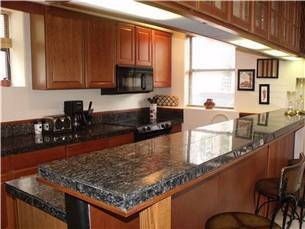 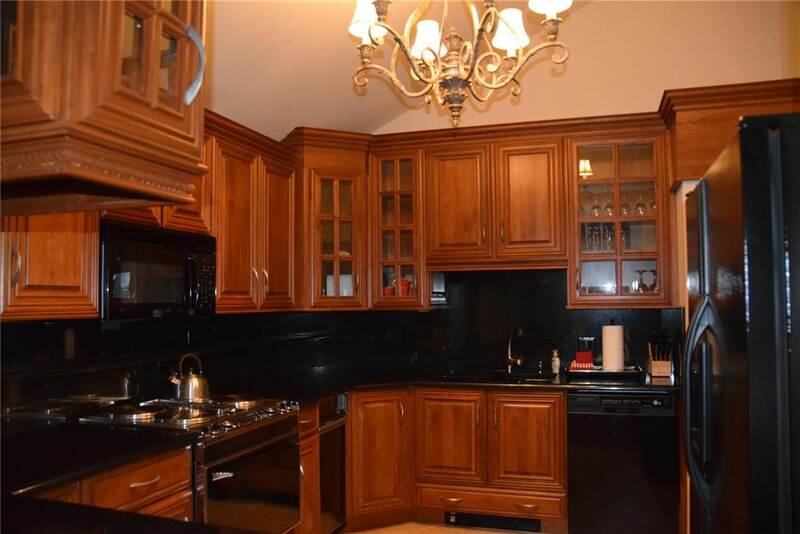 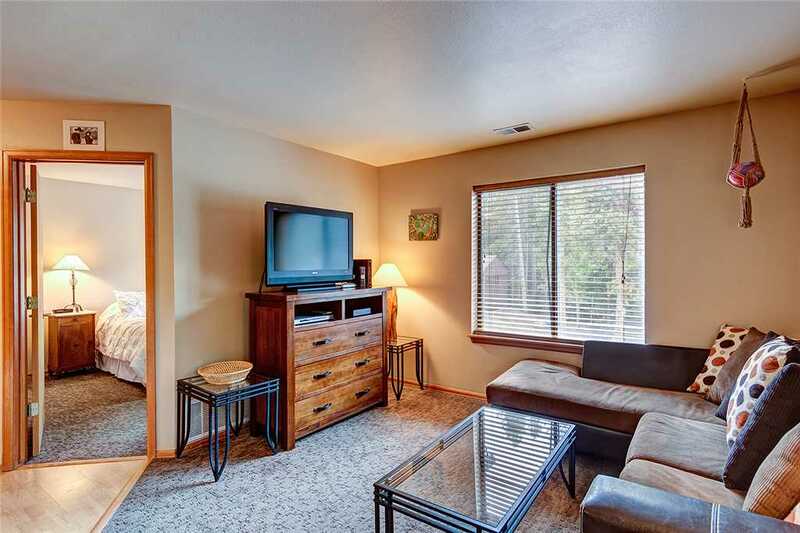 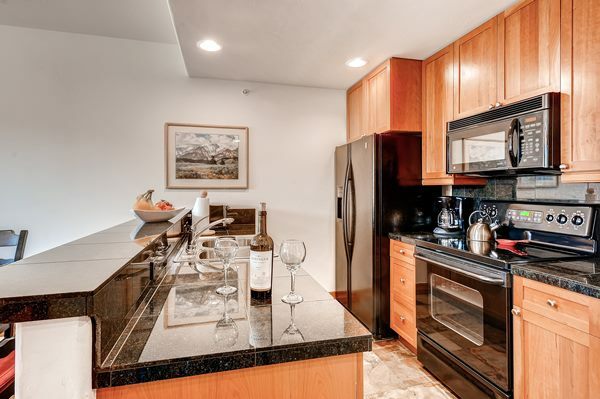 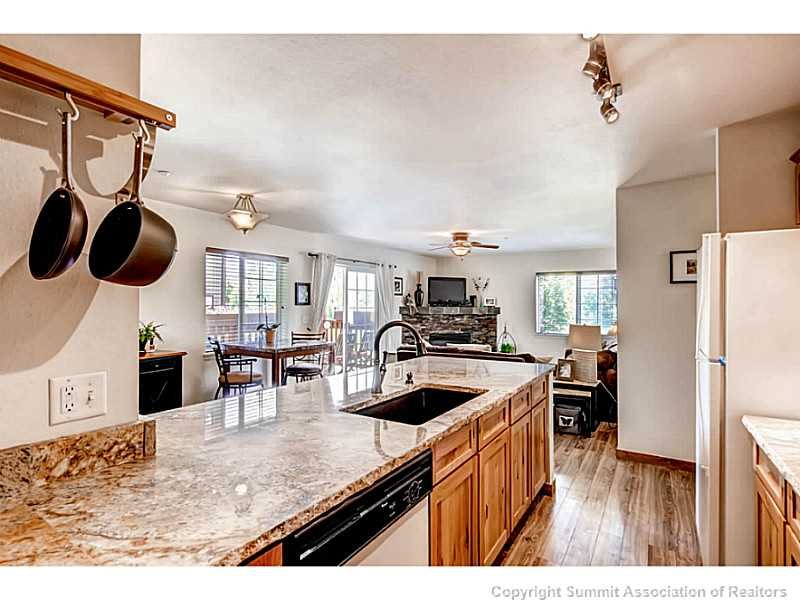 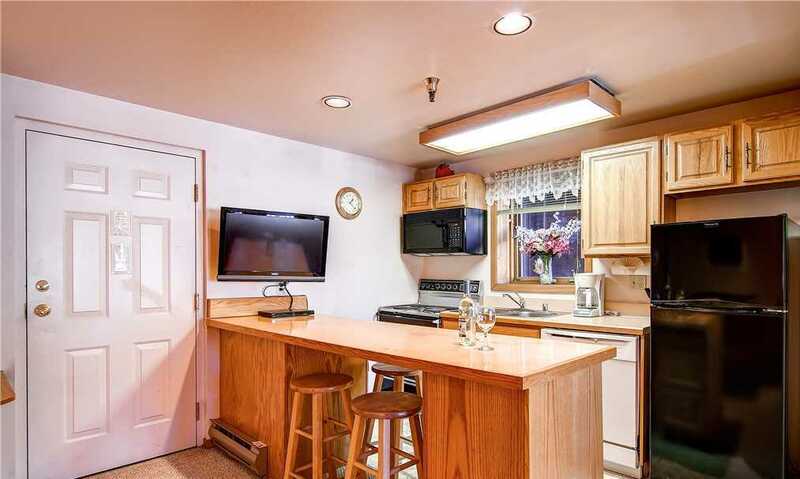 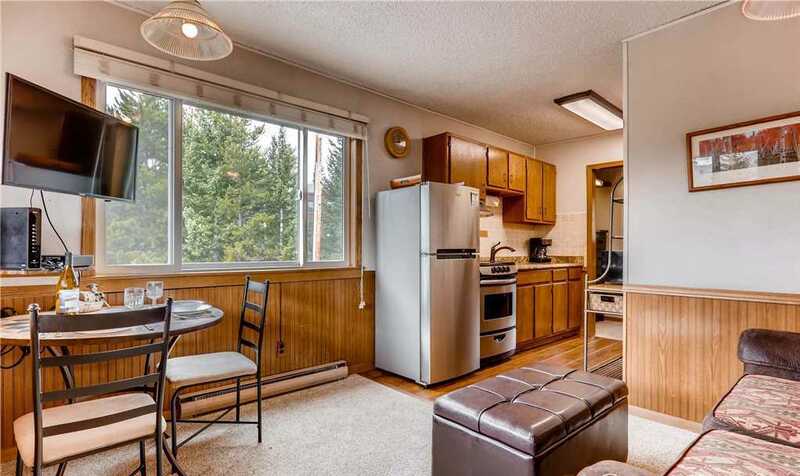 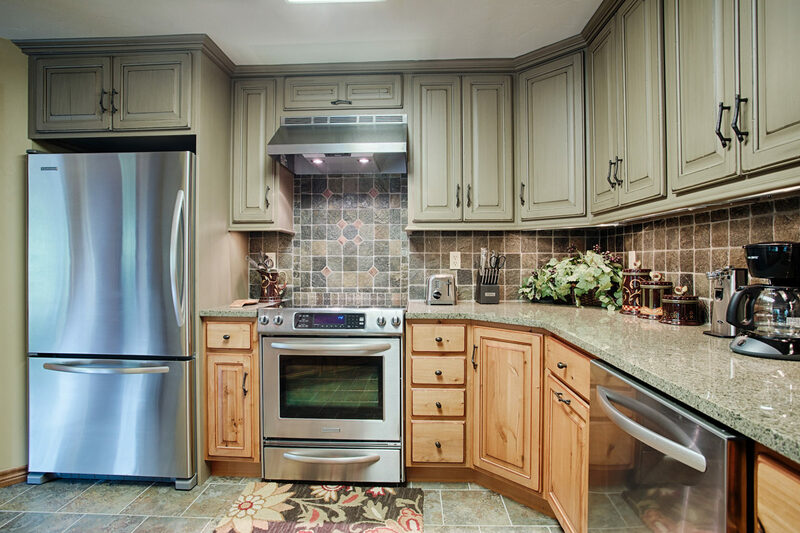 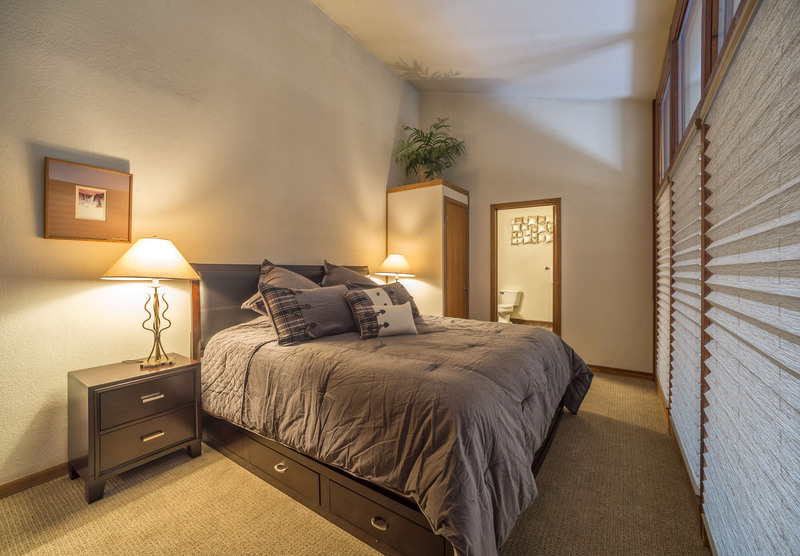 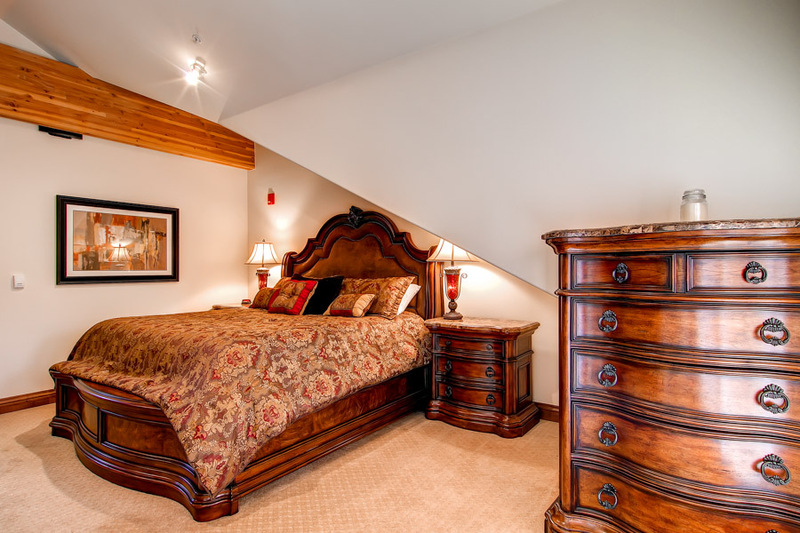 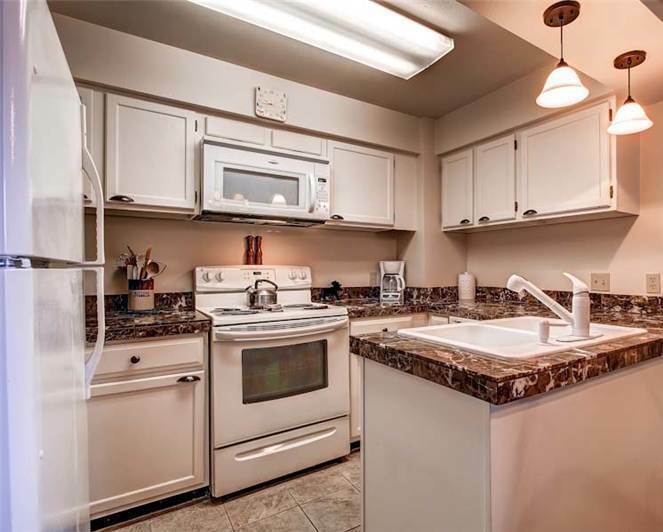 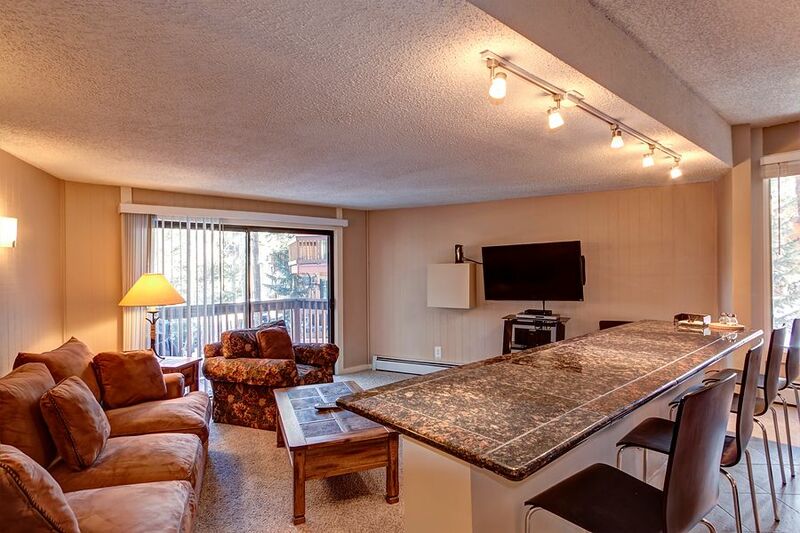 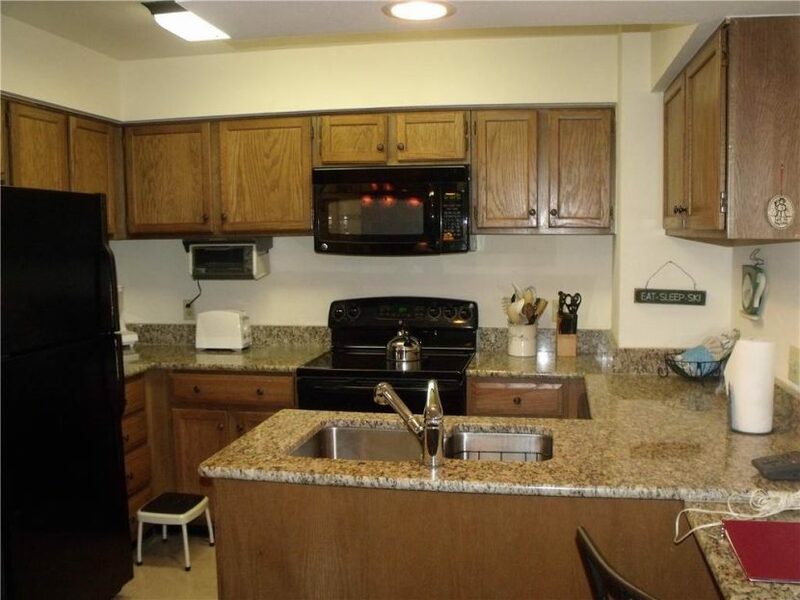 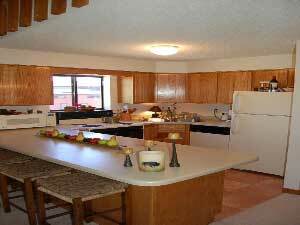 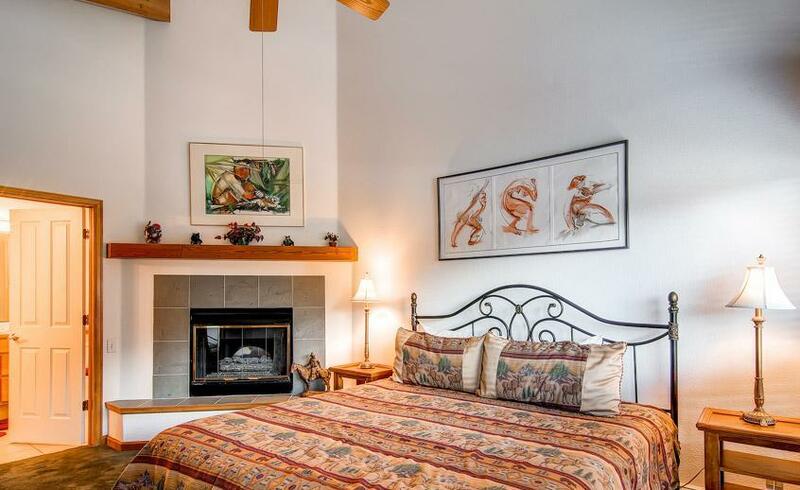 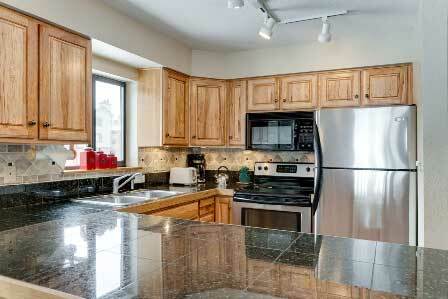 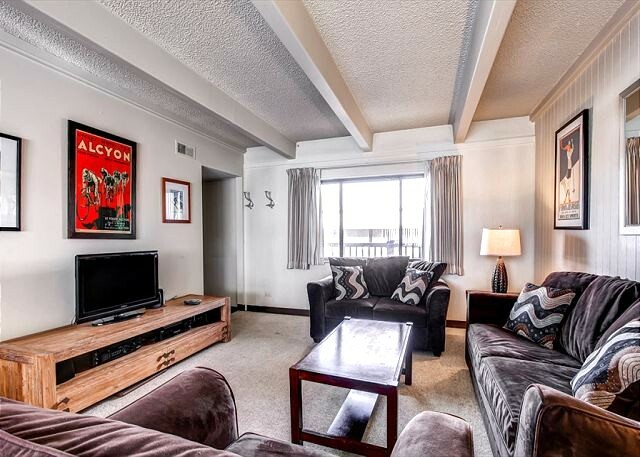 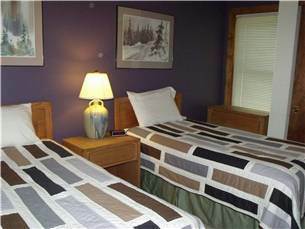 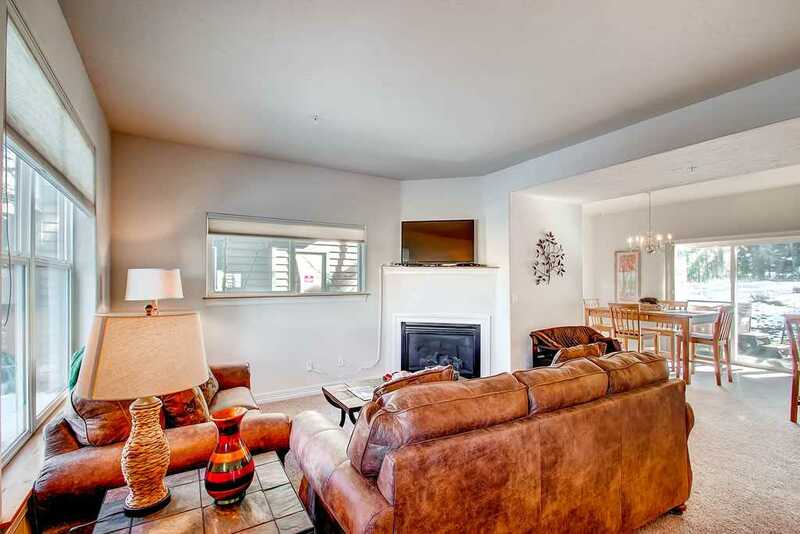 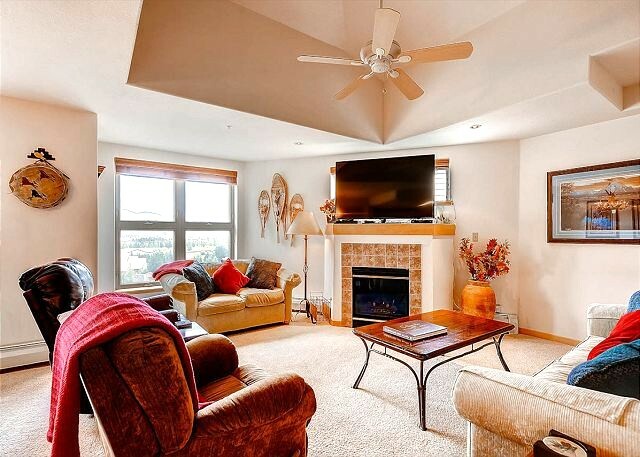 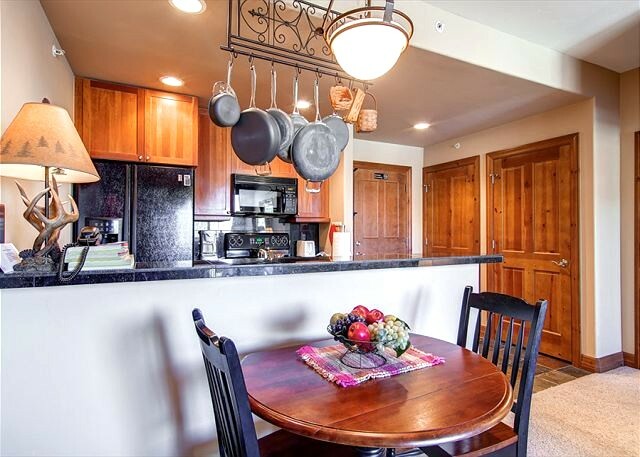 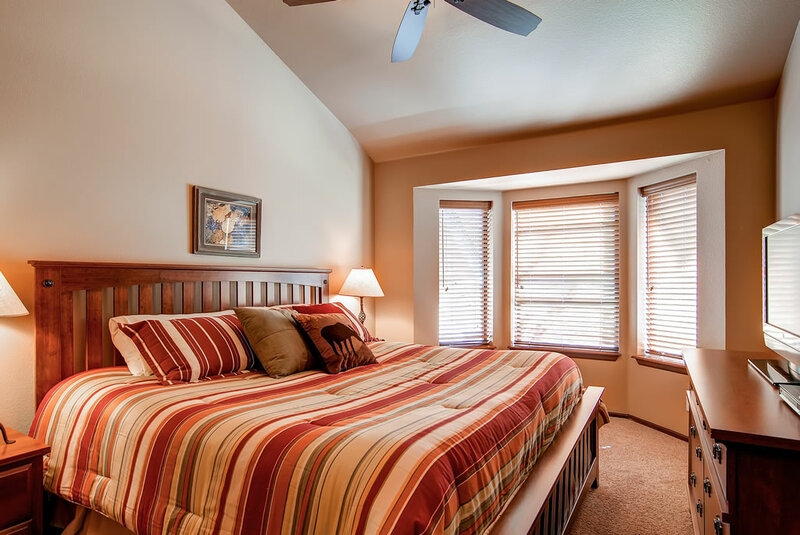 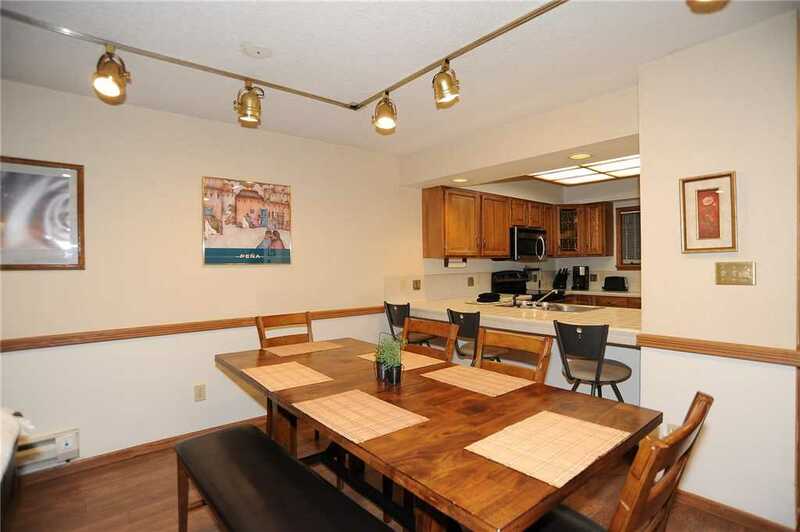 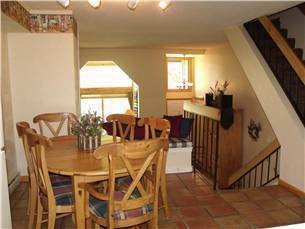 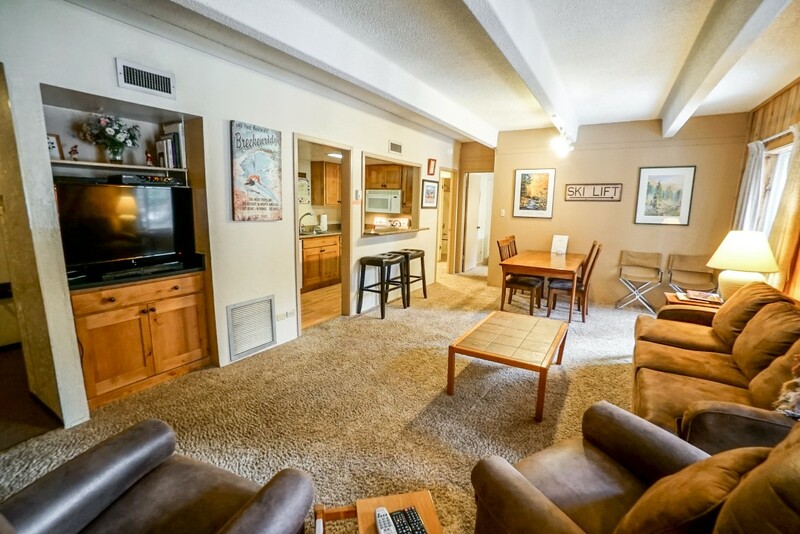 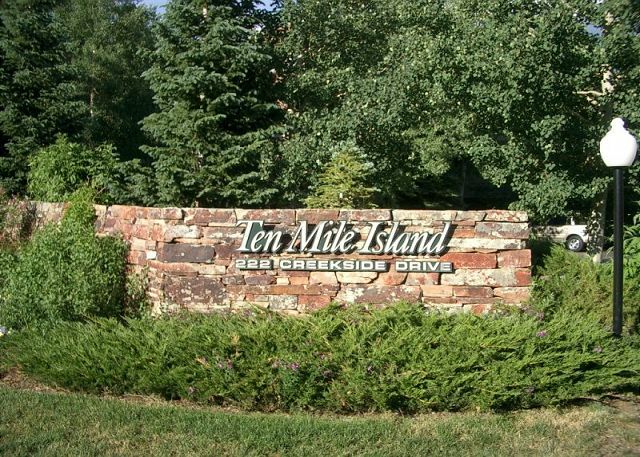 Other amenities include a 2-car garage with additional driveway parking, a washer/dryer and complimentary Wi-Fi.